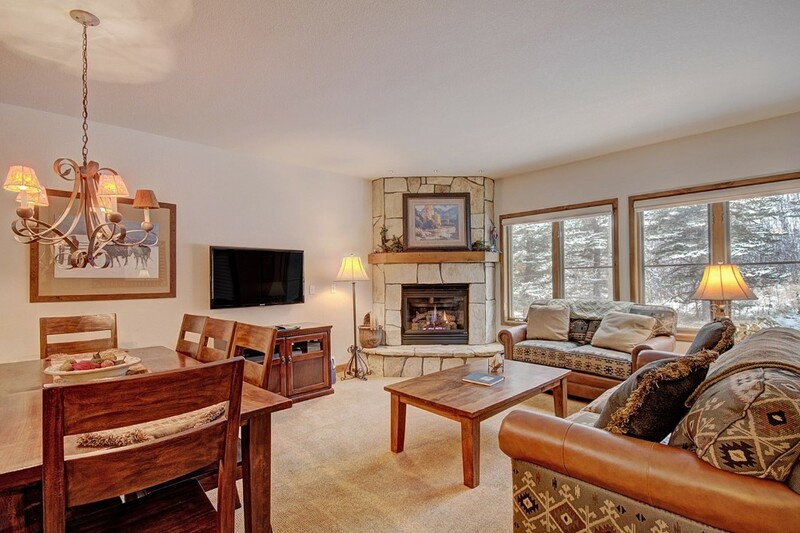 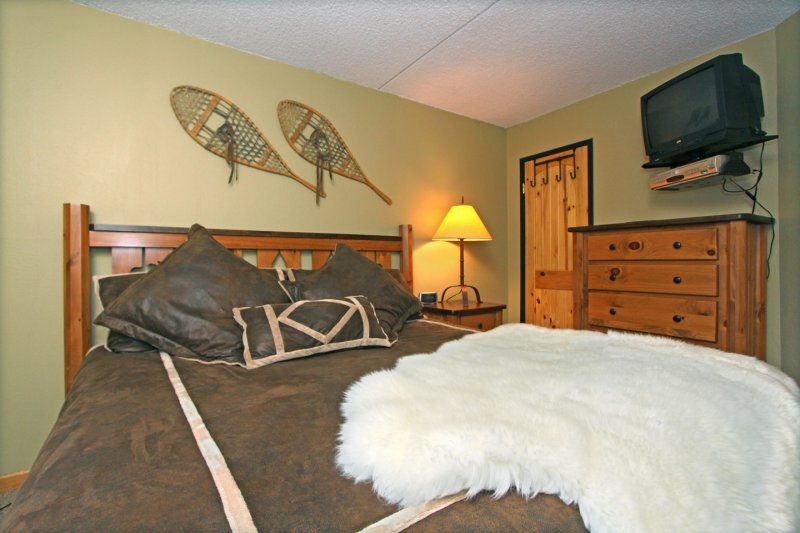 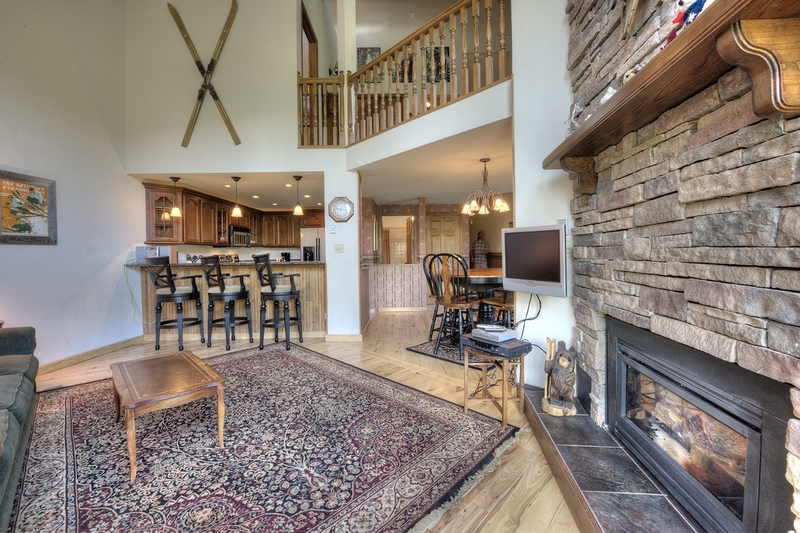 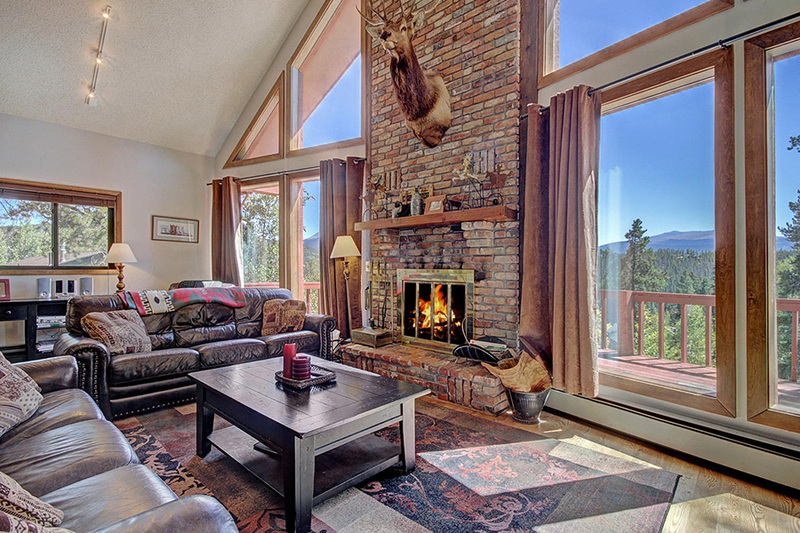 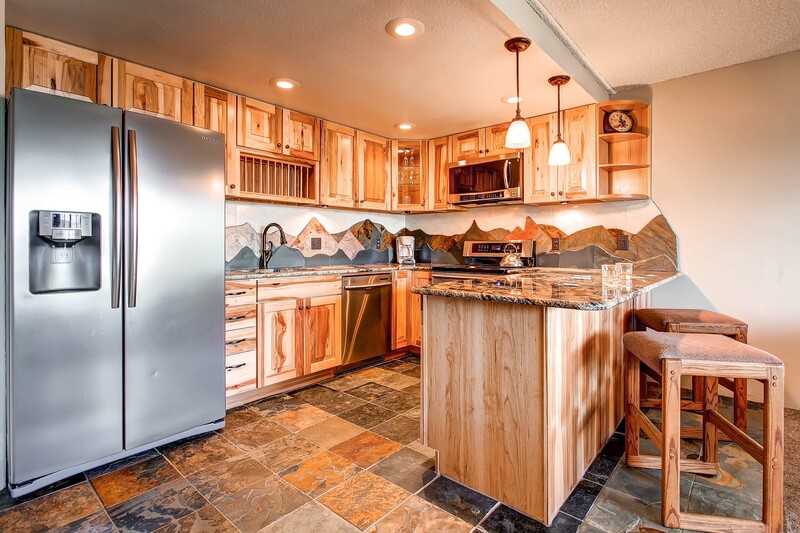 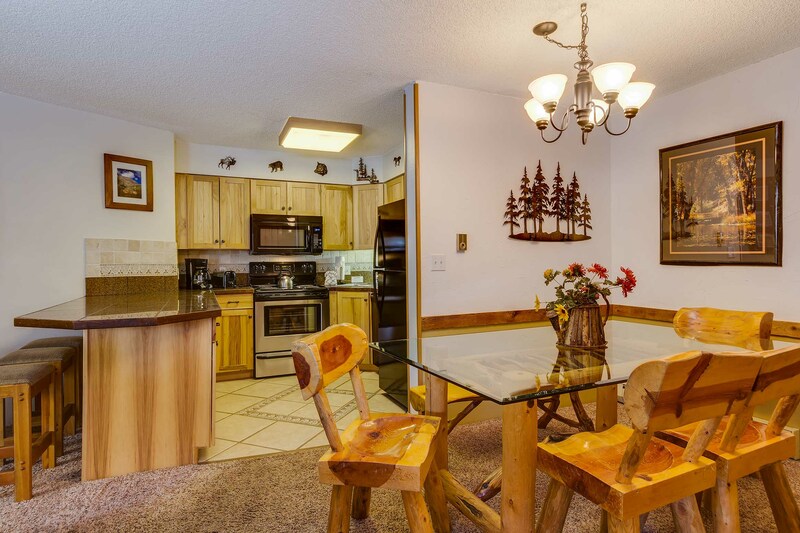 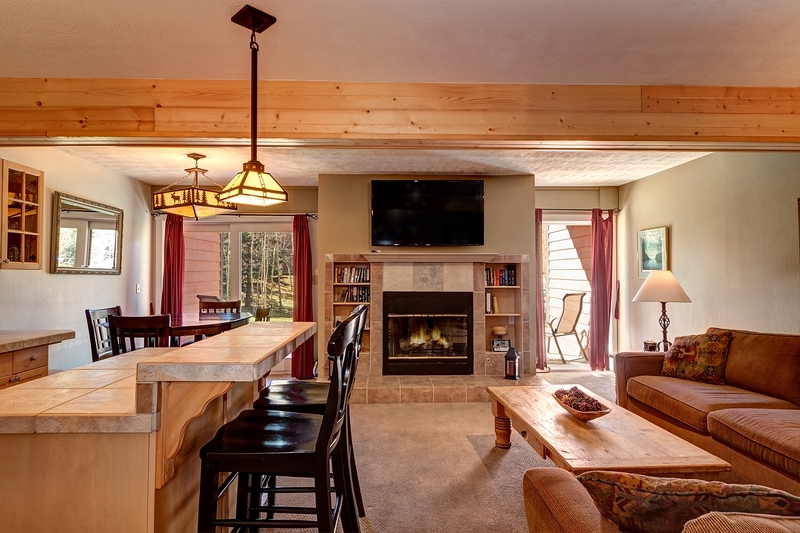 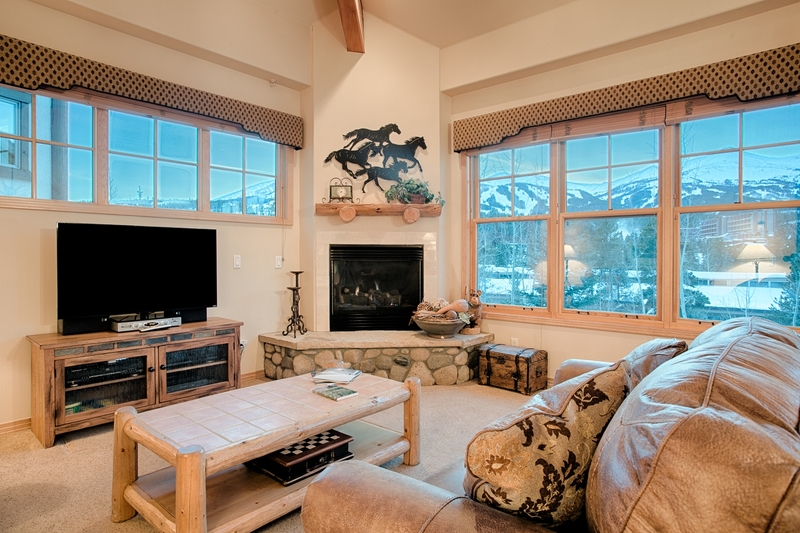 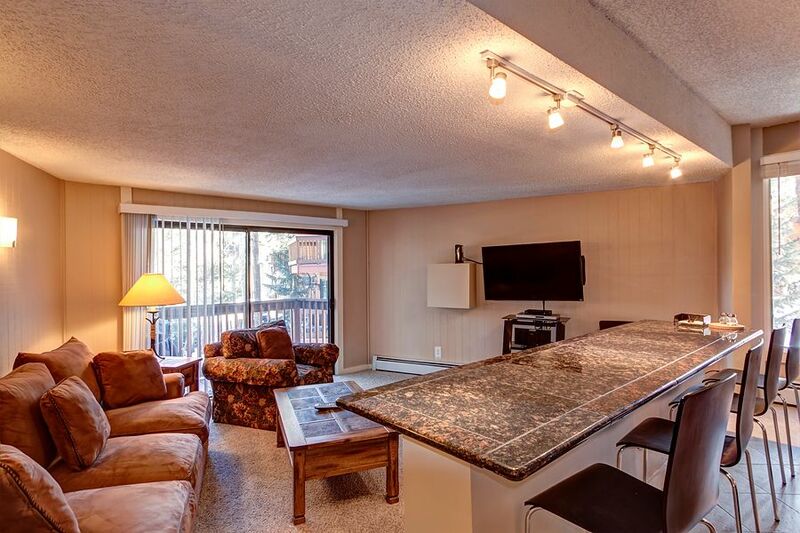 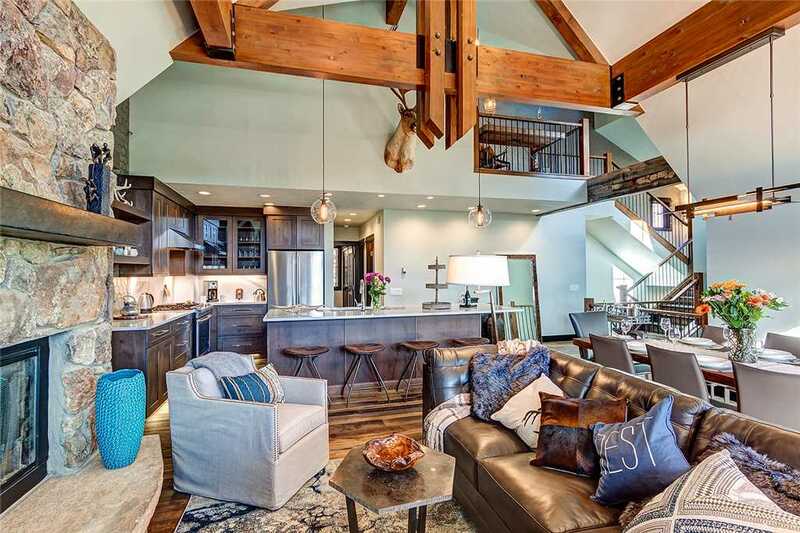 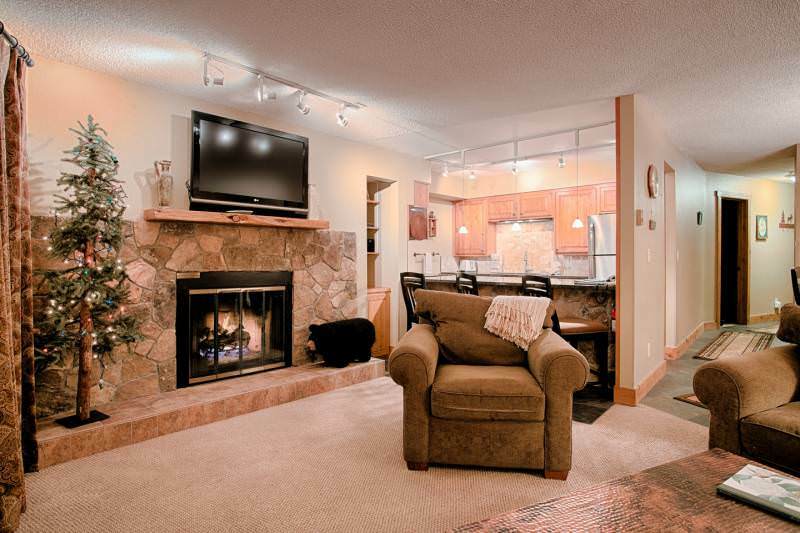 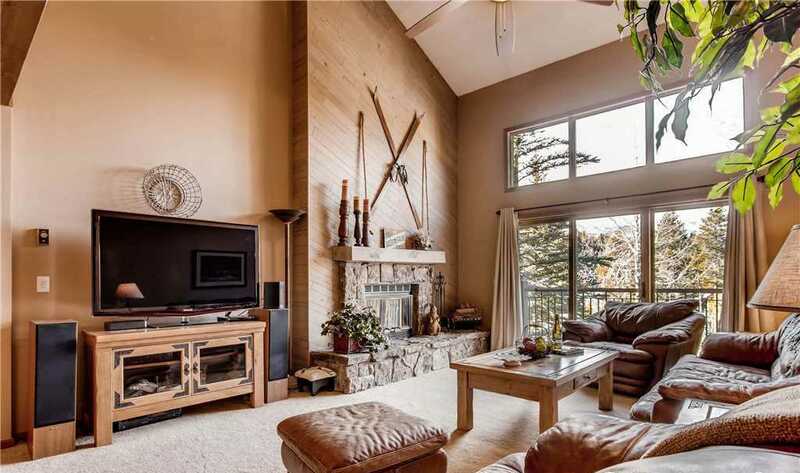 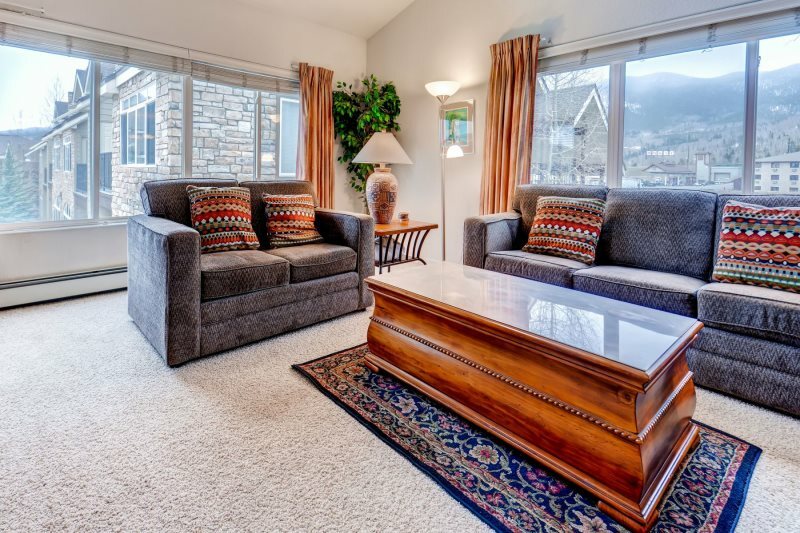 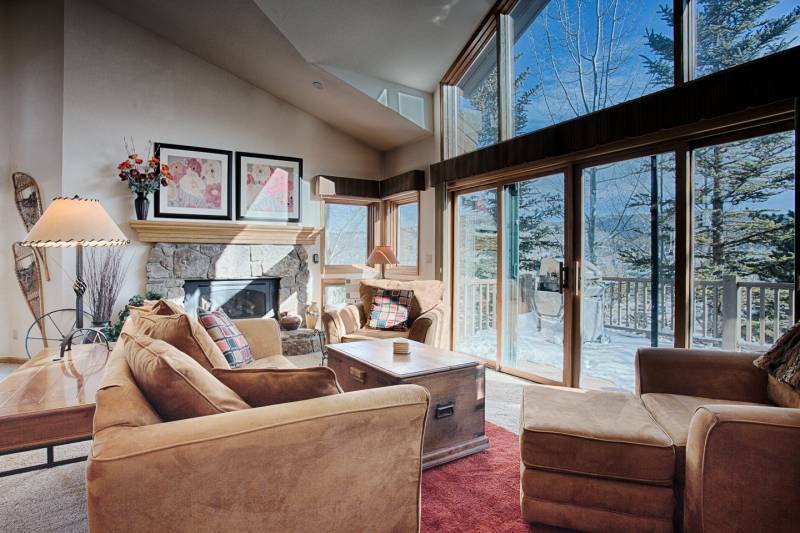 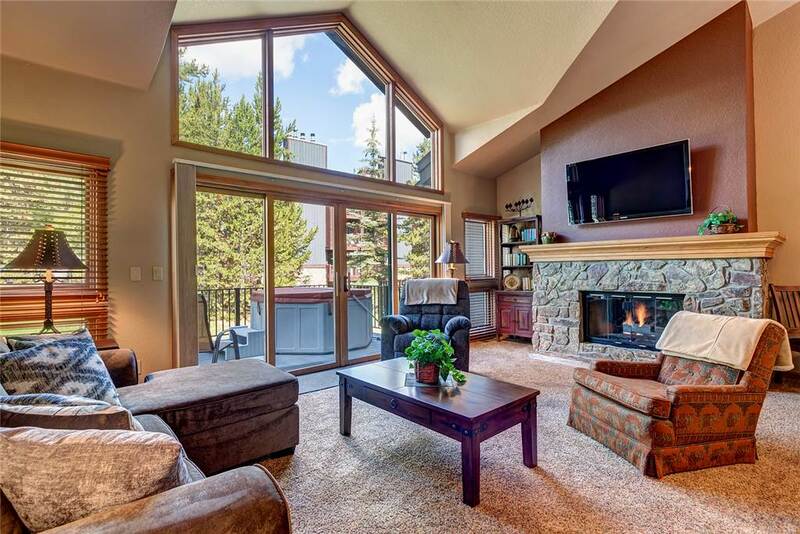 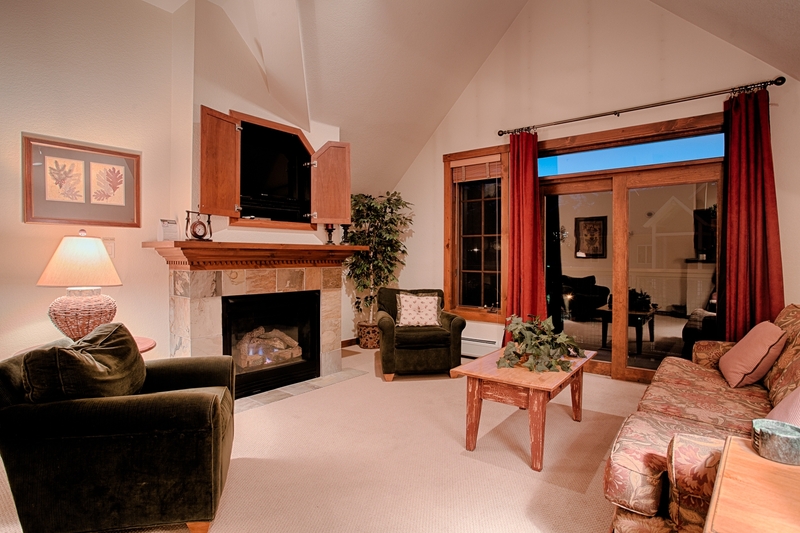 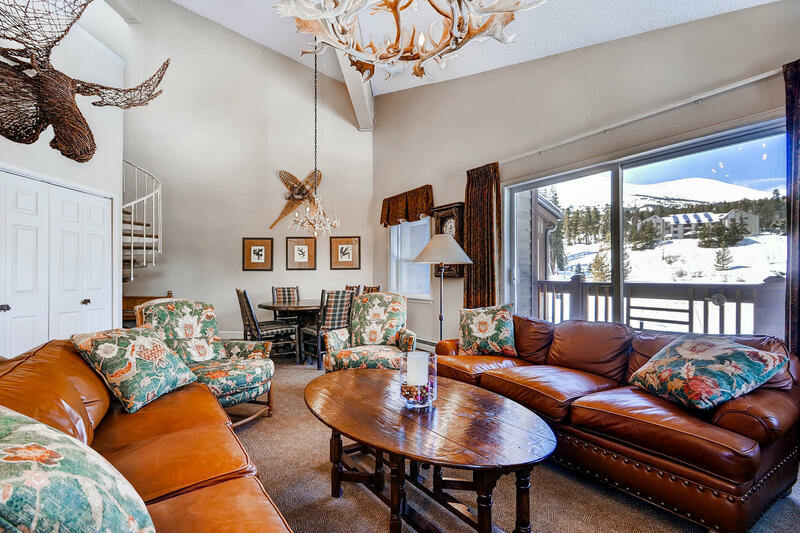 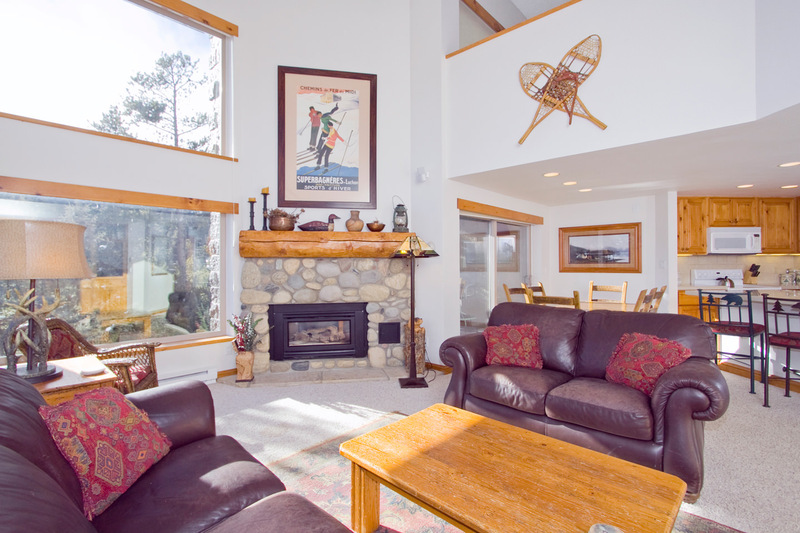 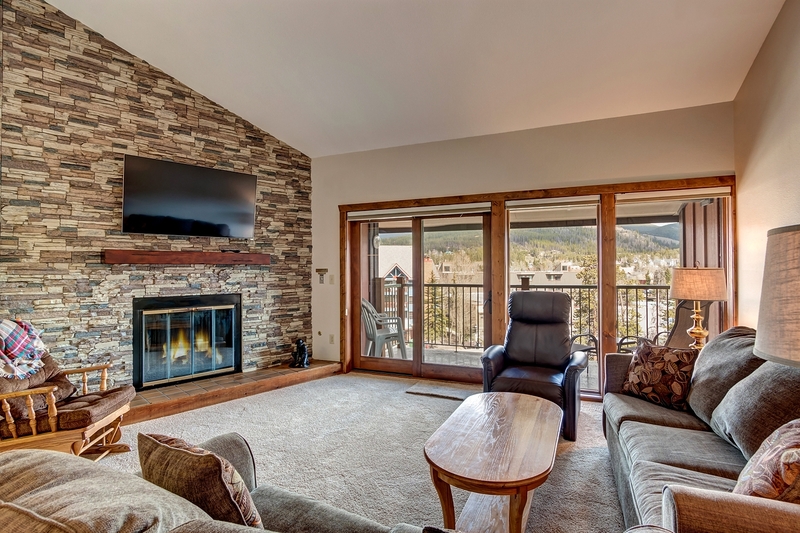 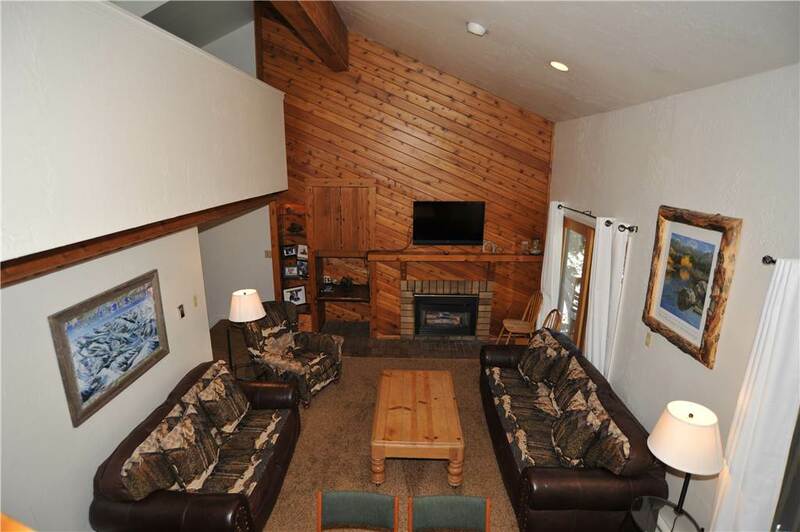 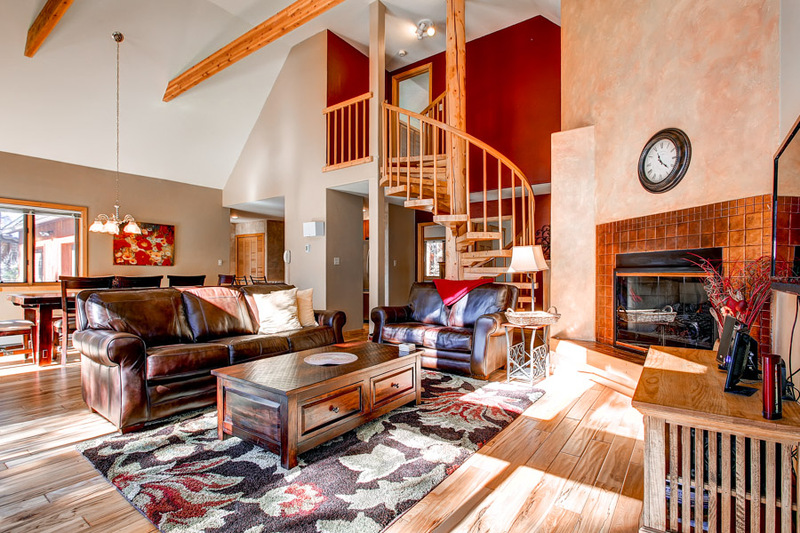 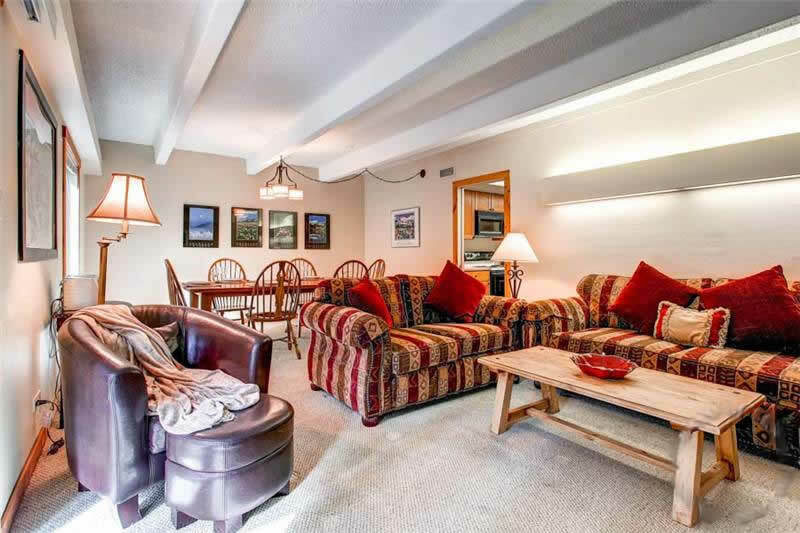 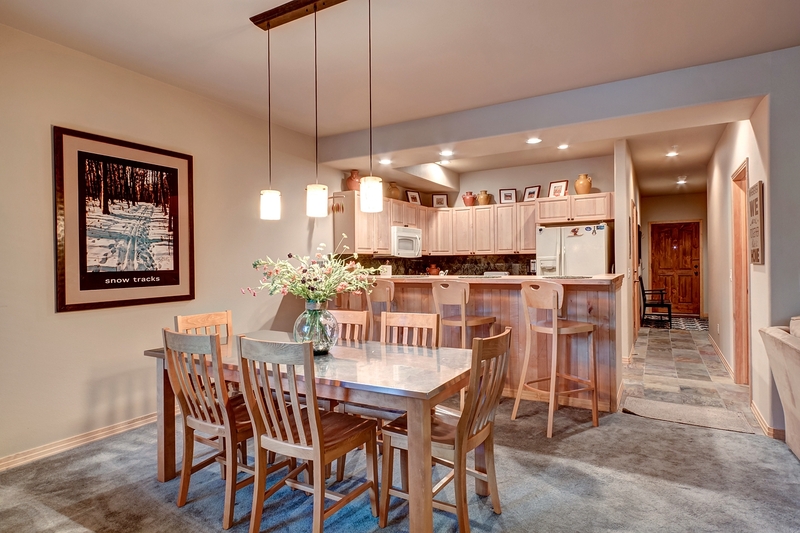 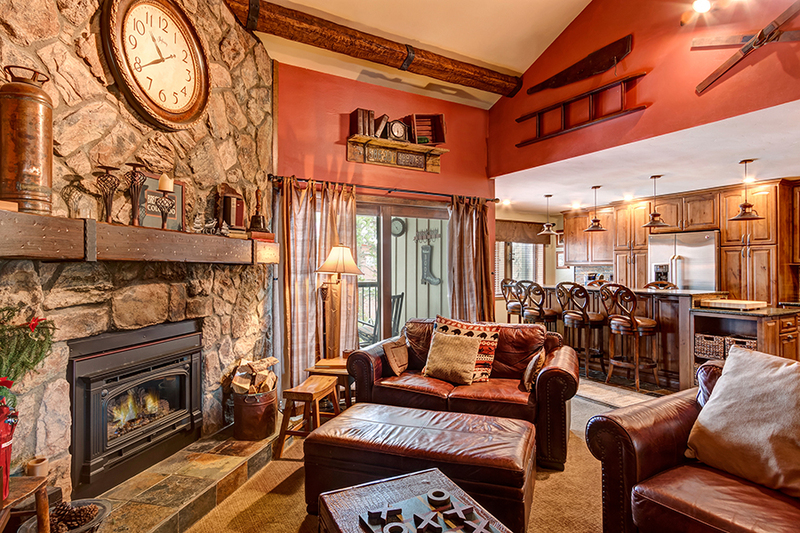 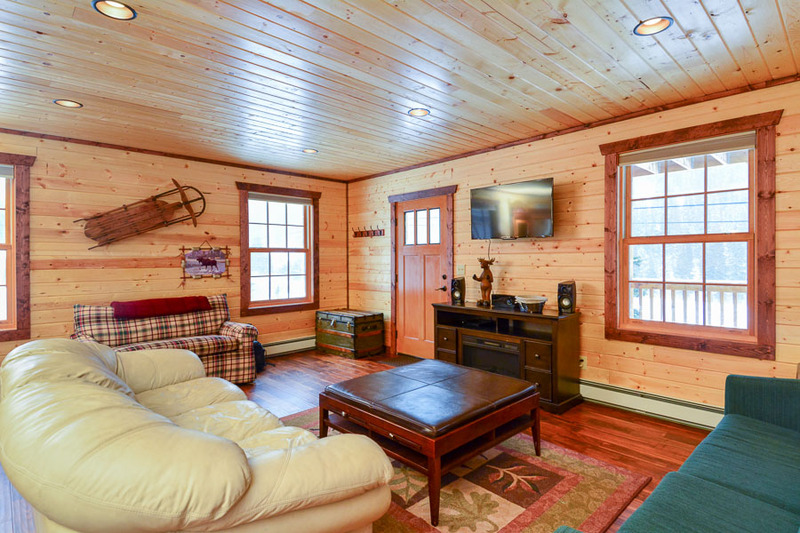 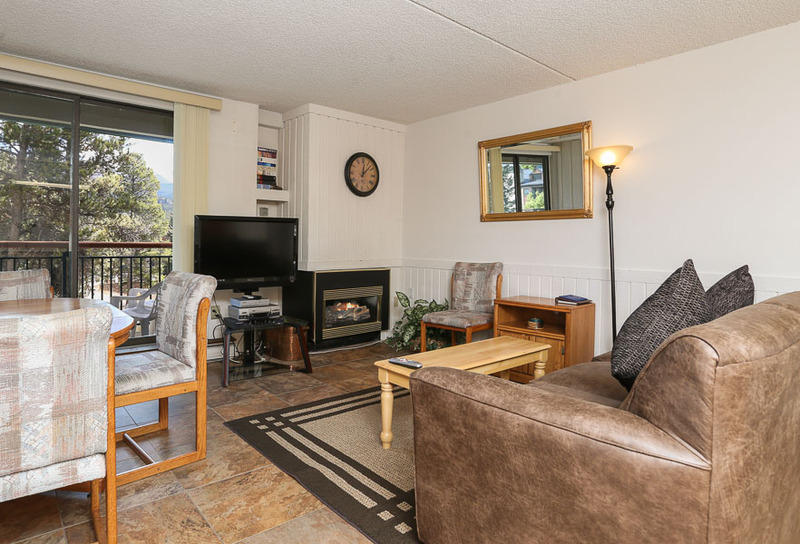 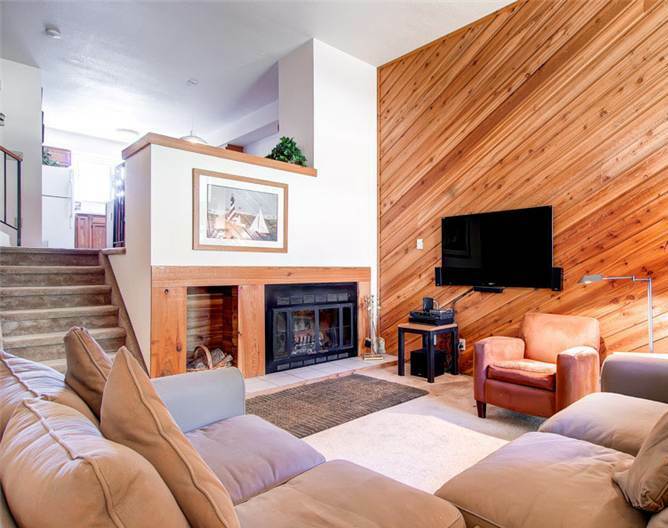 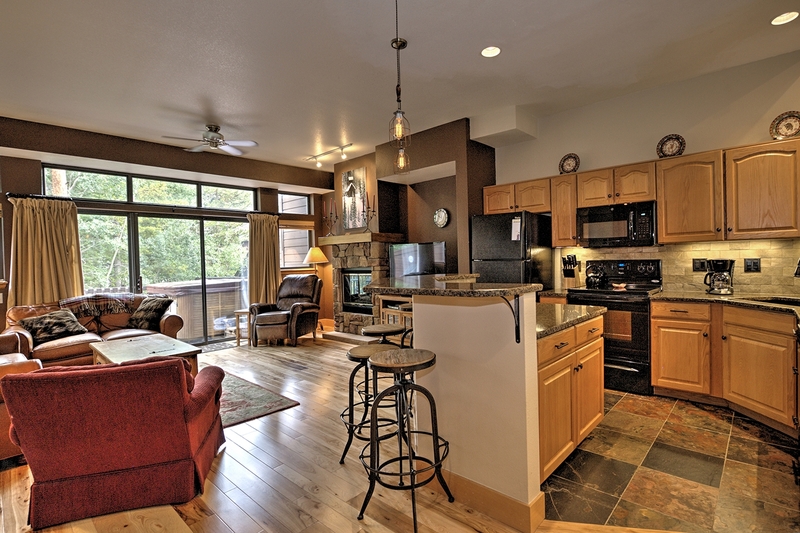 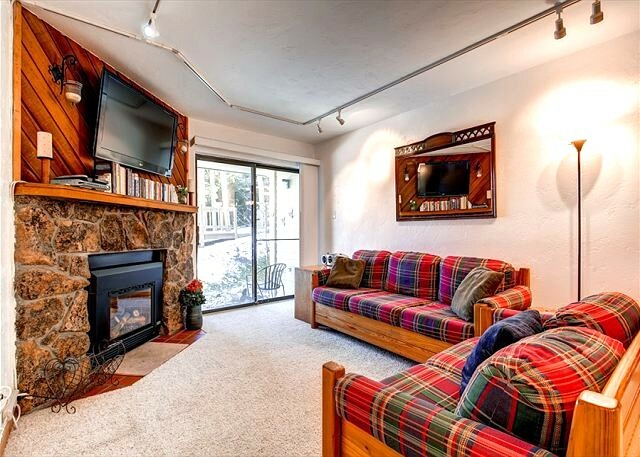 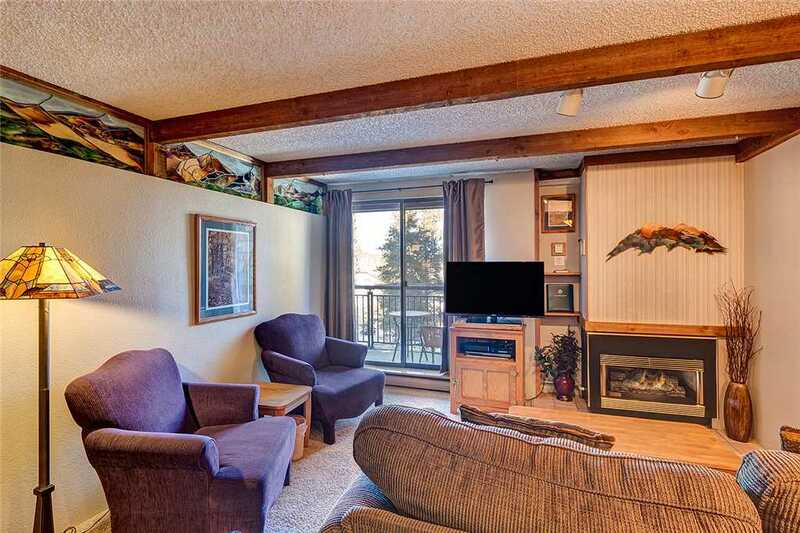 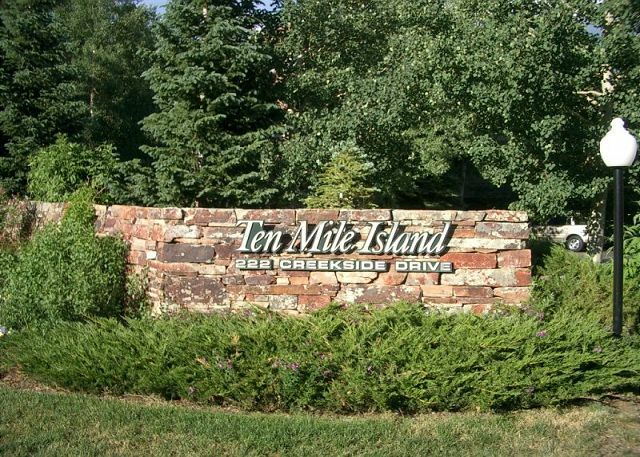 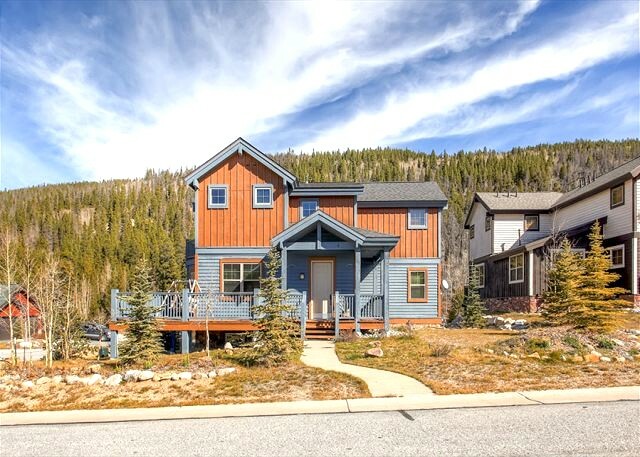 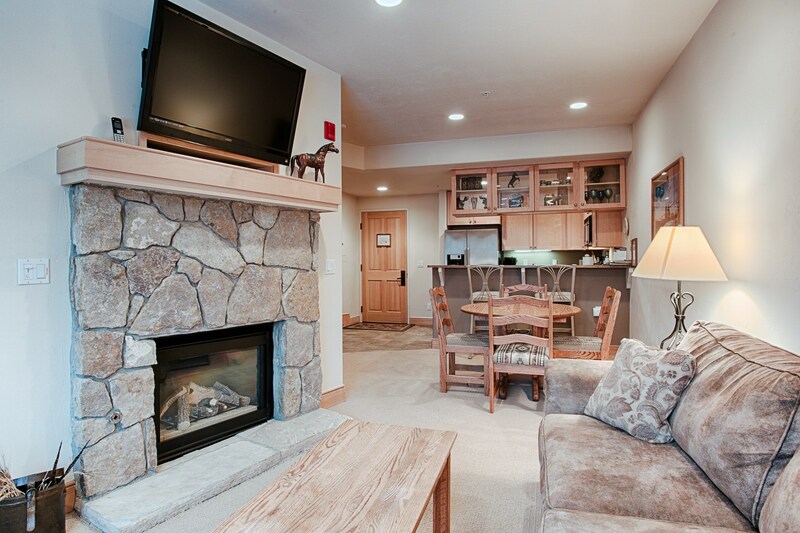 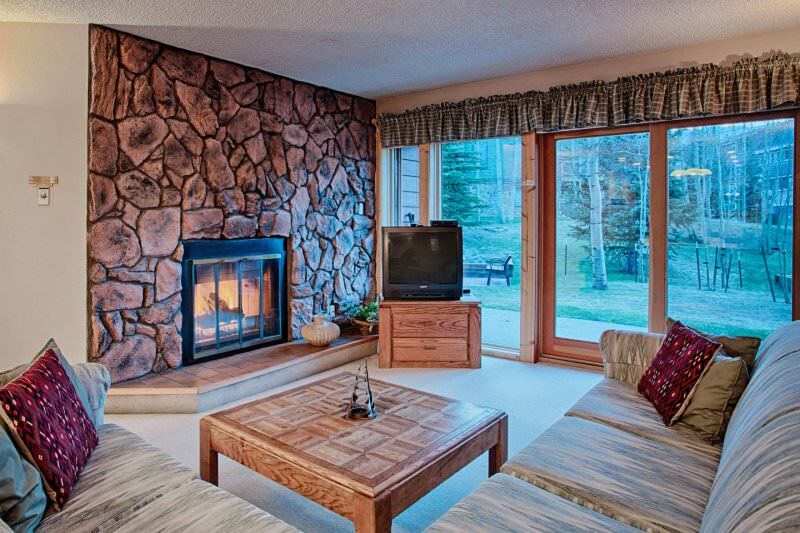 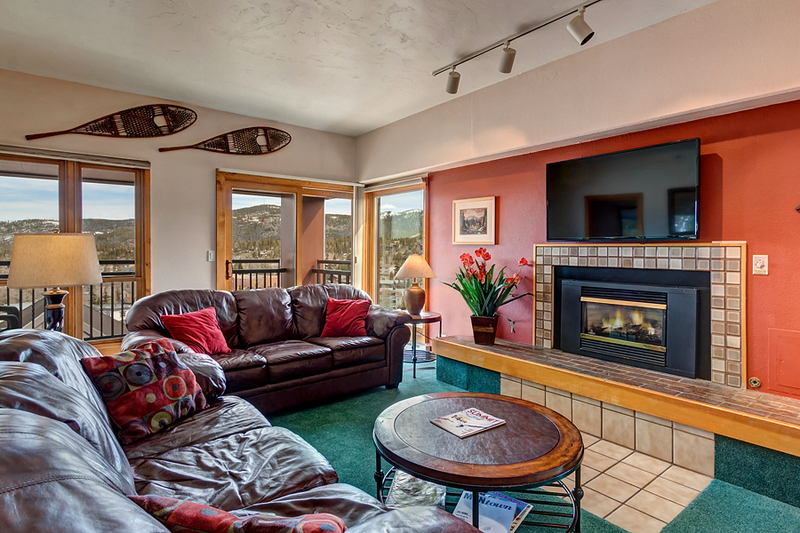 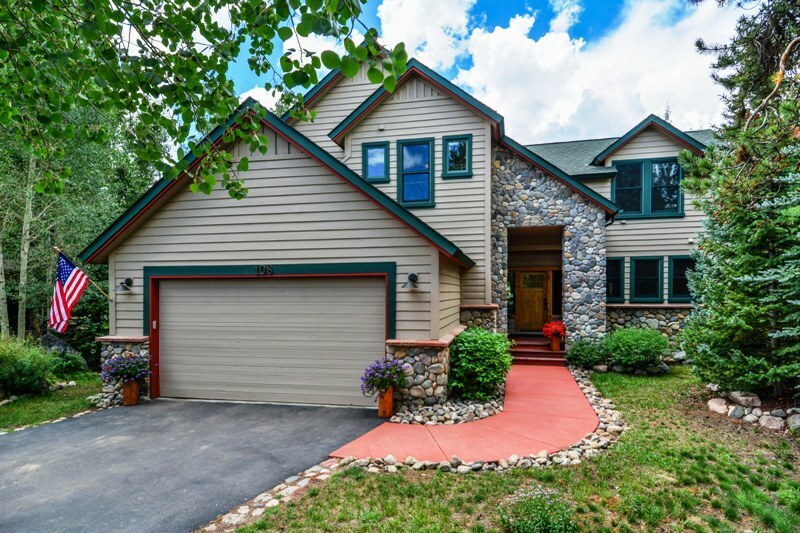 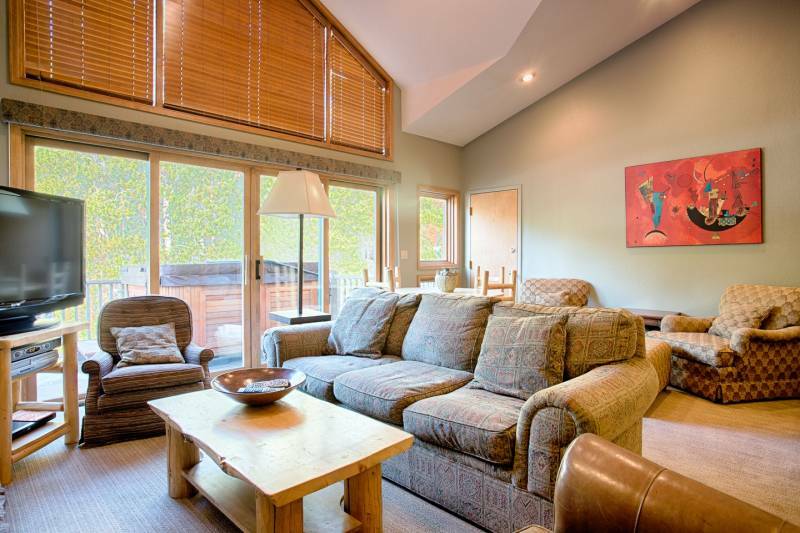 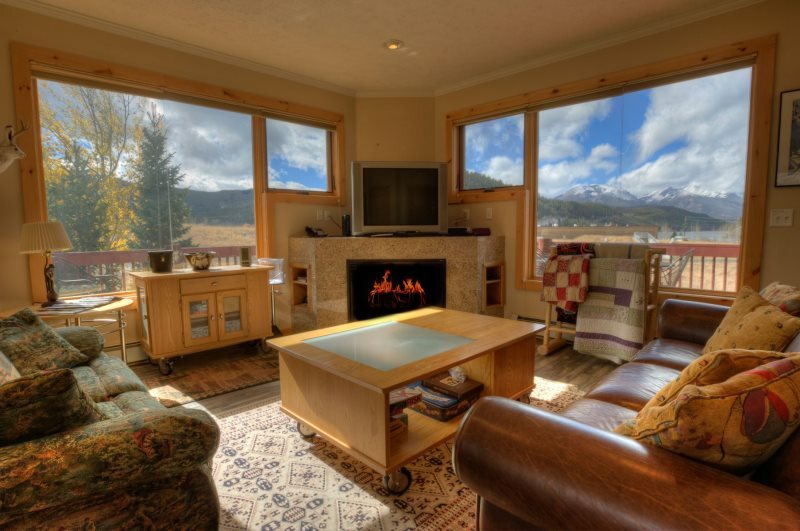 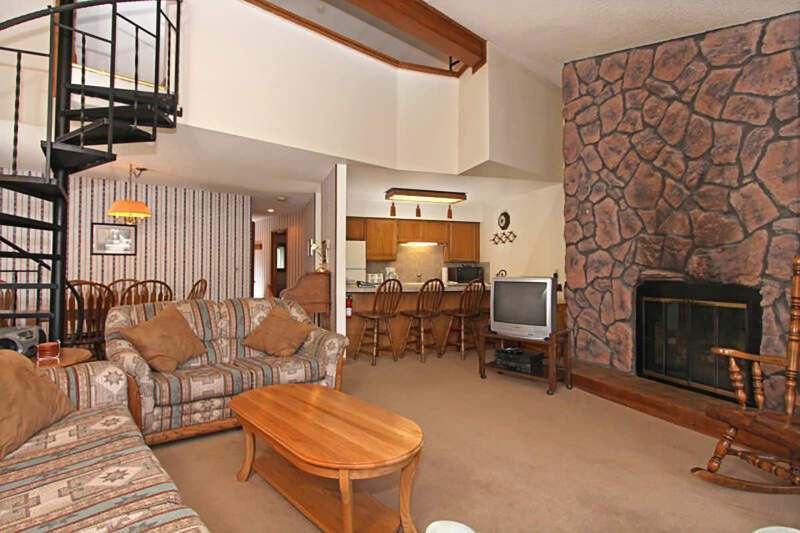 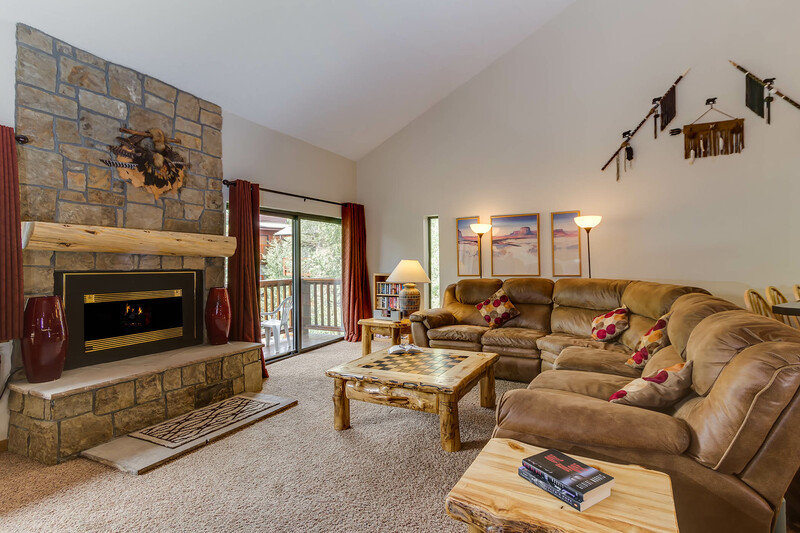 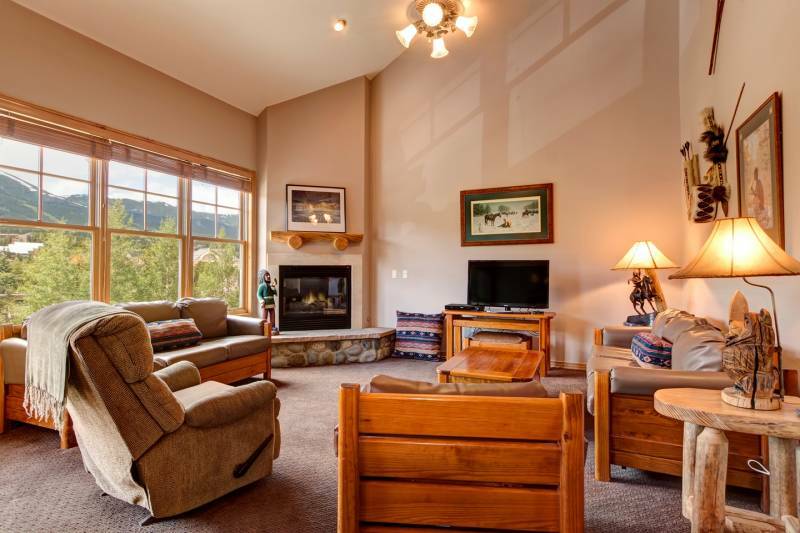 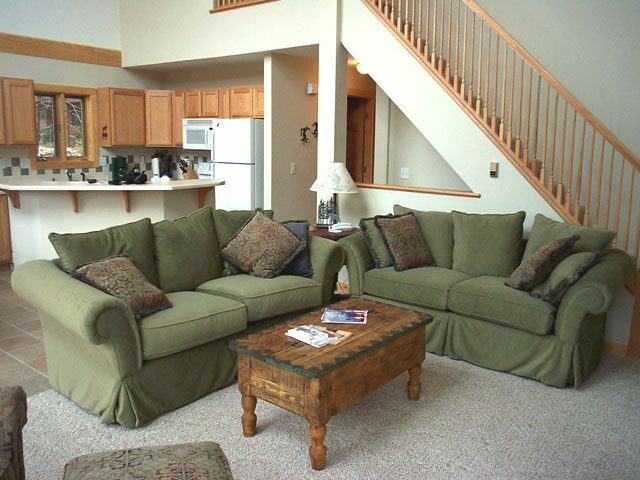 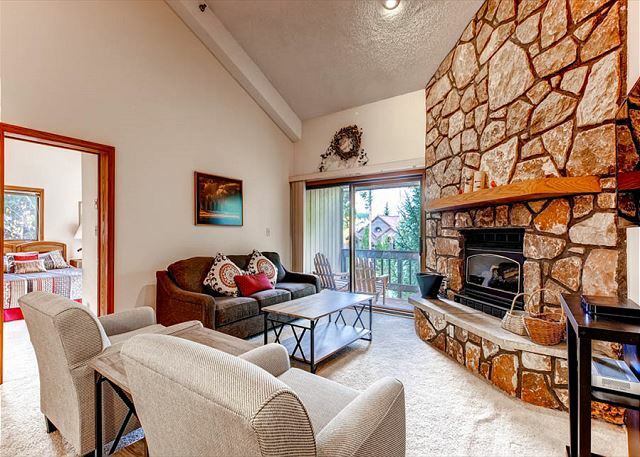 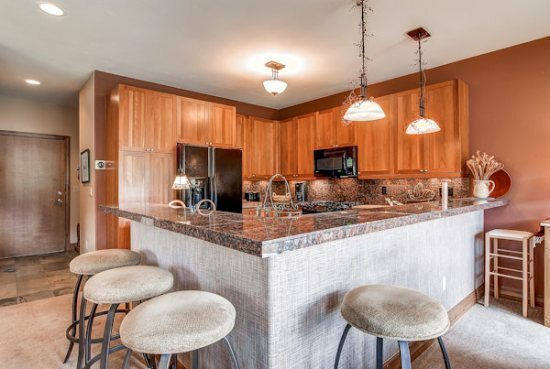 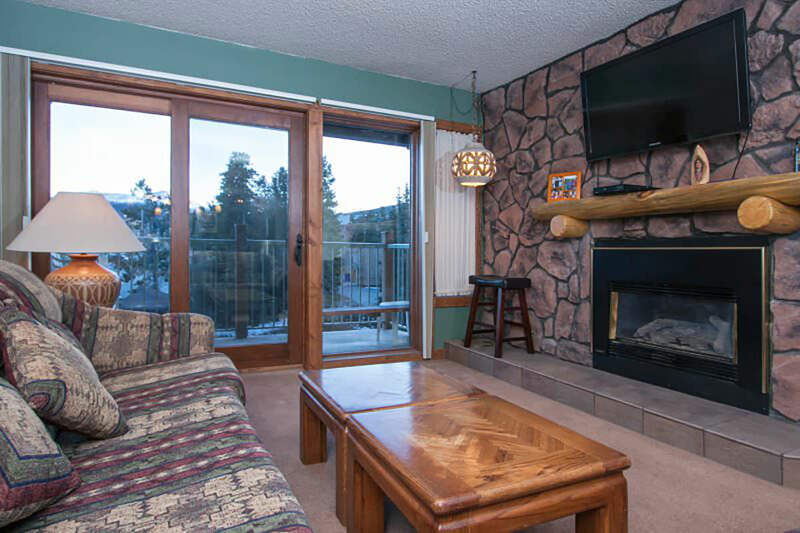 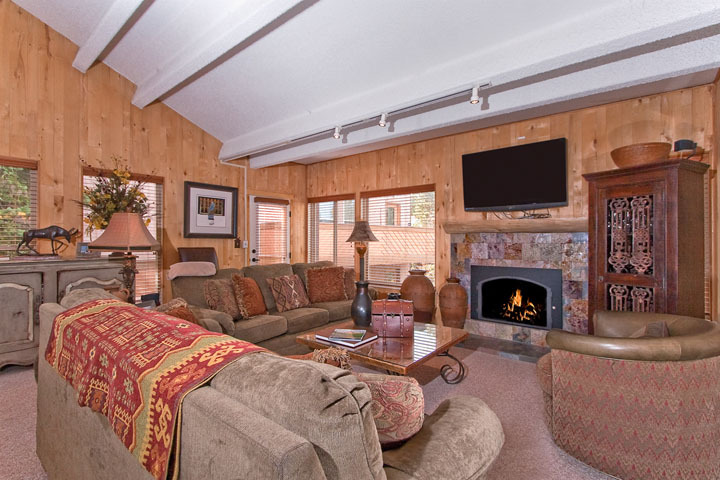 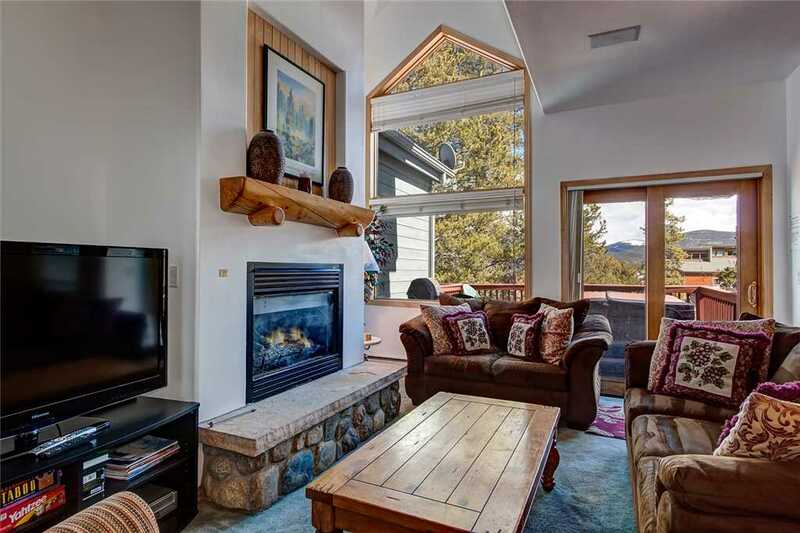 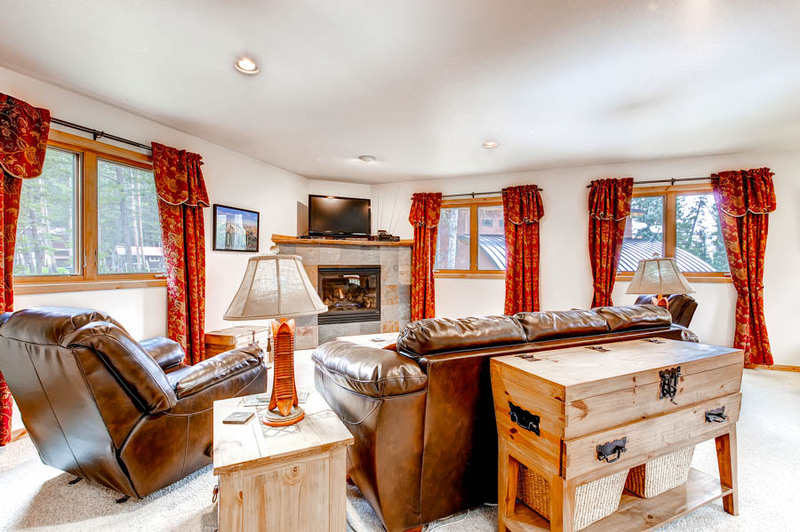 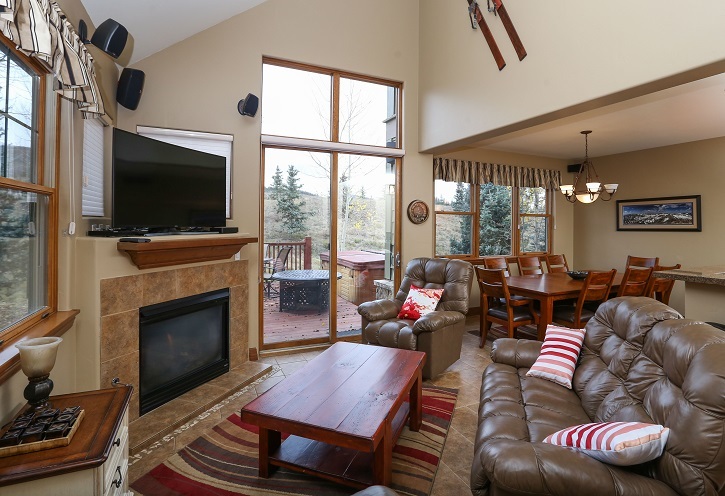 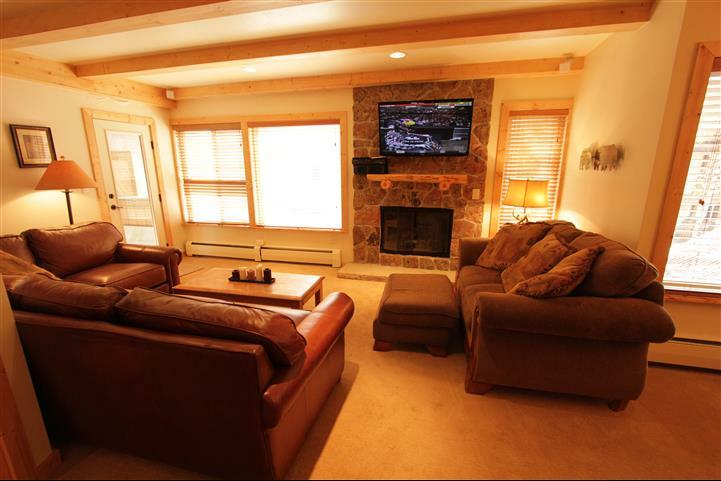 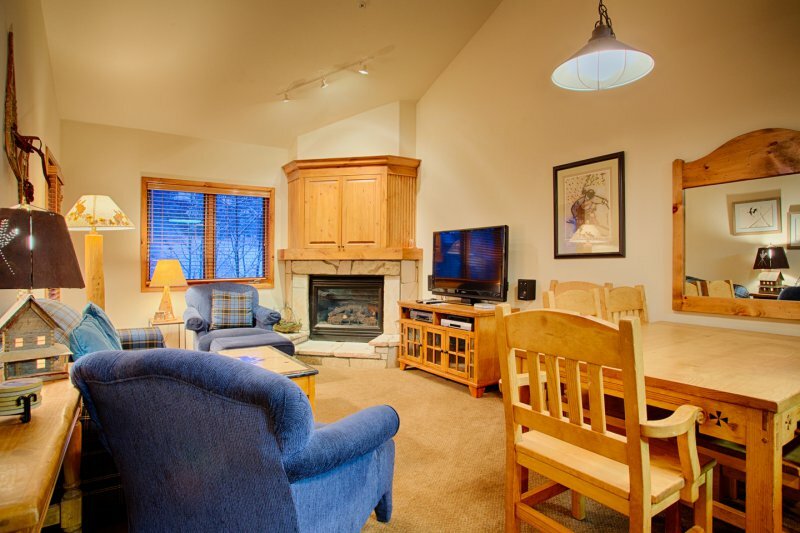 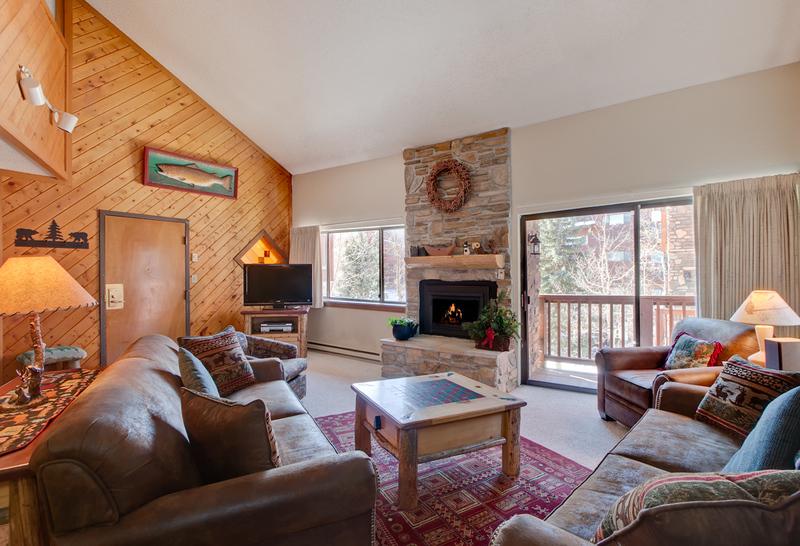 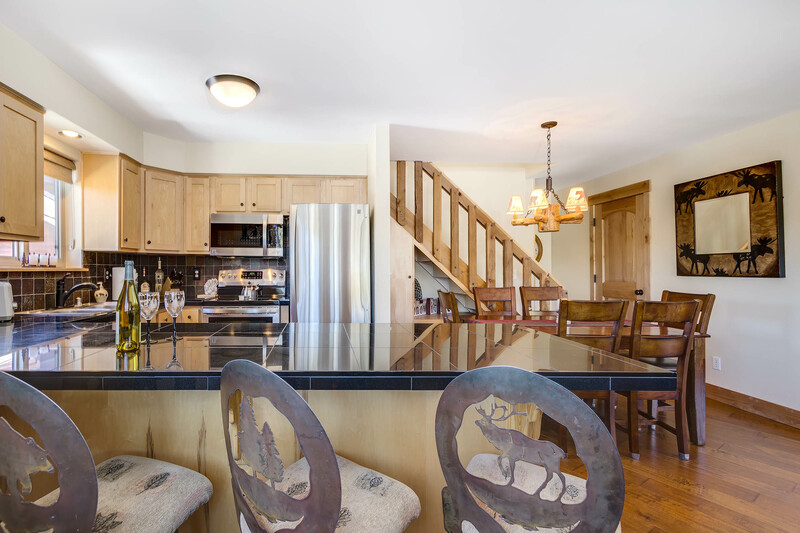 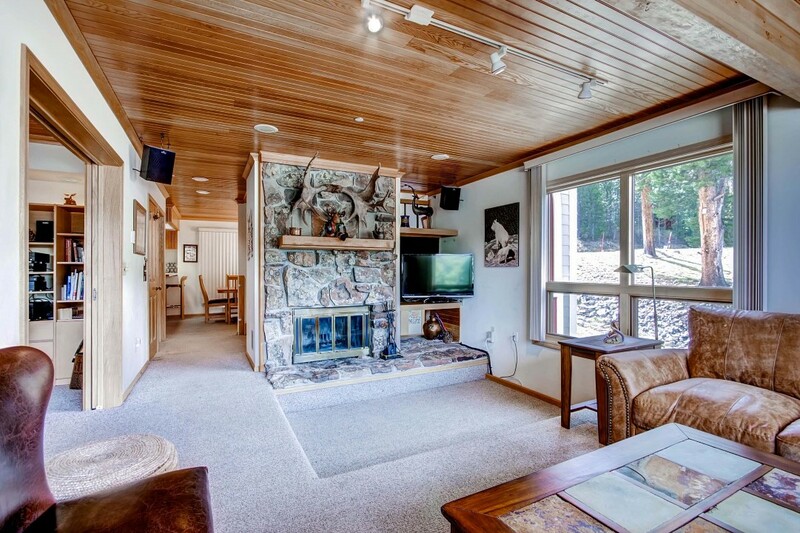 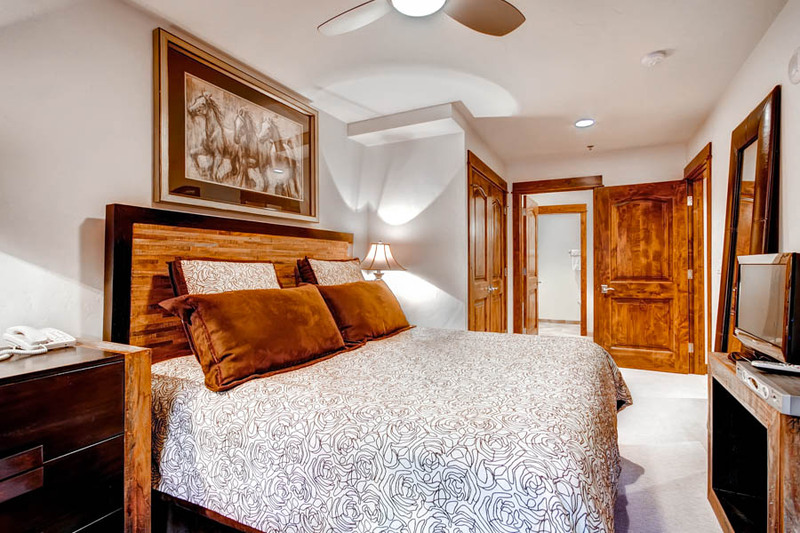 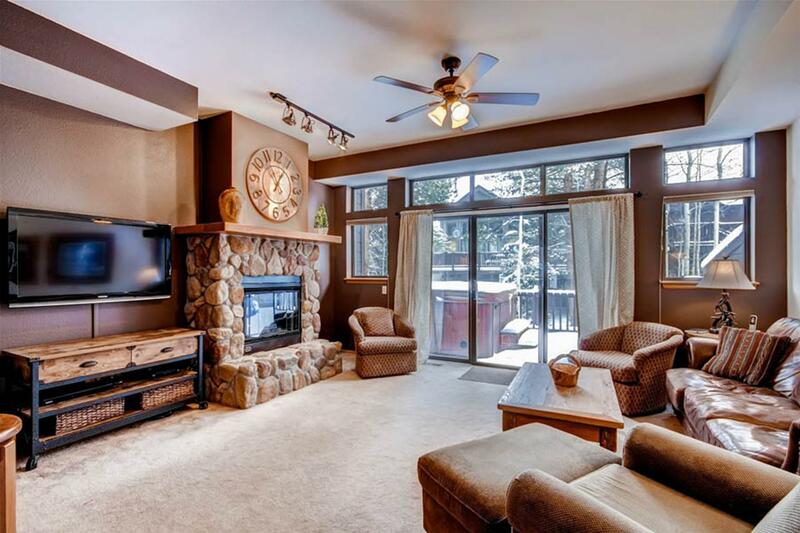 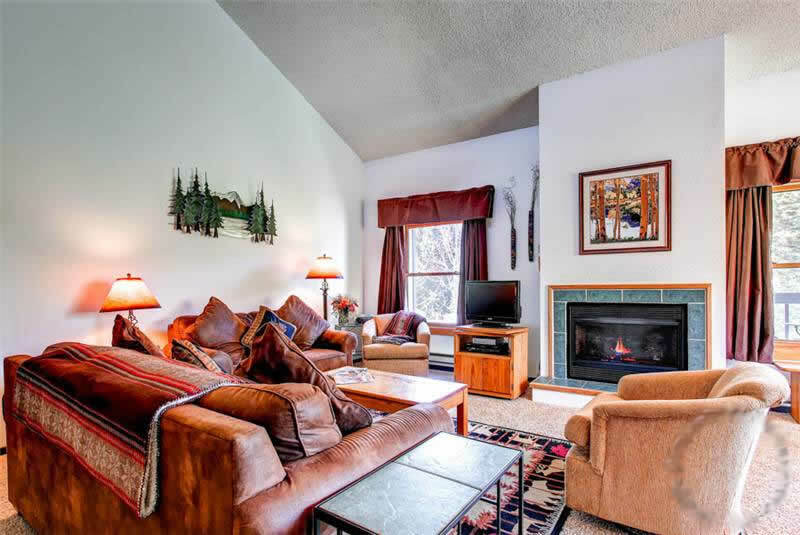 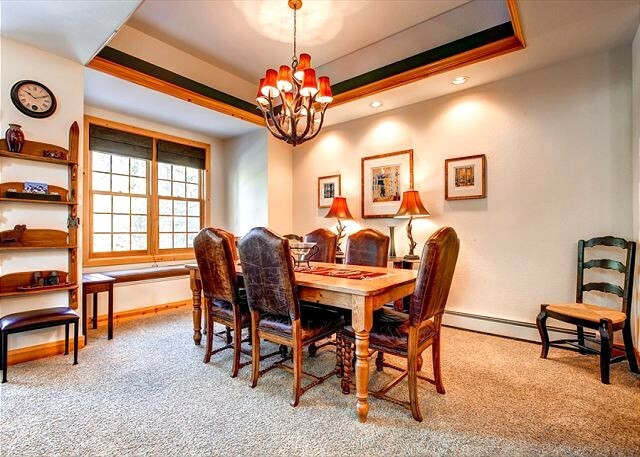 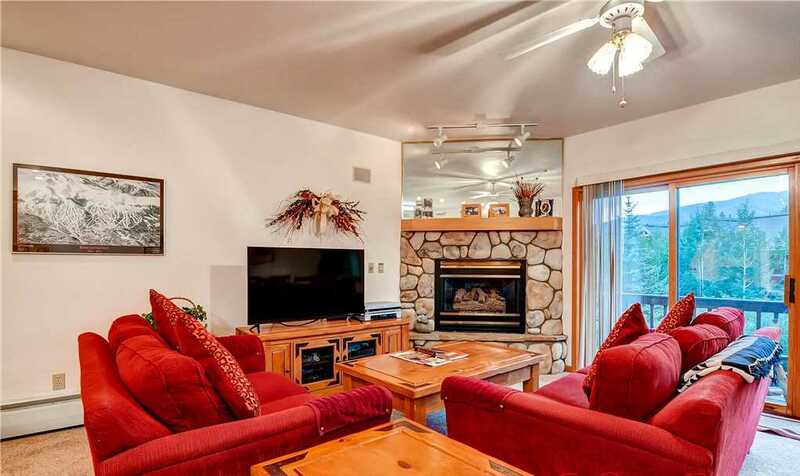 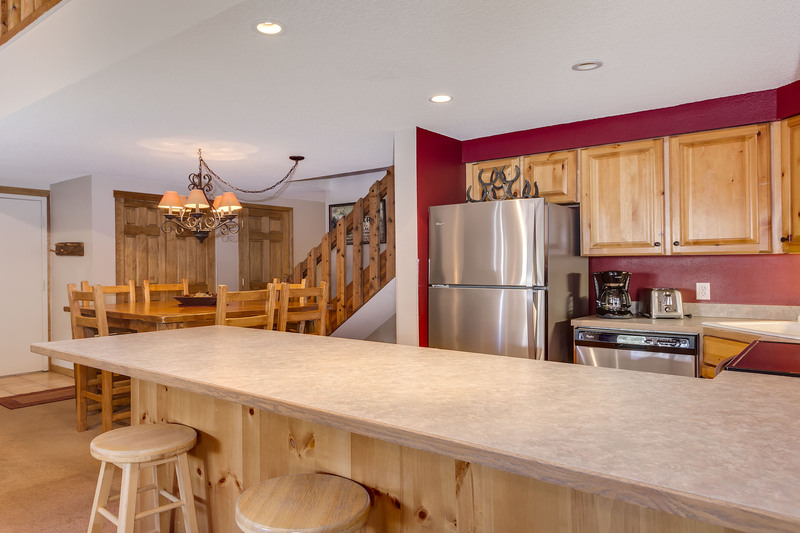 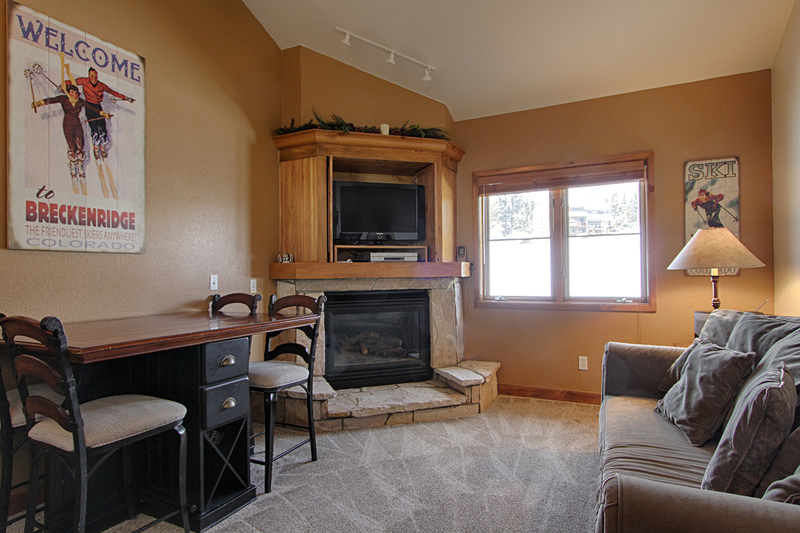 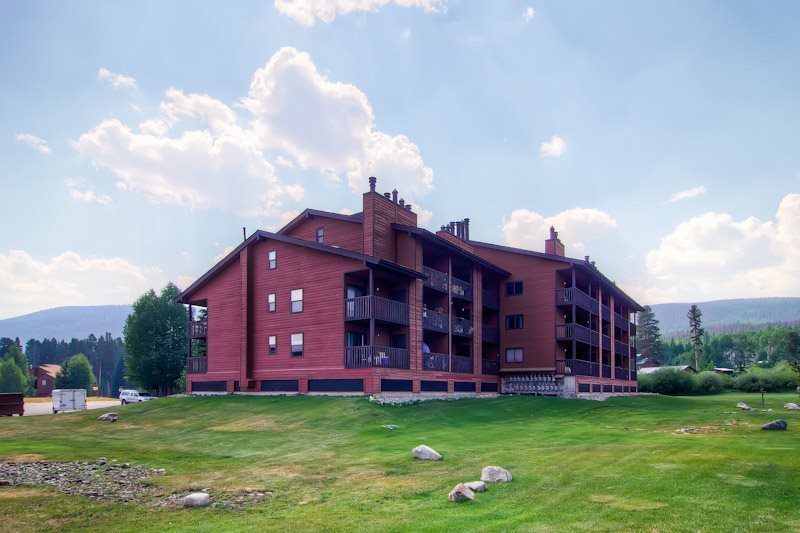 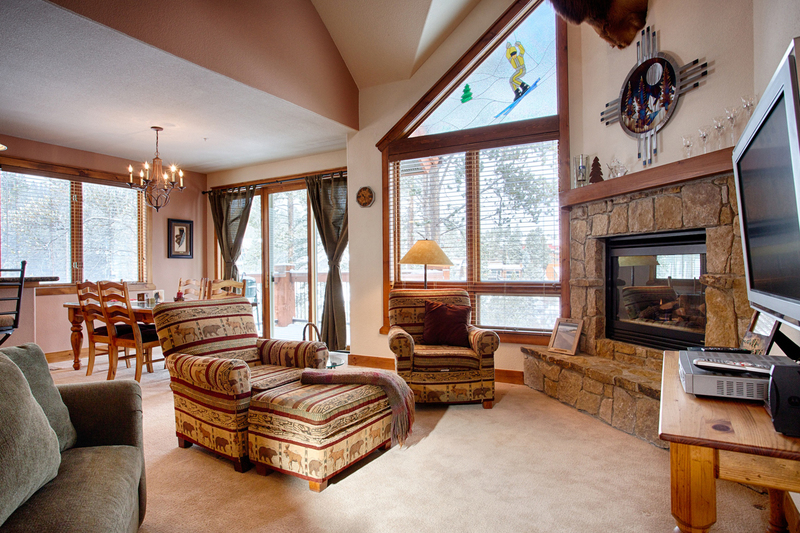 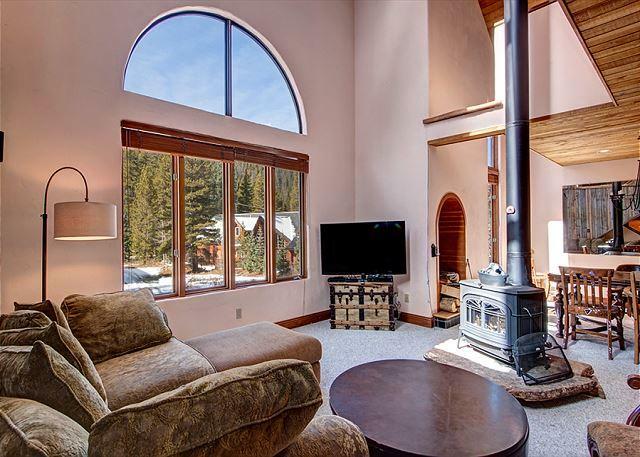 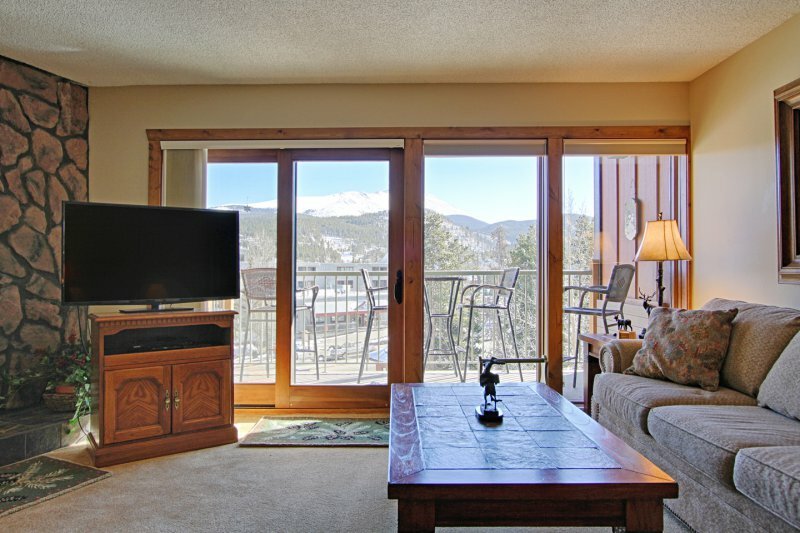 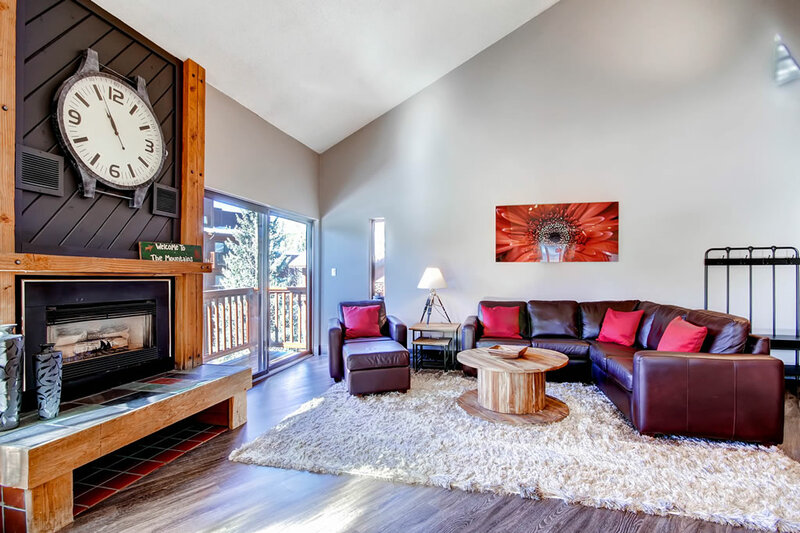 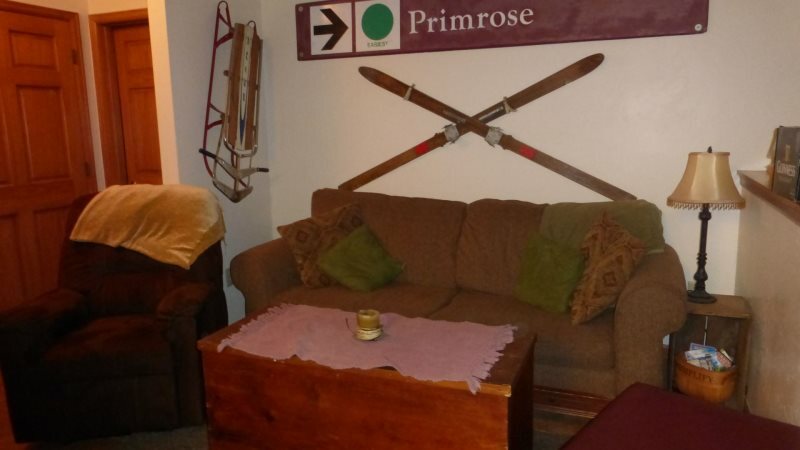 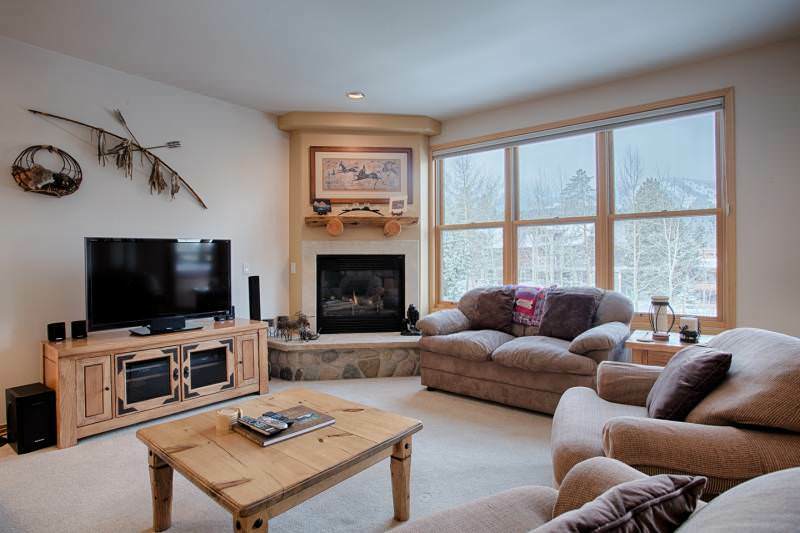 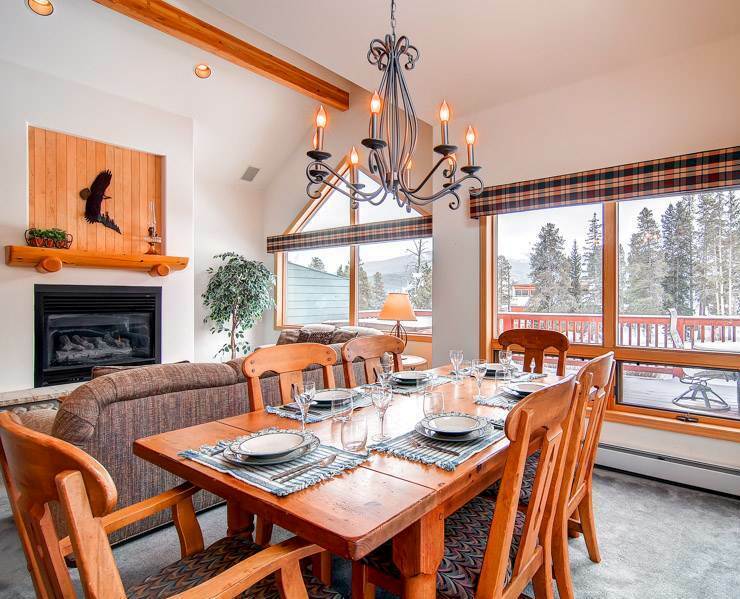 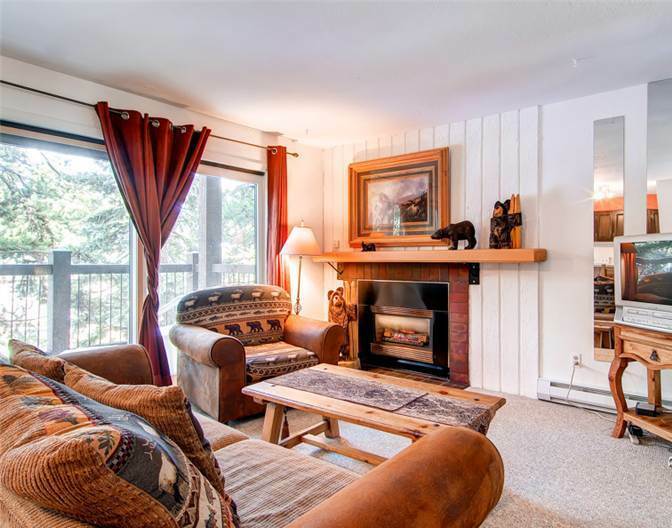 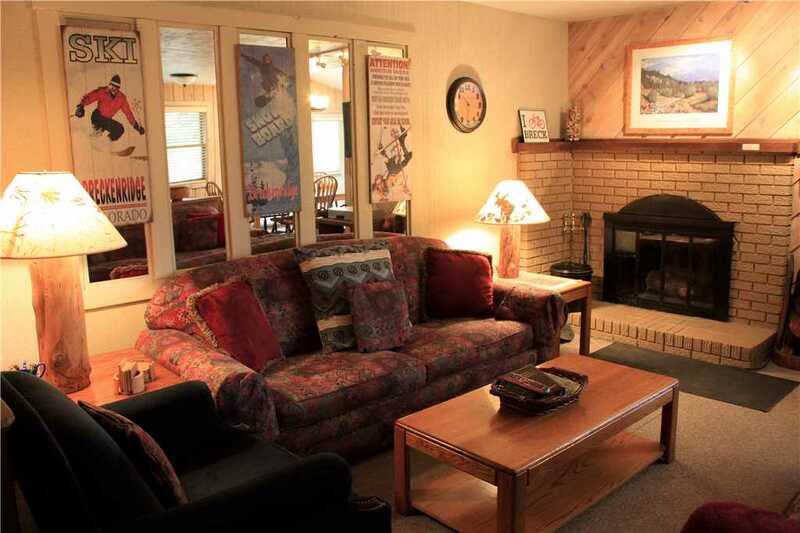 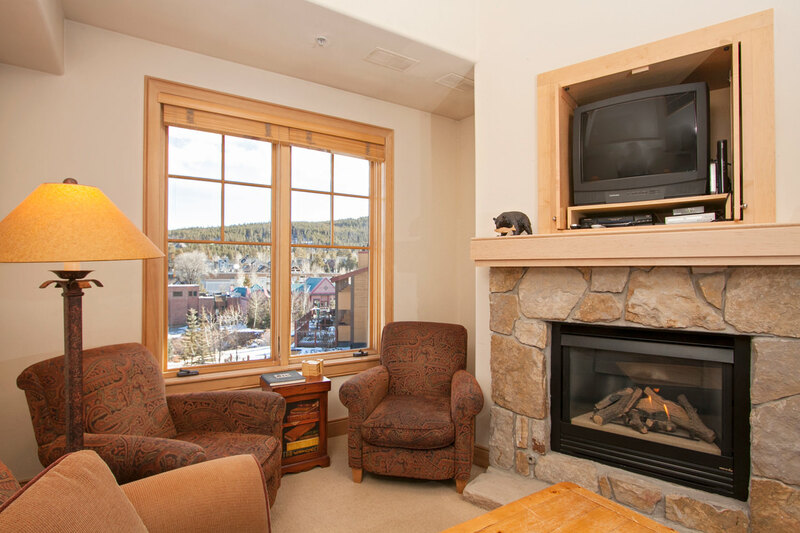 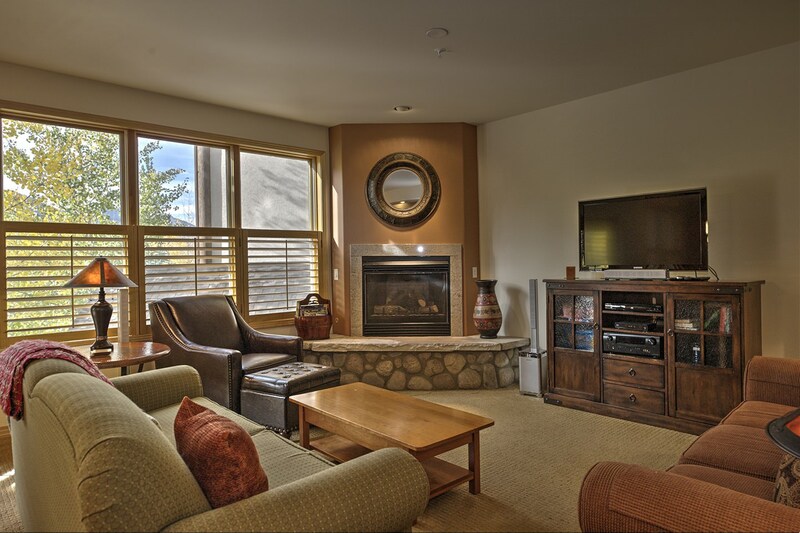 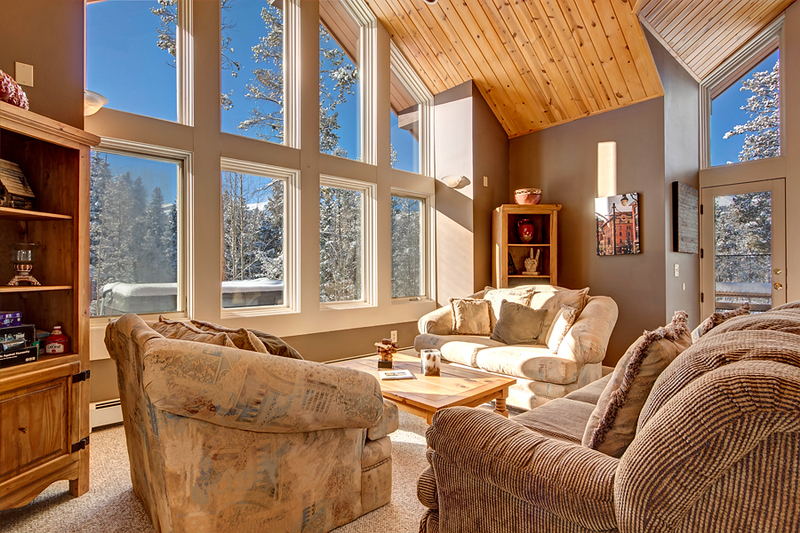 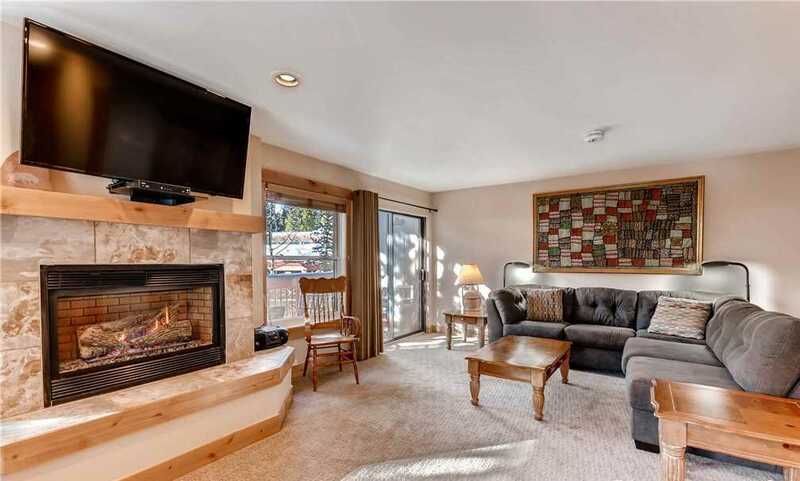 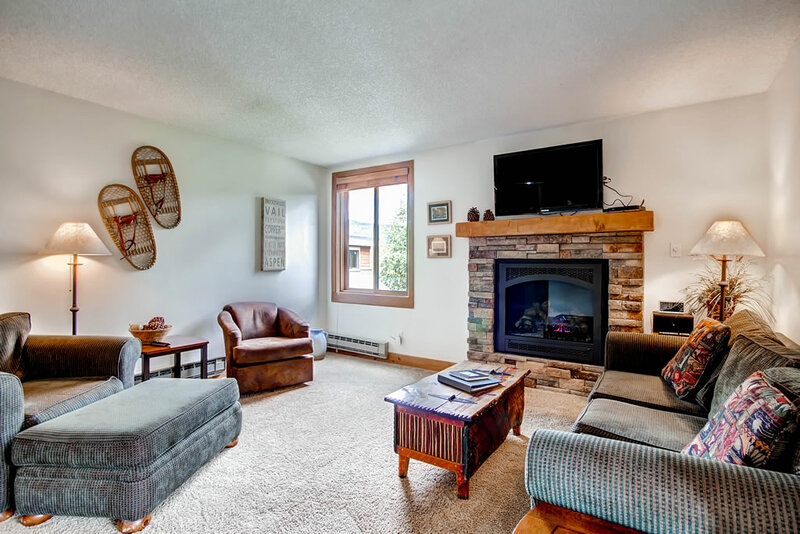 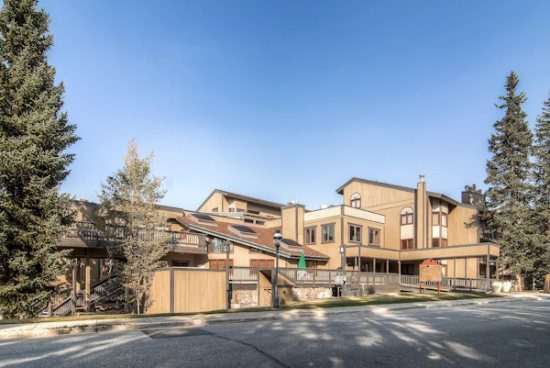 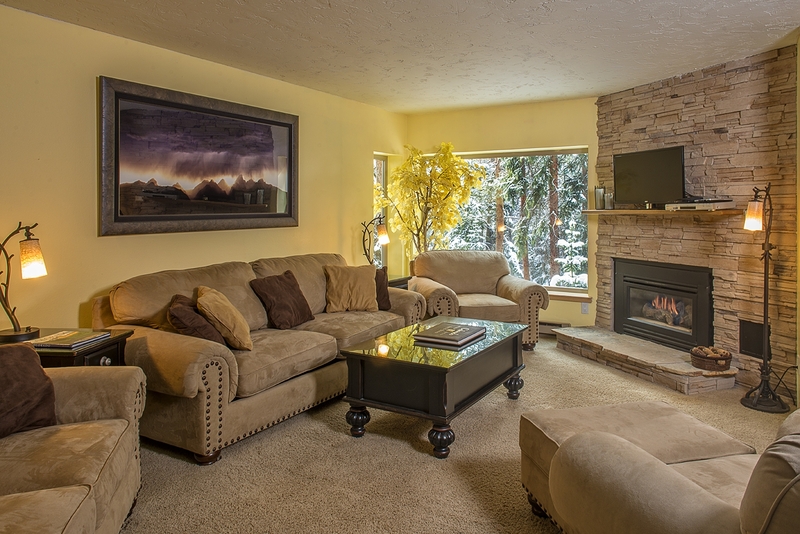 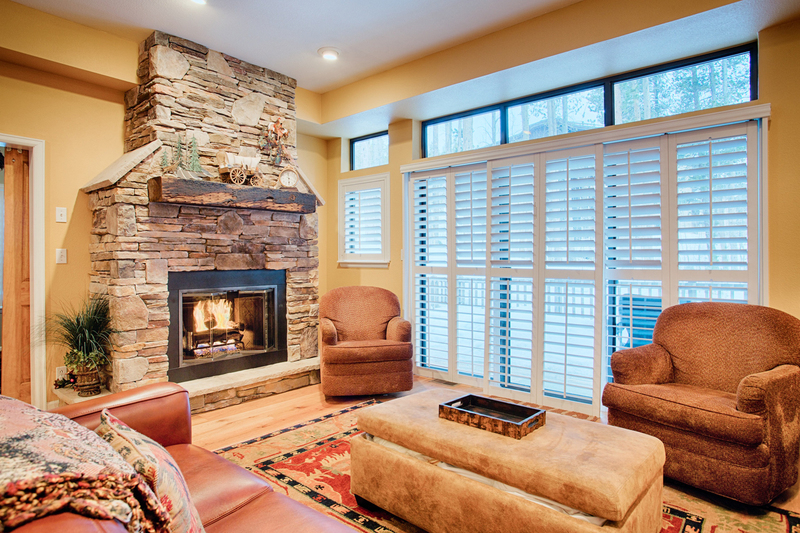 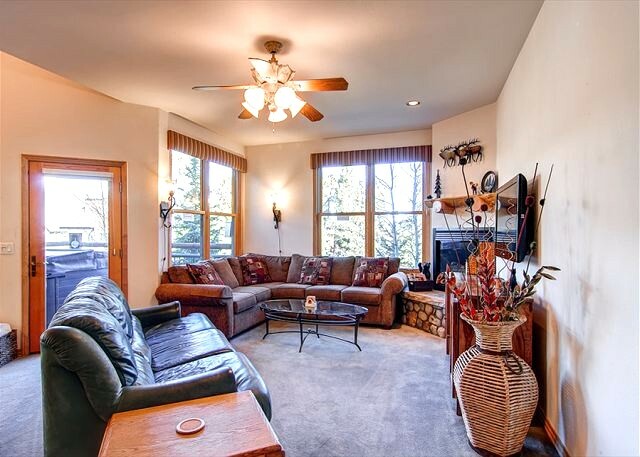 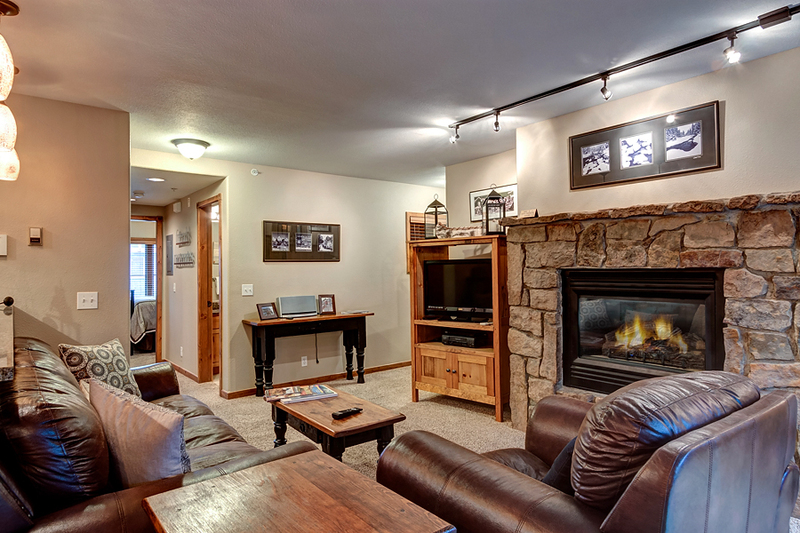 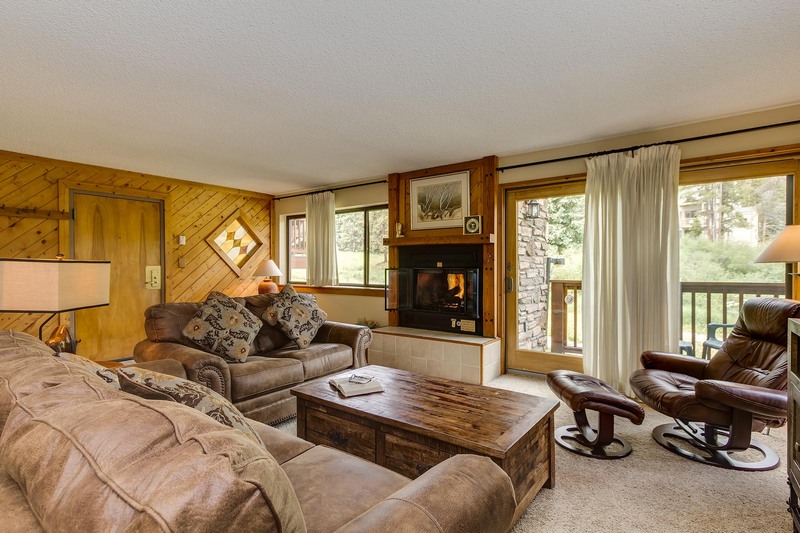 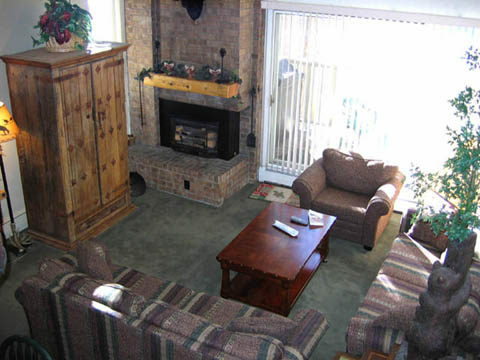 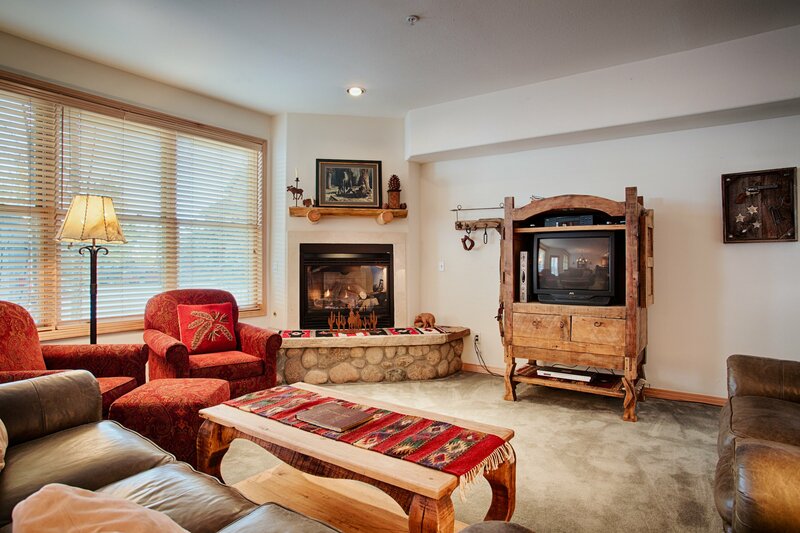 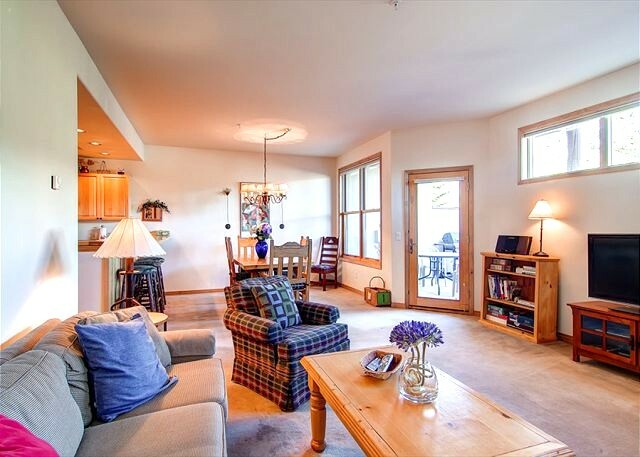 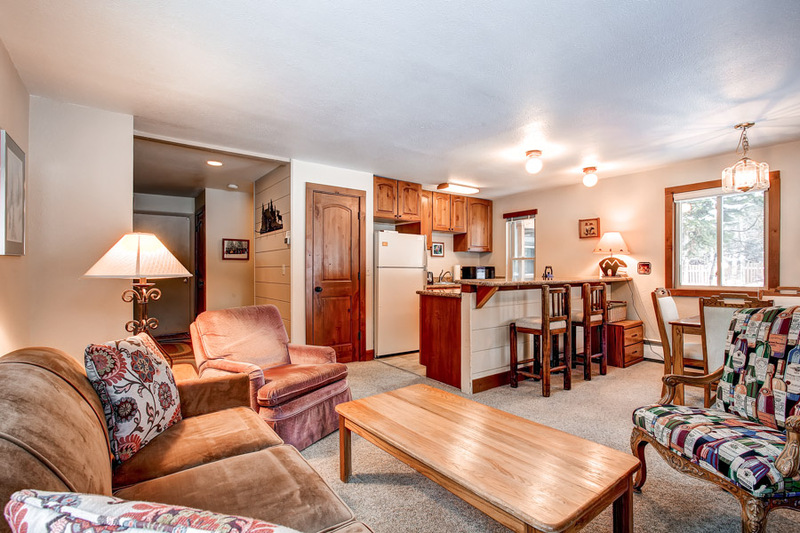 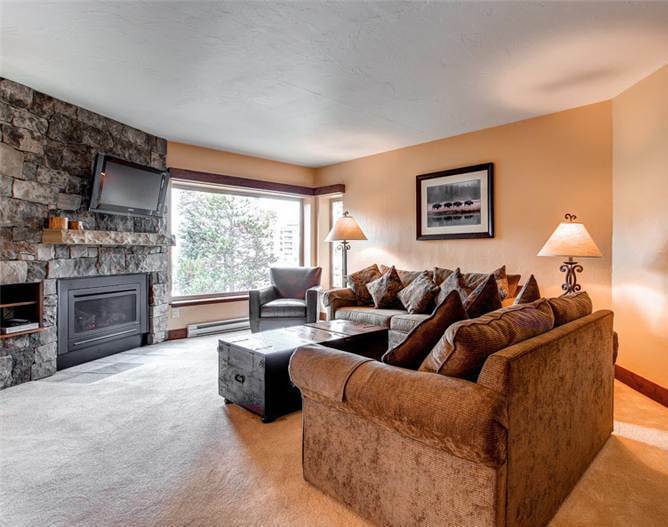 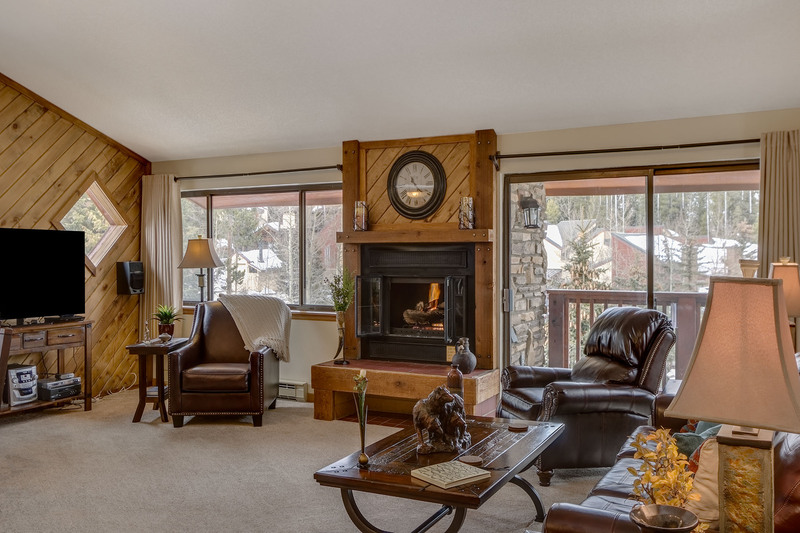 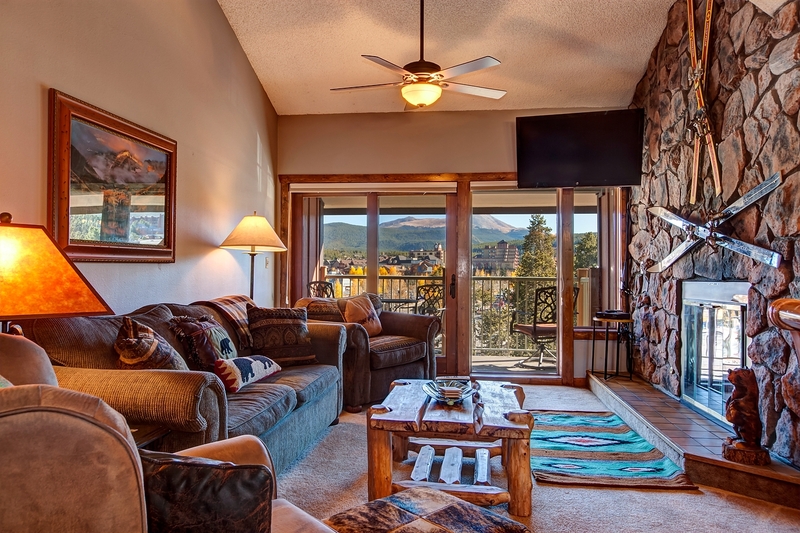 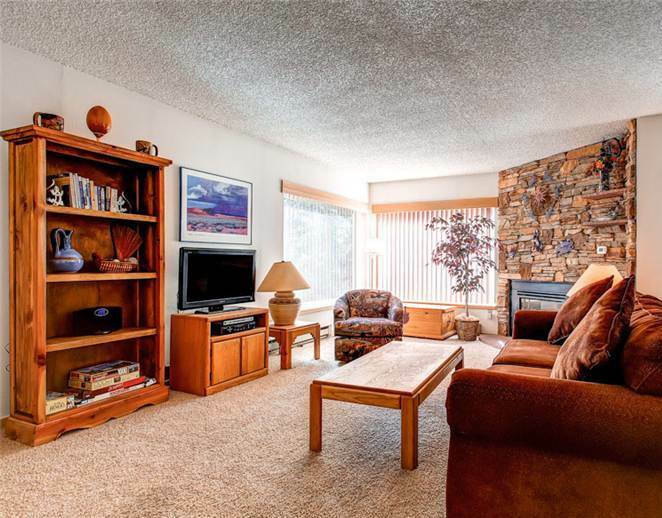 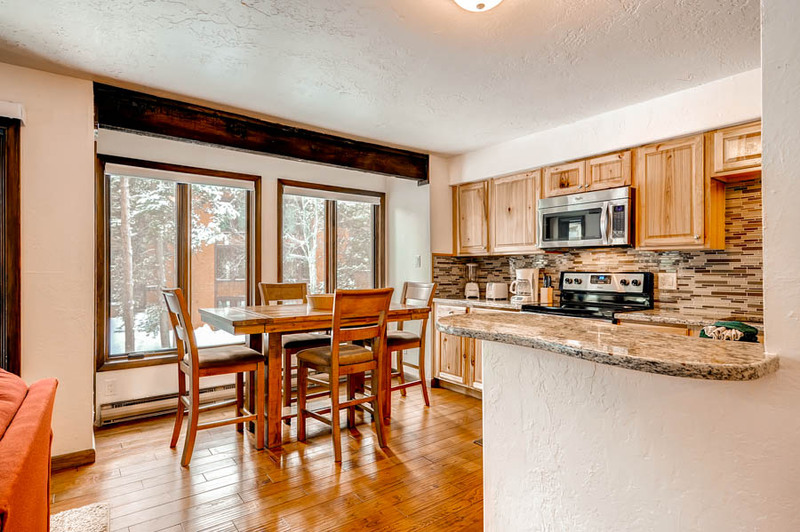 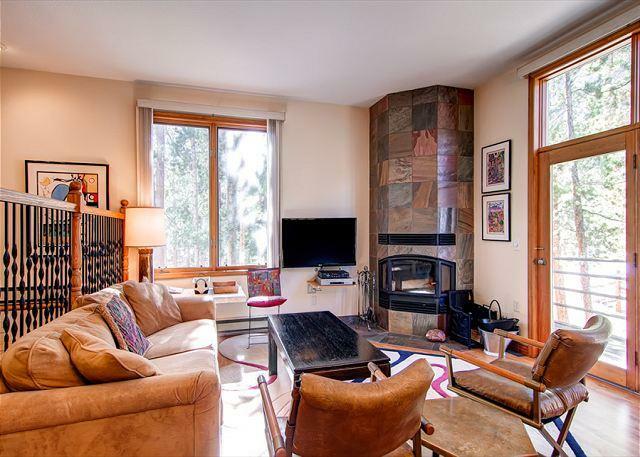 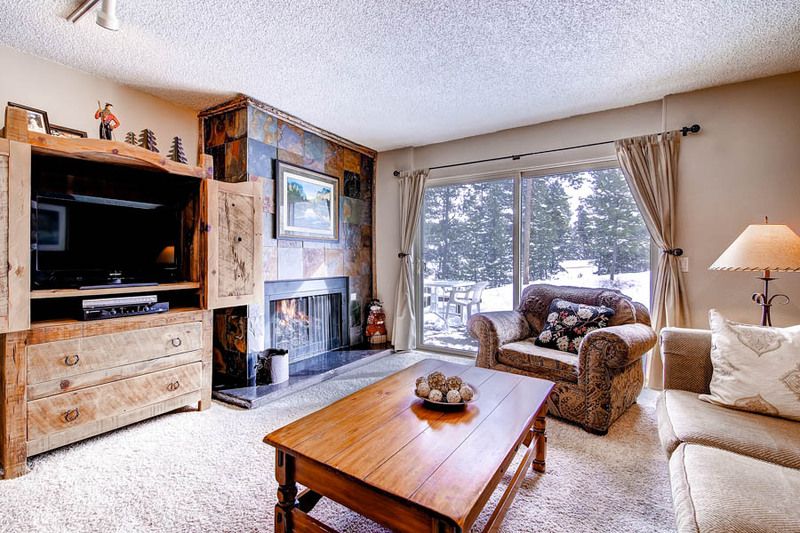 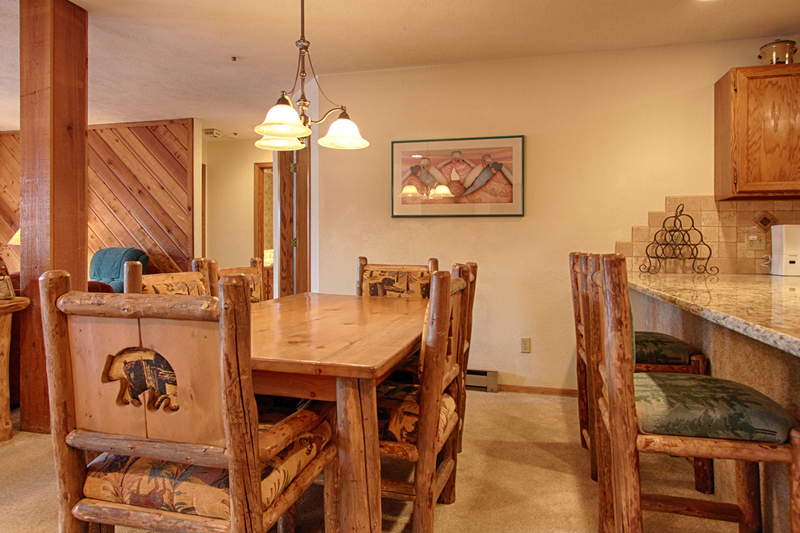 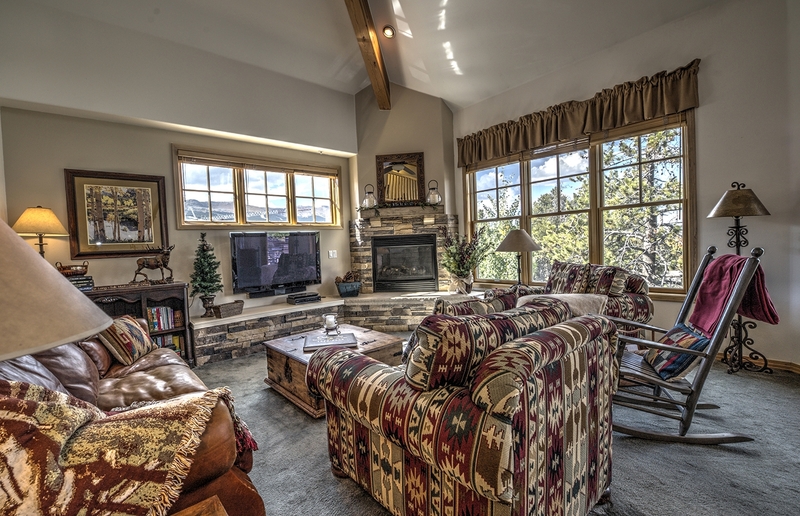 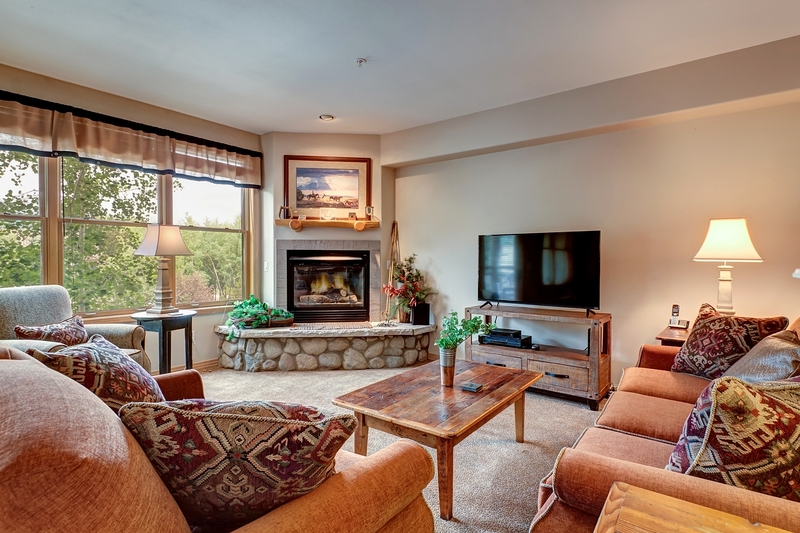 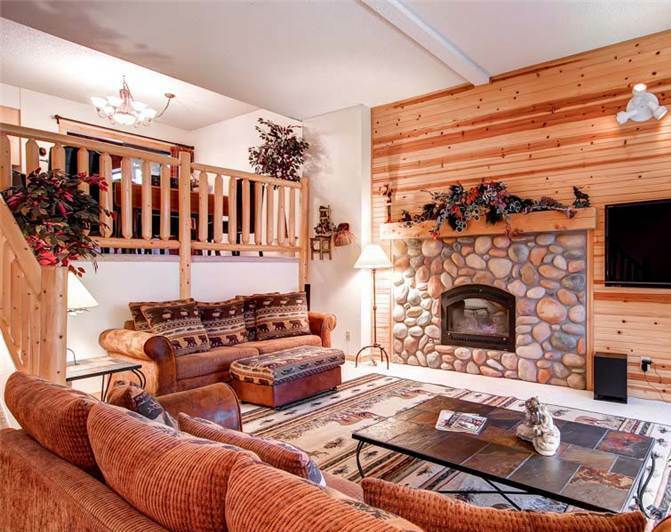 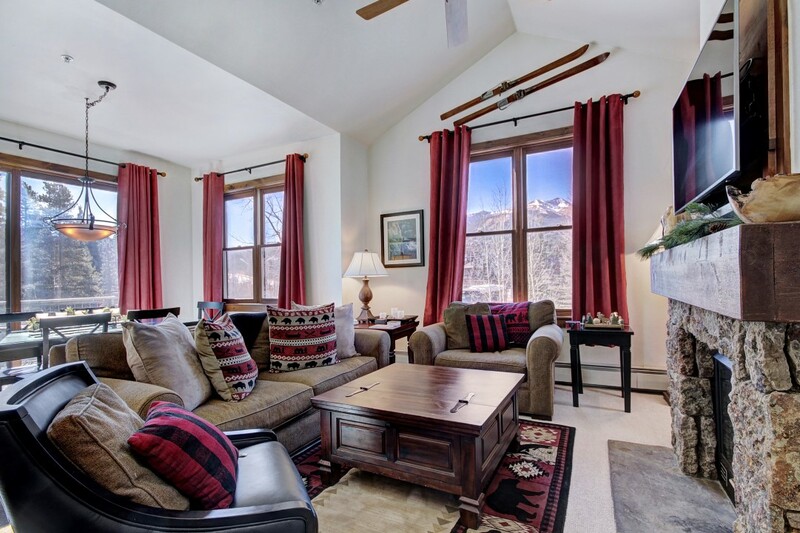 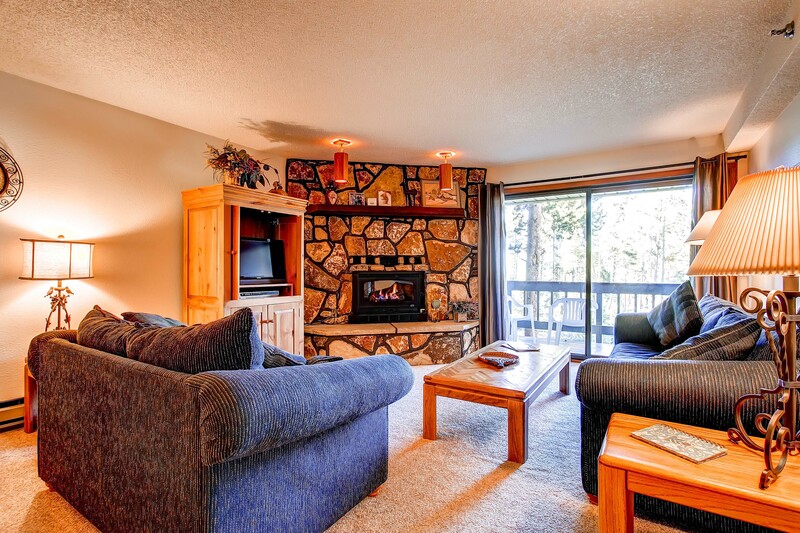 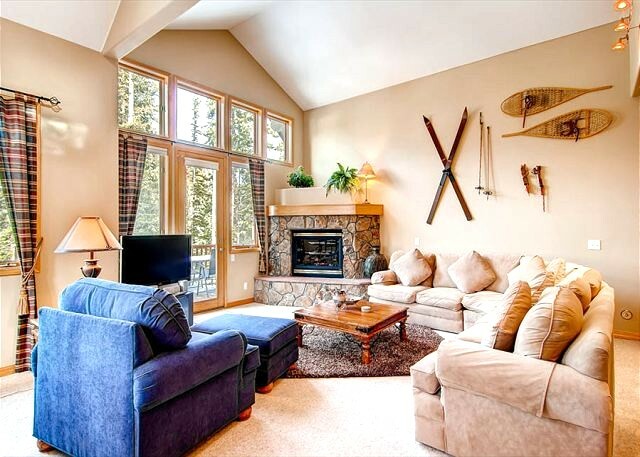 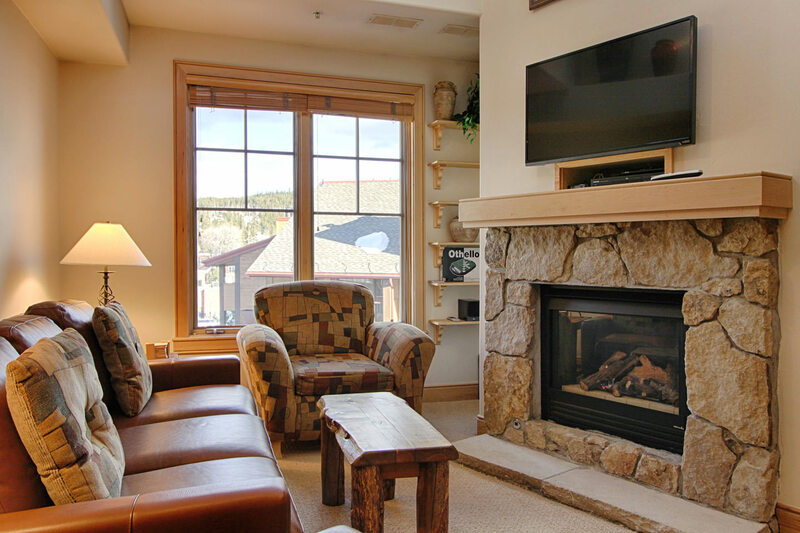 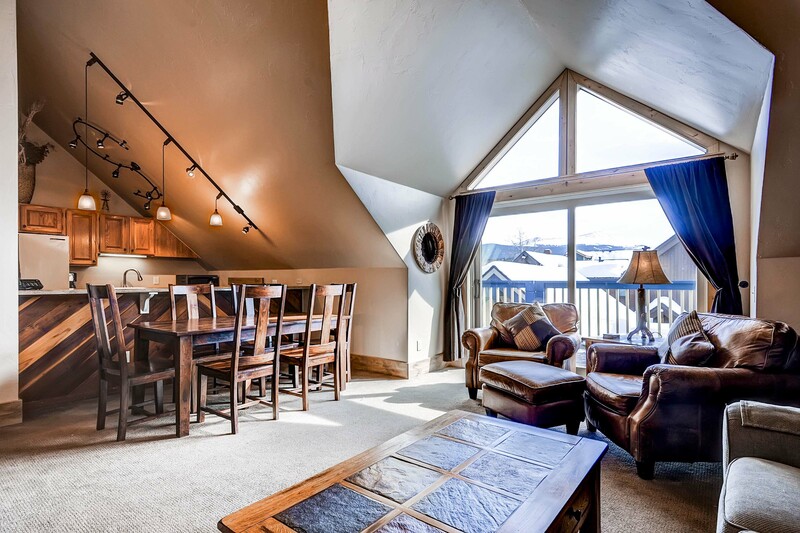 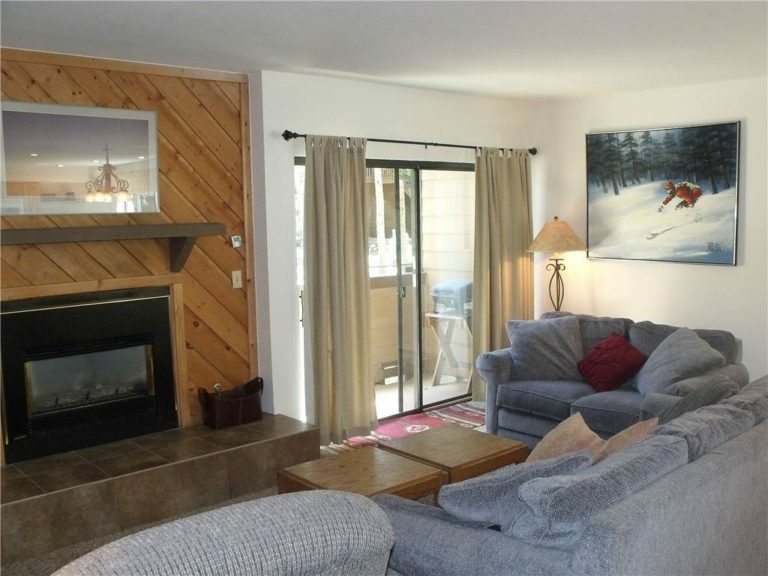 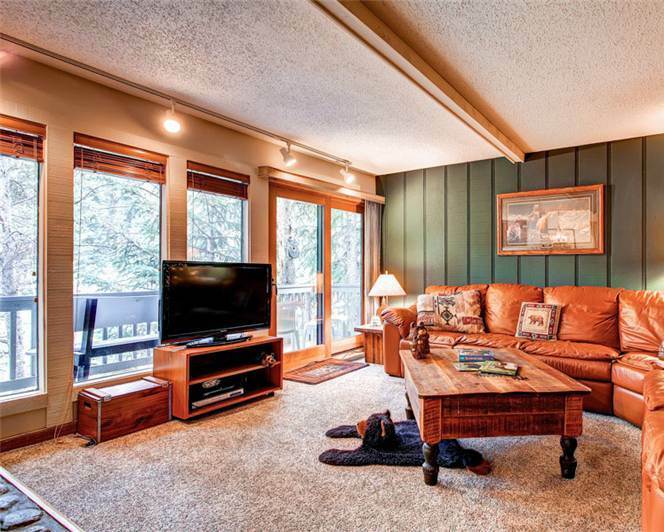 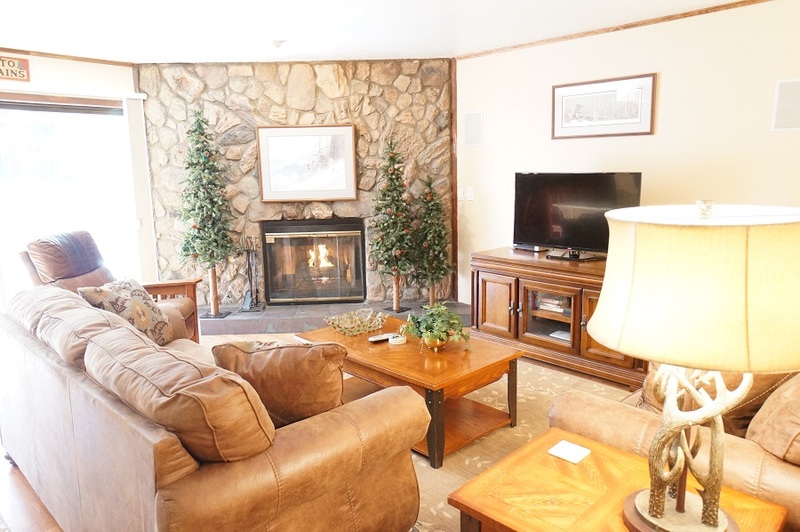 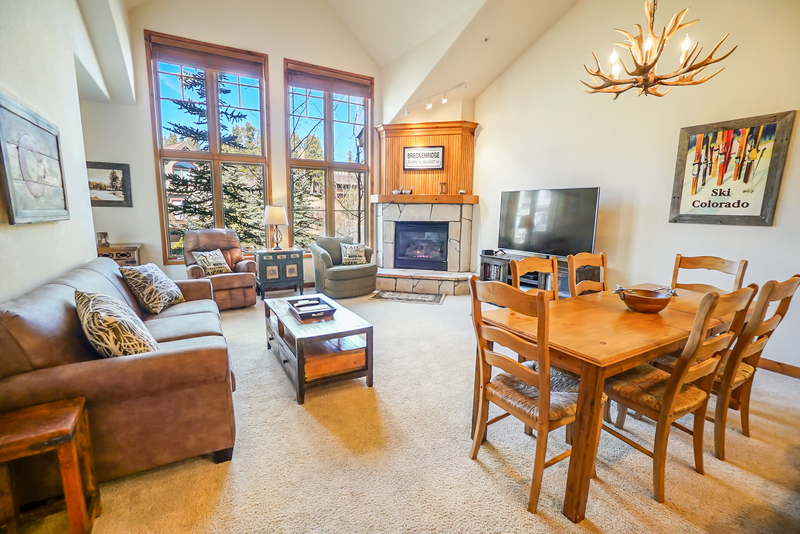 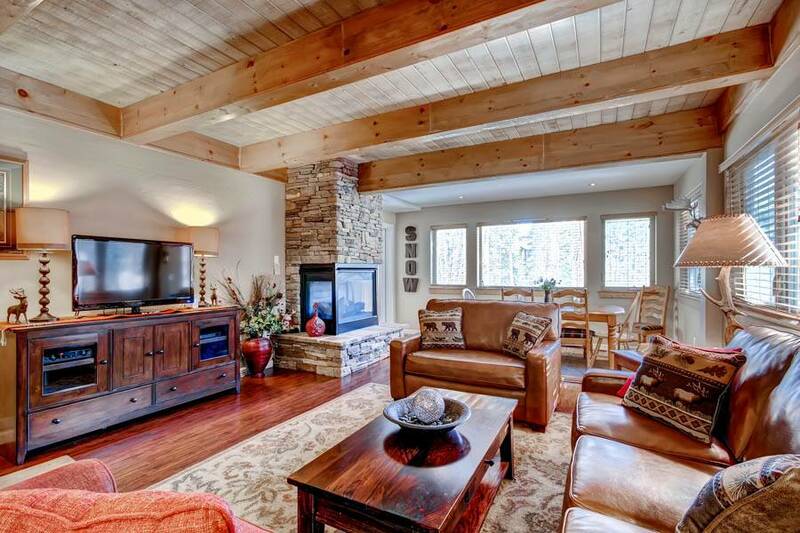 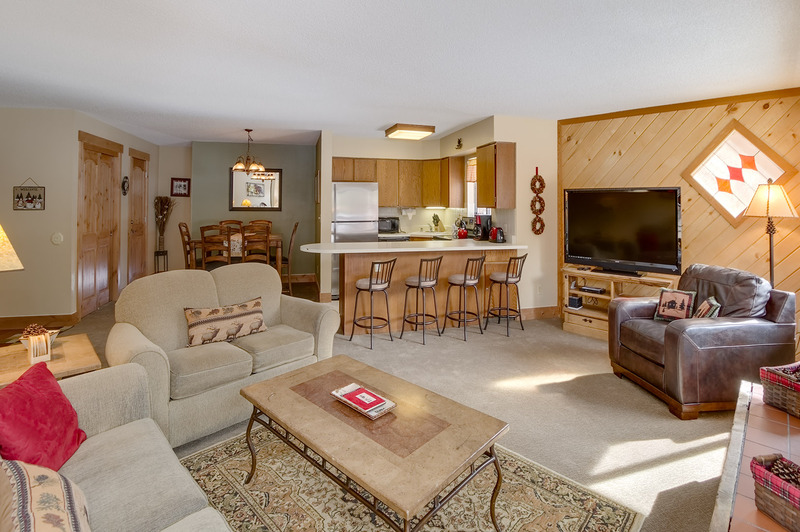 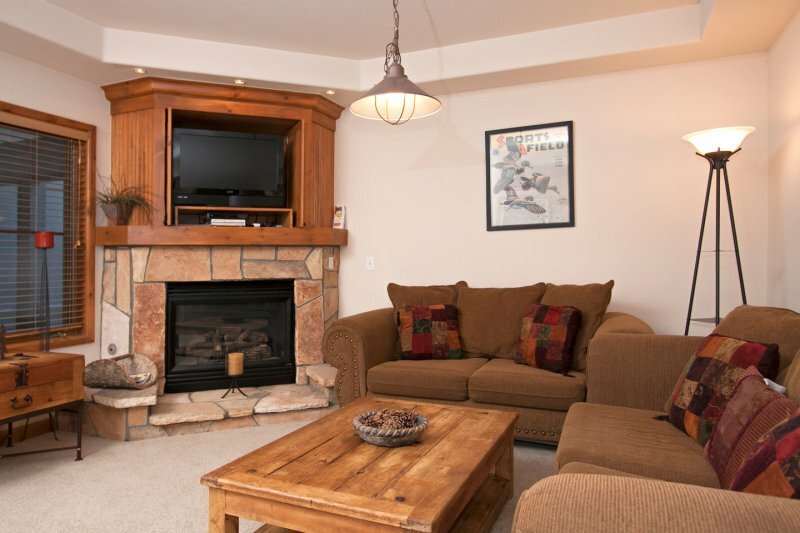 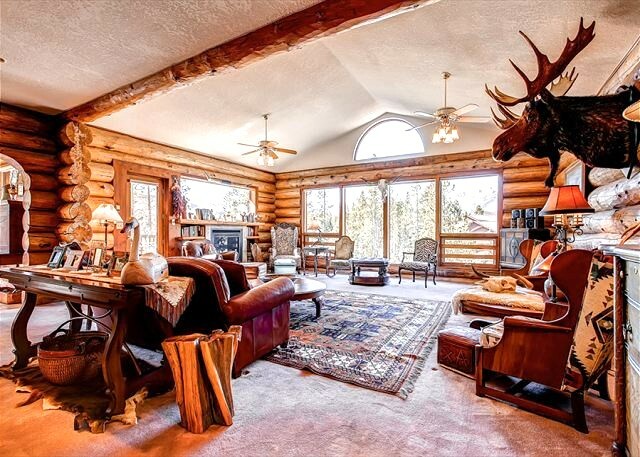 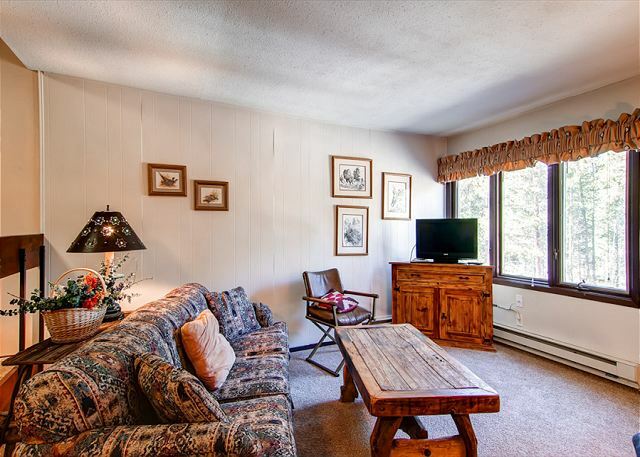 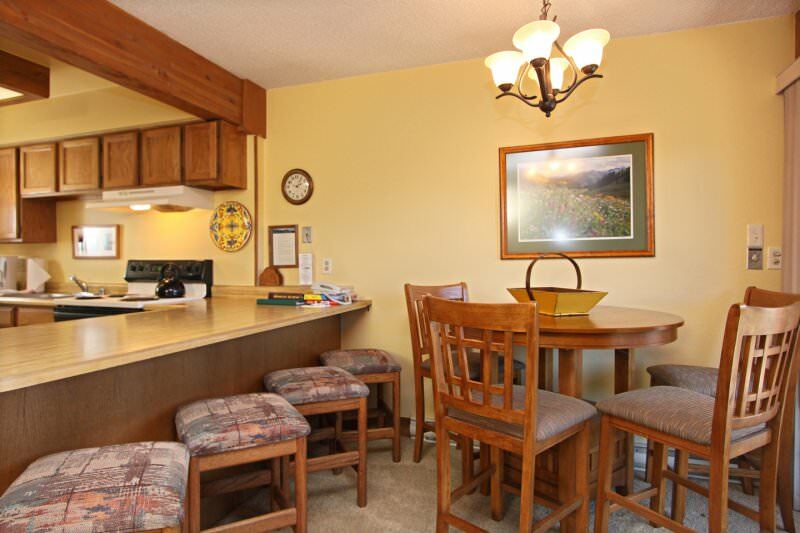 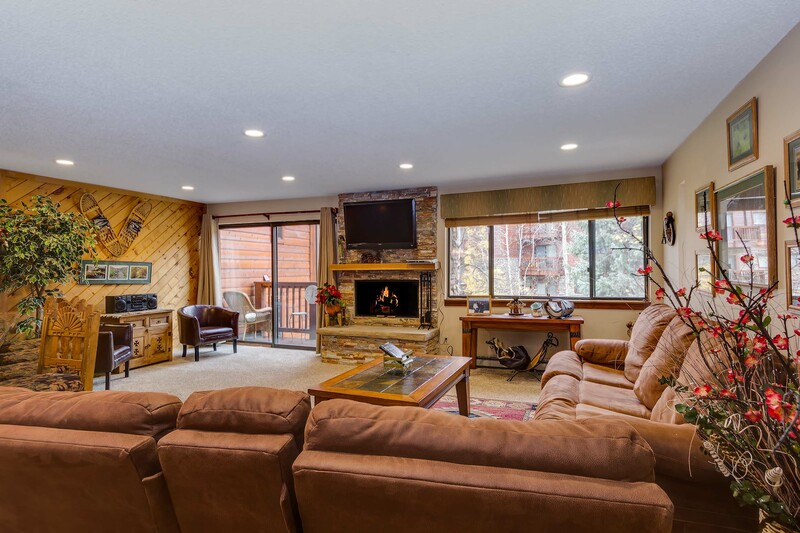 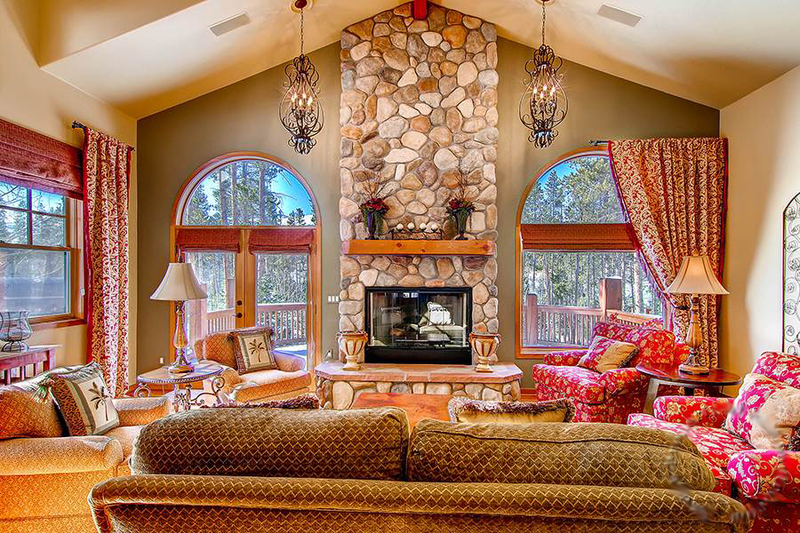 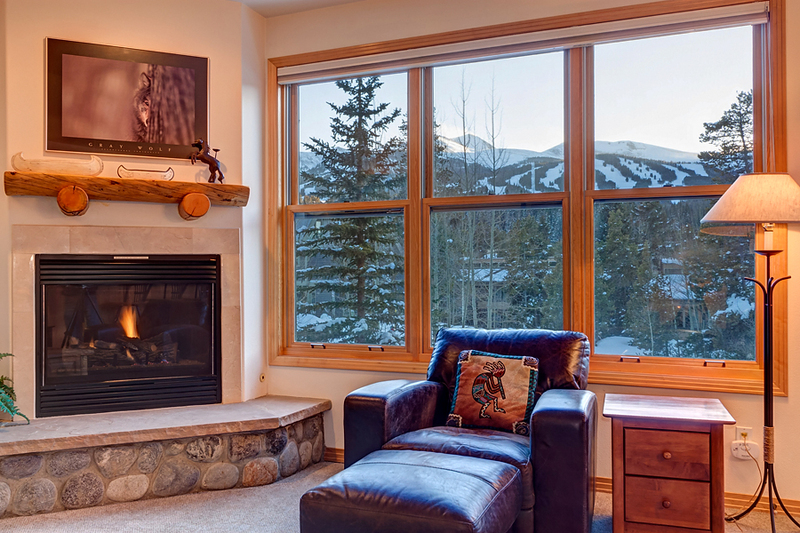 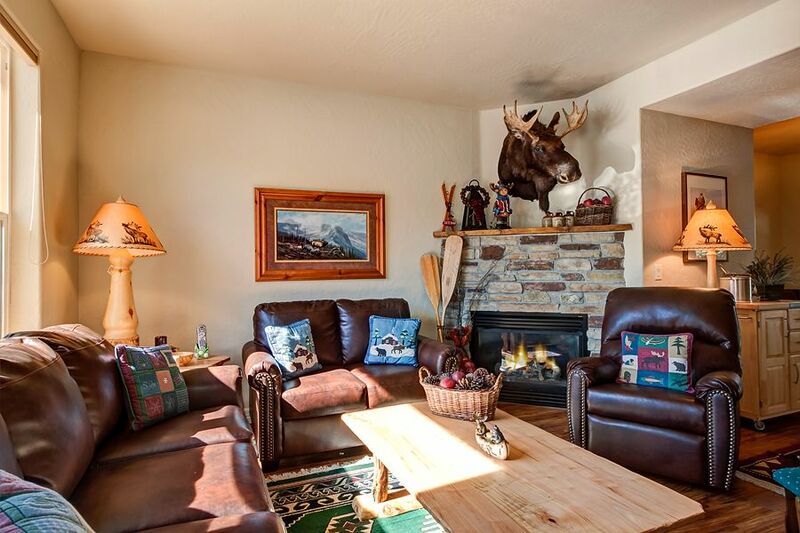 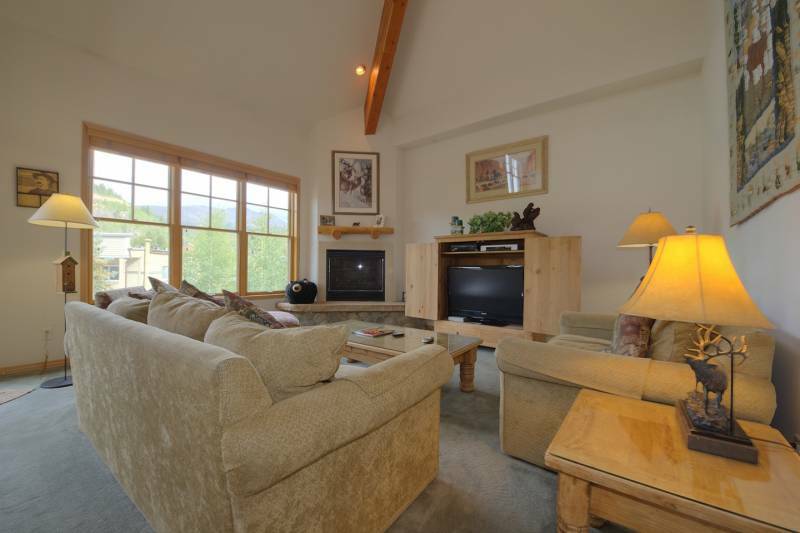 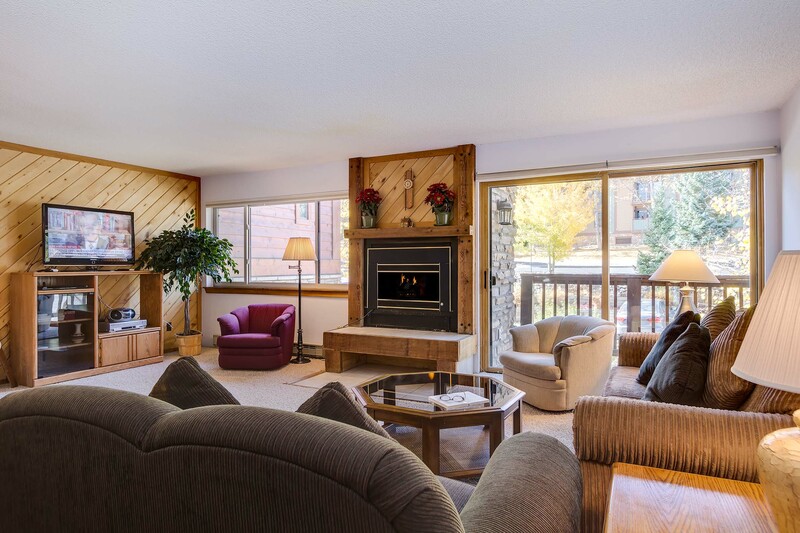 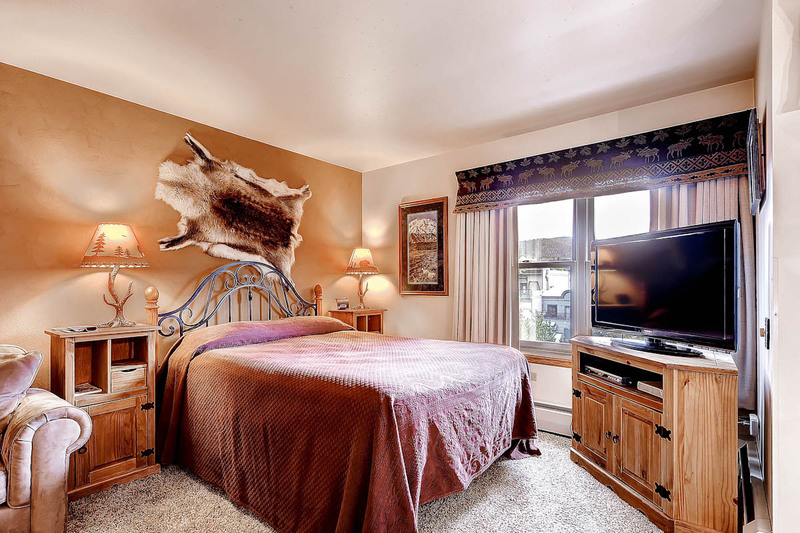 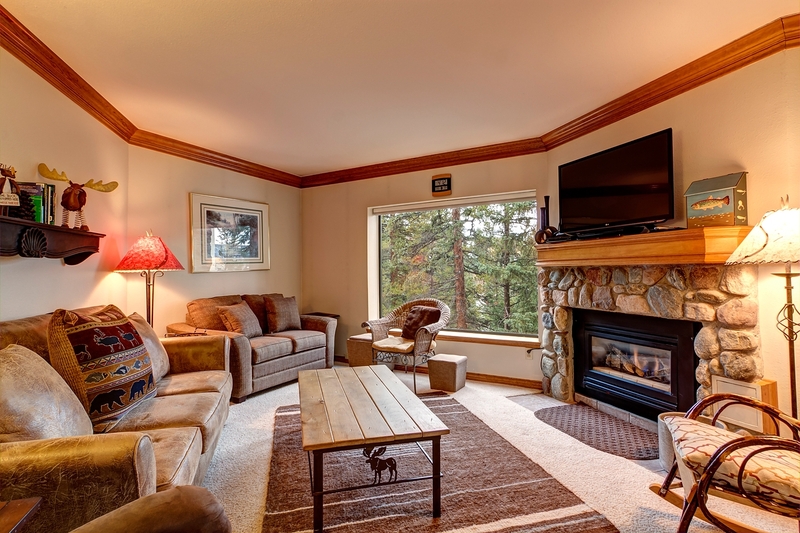 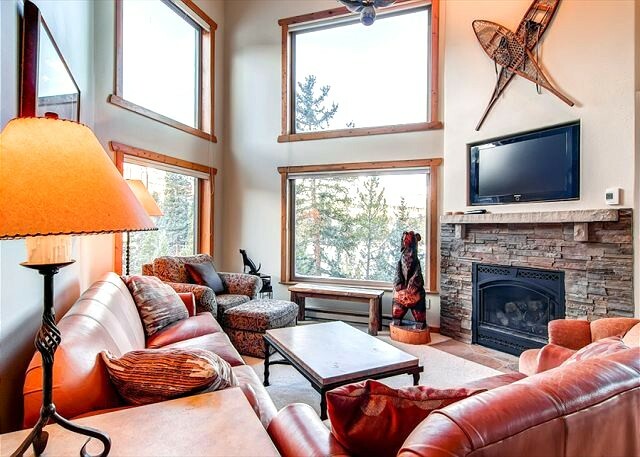 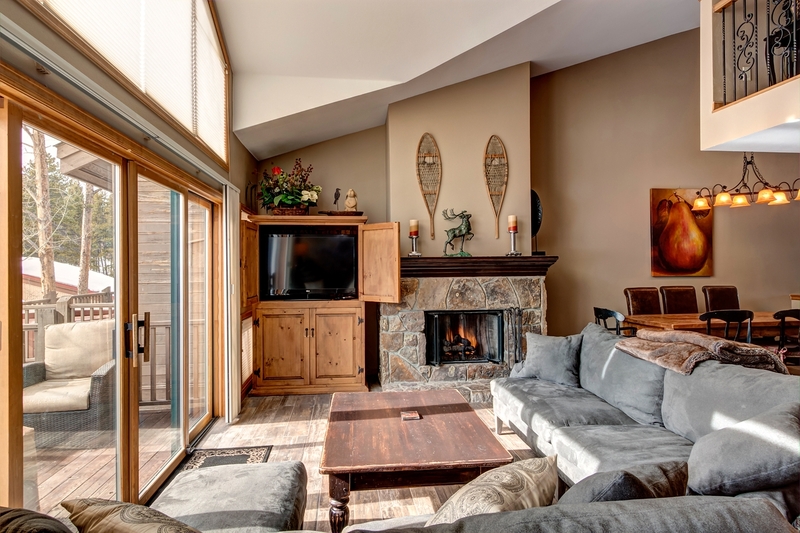 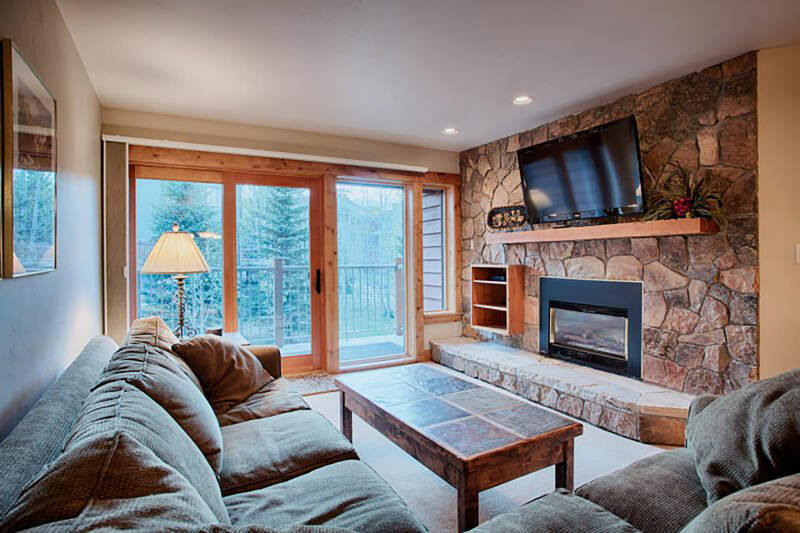 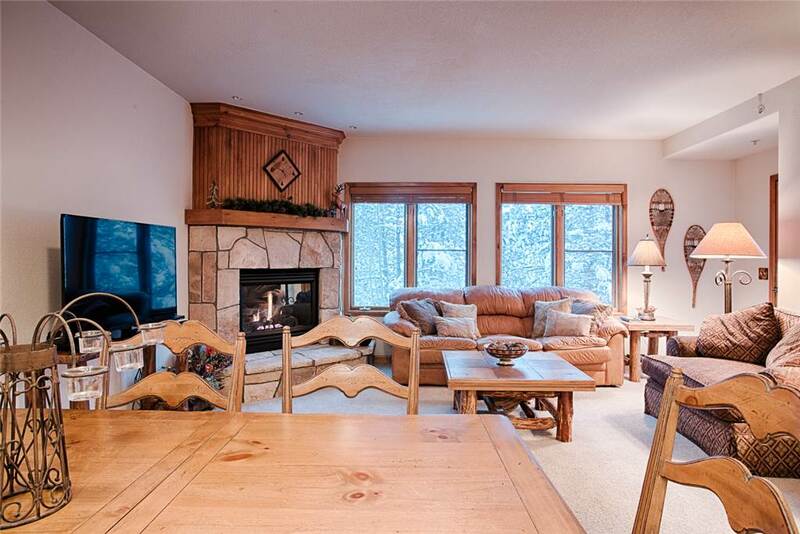 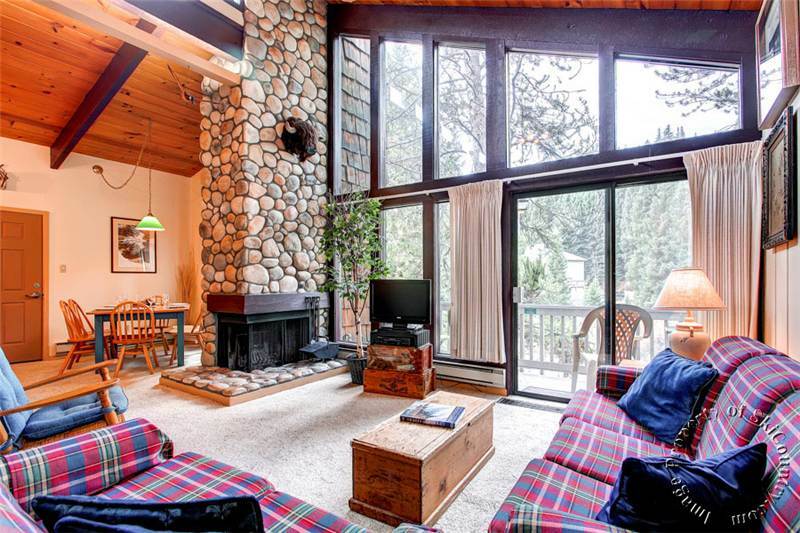 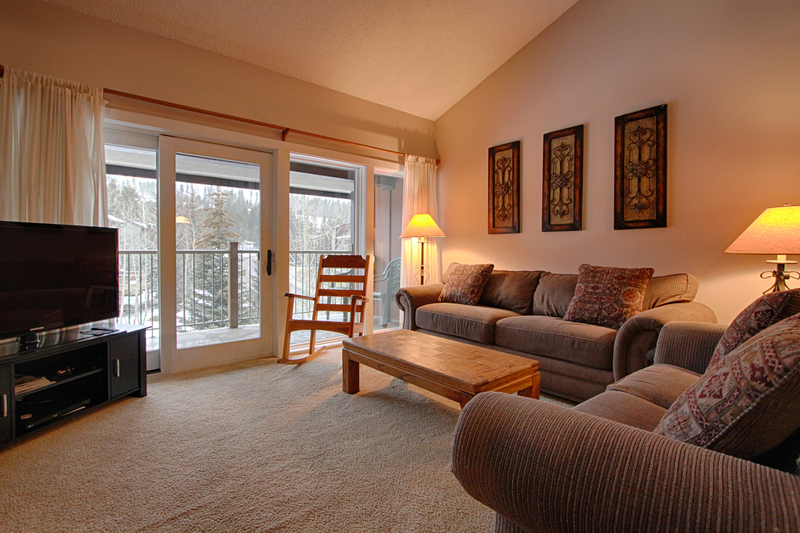 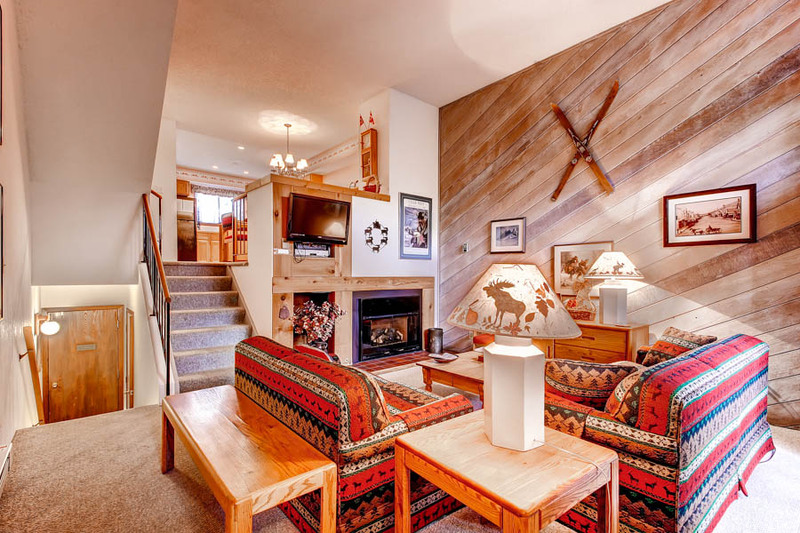 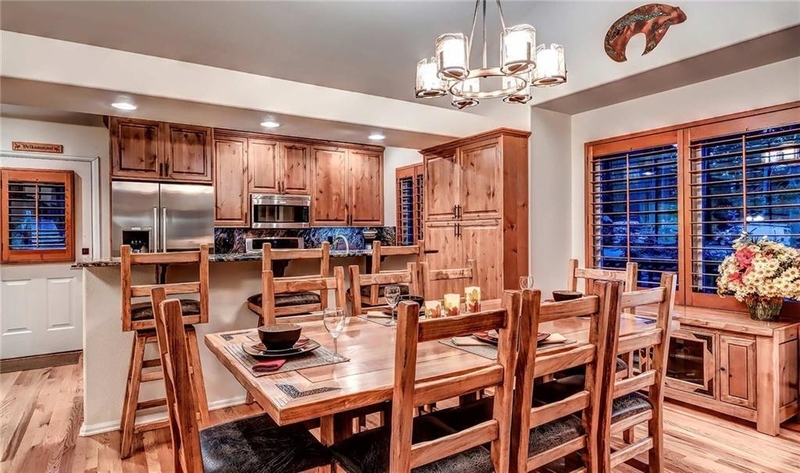 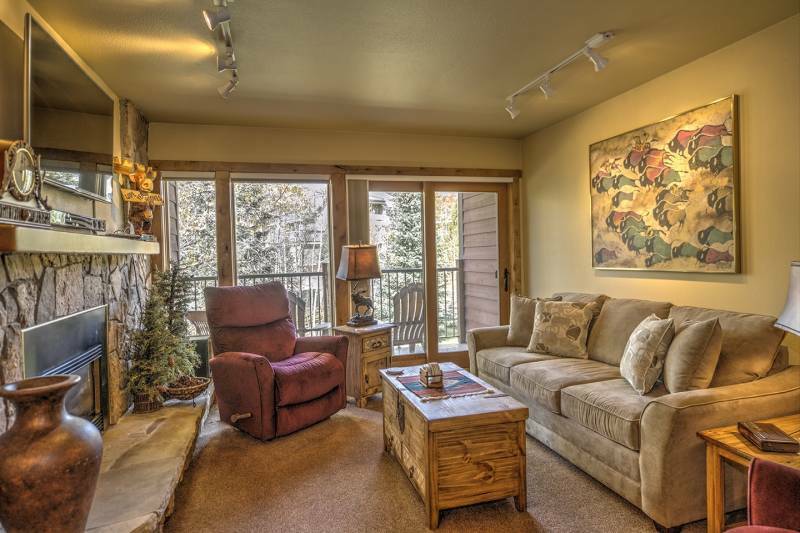 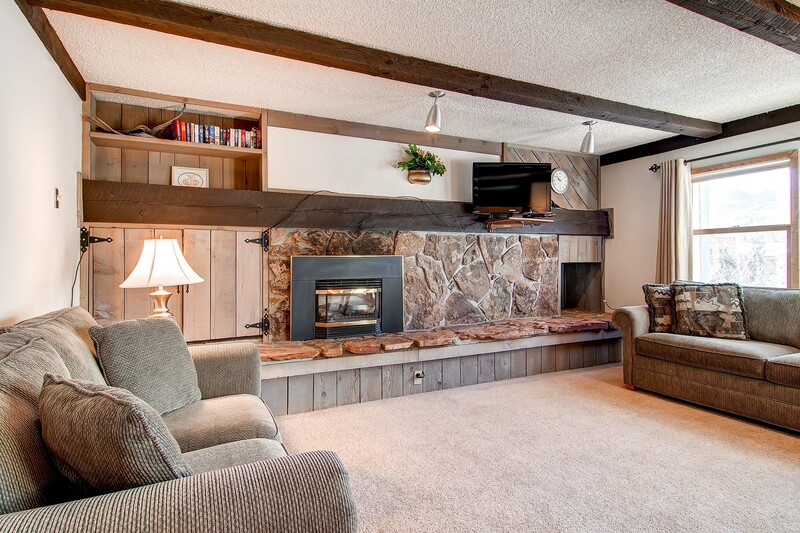 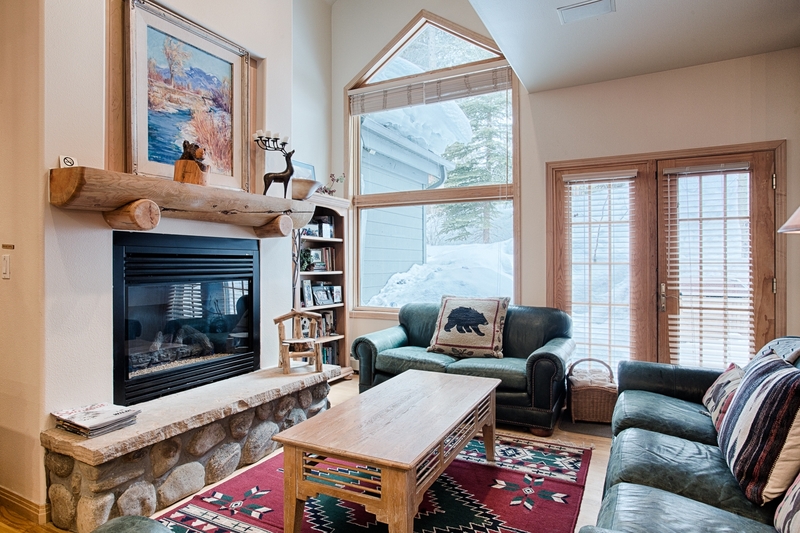 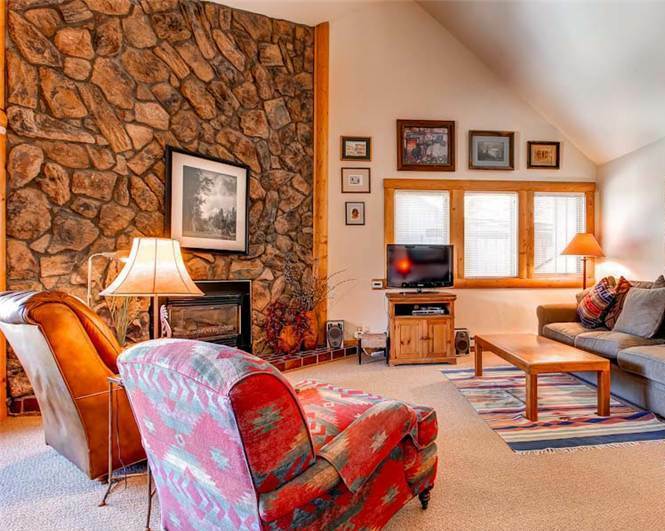 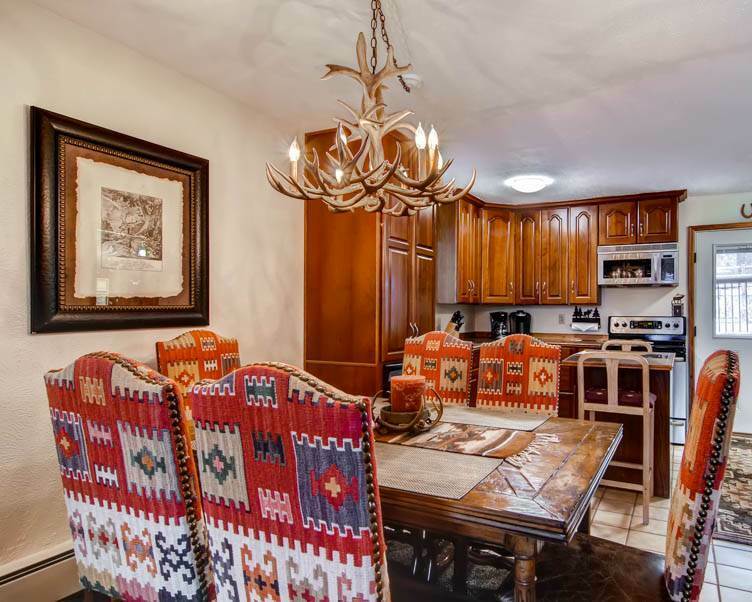 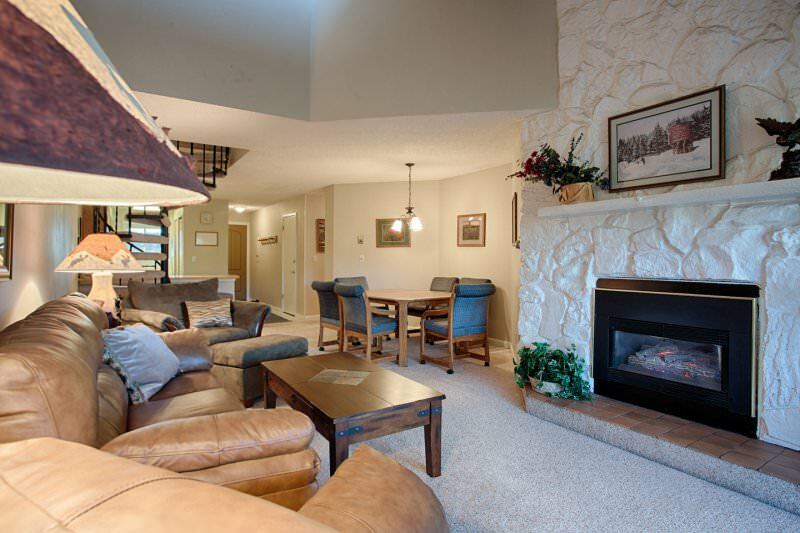 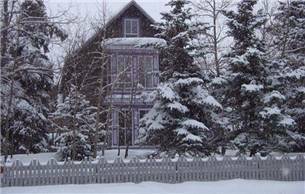 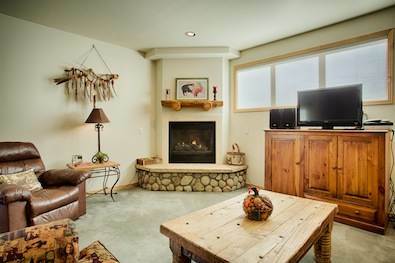 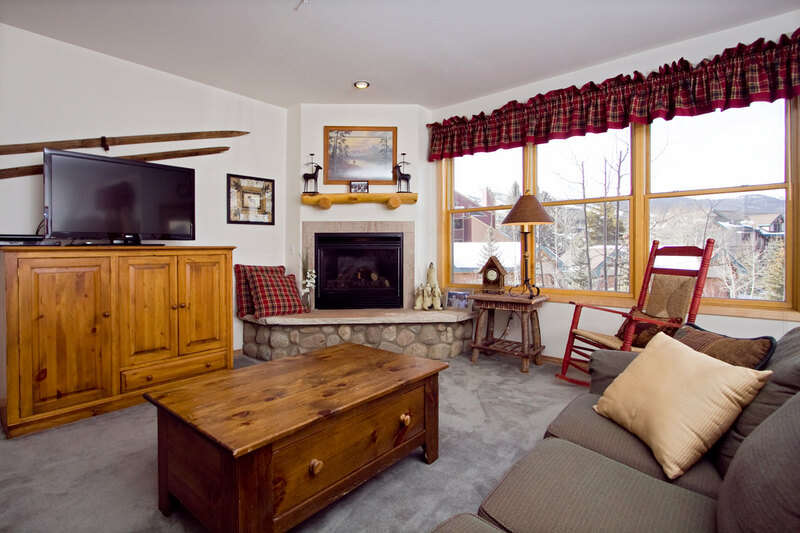 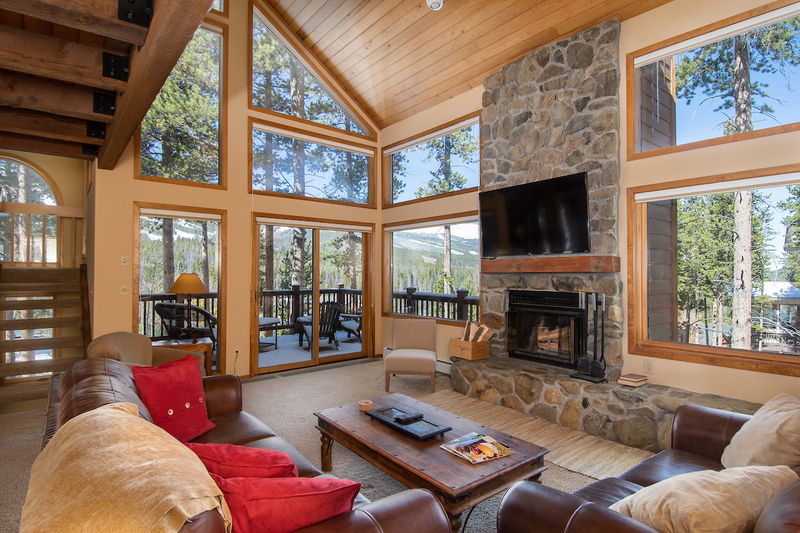 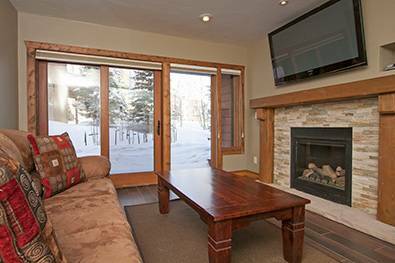 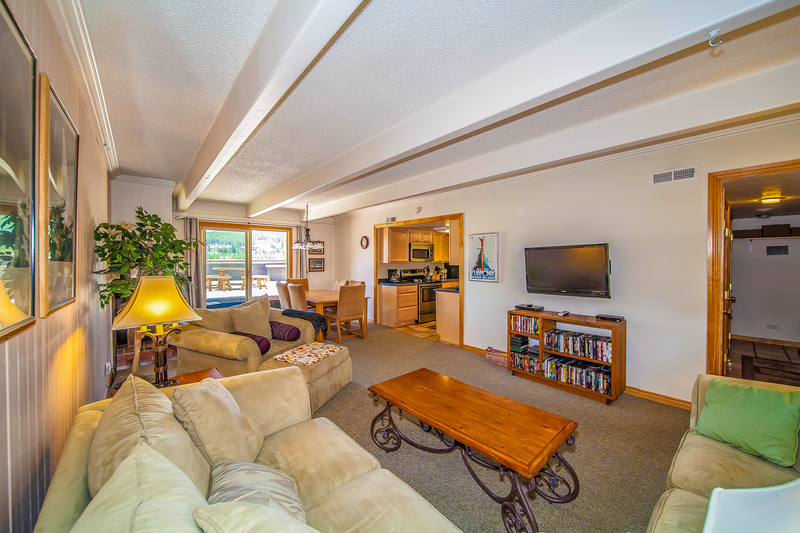 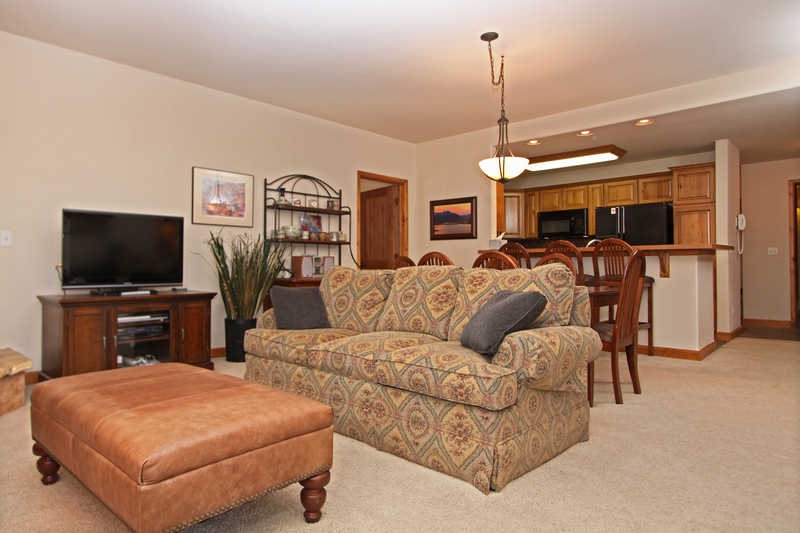 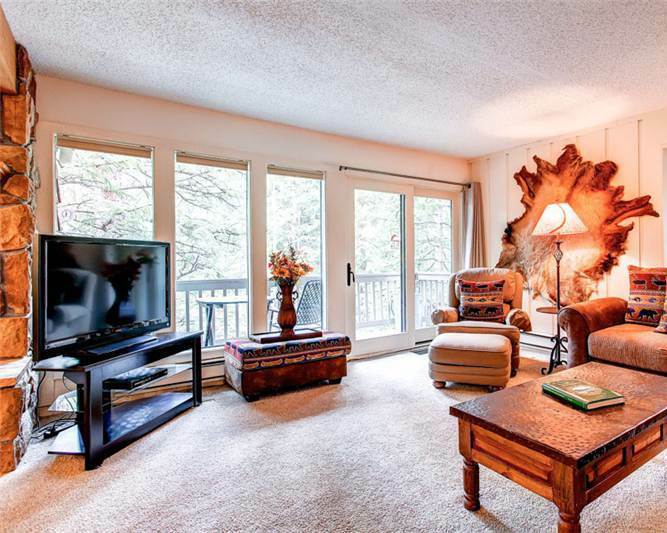 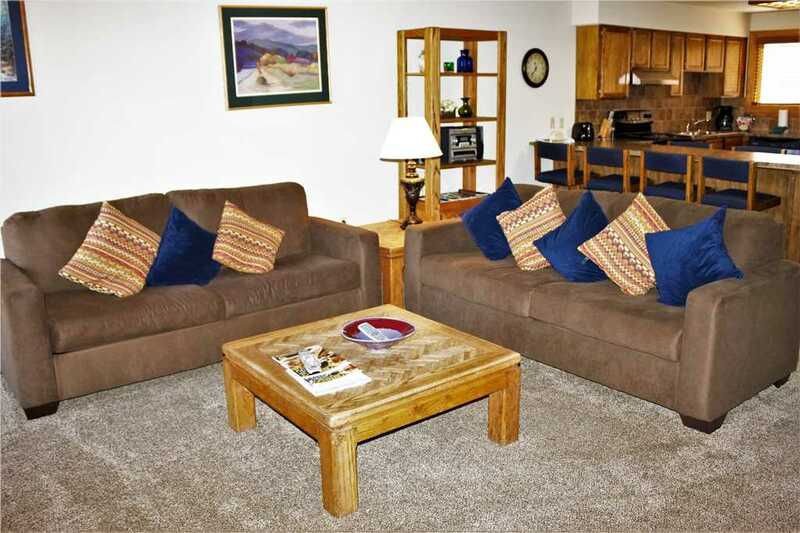 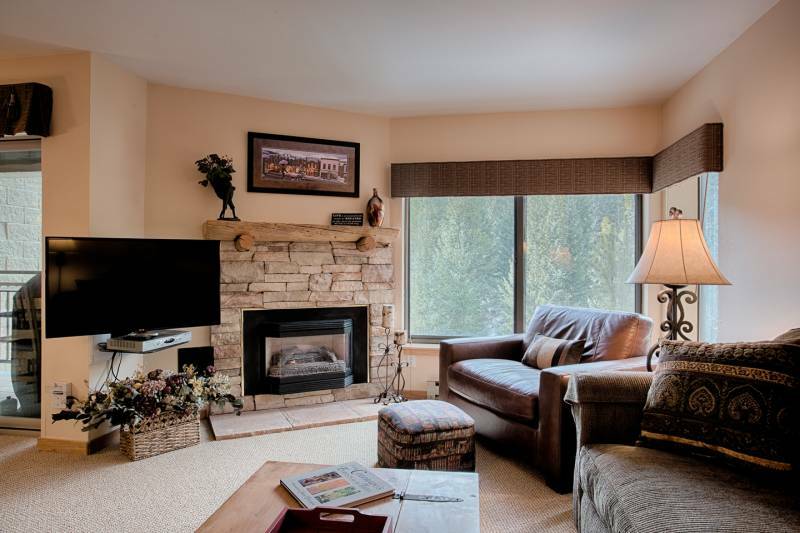 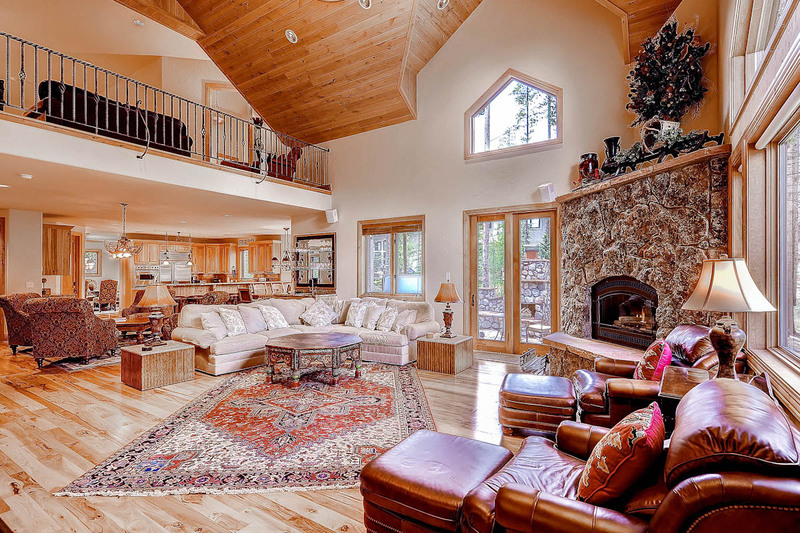 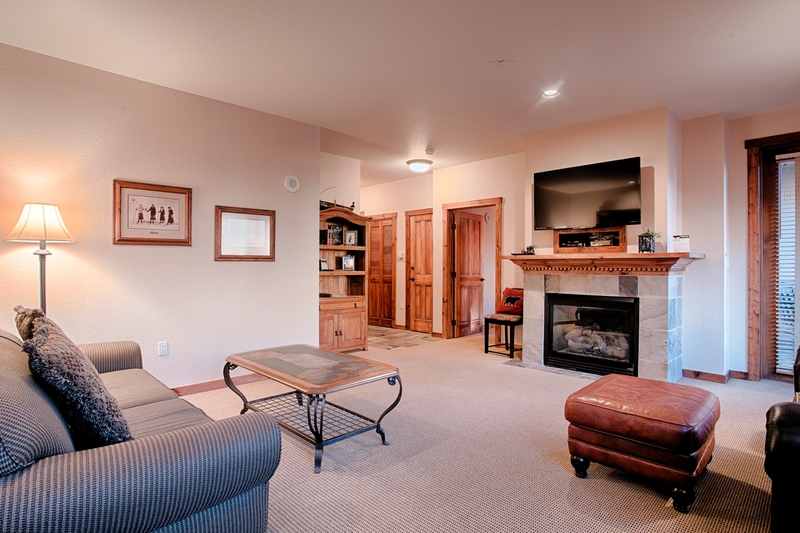 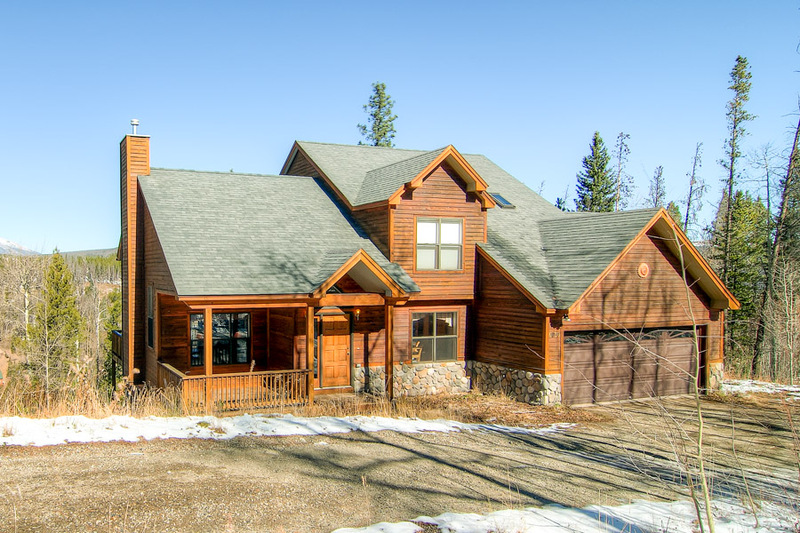 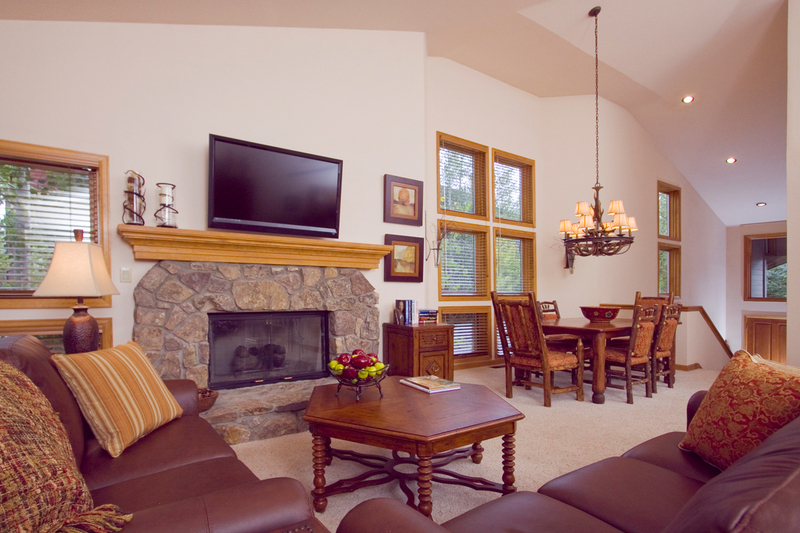 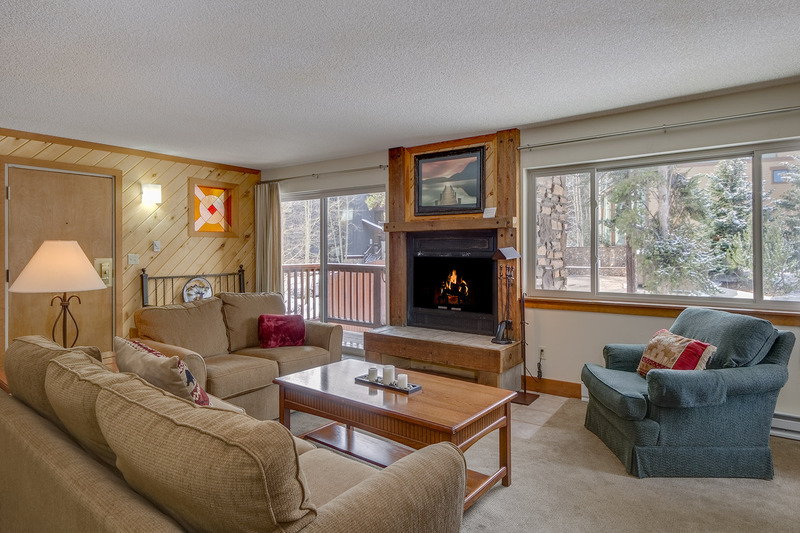 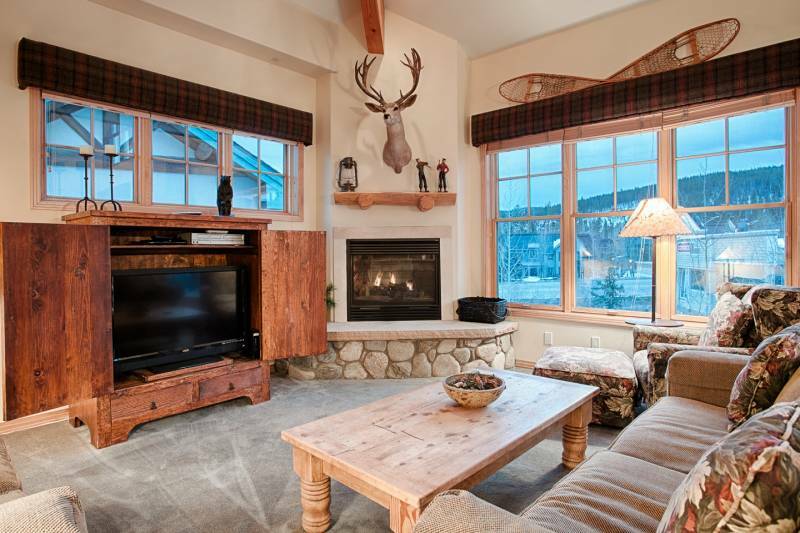 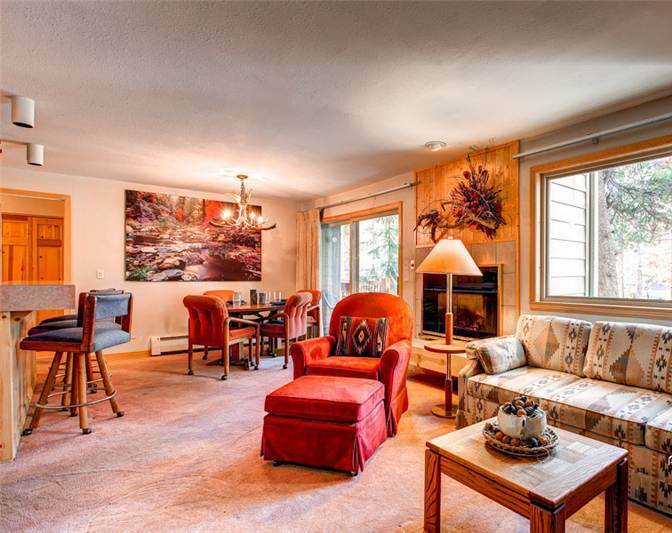 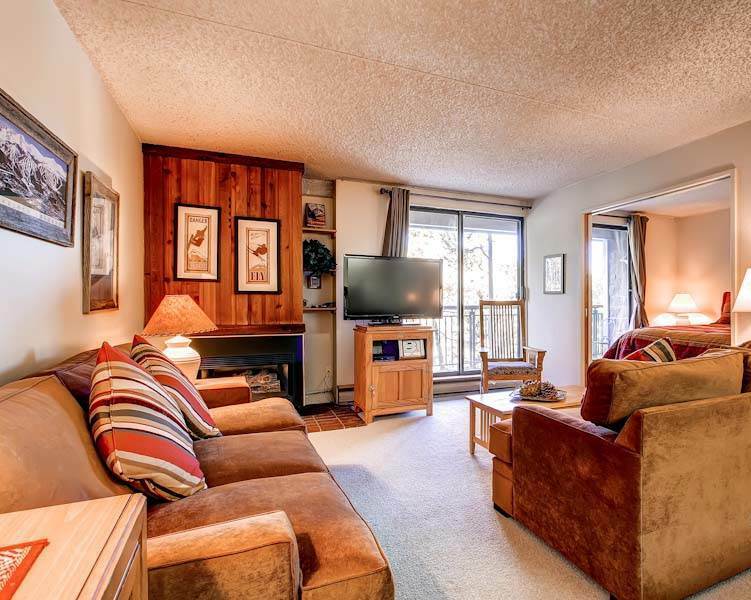 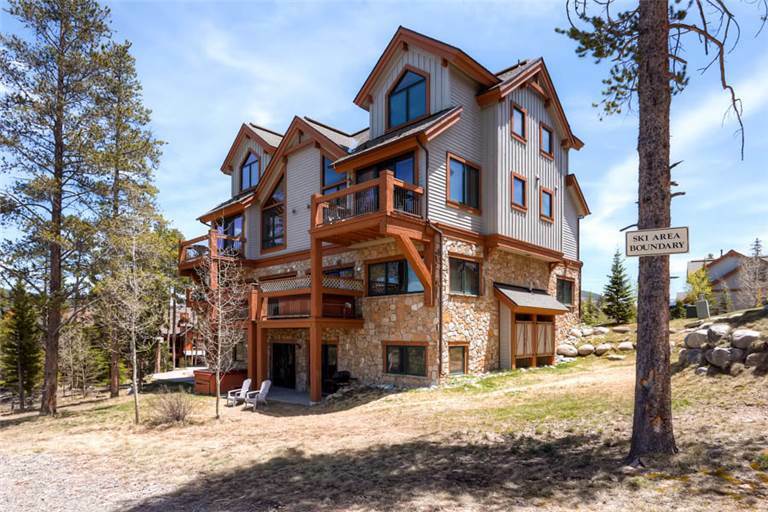 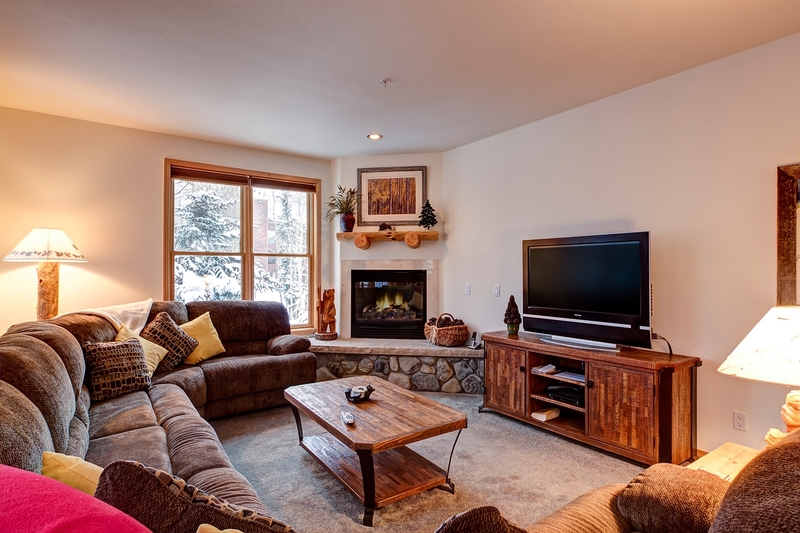 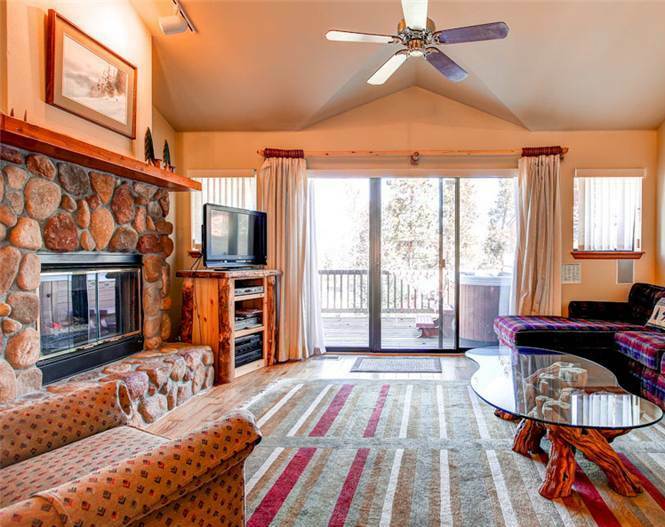 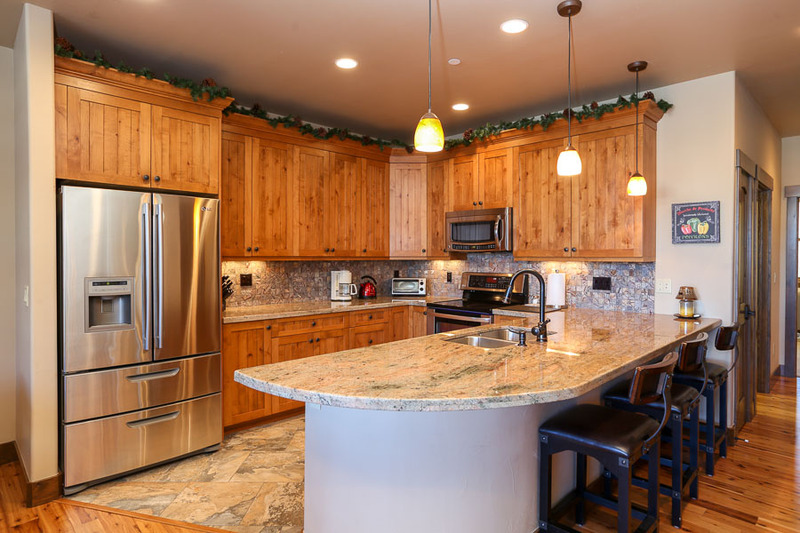 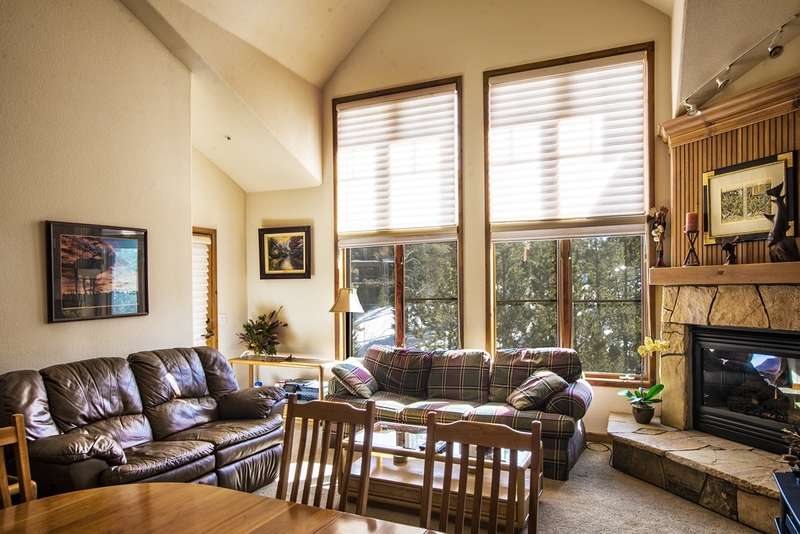 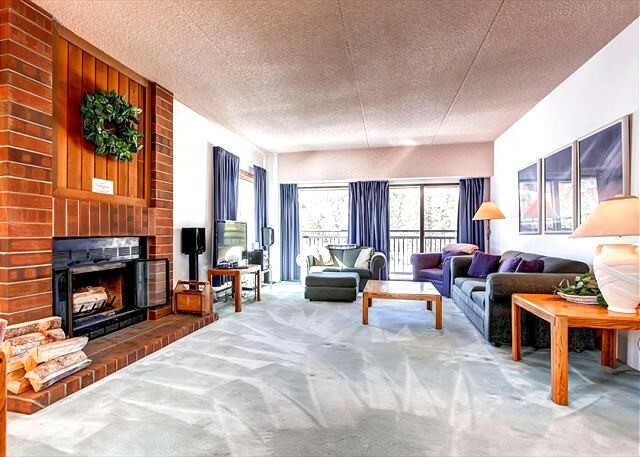 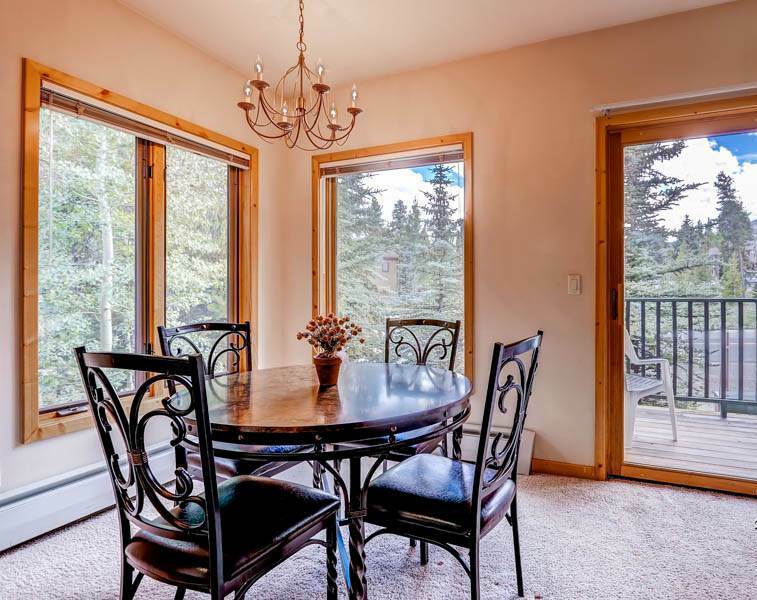 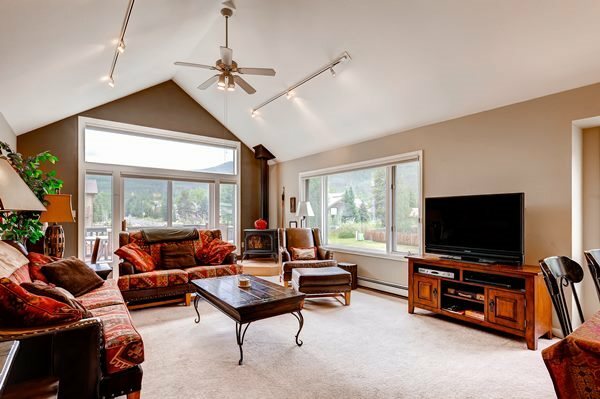 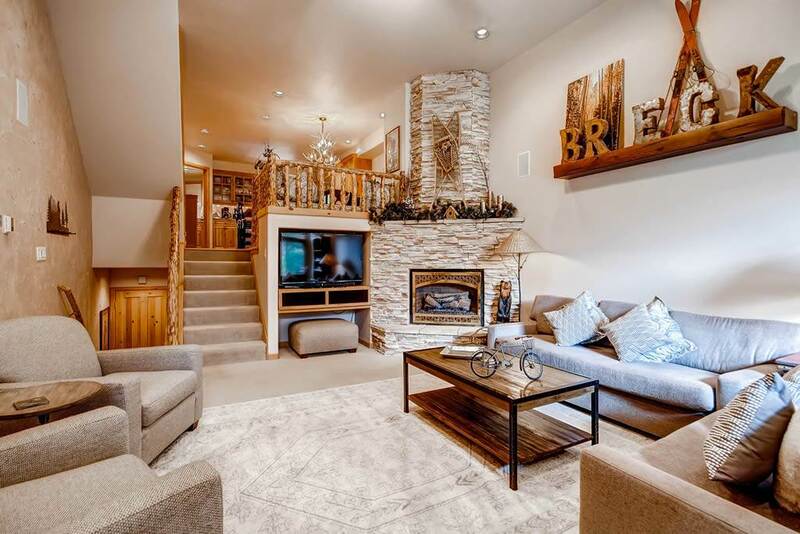 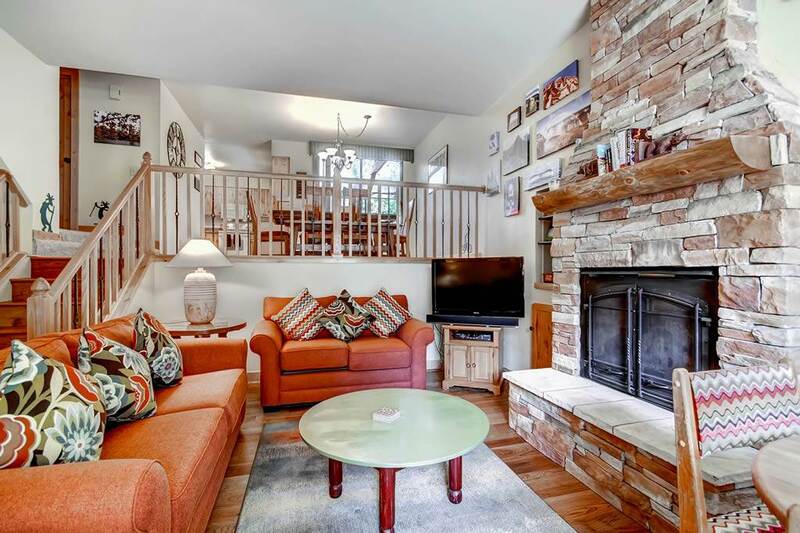 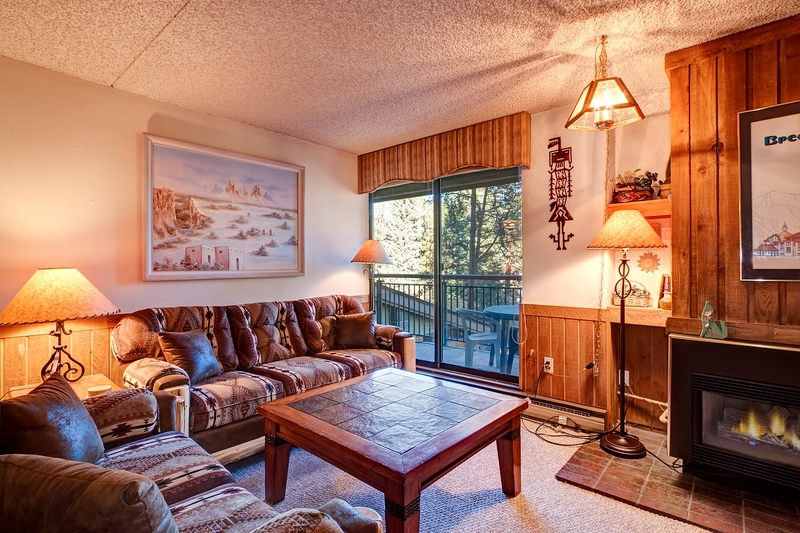 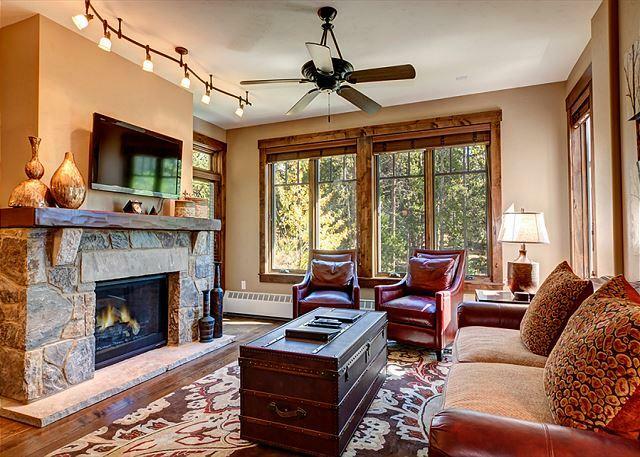 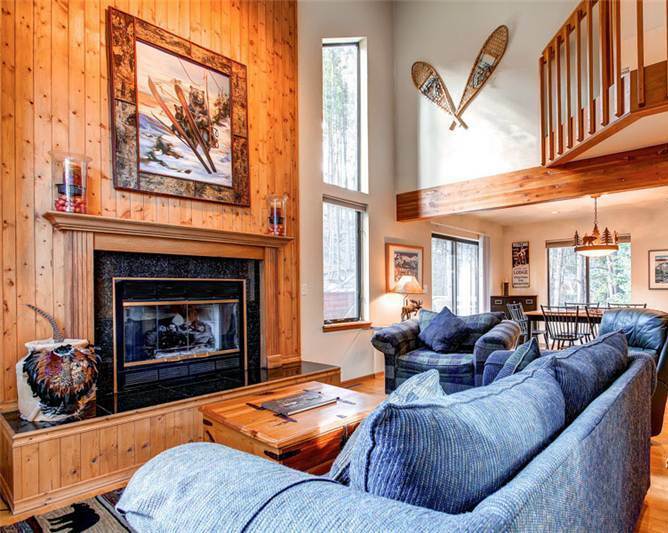 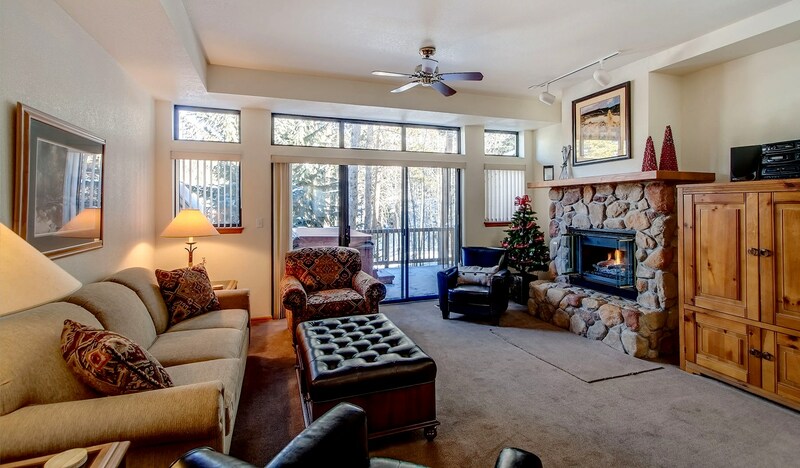 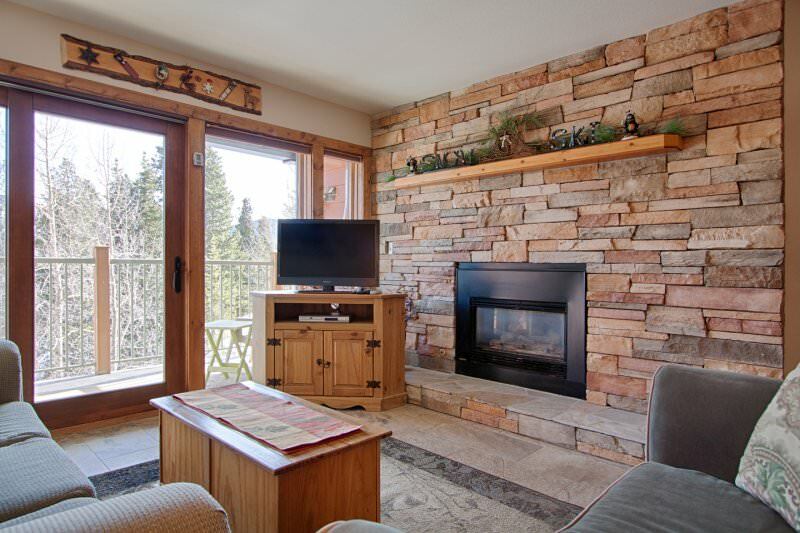 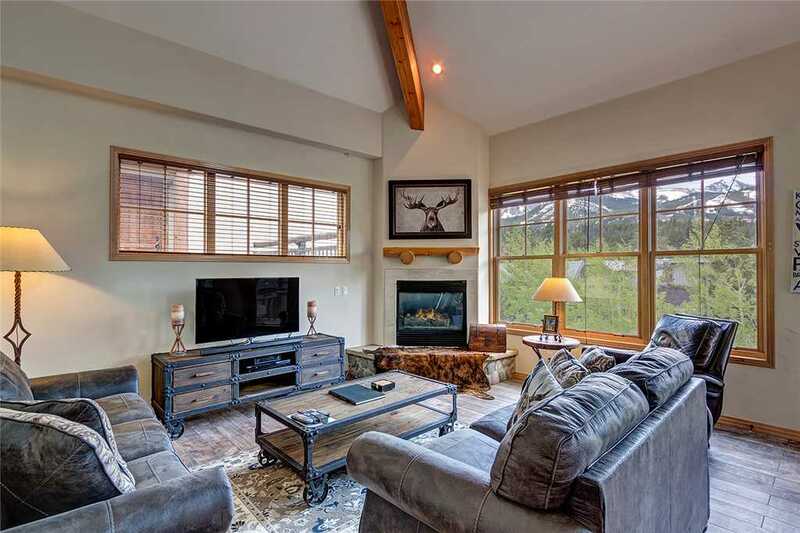 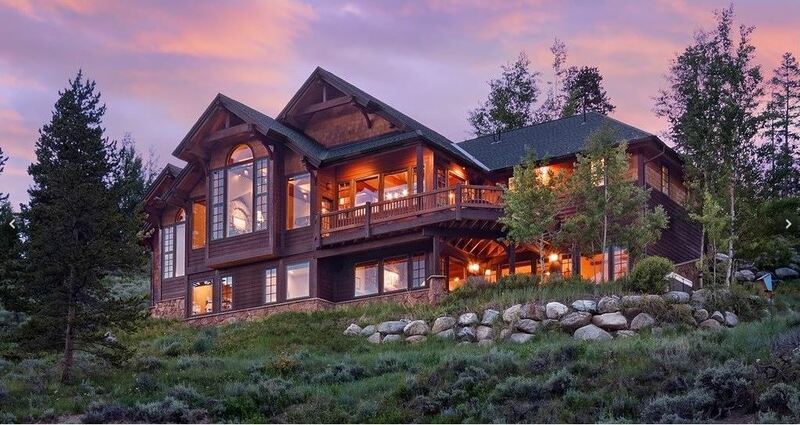 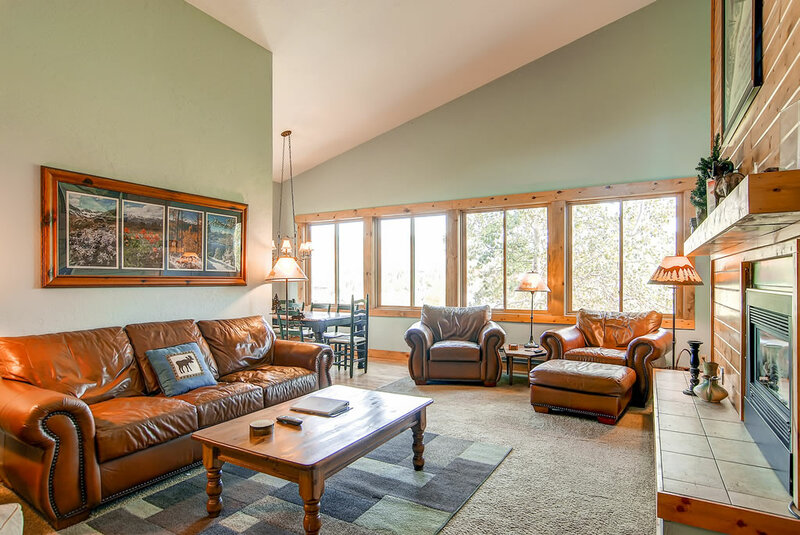 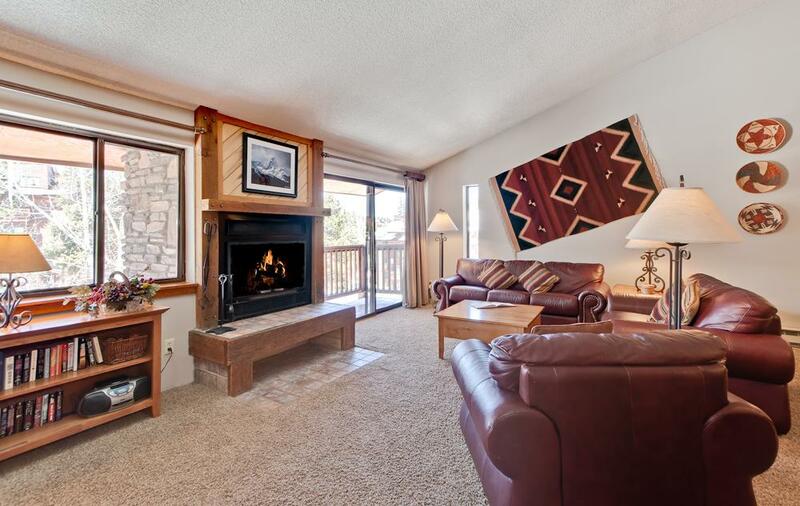 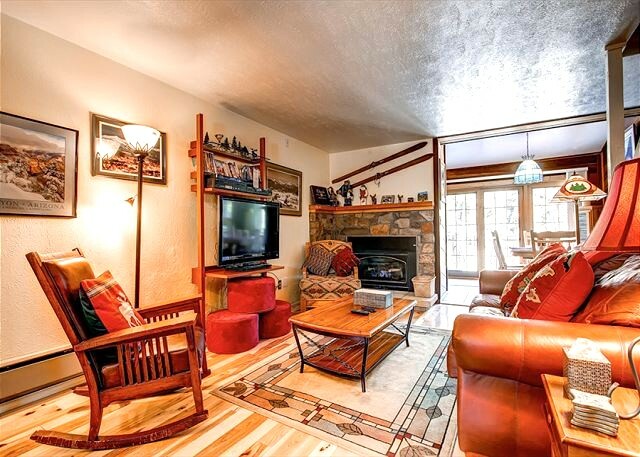 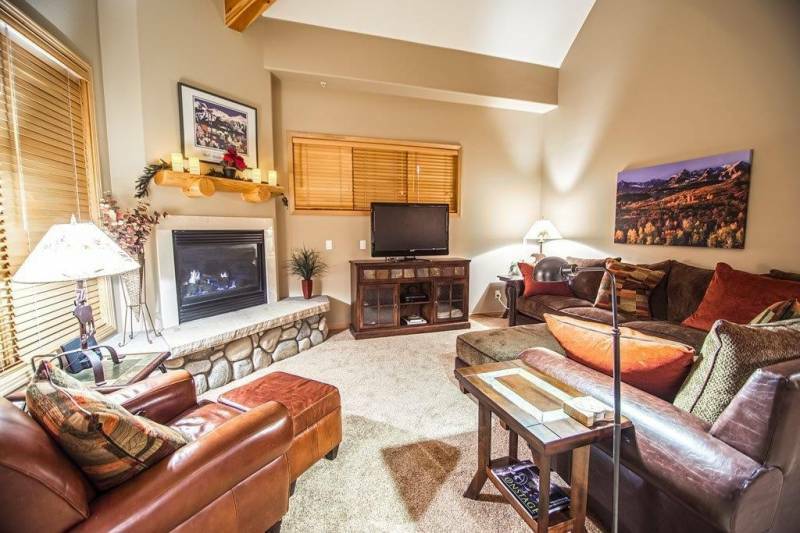 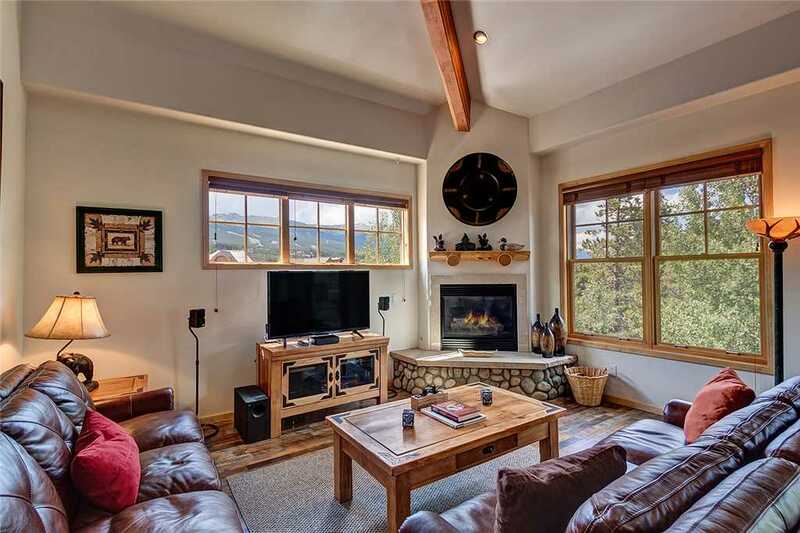 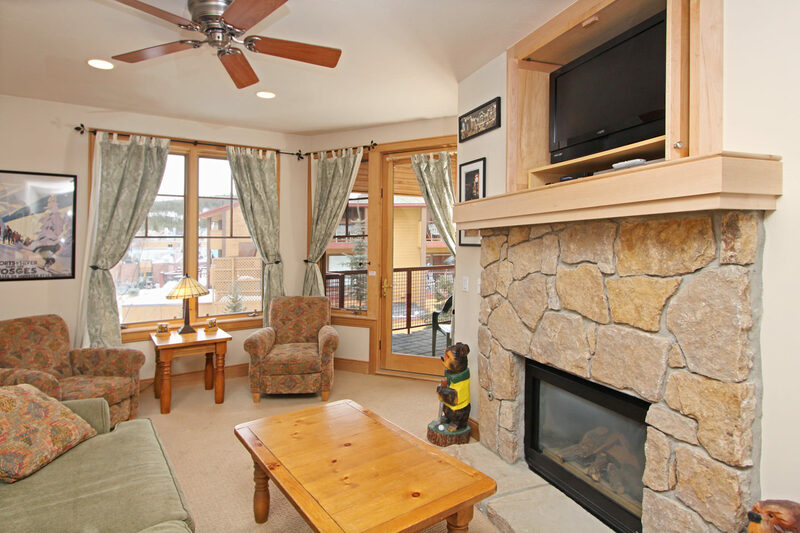 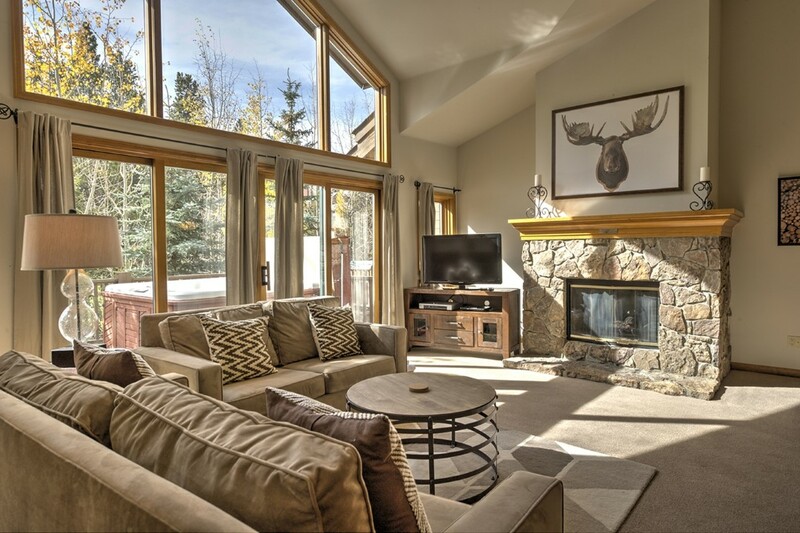 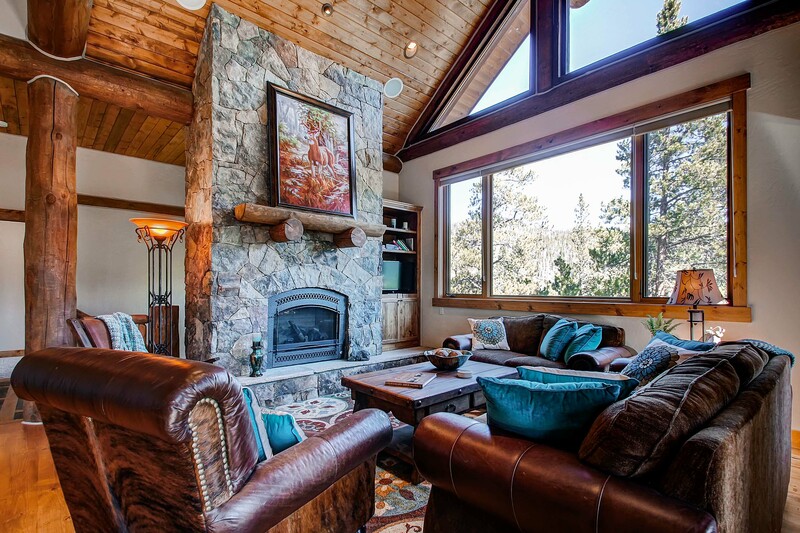 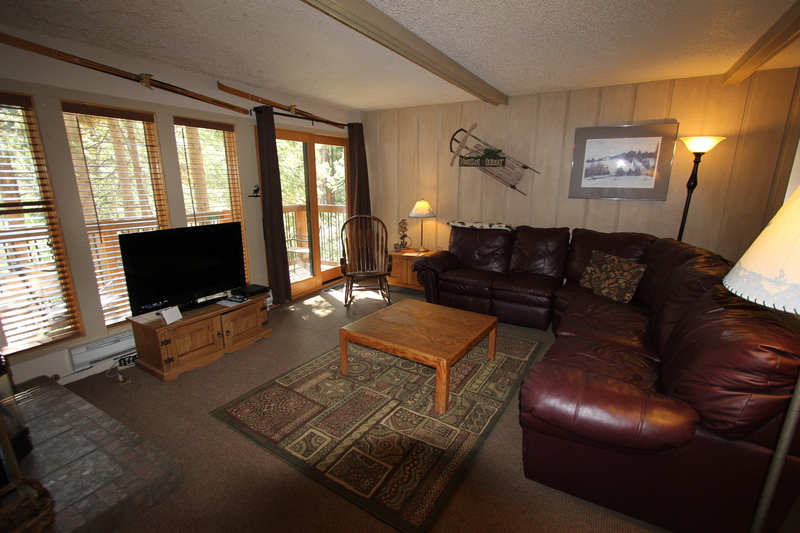 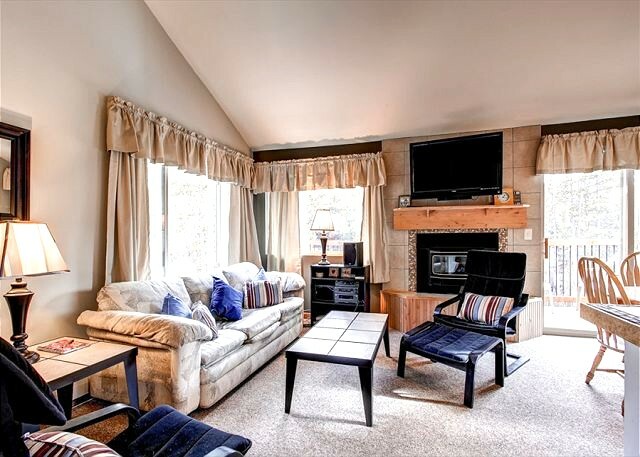 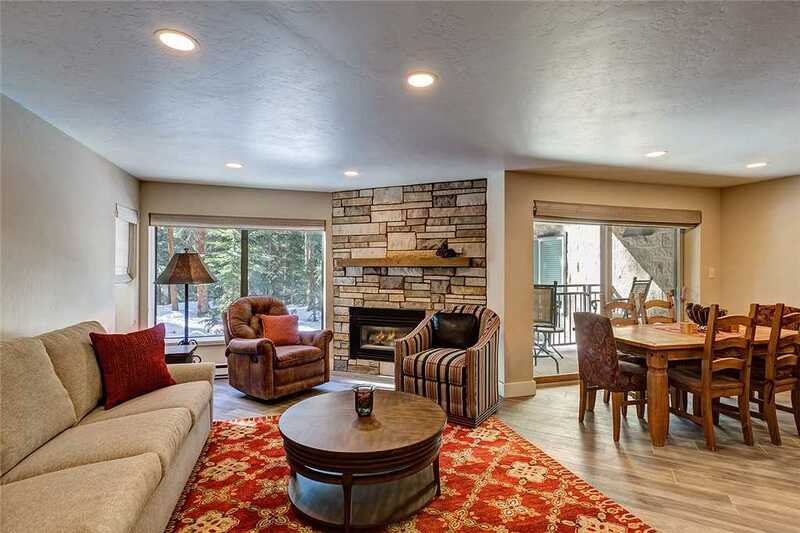 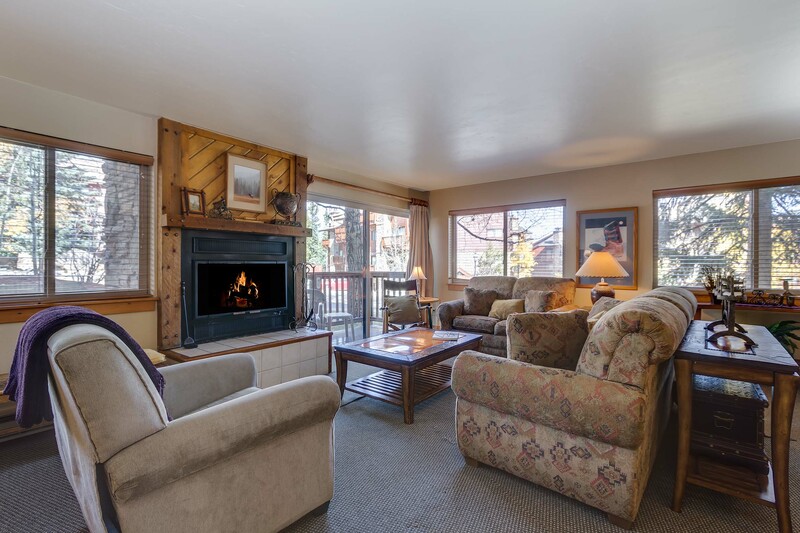 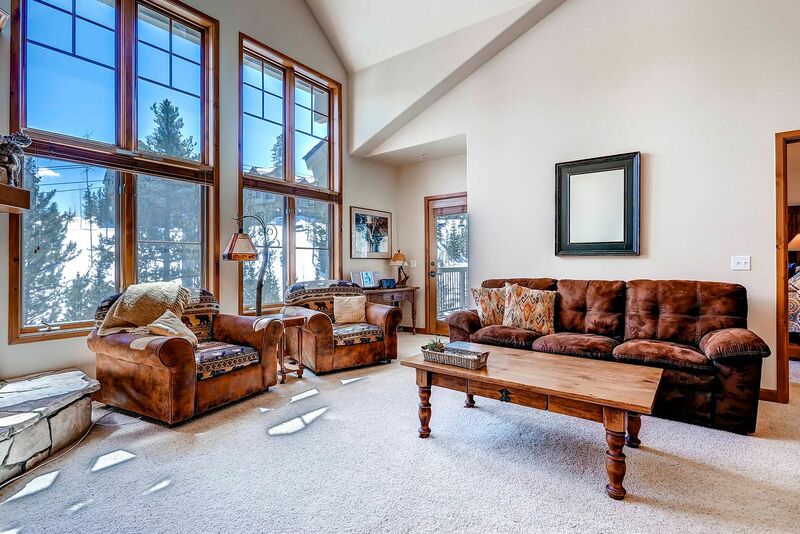 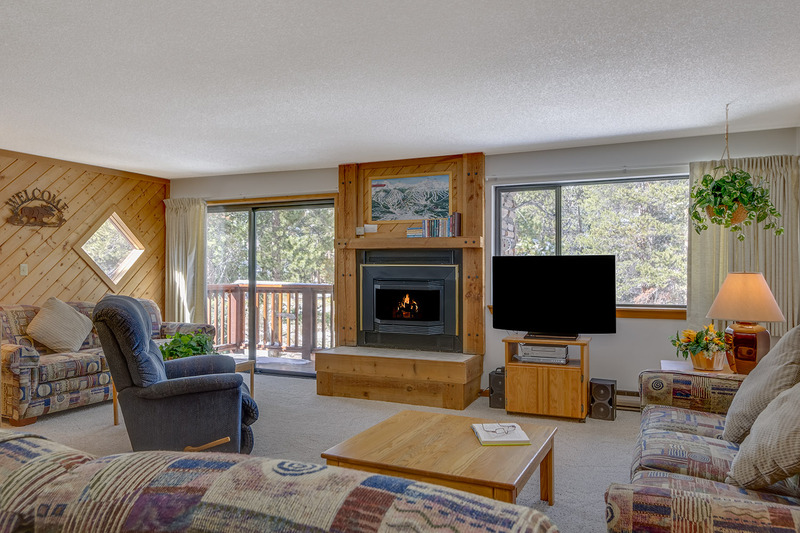 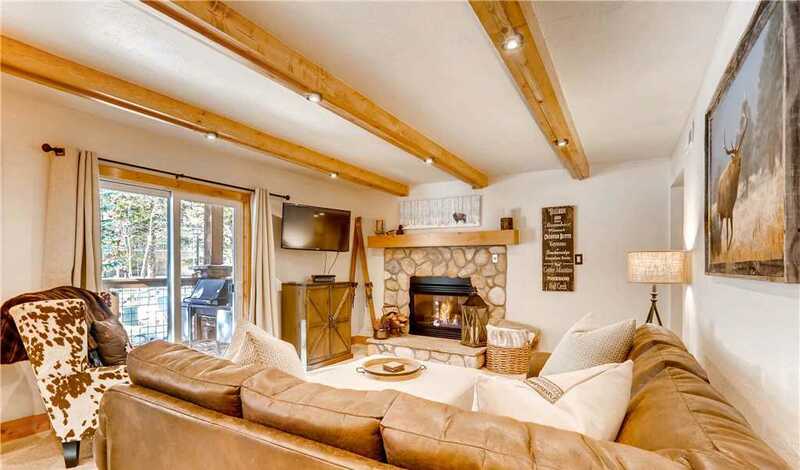 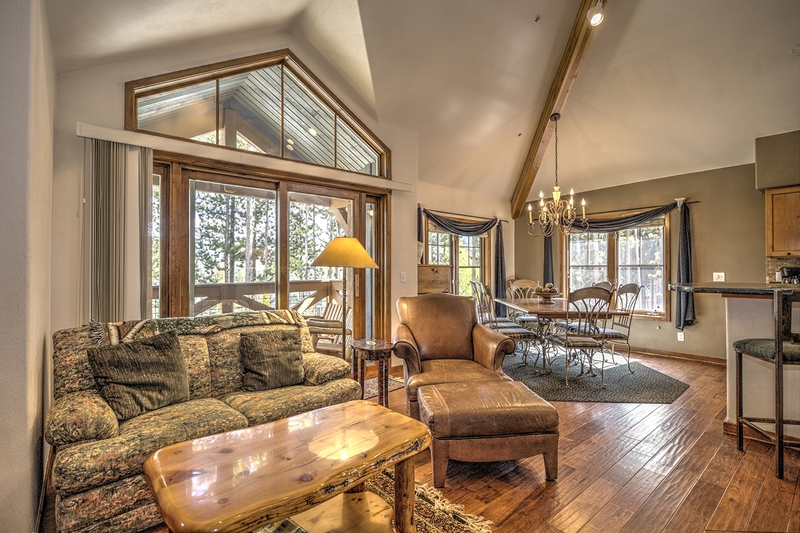 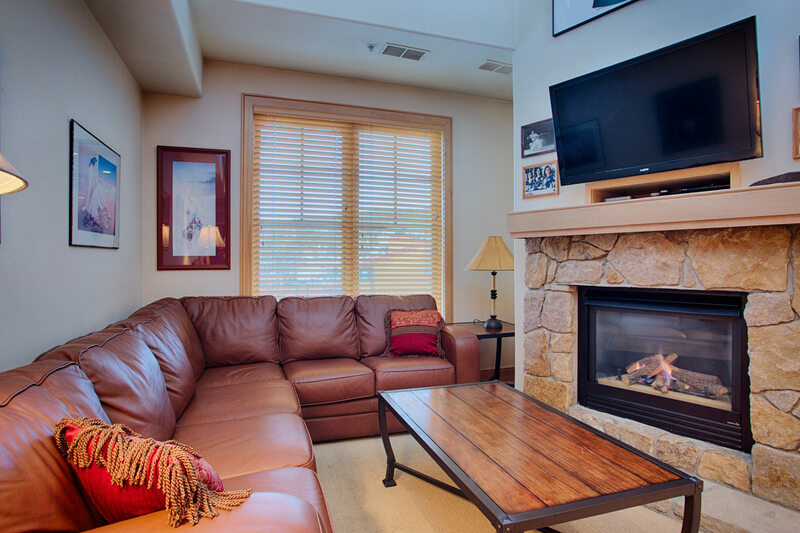 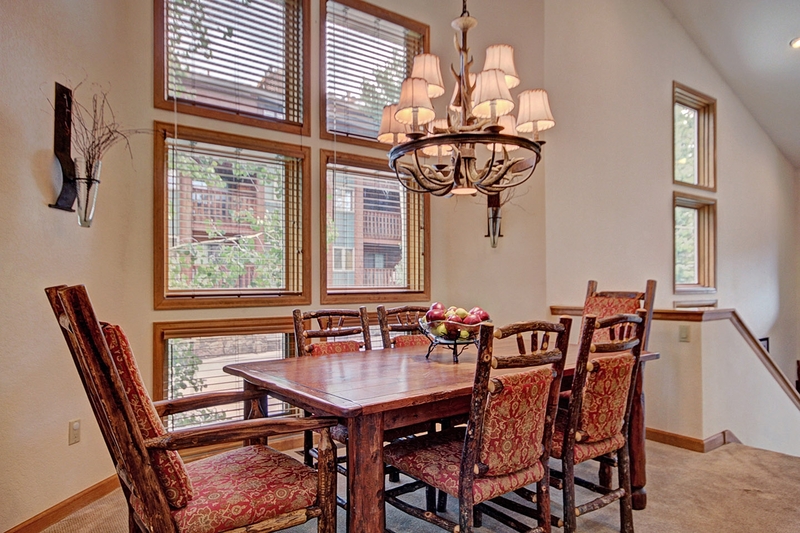 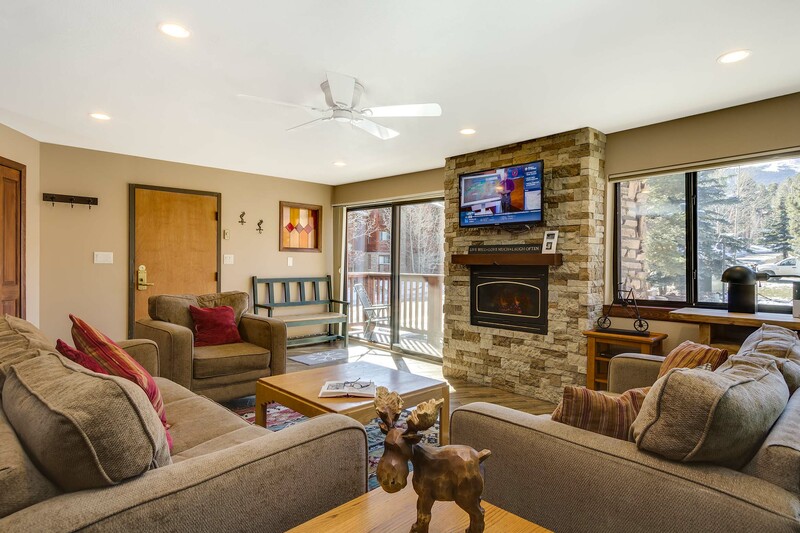 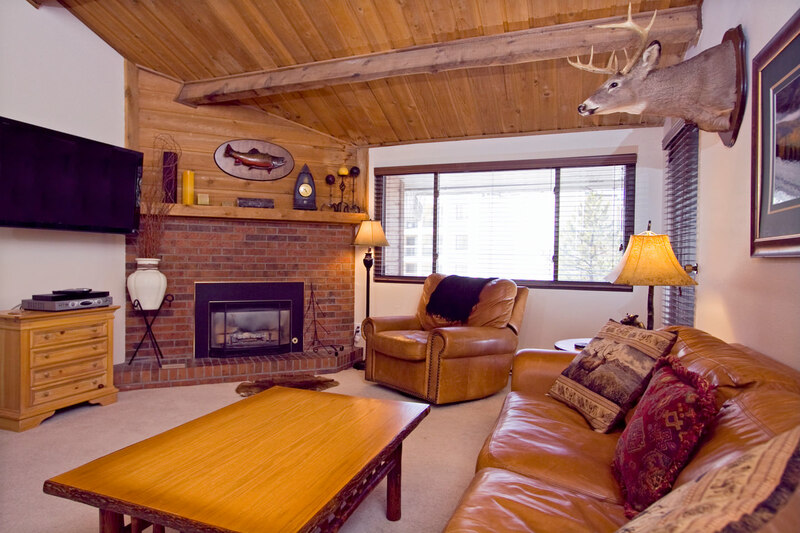 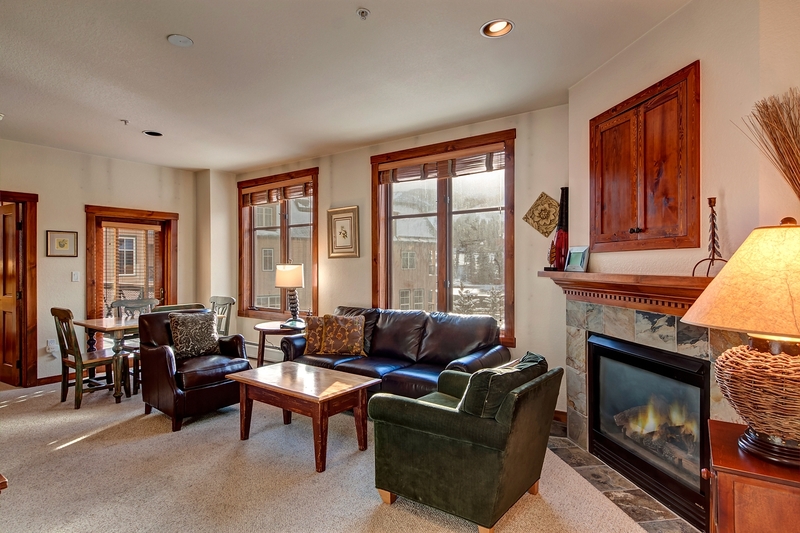 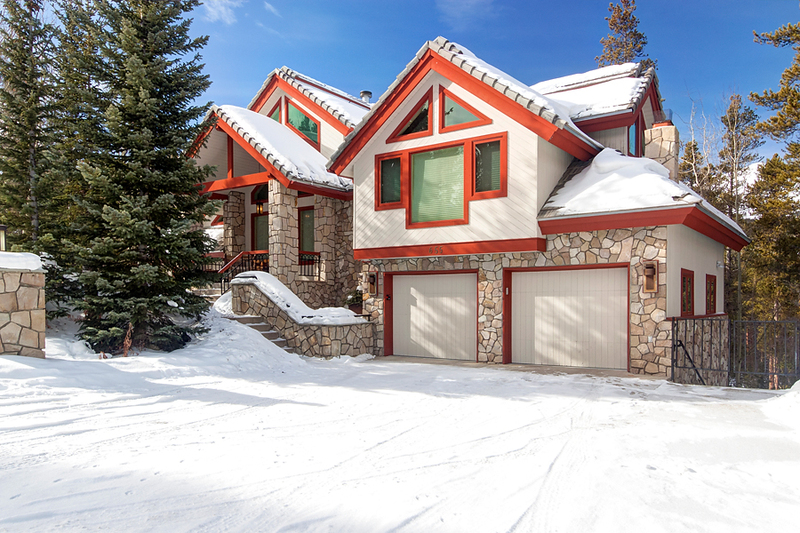 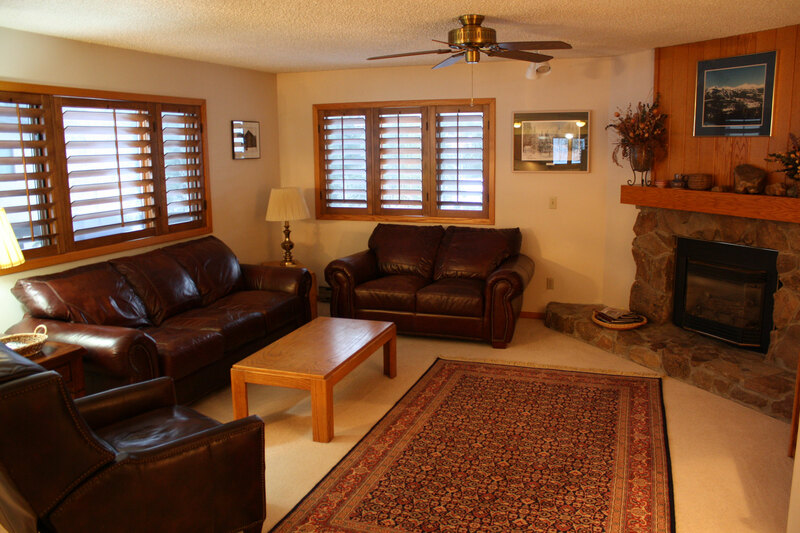 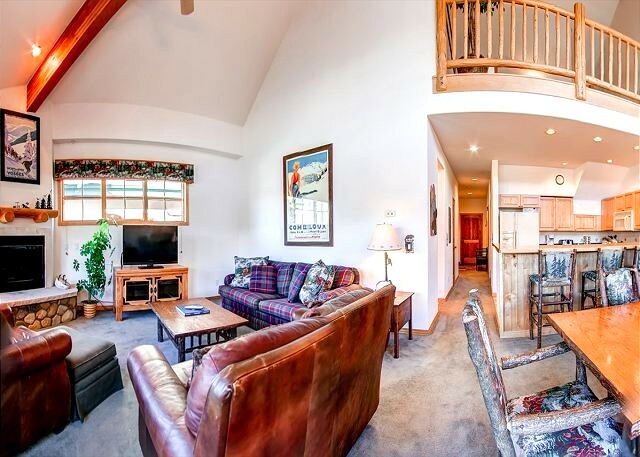 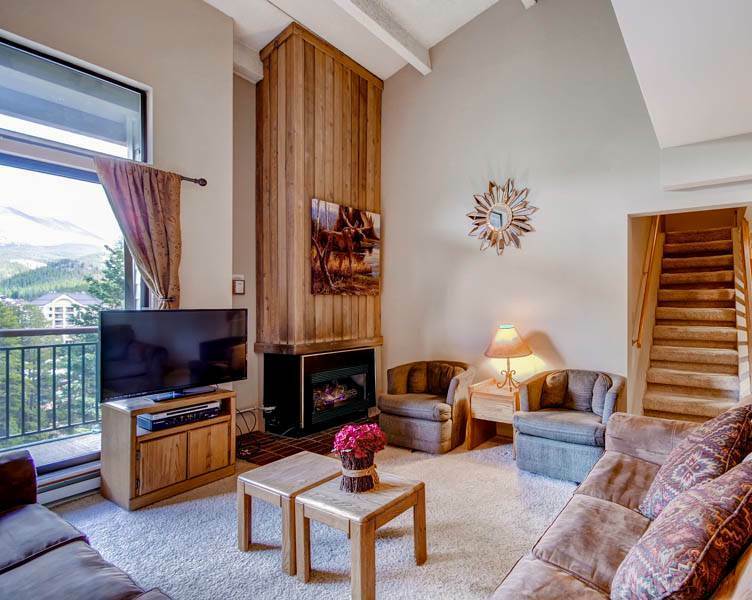 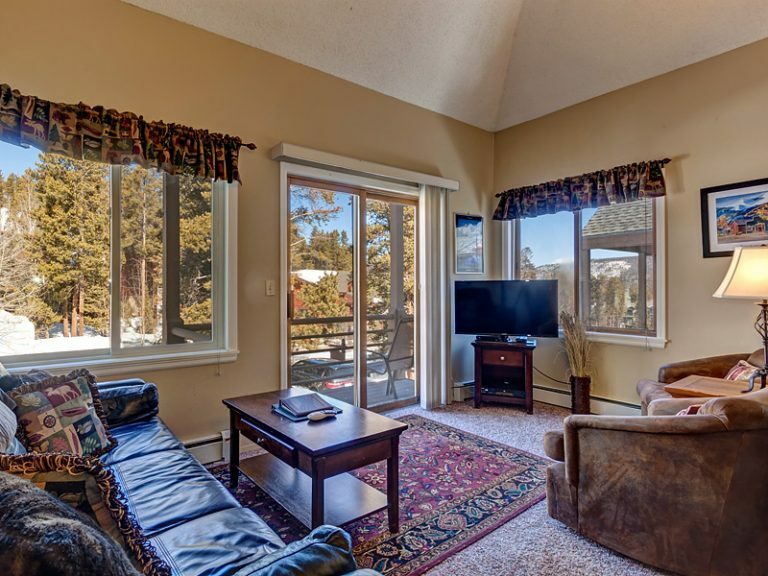 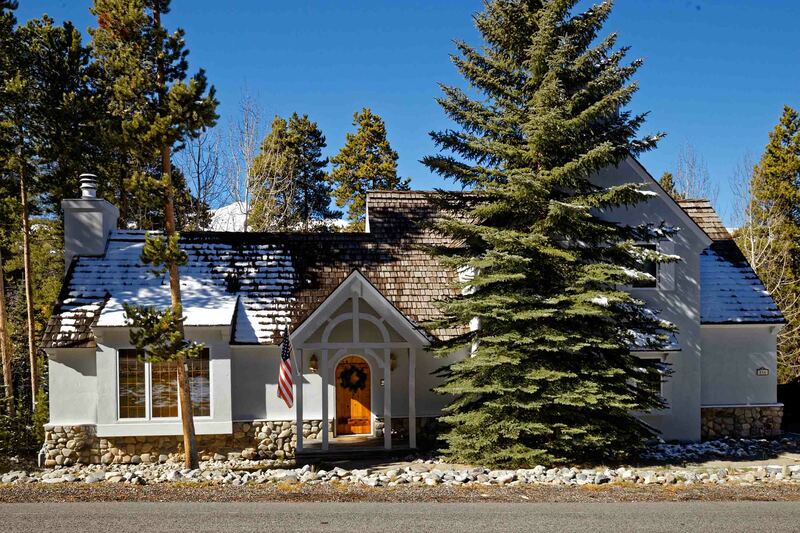 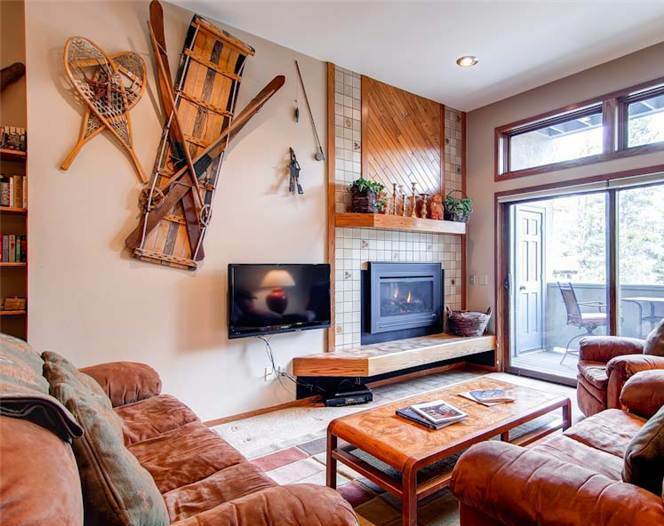 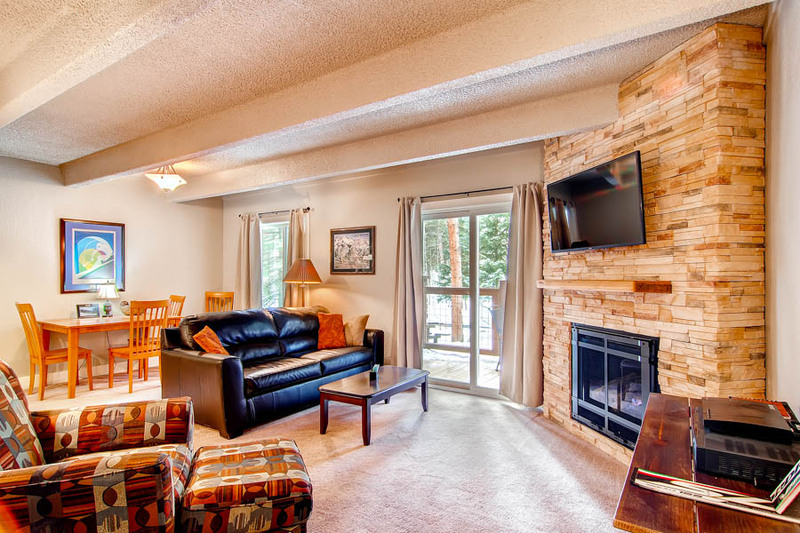 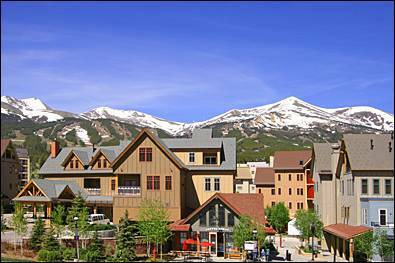 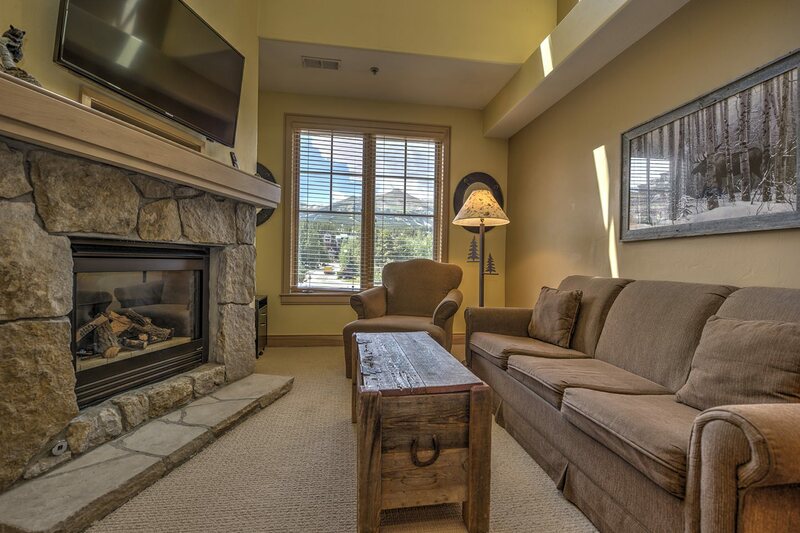 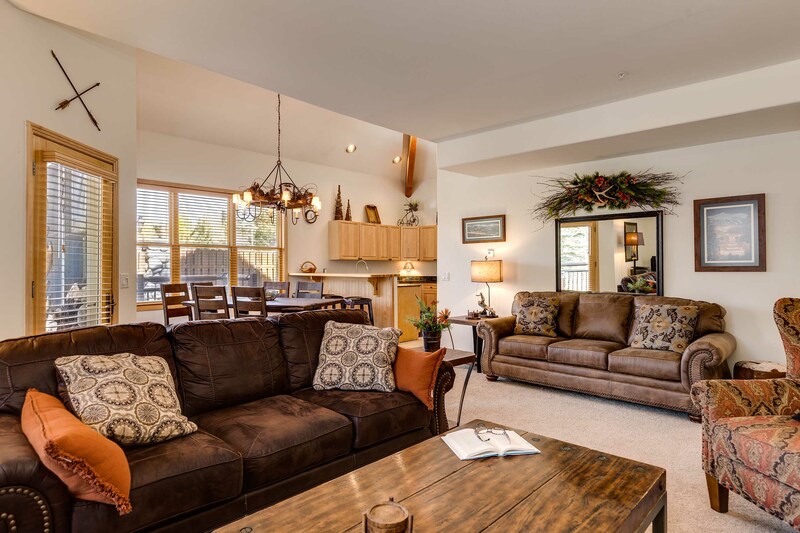 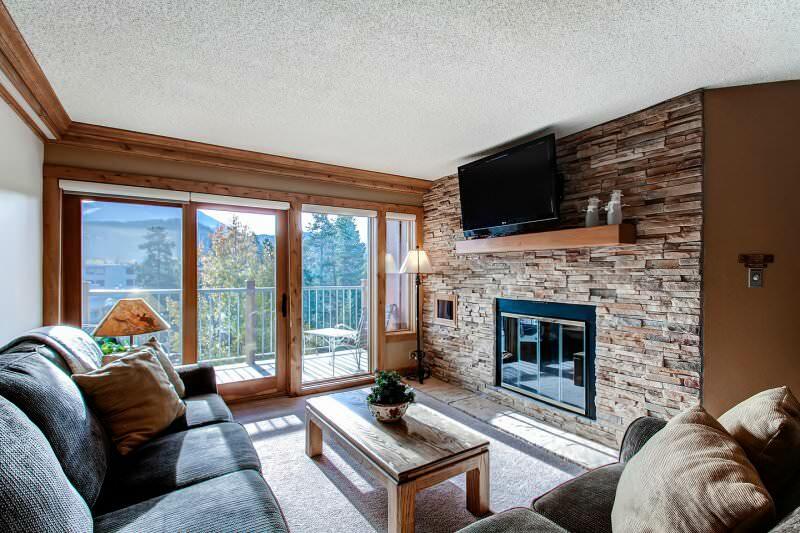 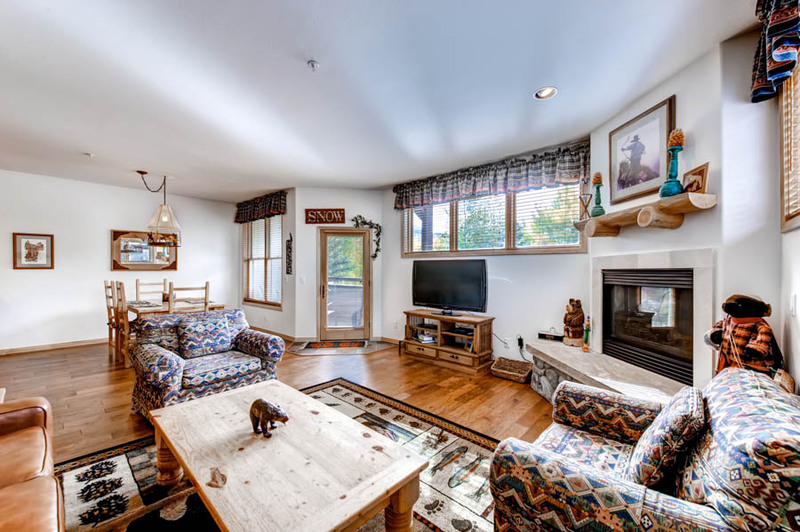 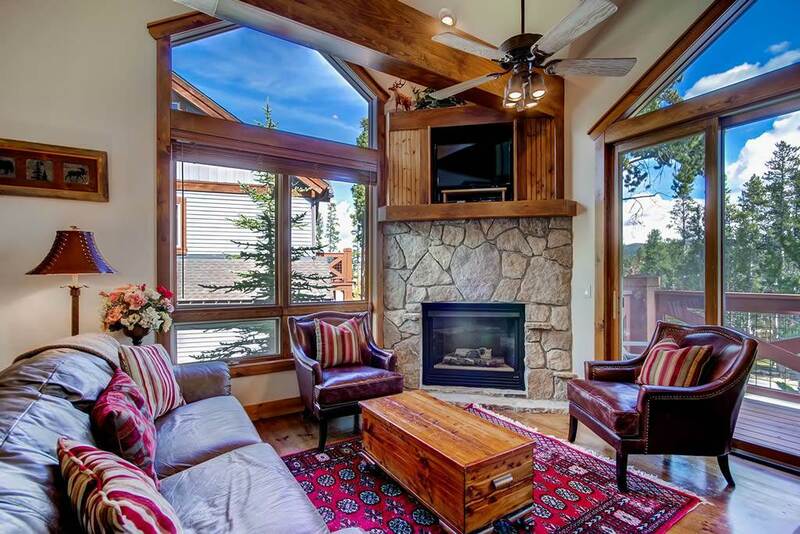 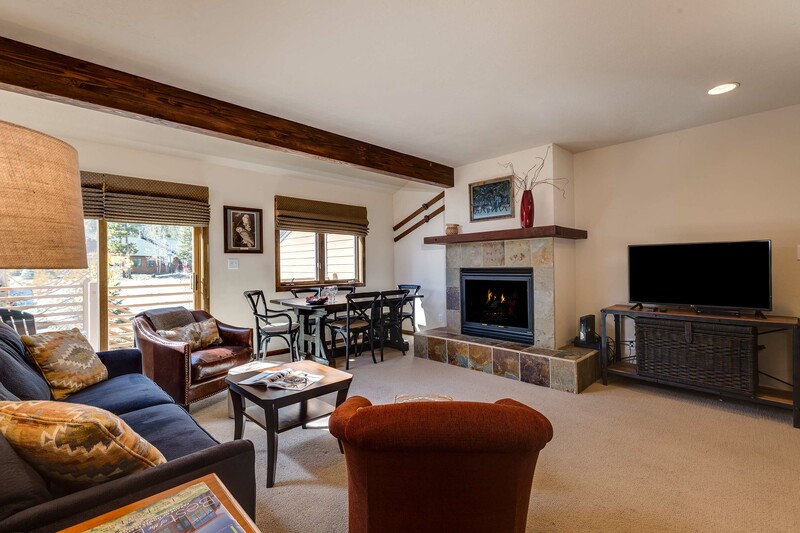 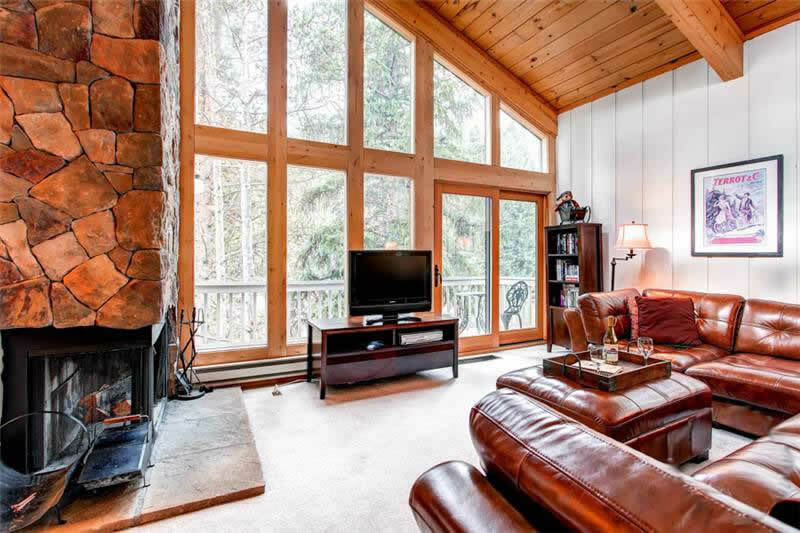 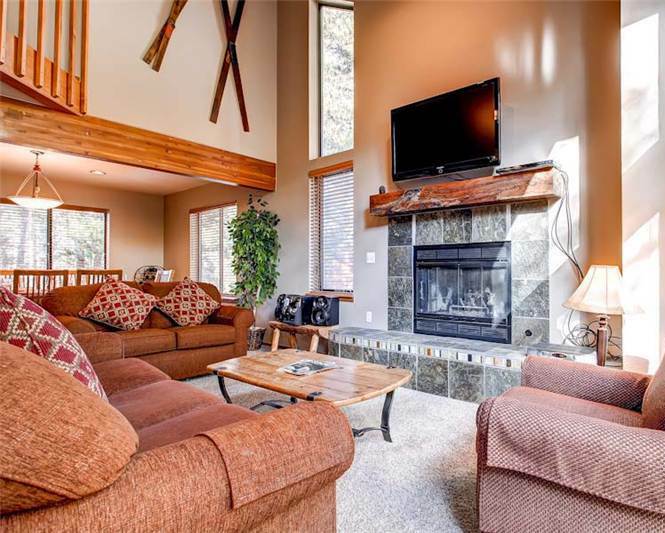 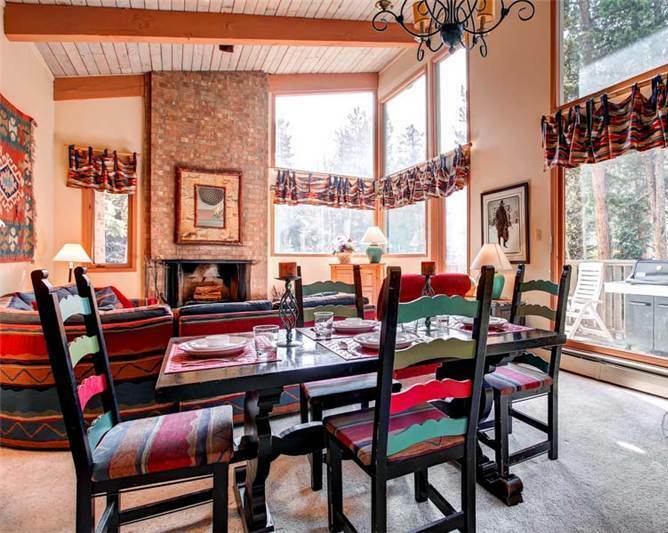 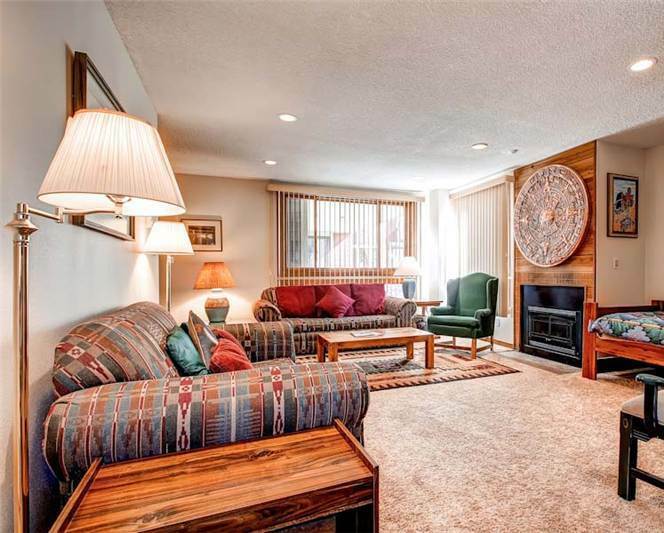 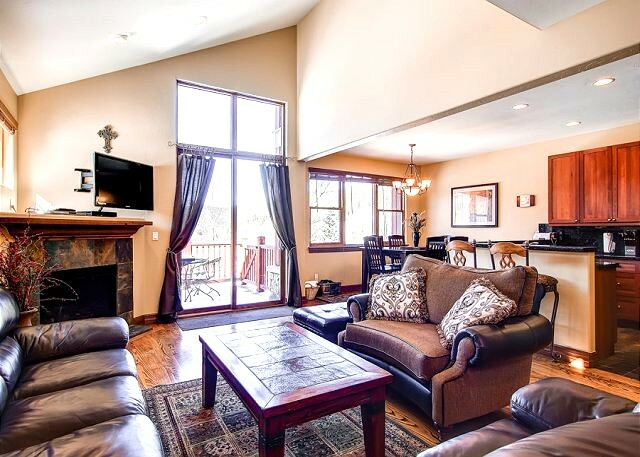 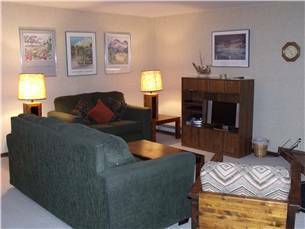 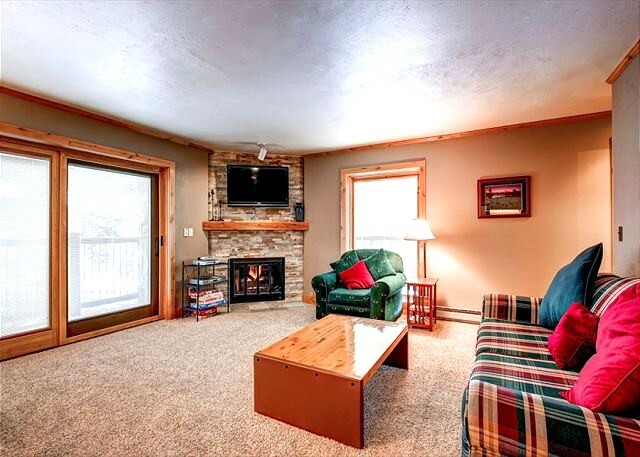 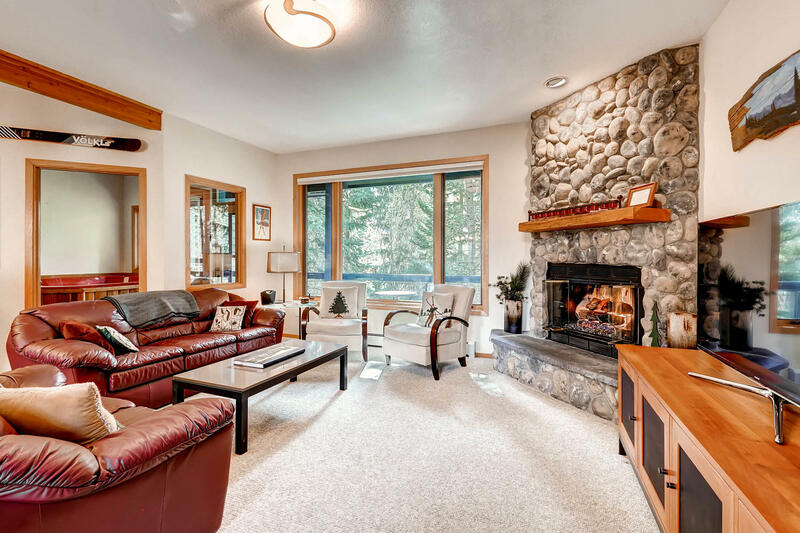 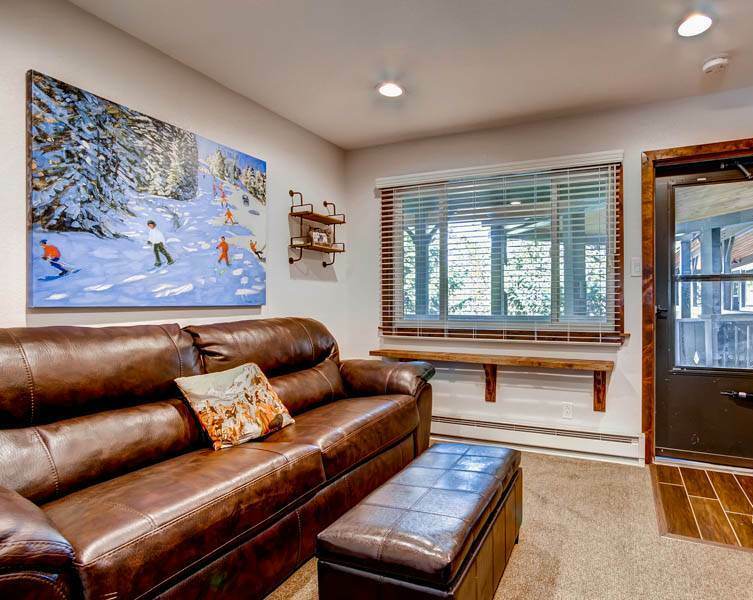 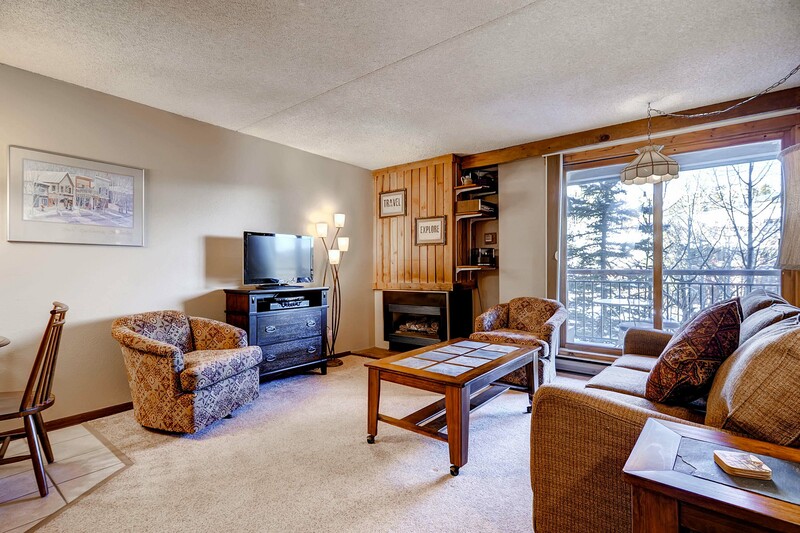 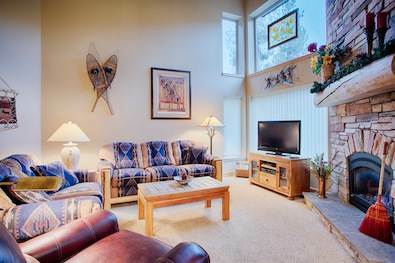 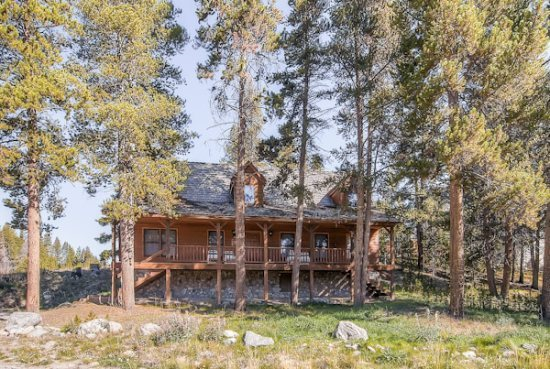 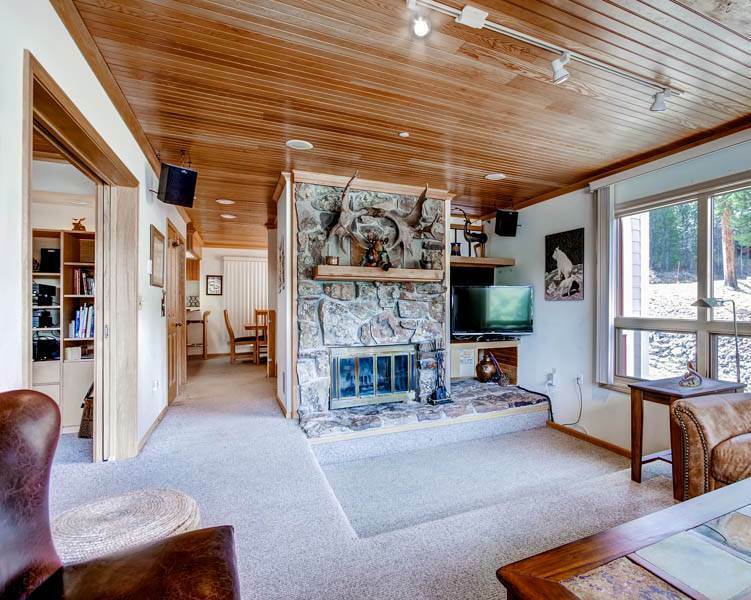 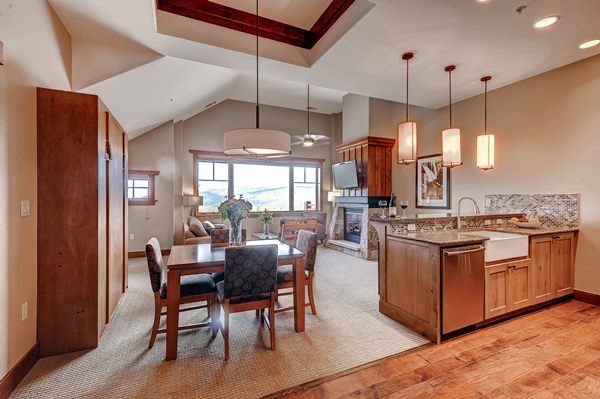 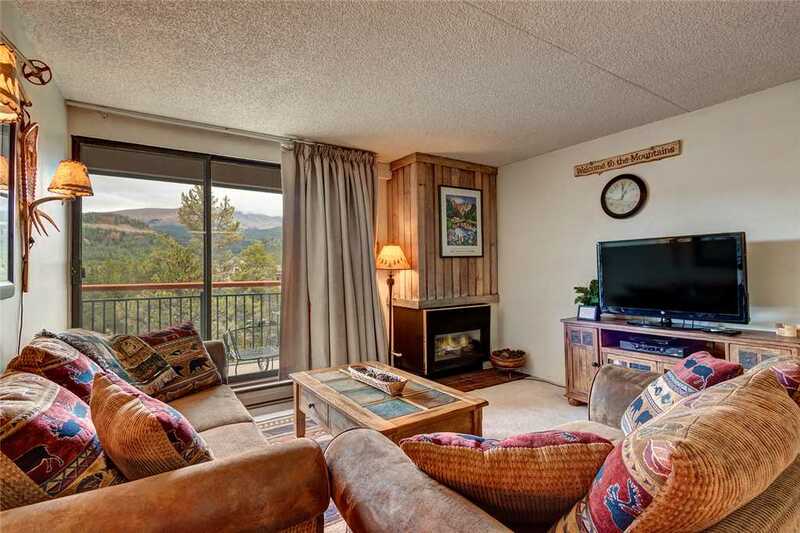 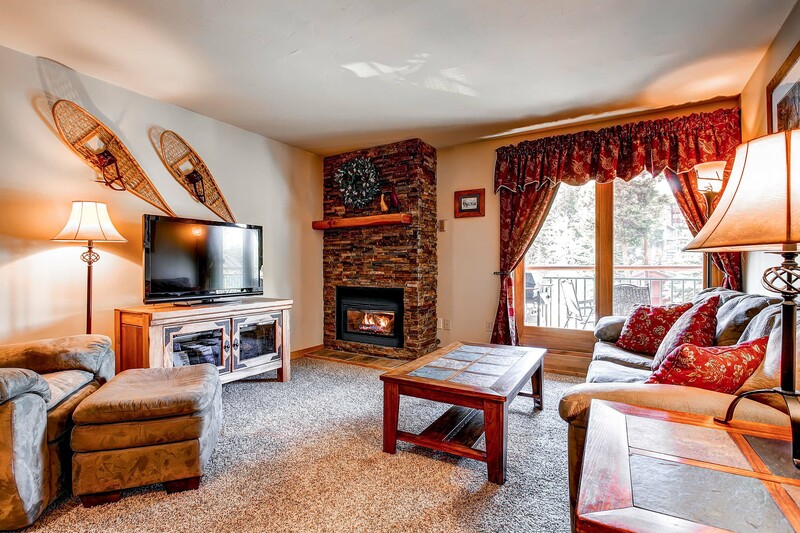 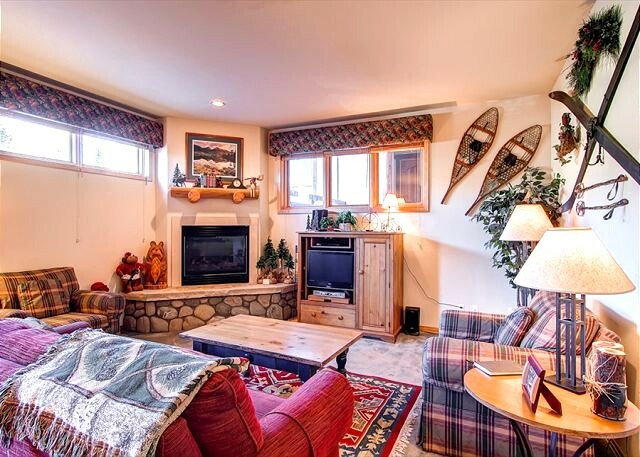 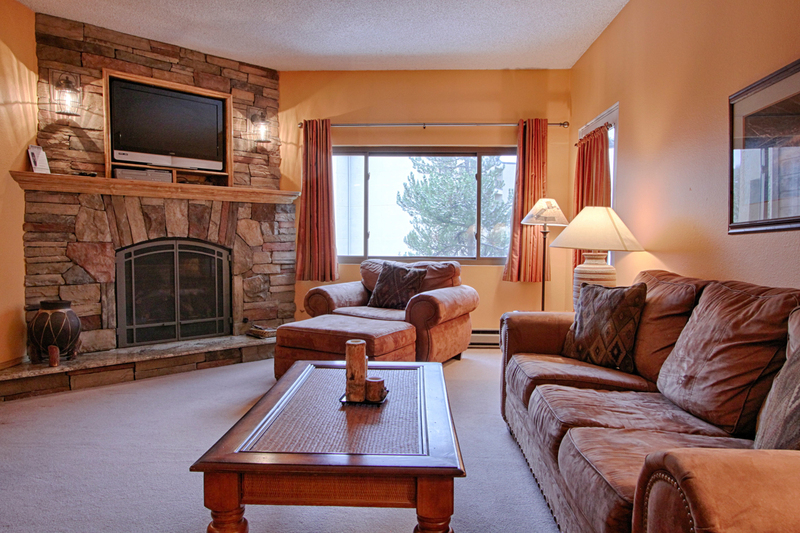 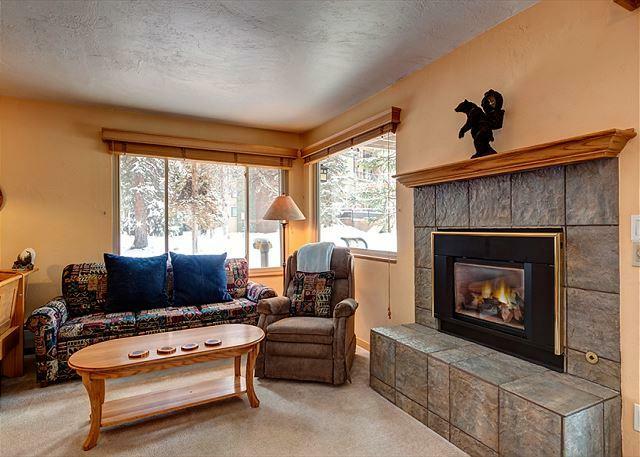 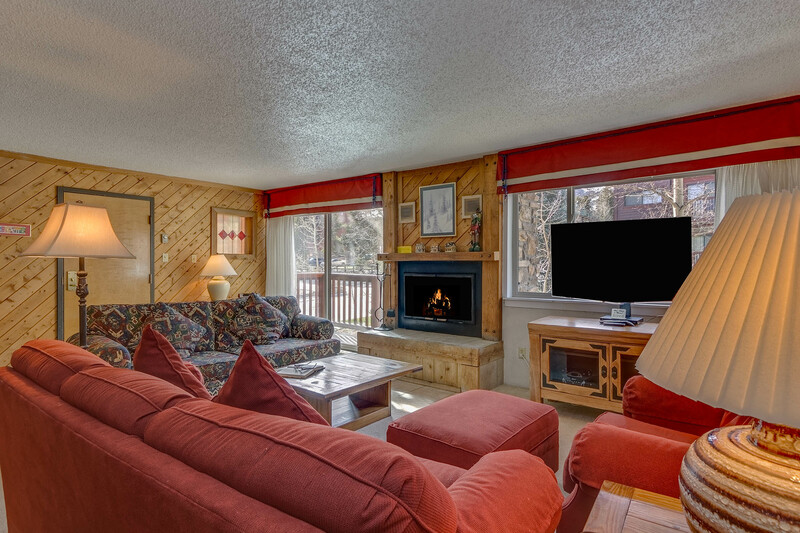 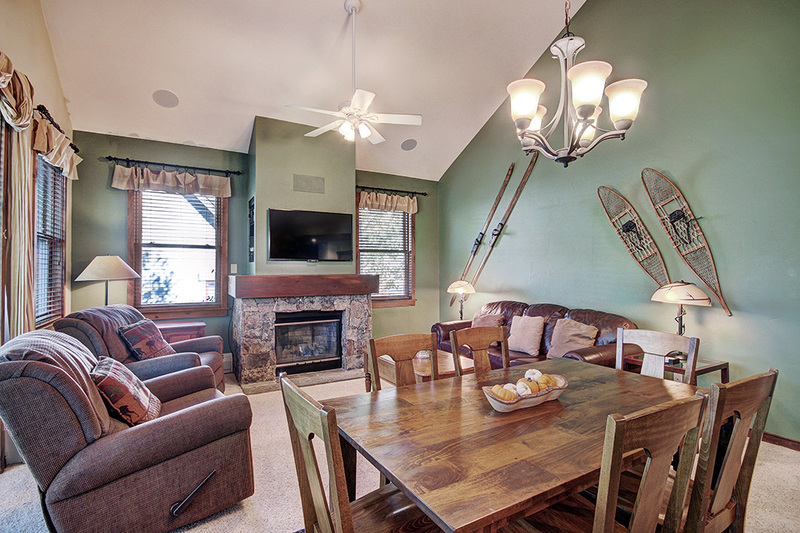 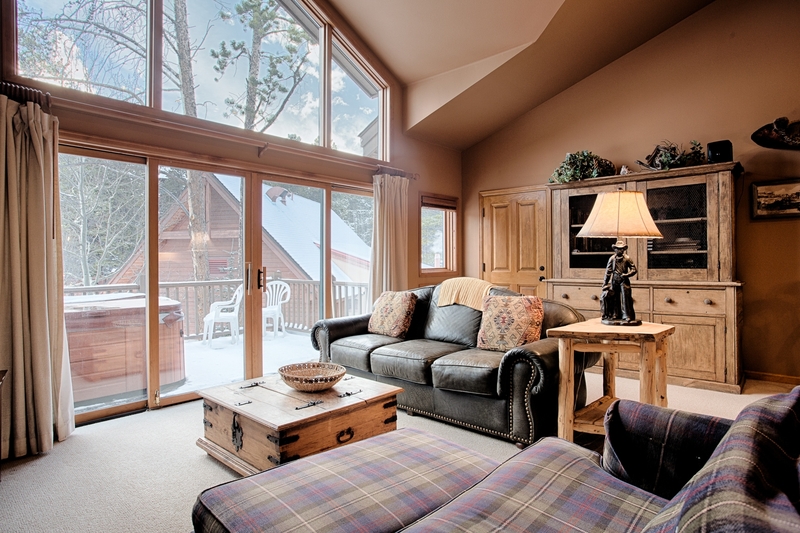 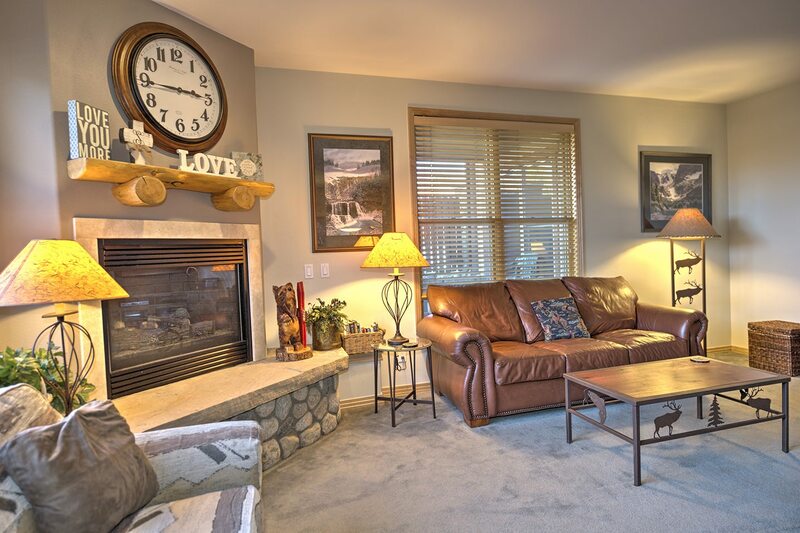 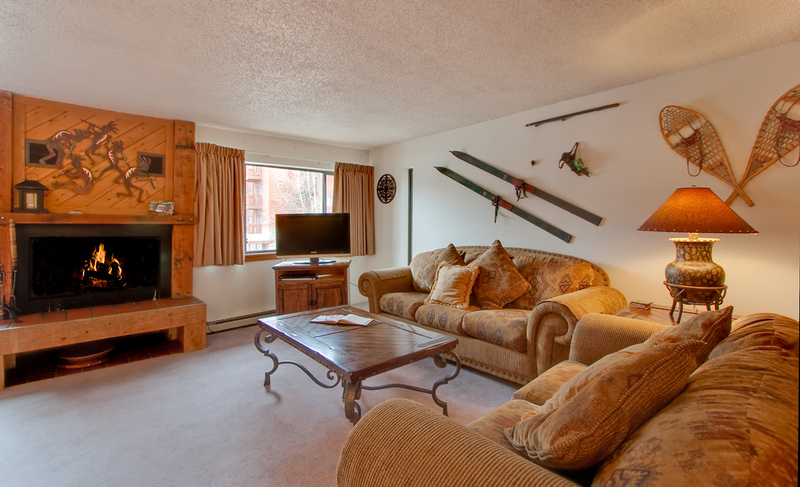 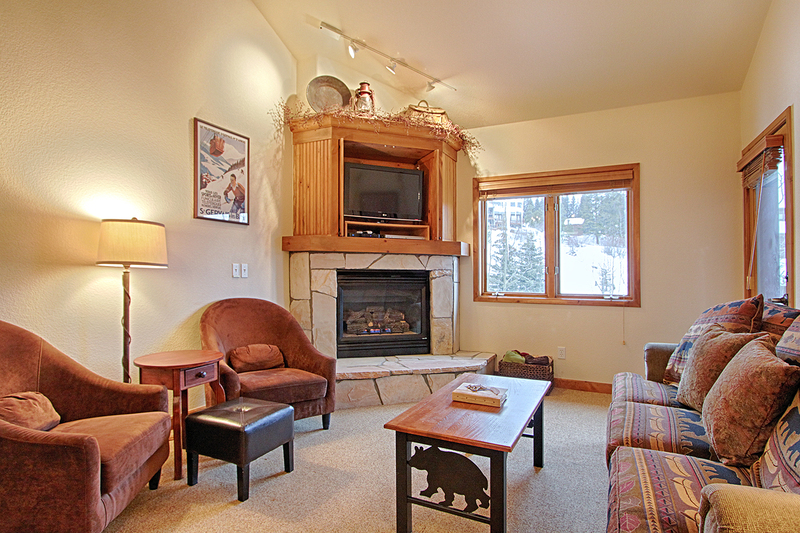 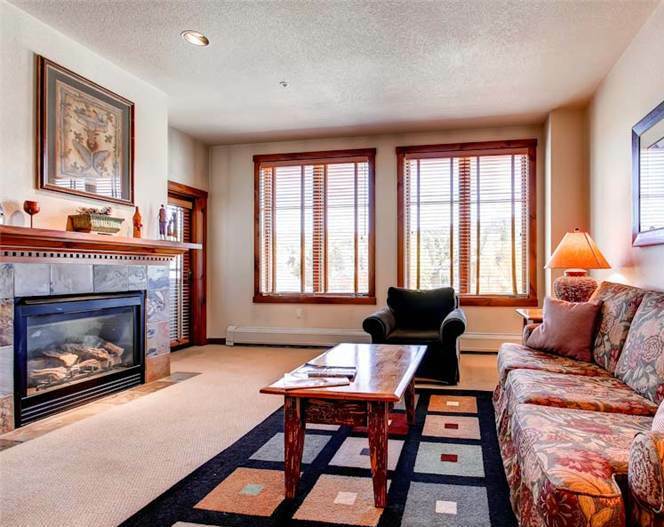 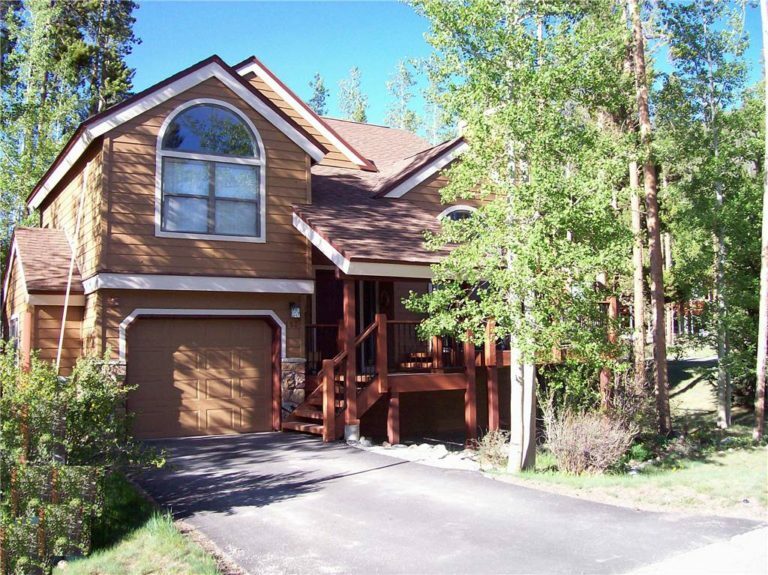 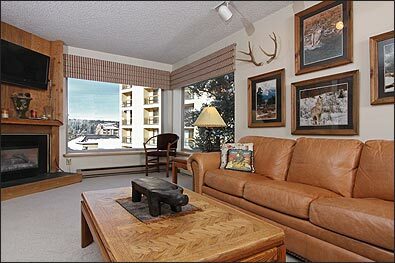 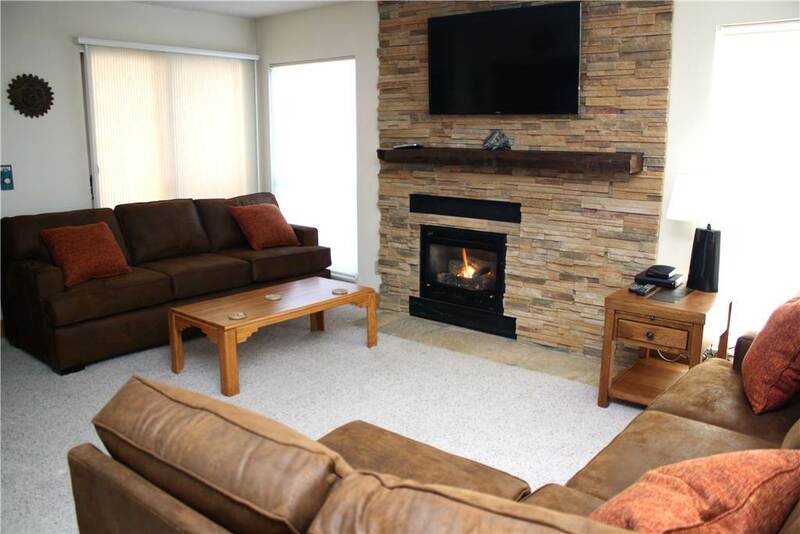 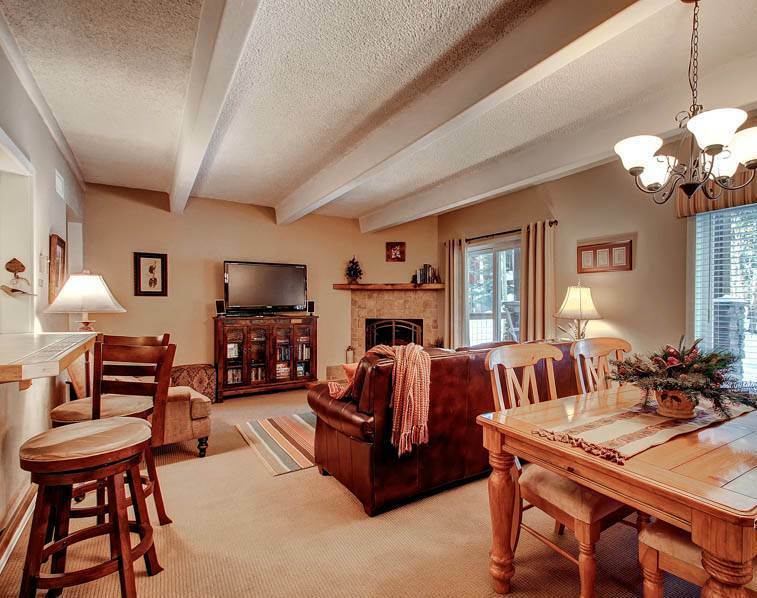 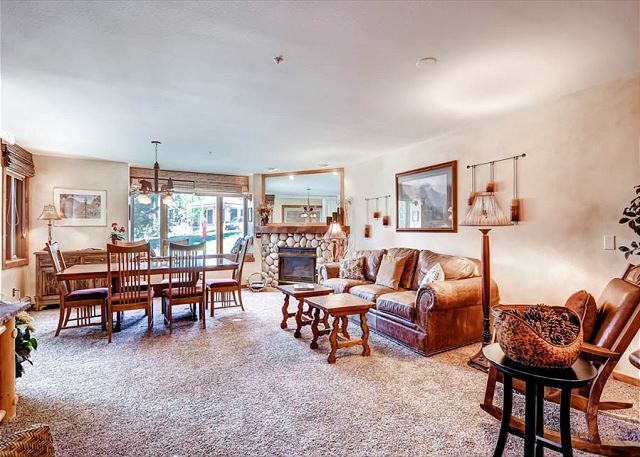 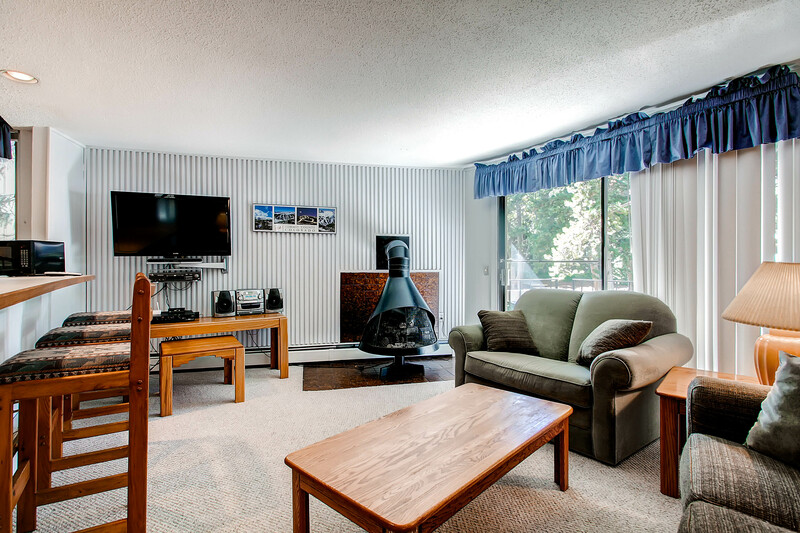 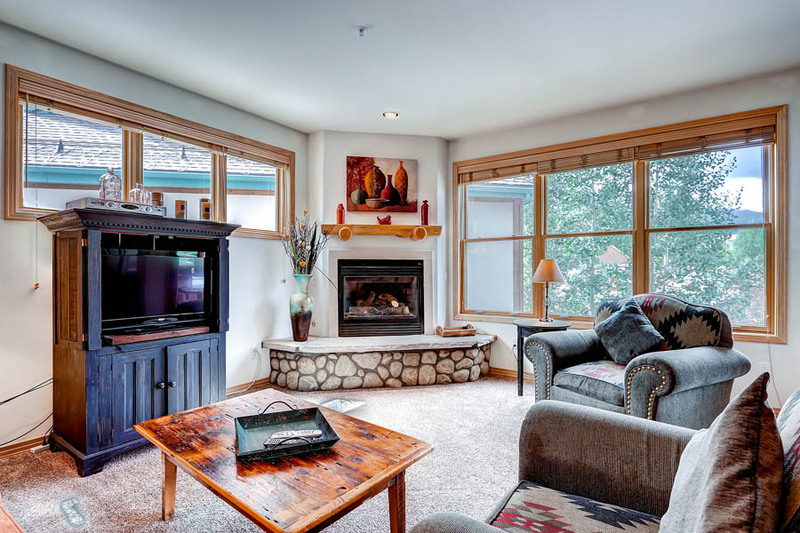 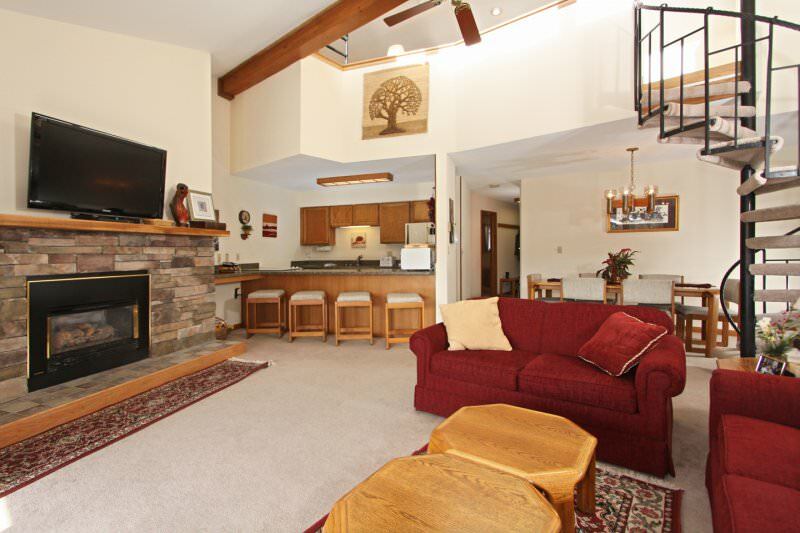 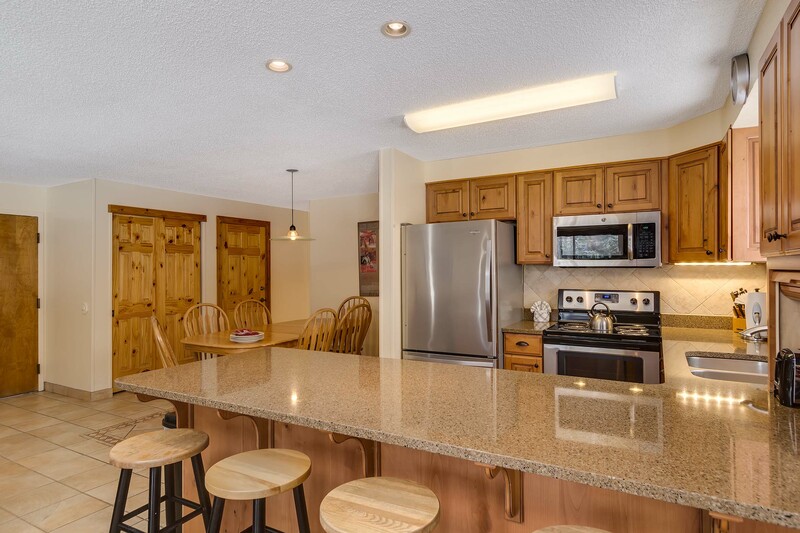 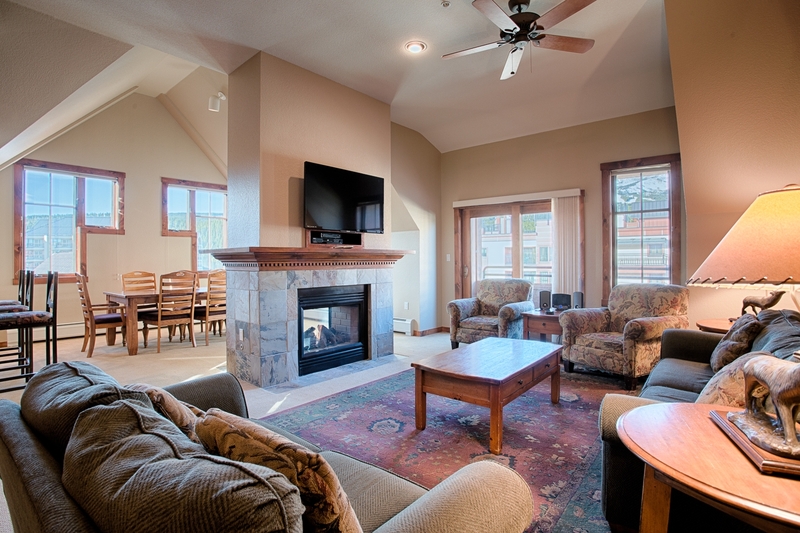 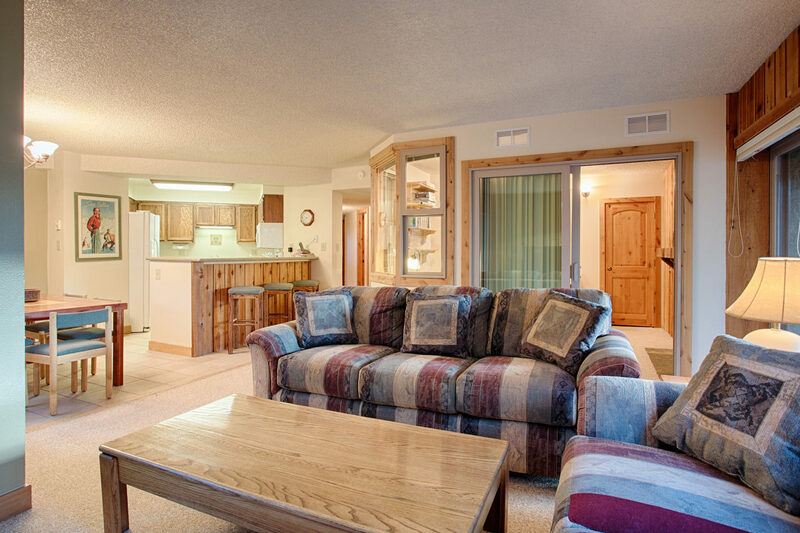 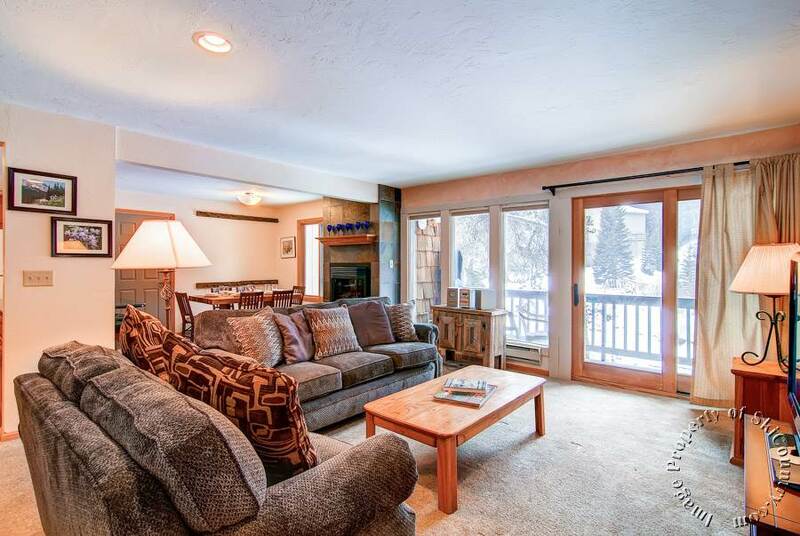 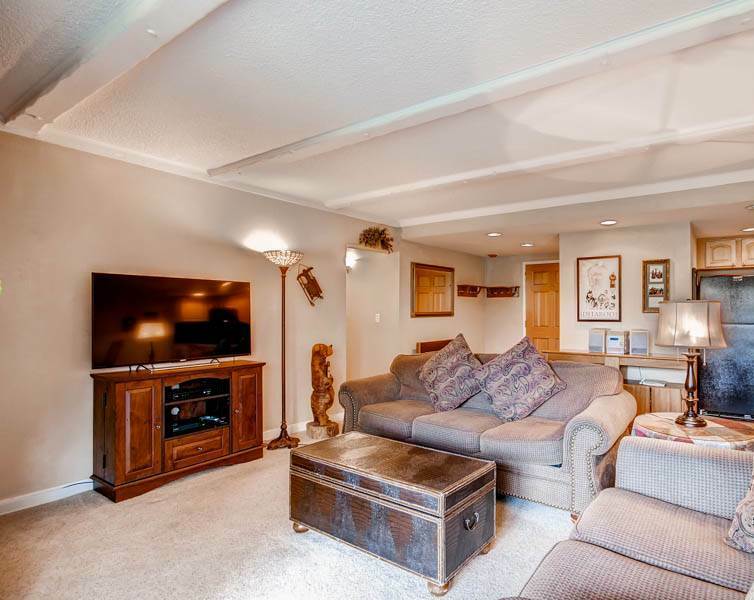 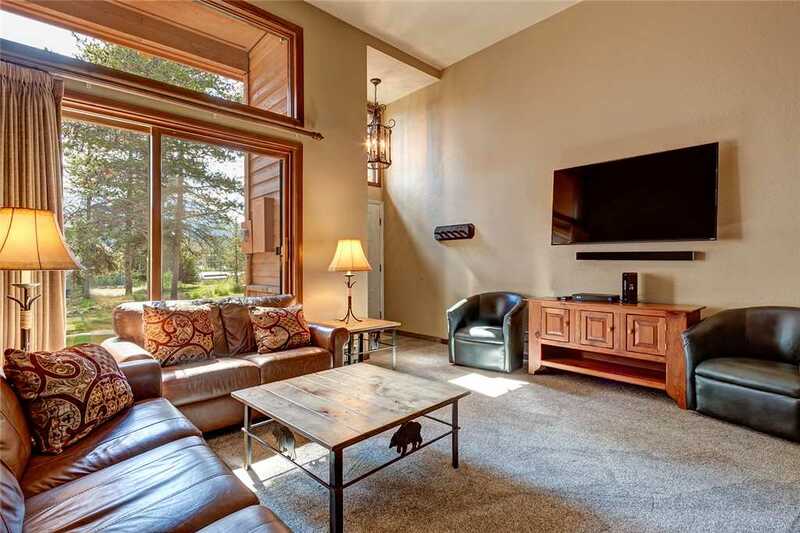 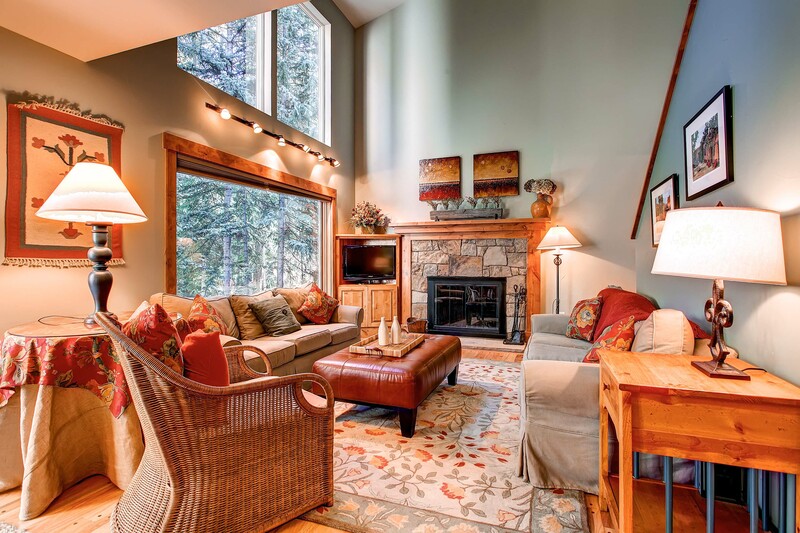 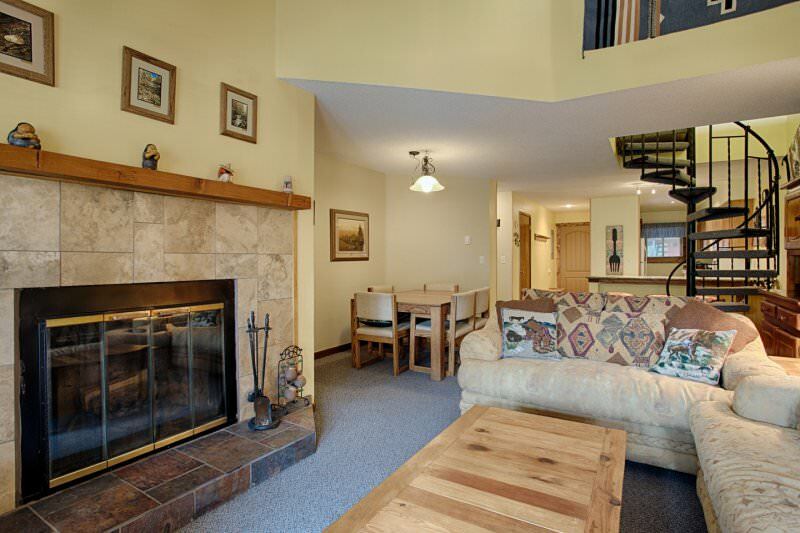 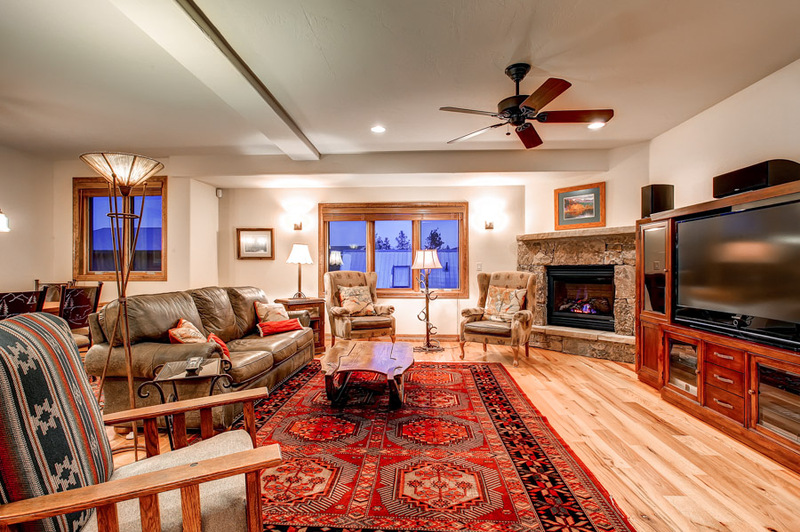 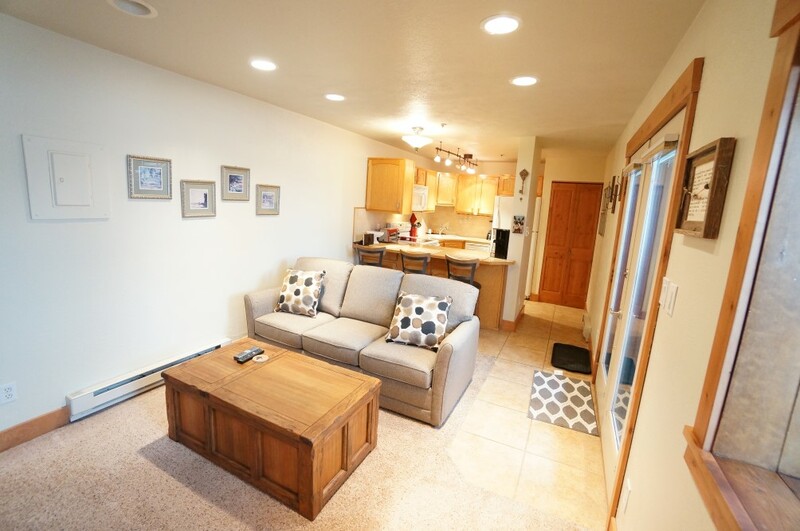 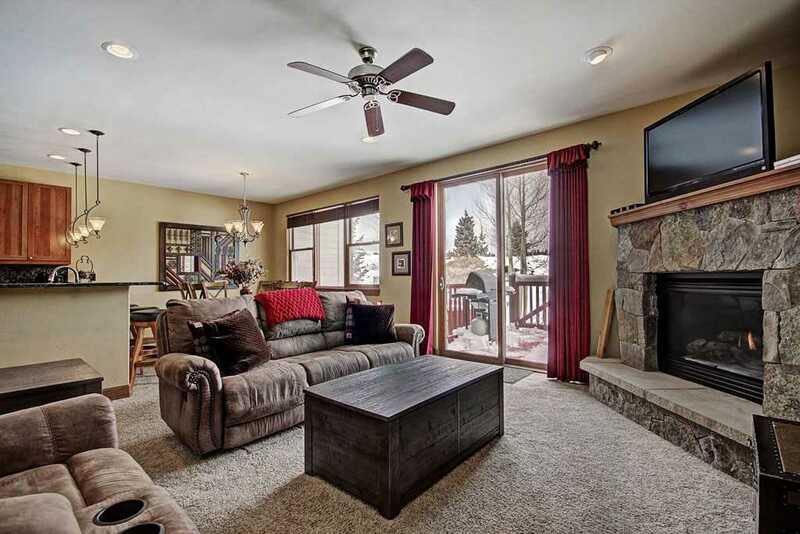 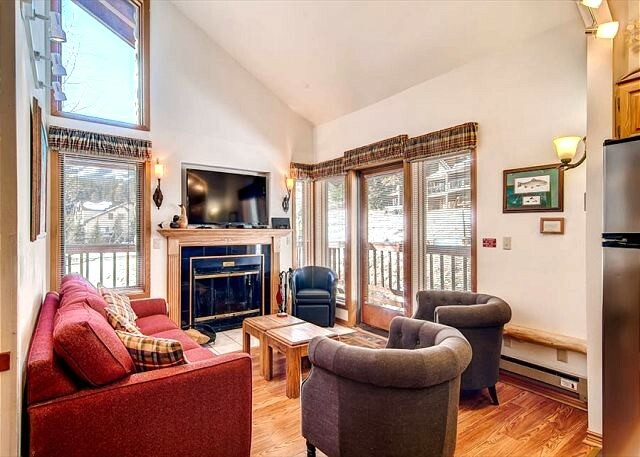 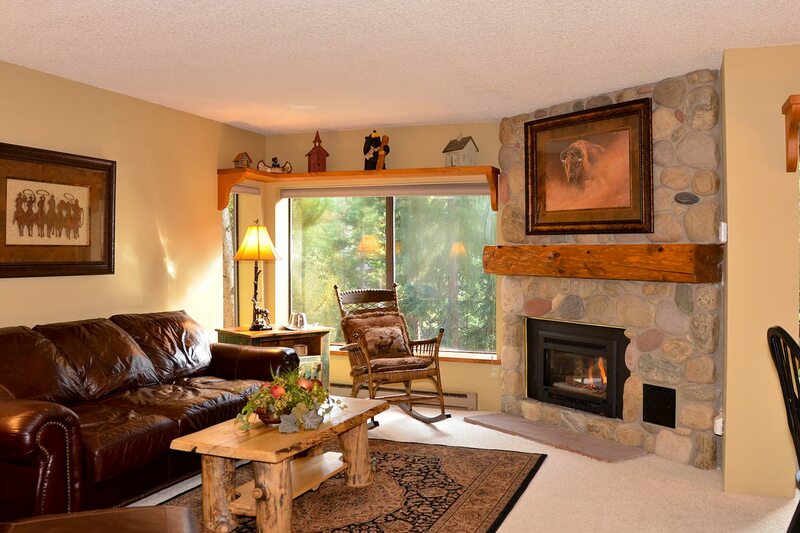 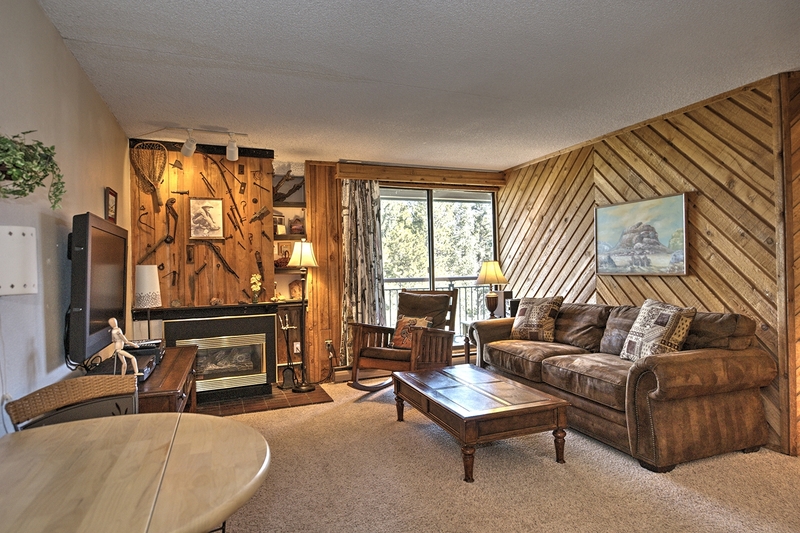 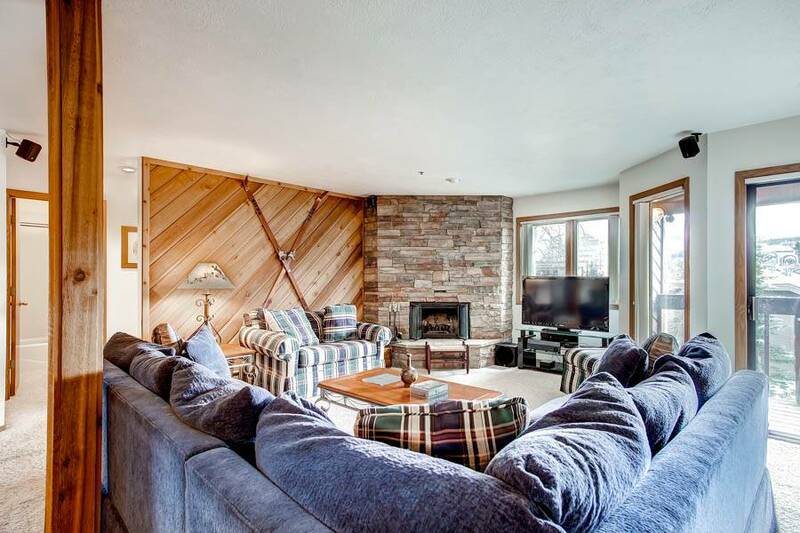 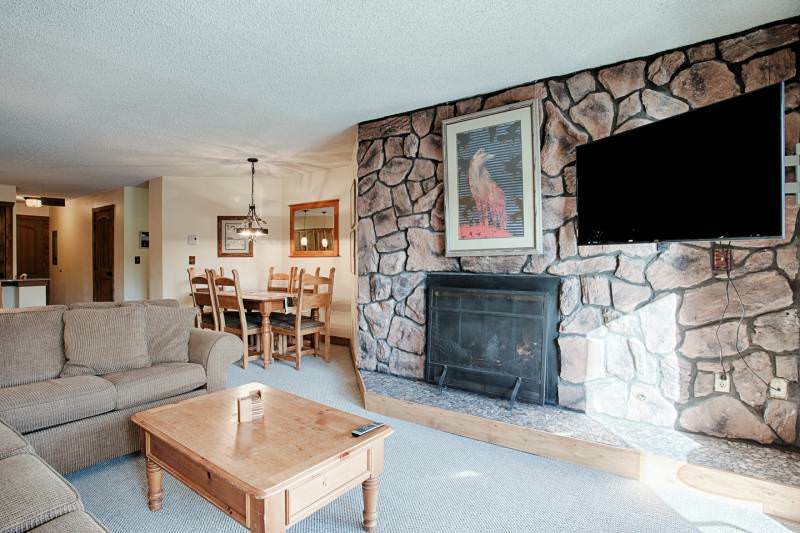 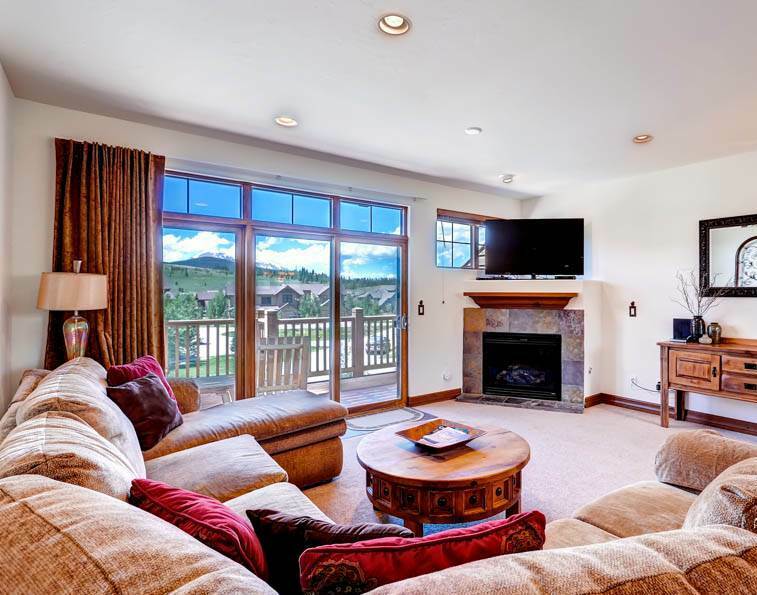 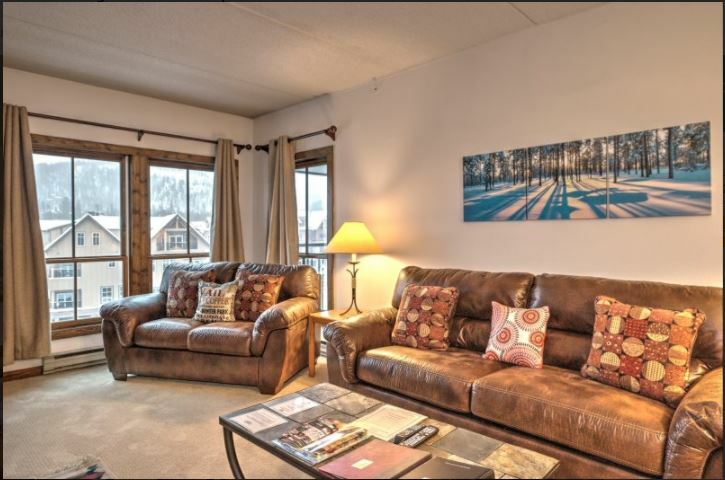 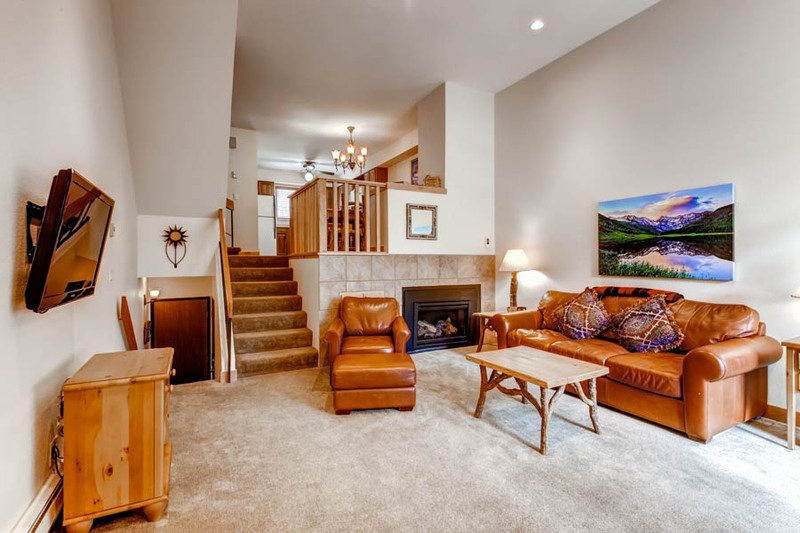 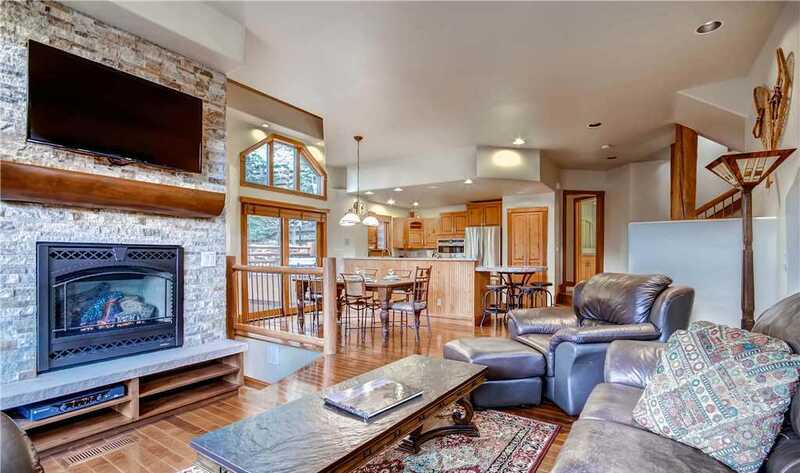 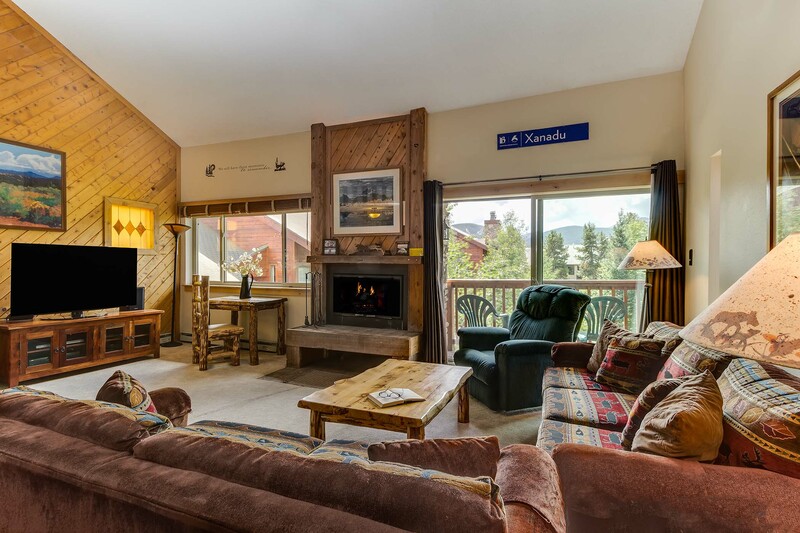 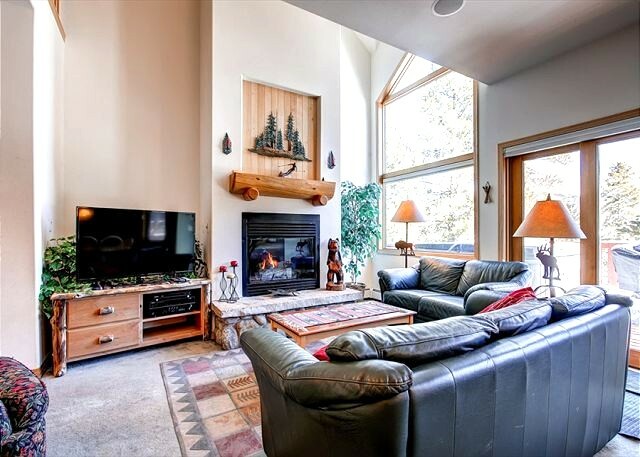 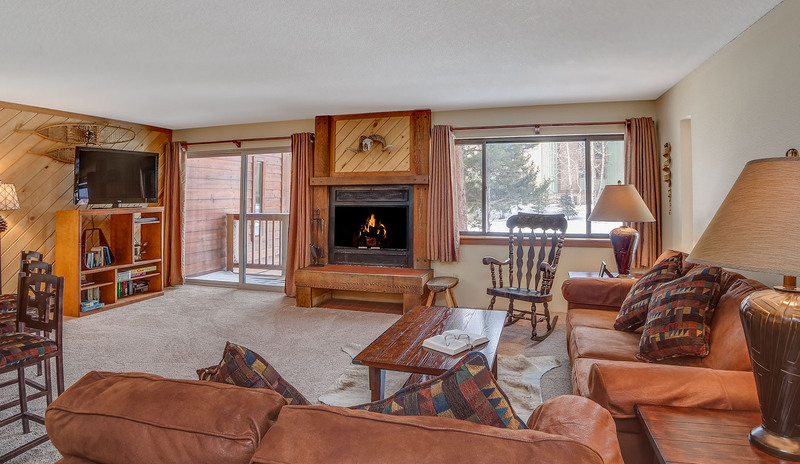 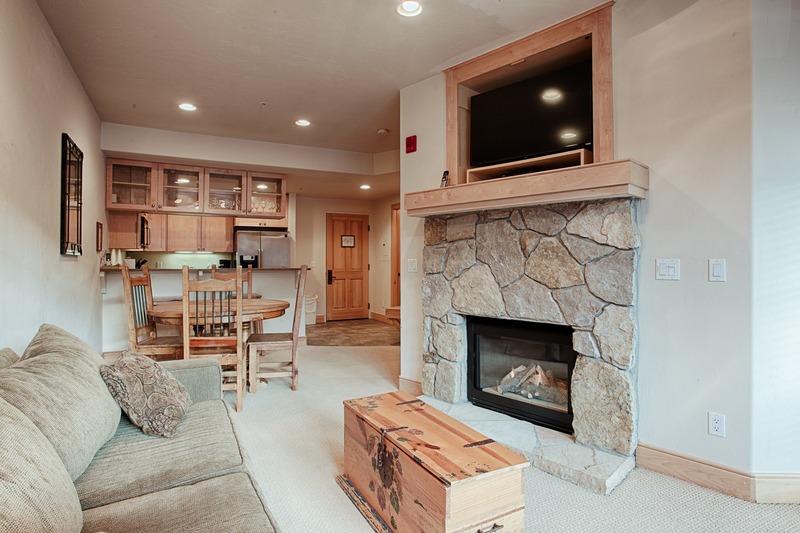 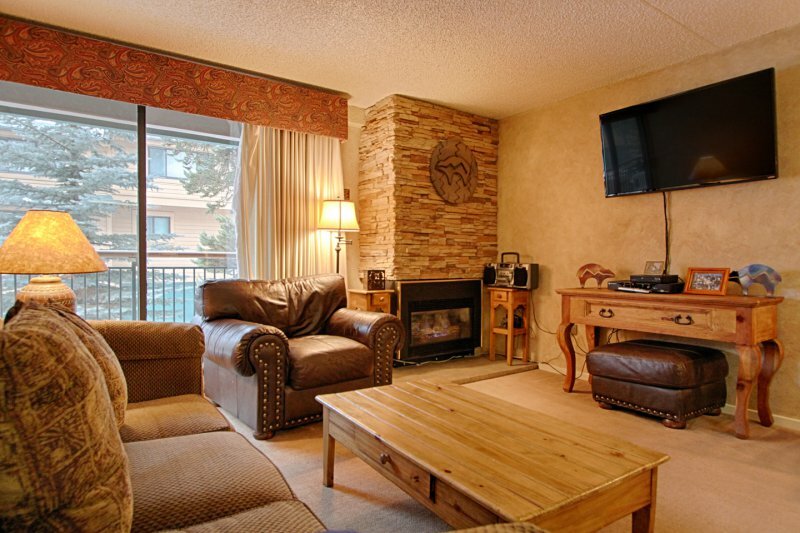 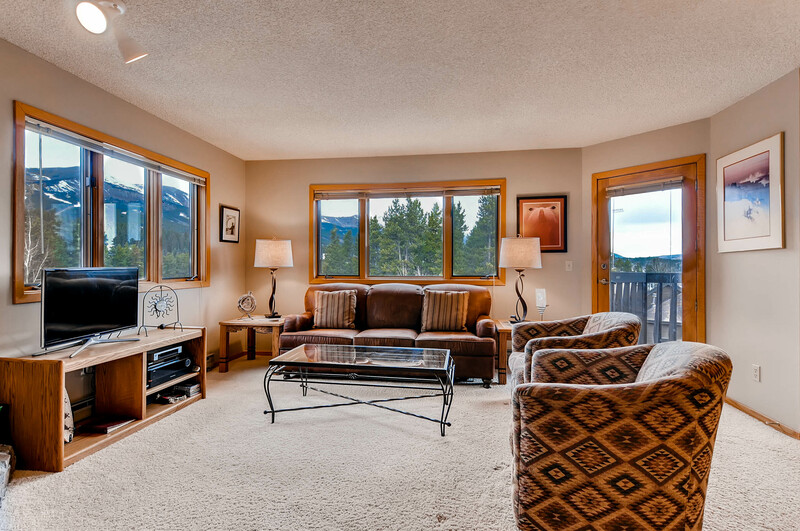 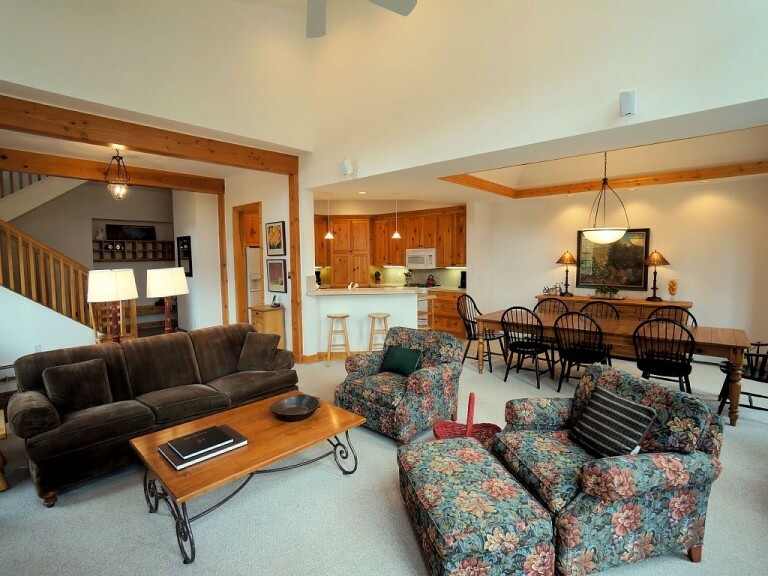 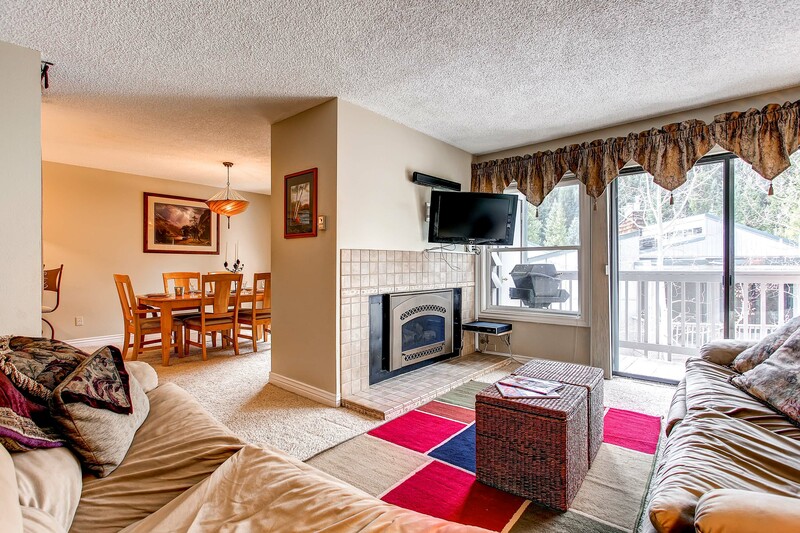 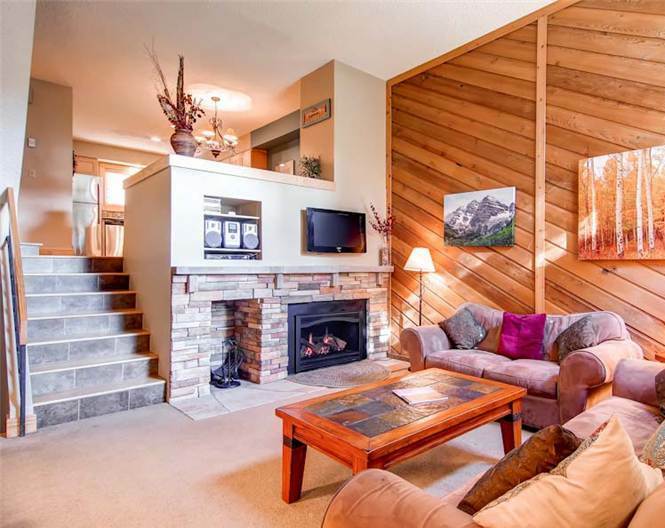 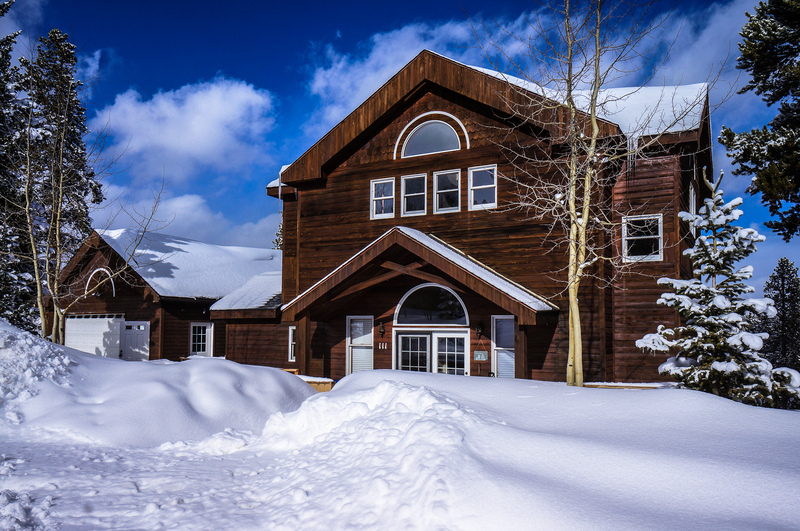 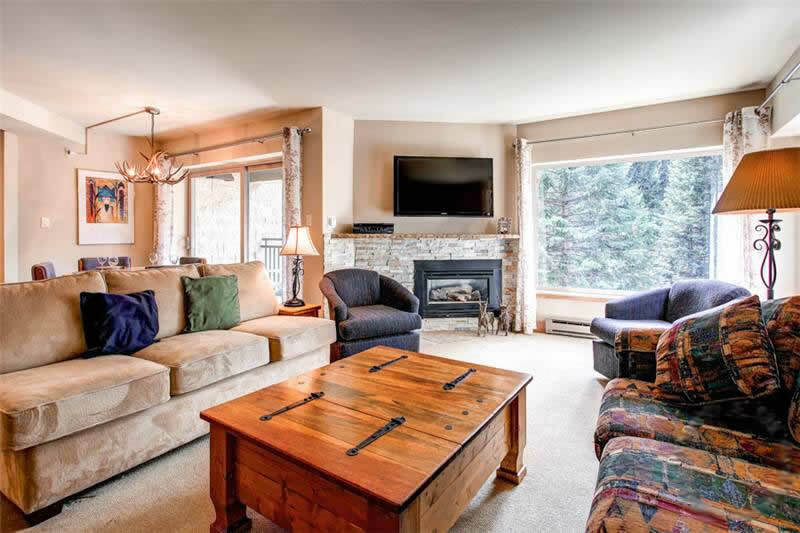 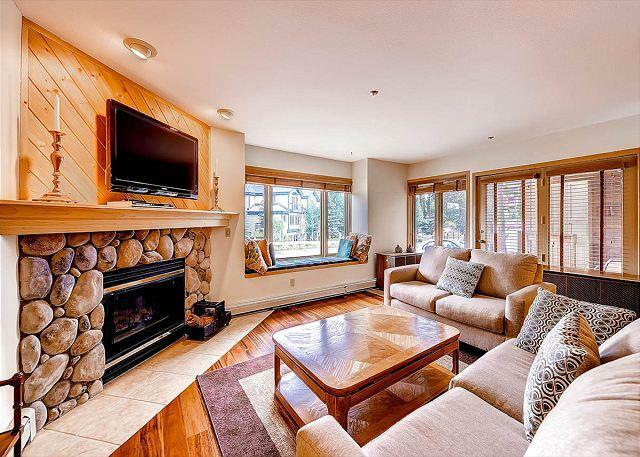 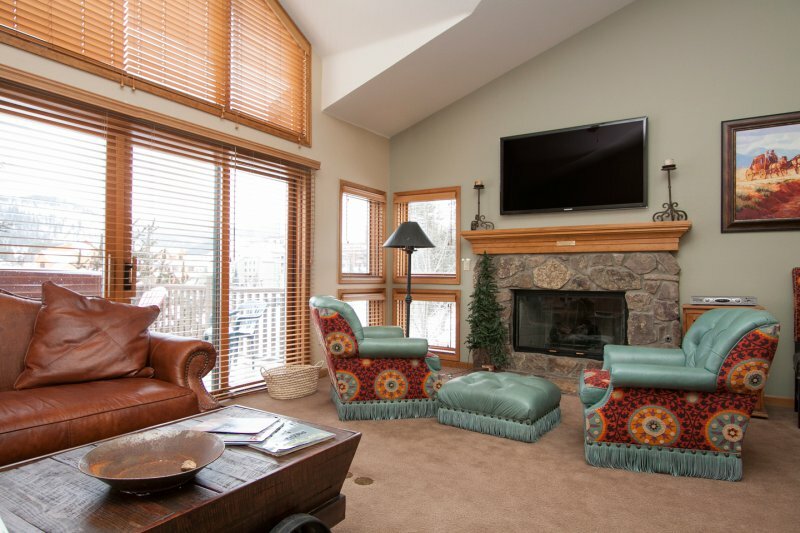 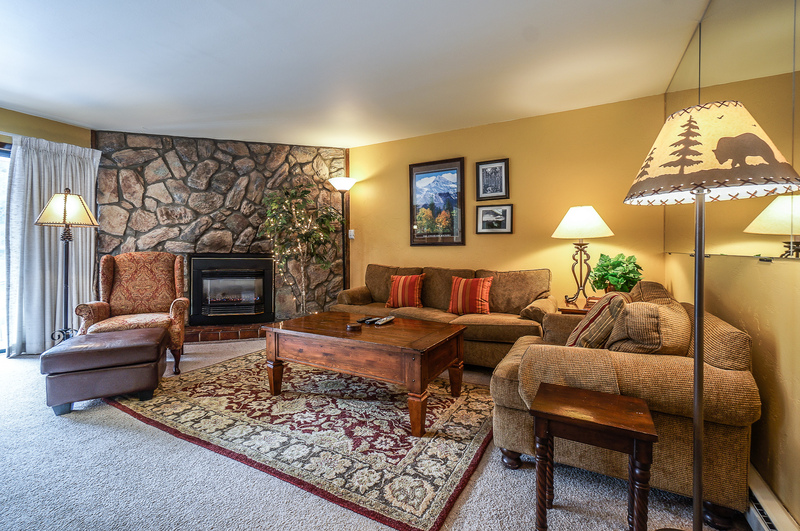 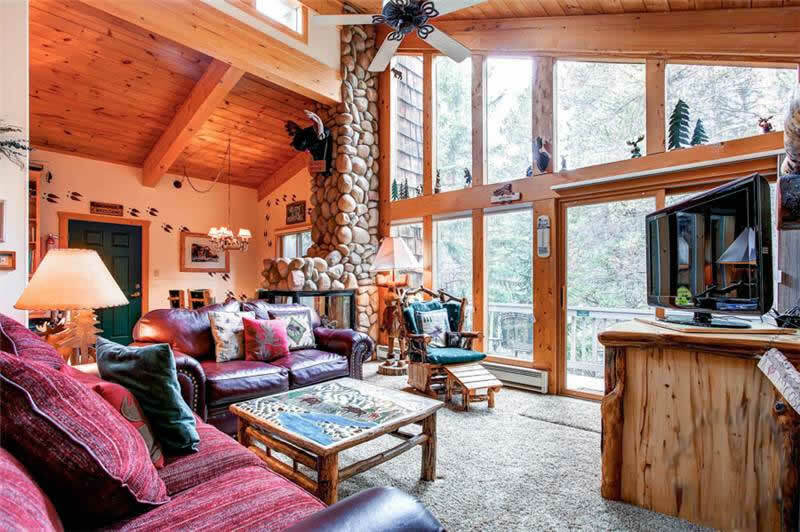 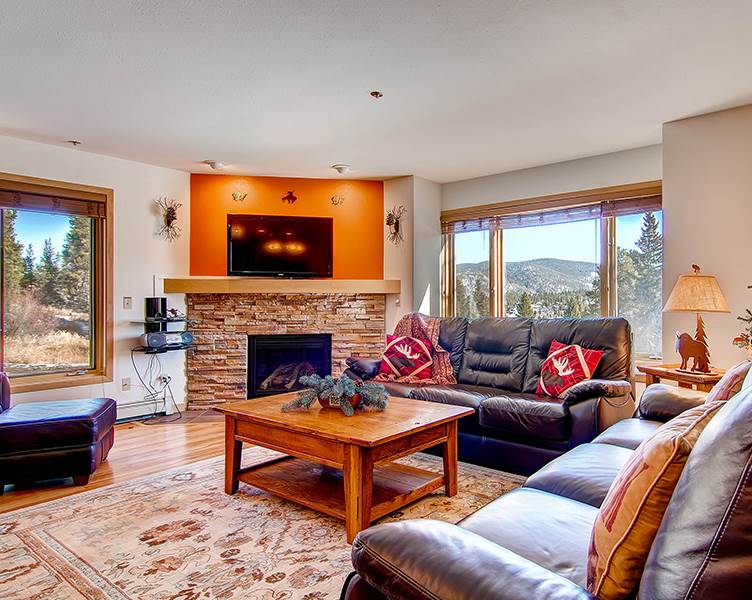 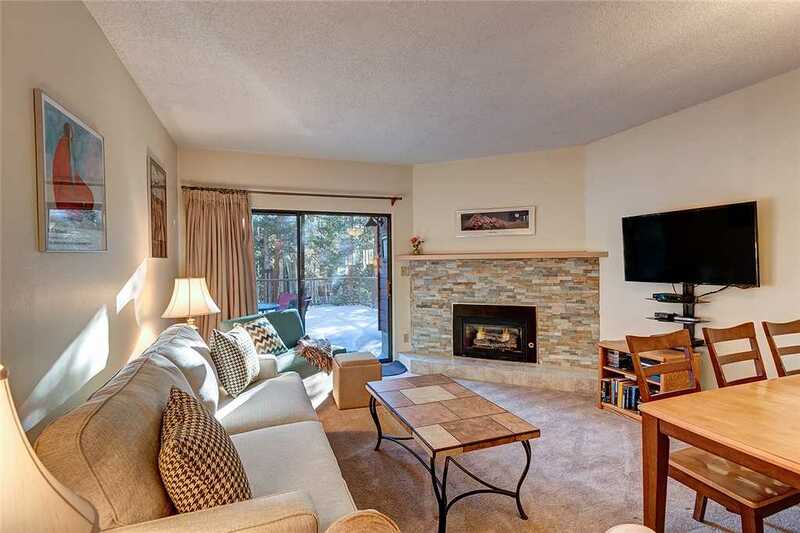 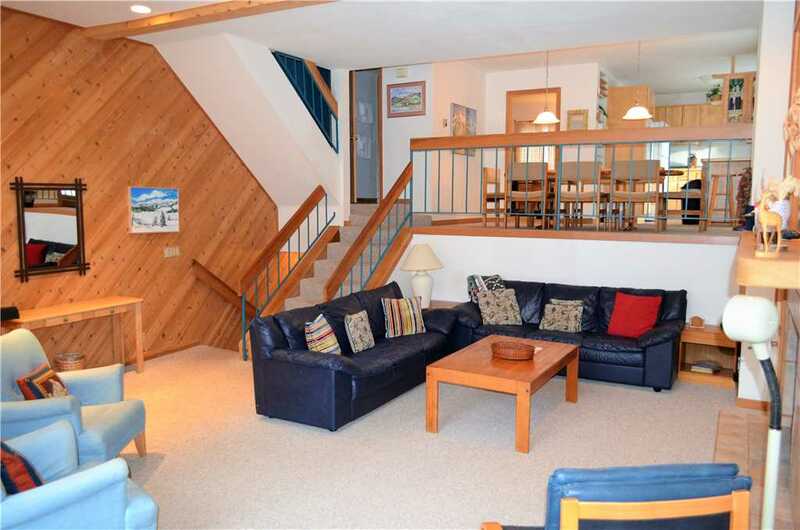 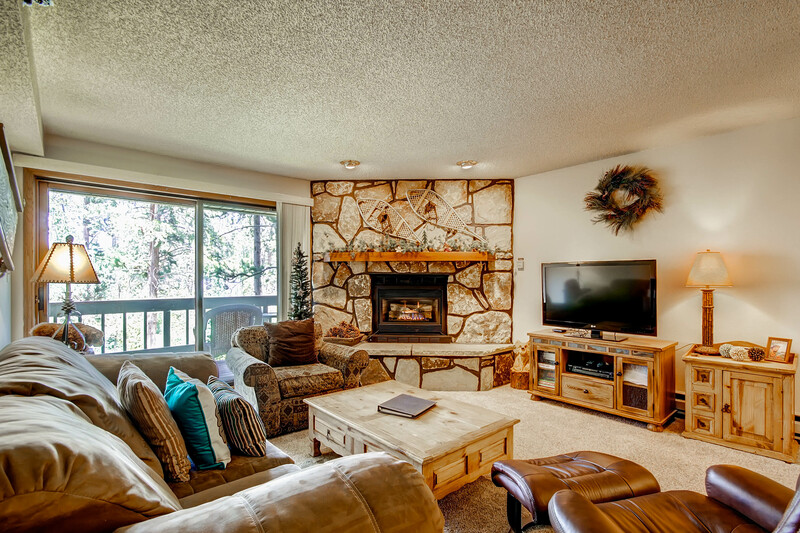 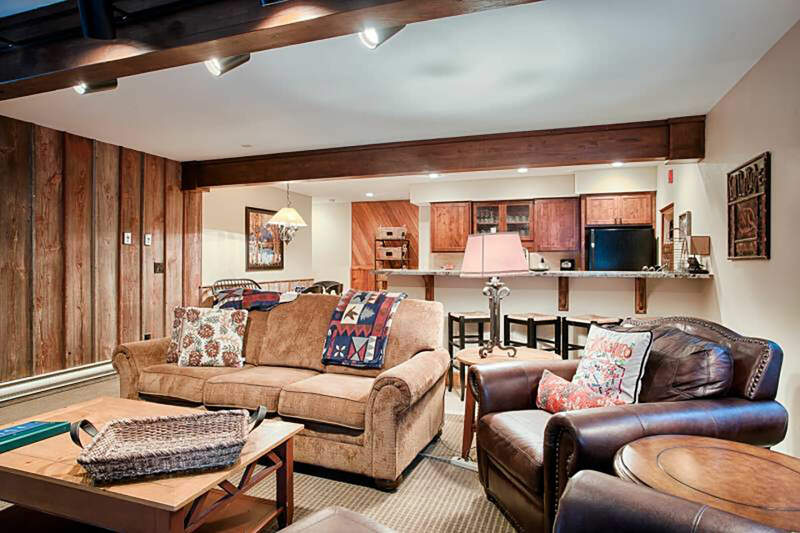 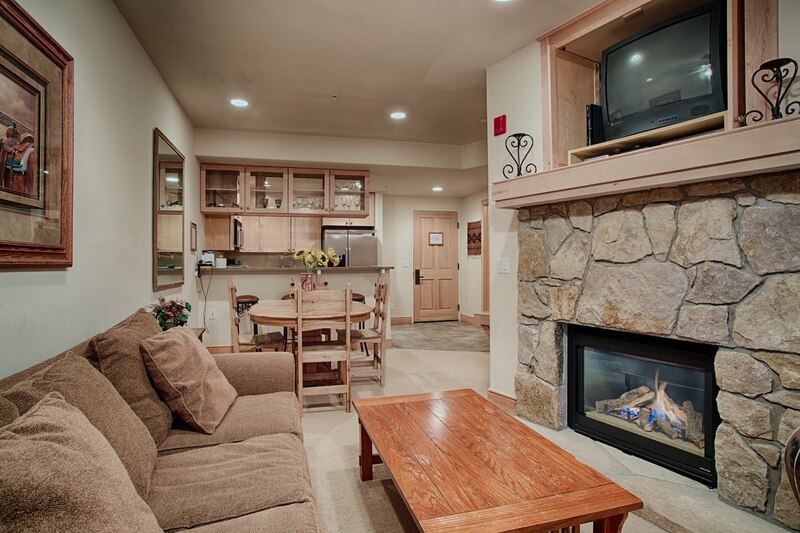 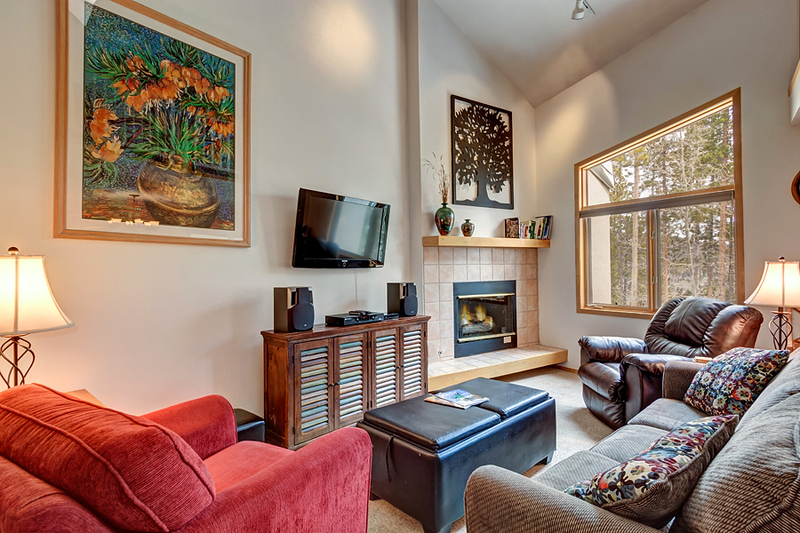 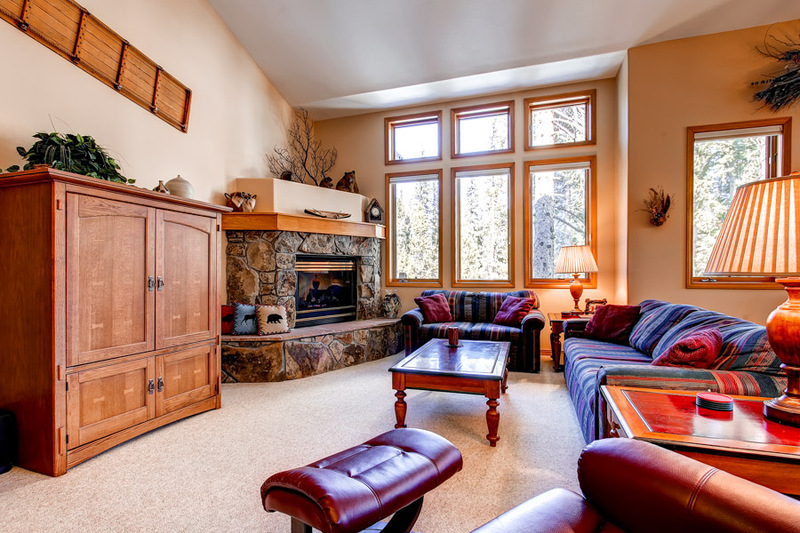 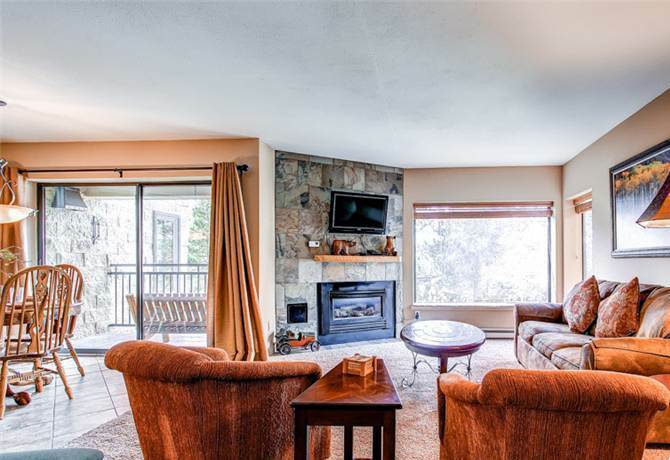 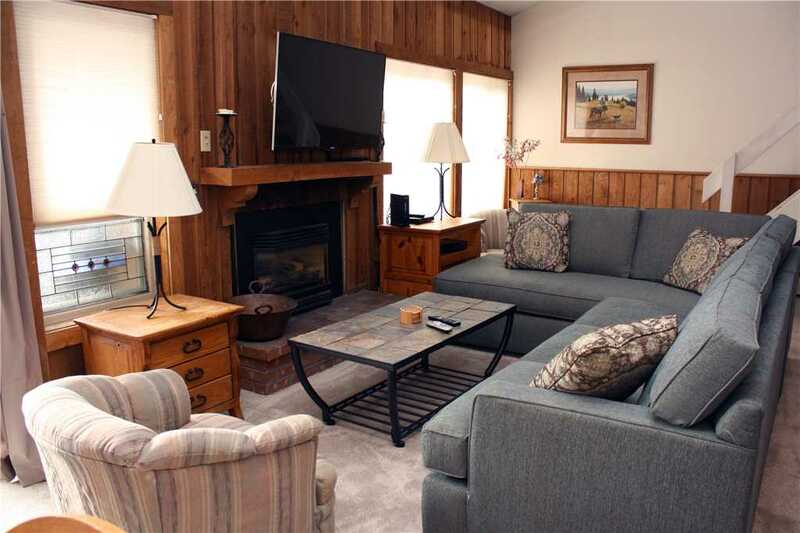 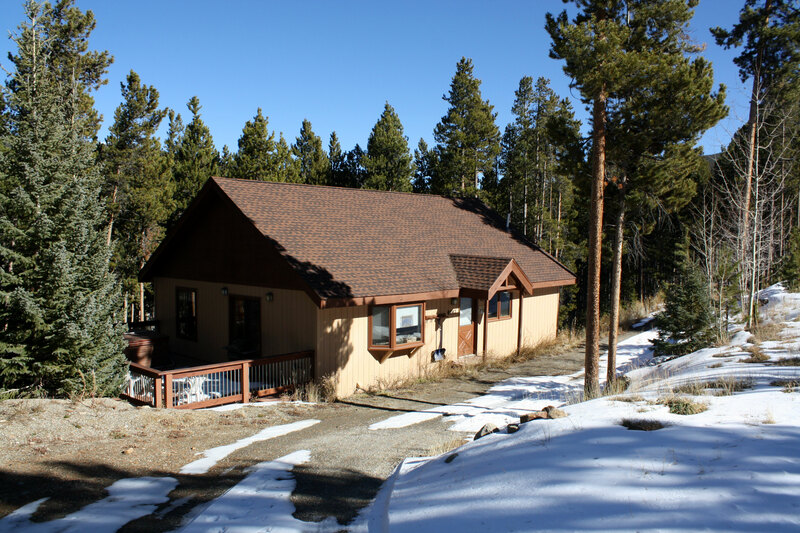 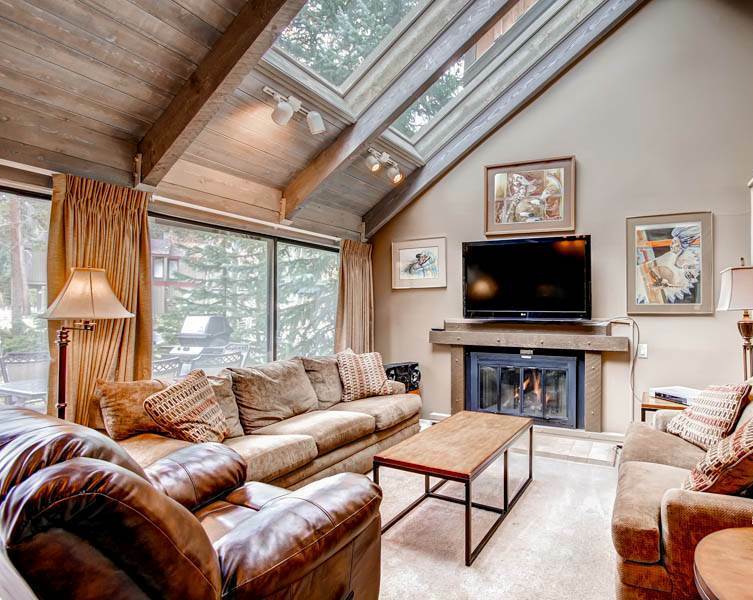 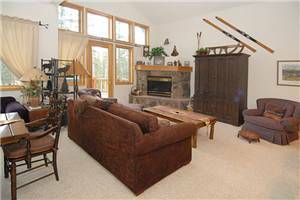 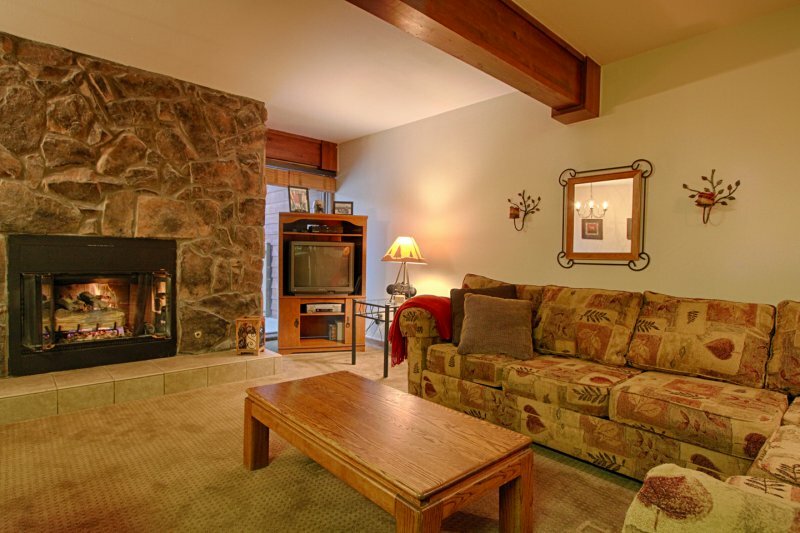 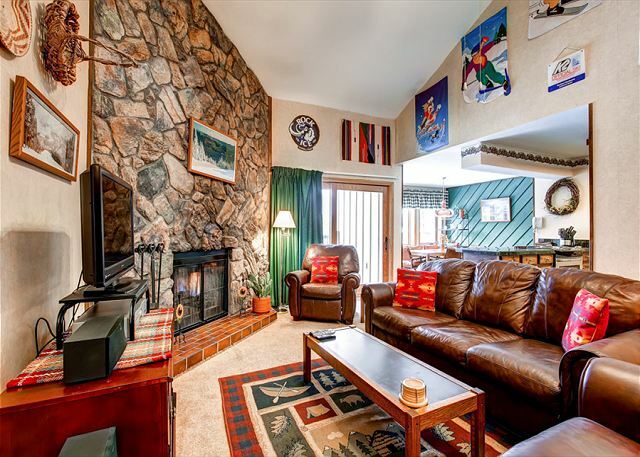 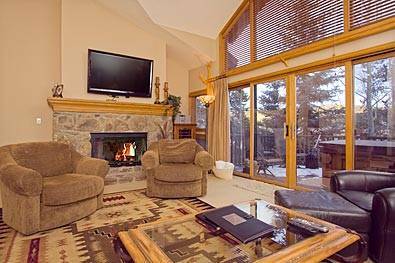 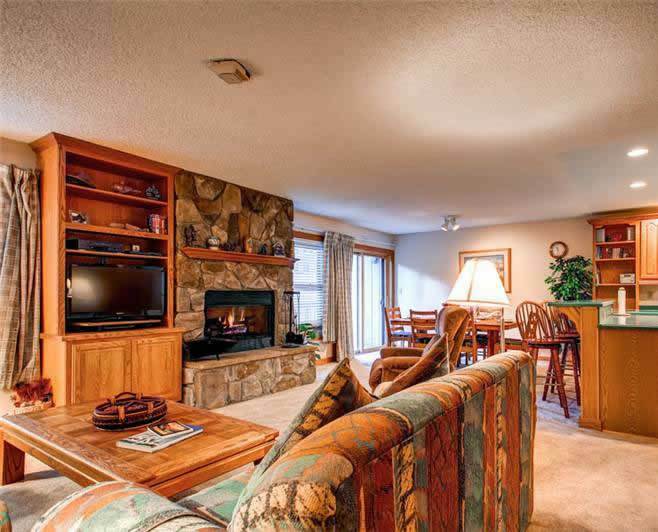 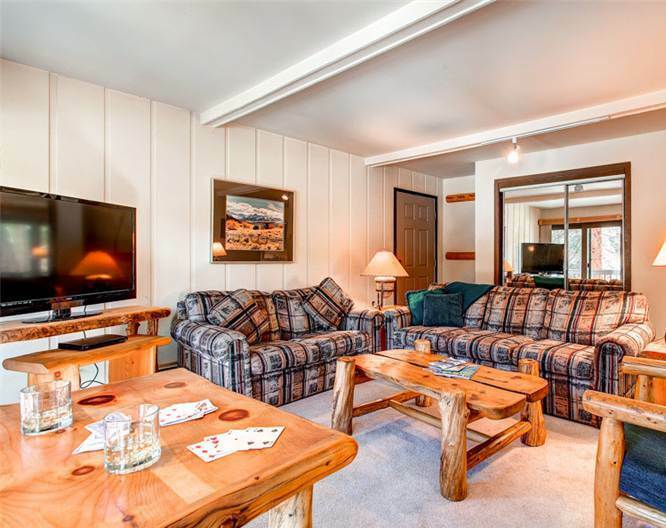 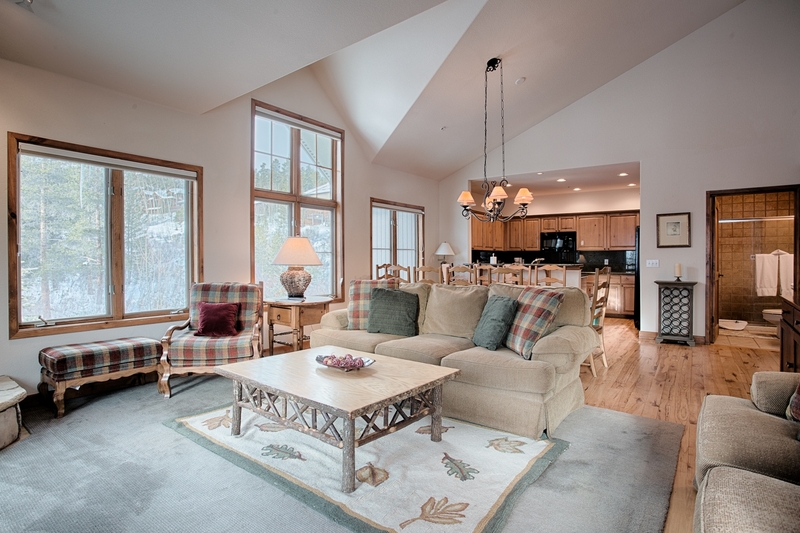 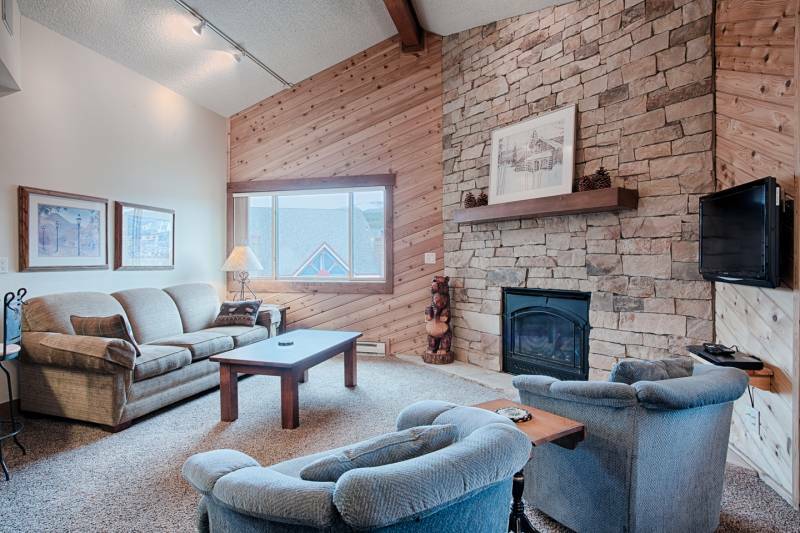 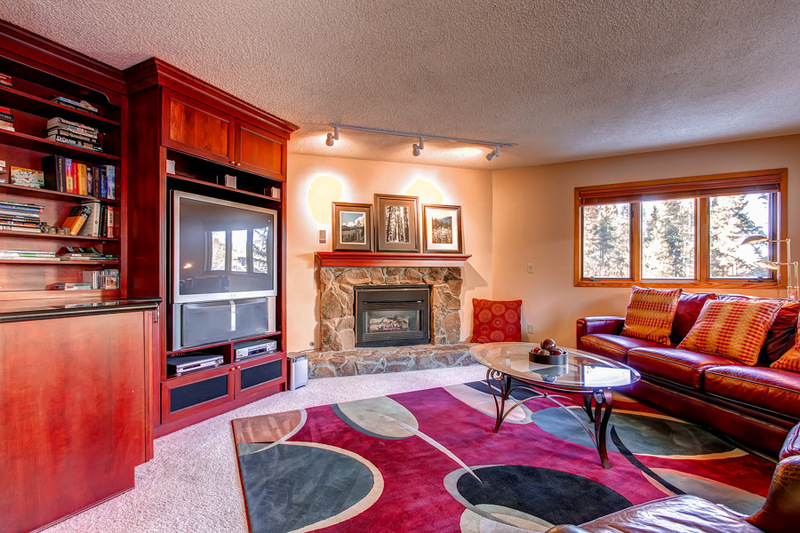 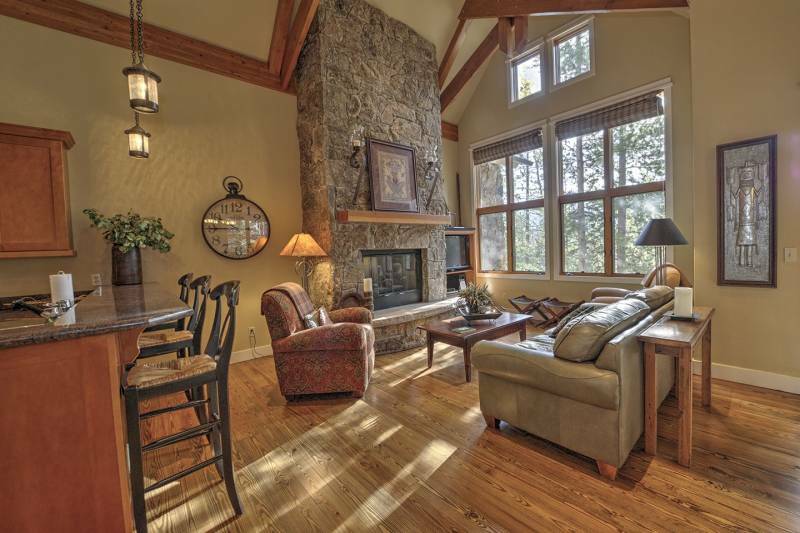 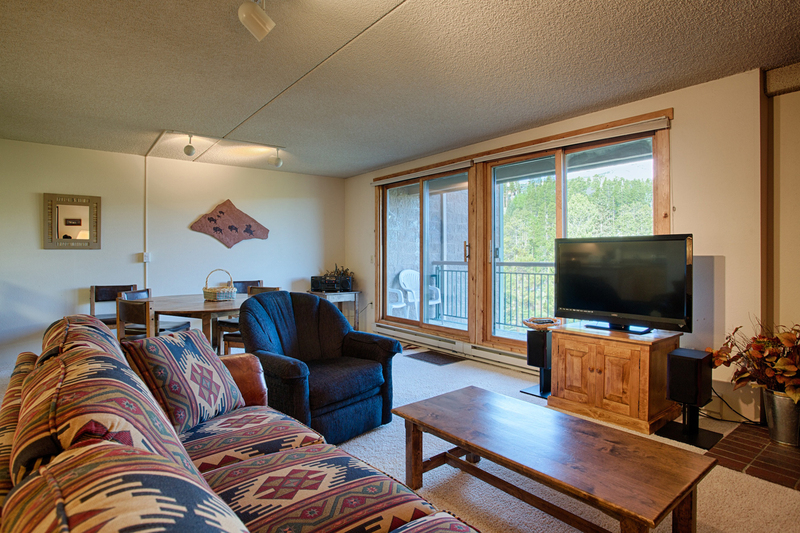 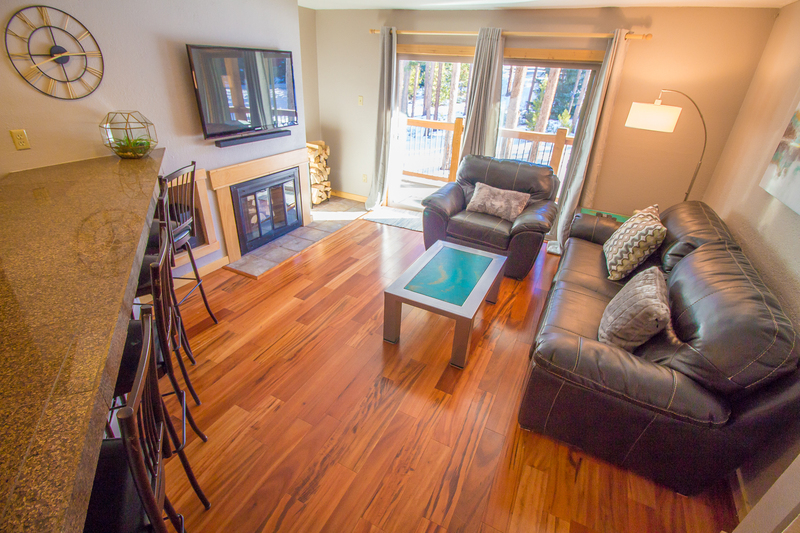 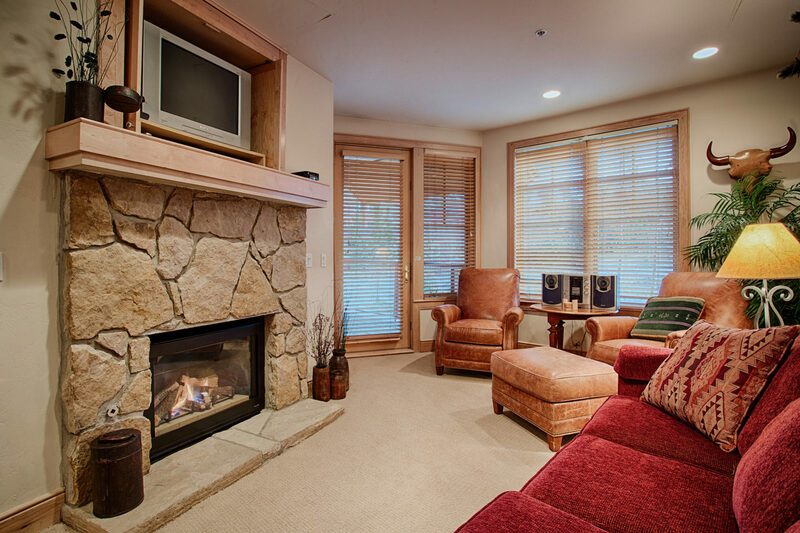 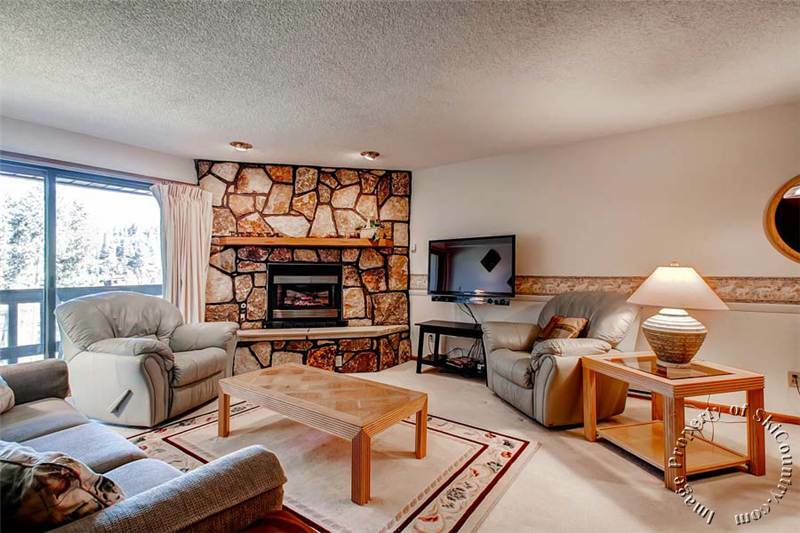 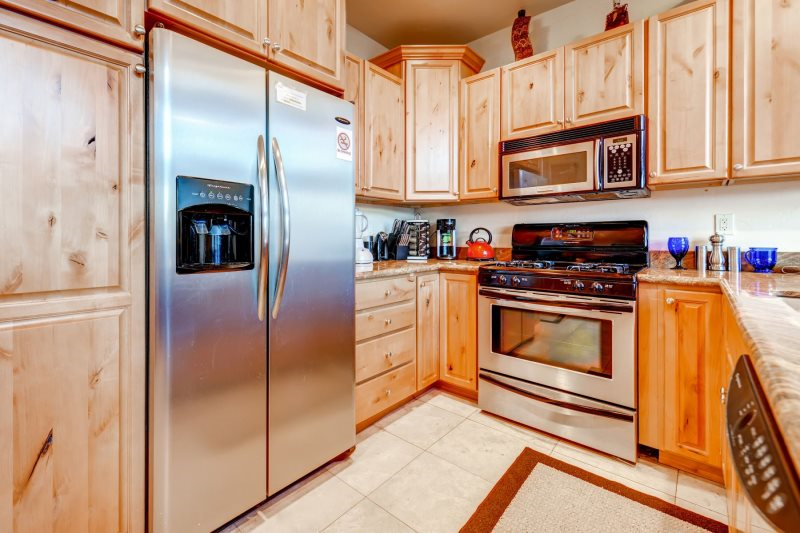 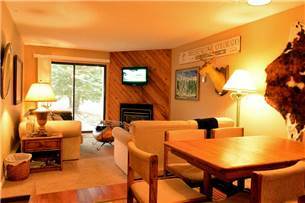 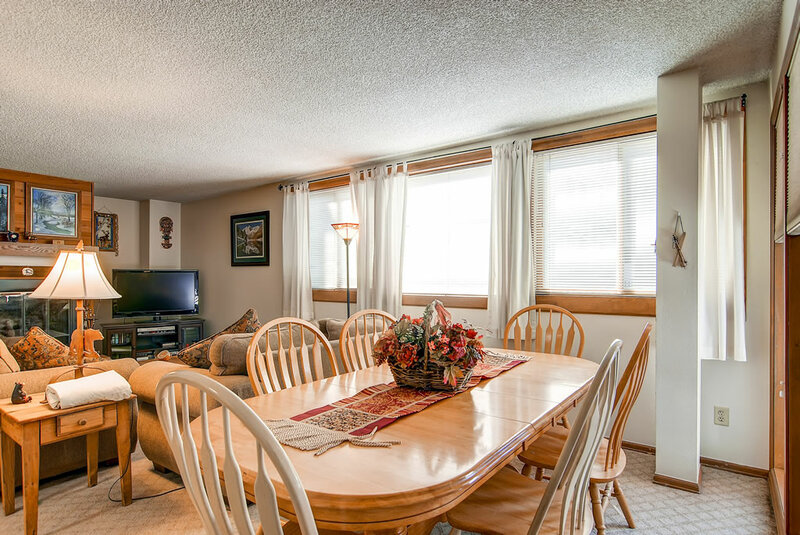 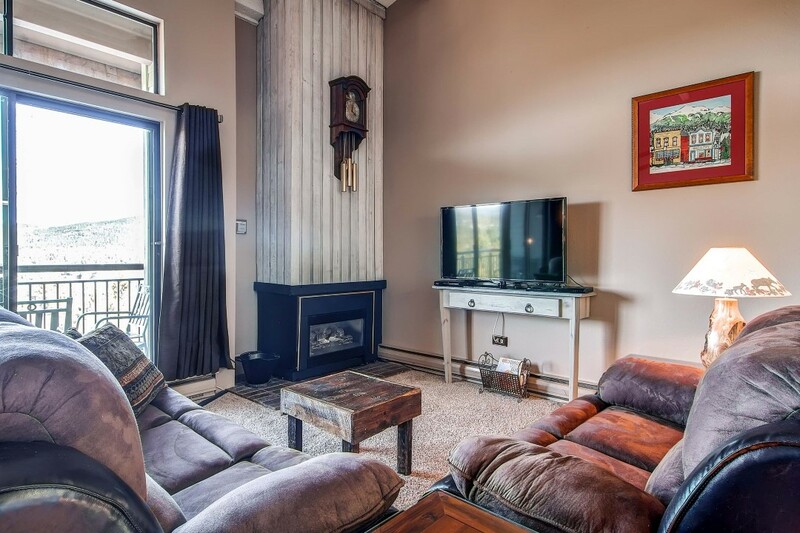 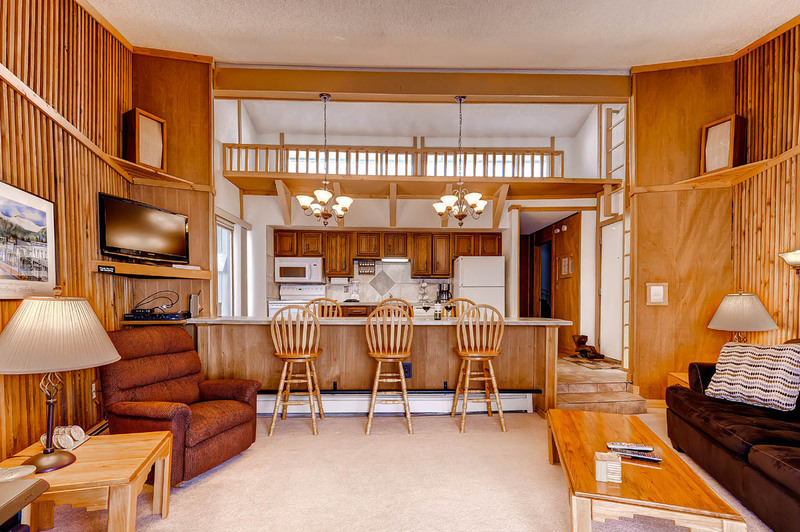 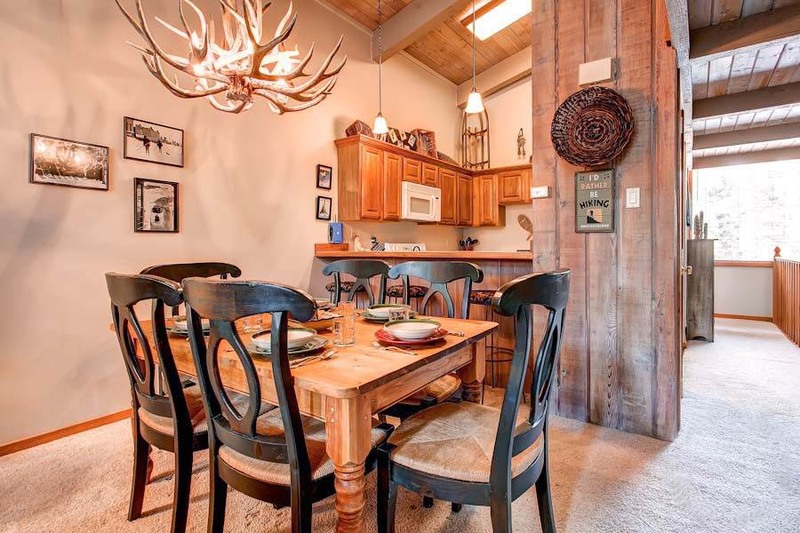 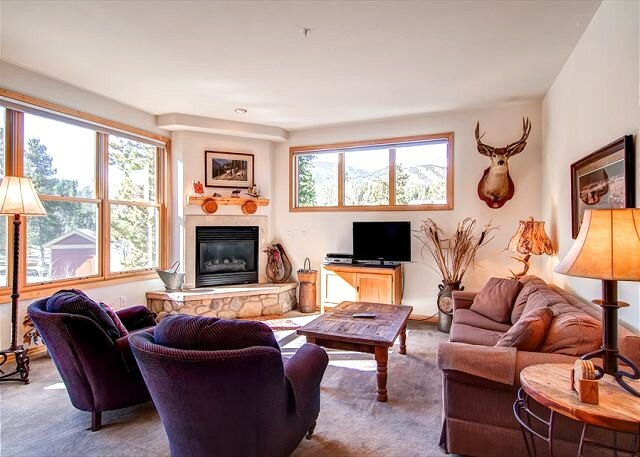 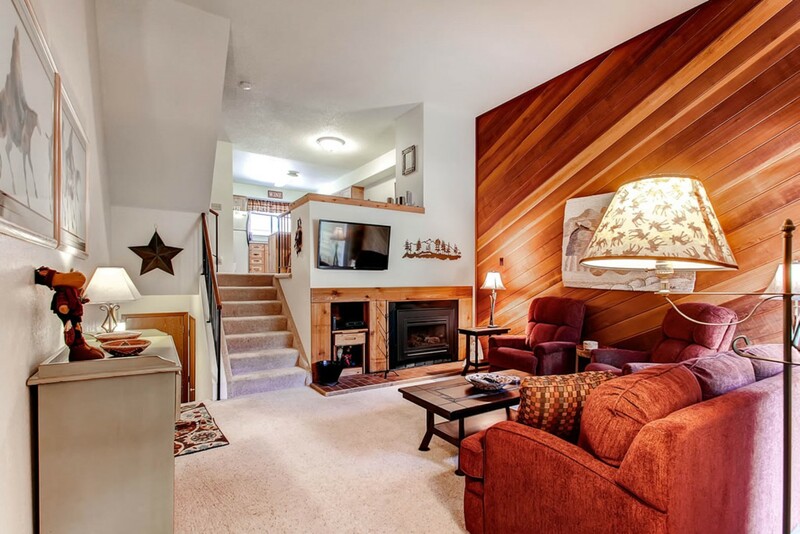 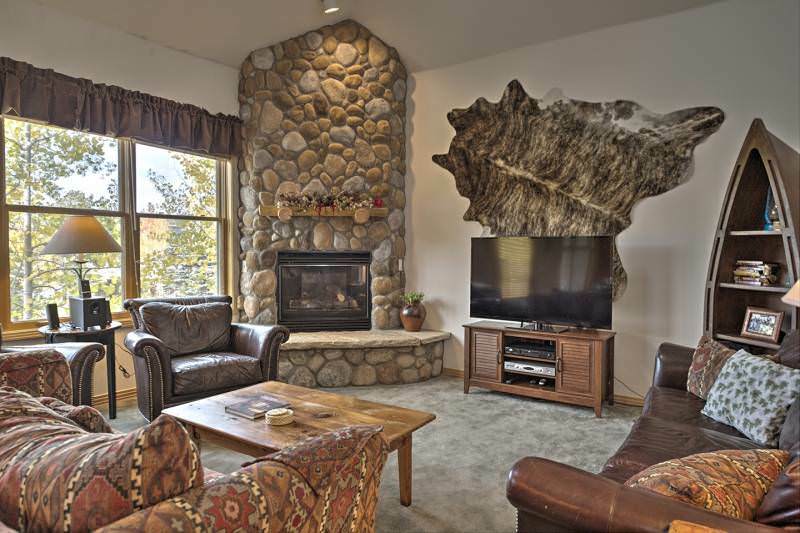 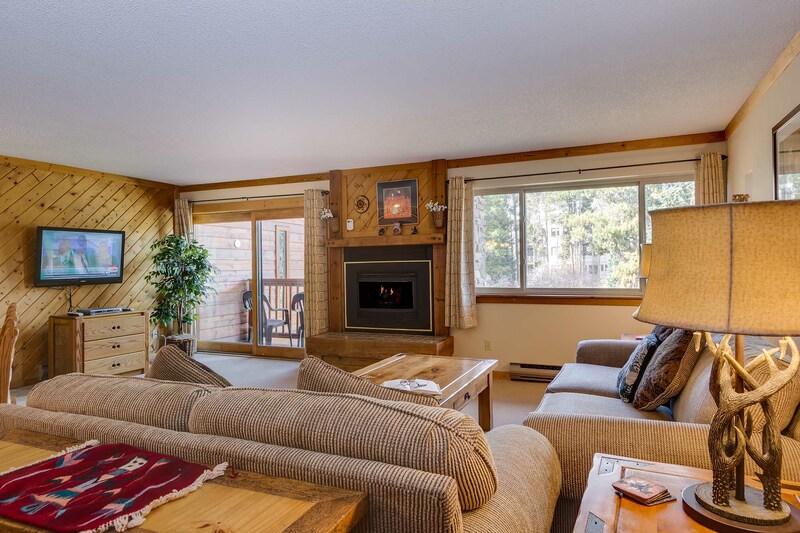 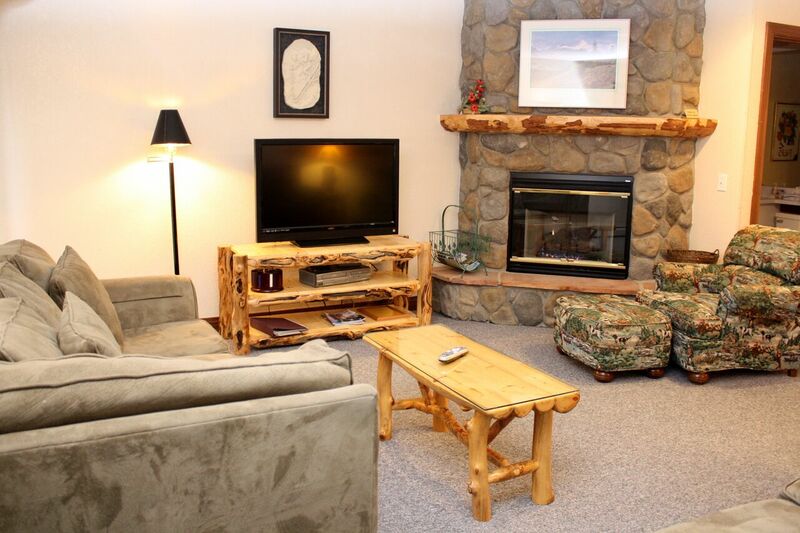 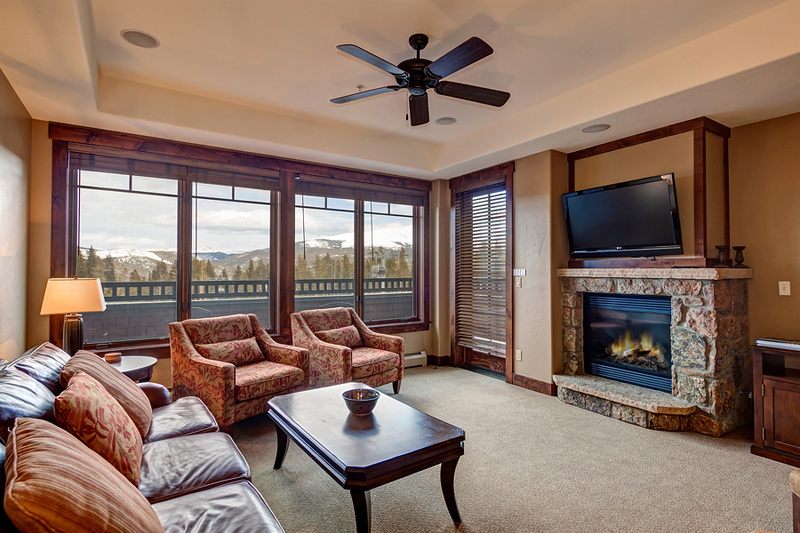 The Tannenbaum II condominium complex is one of our most popular destinations with its convenient location near the ski area. 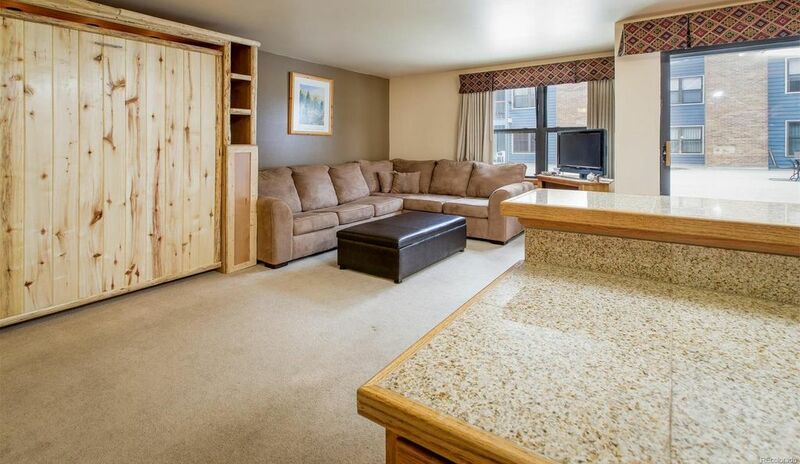 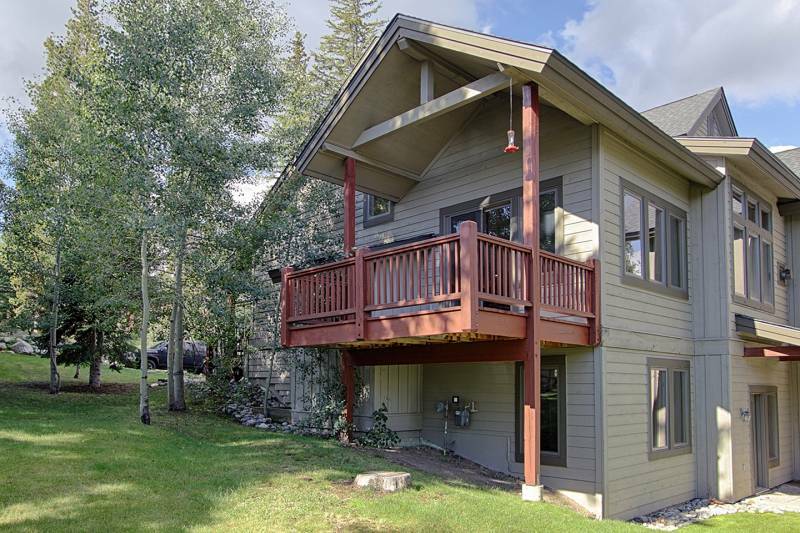 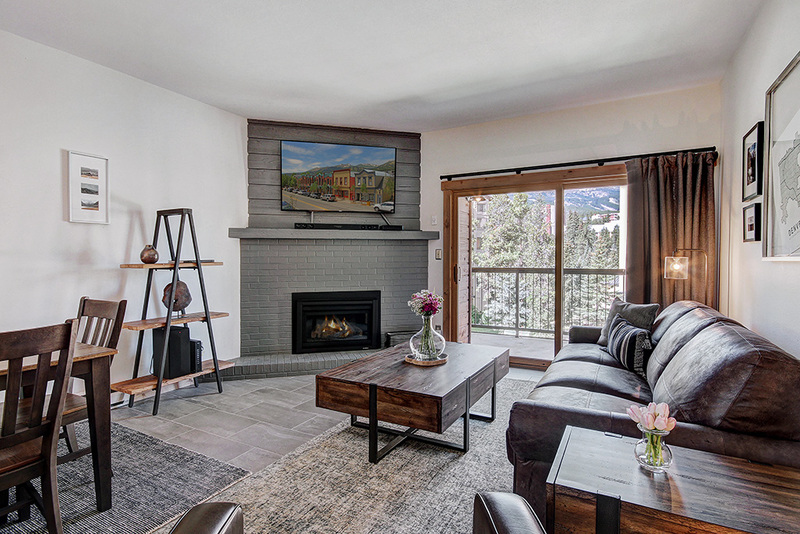 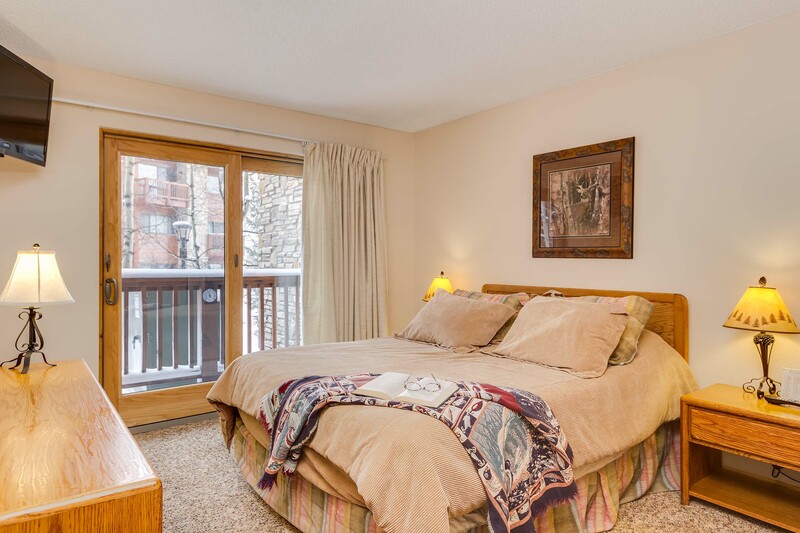 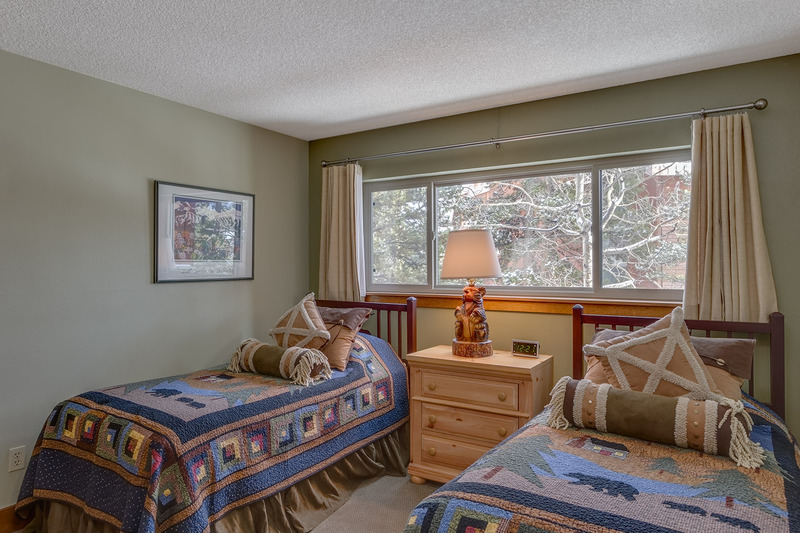 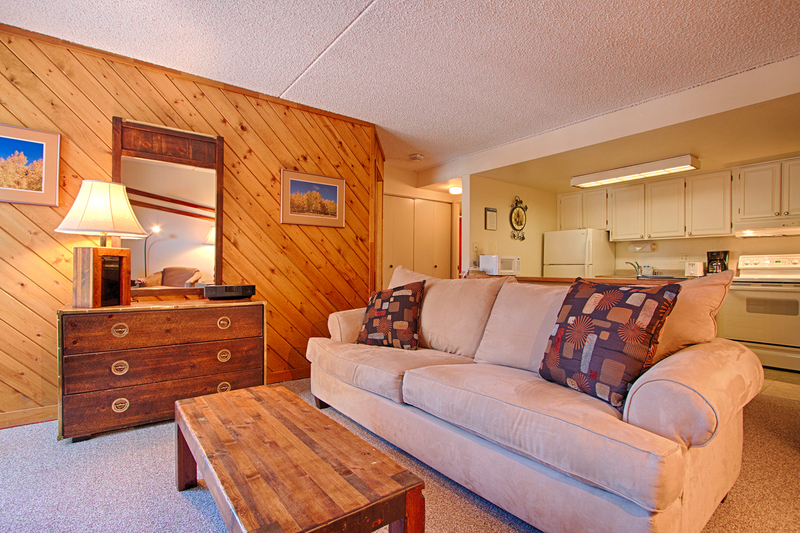 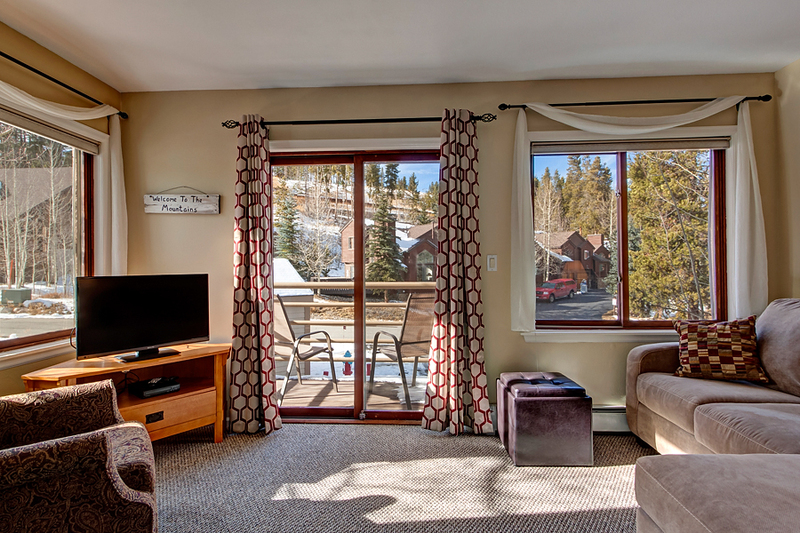 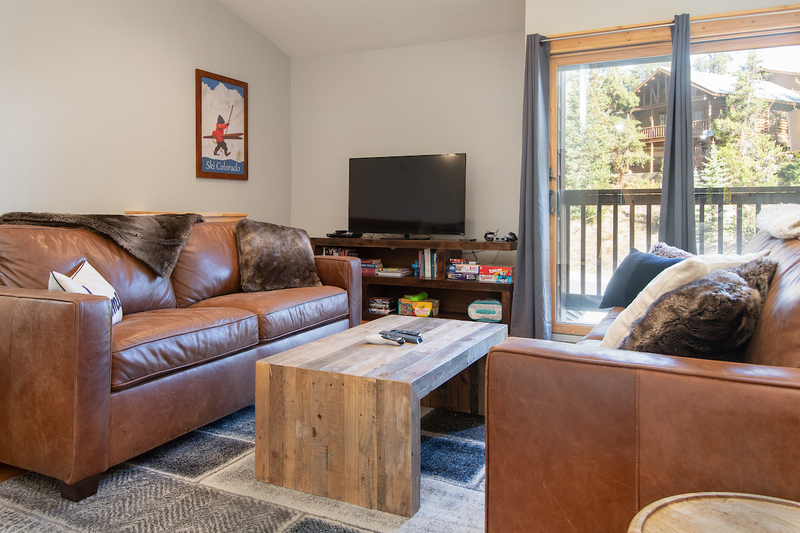 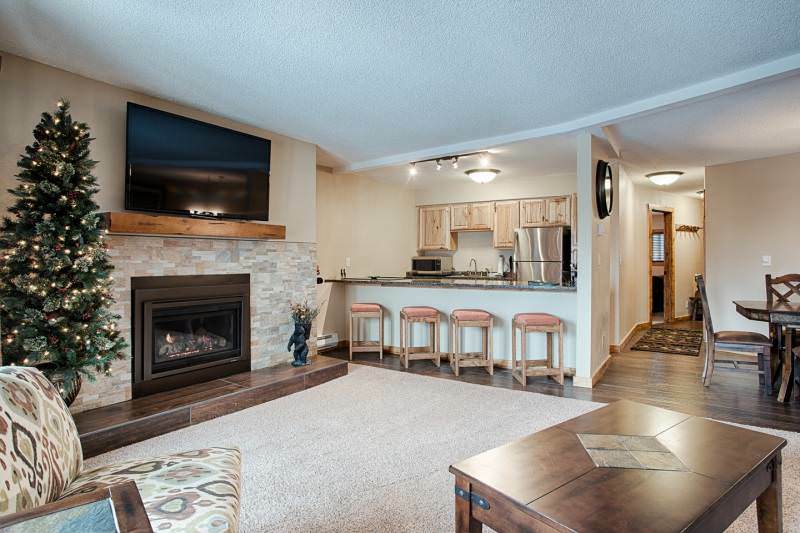 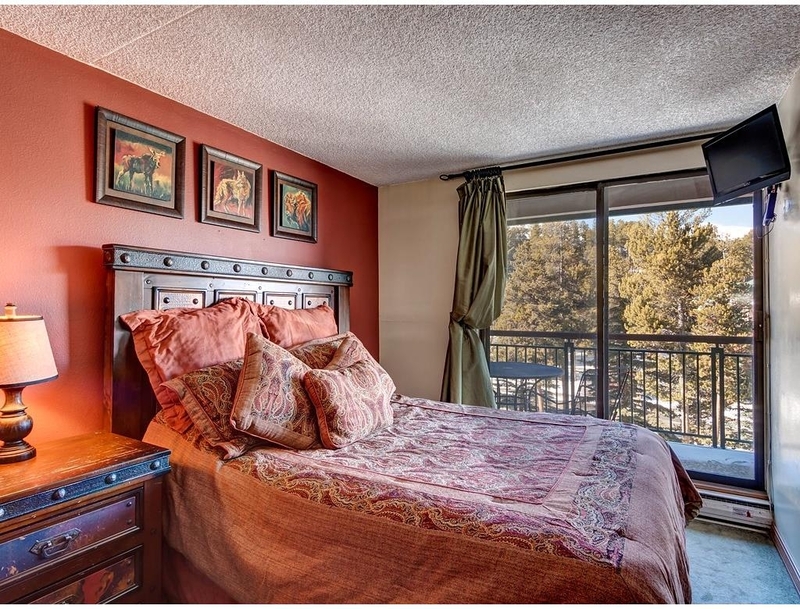 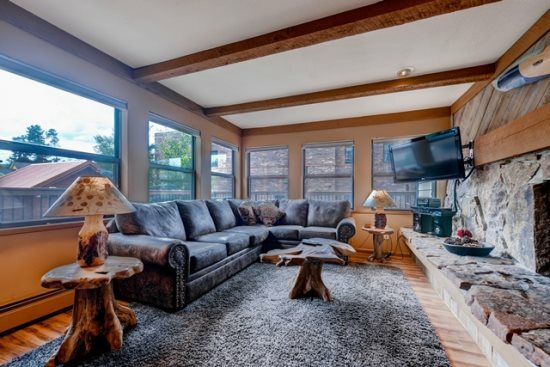 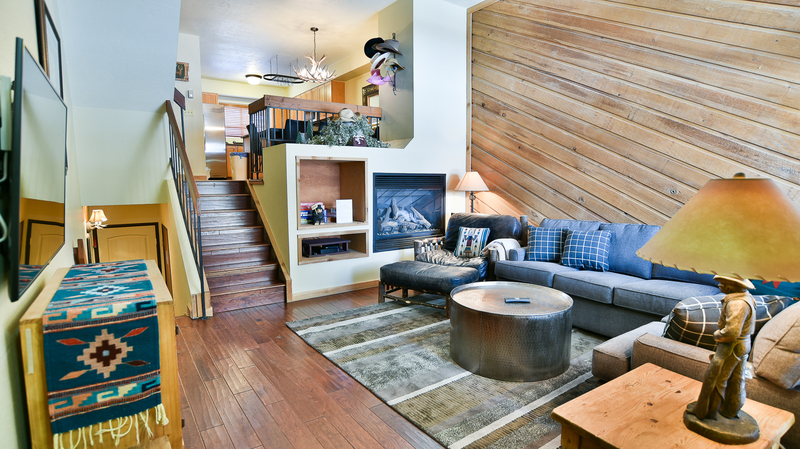 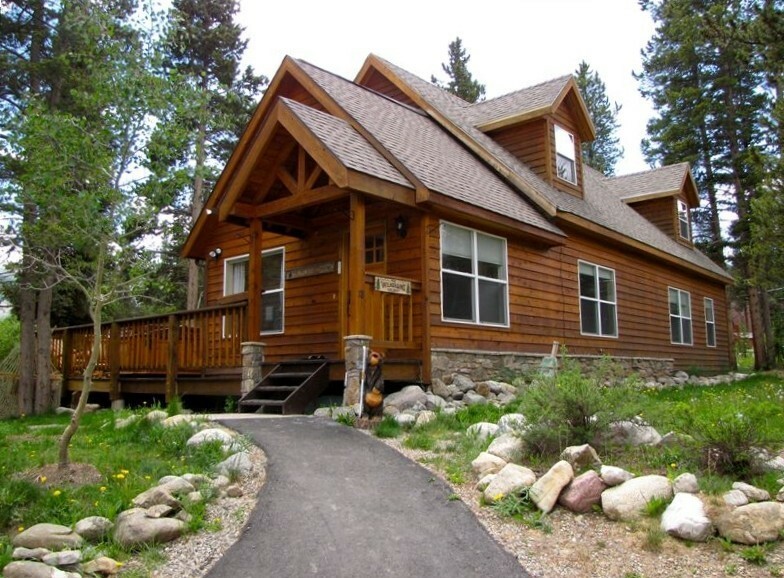 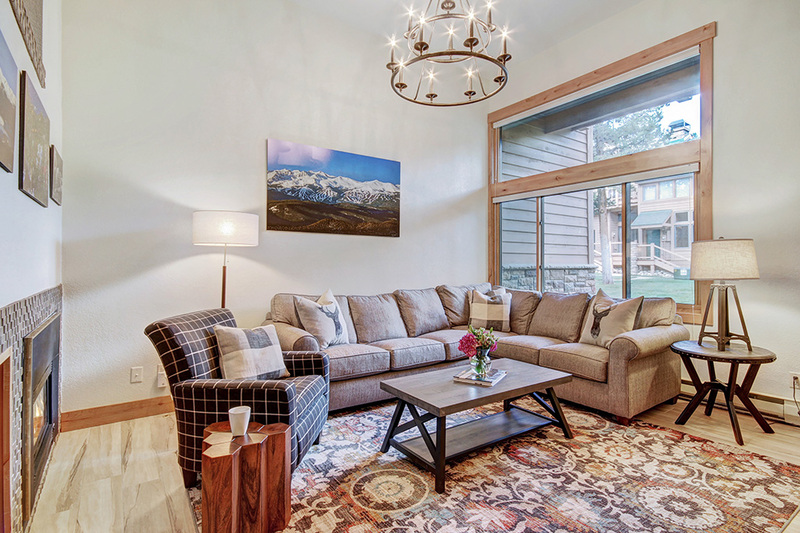 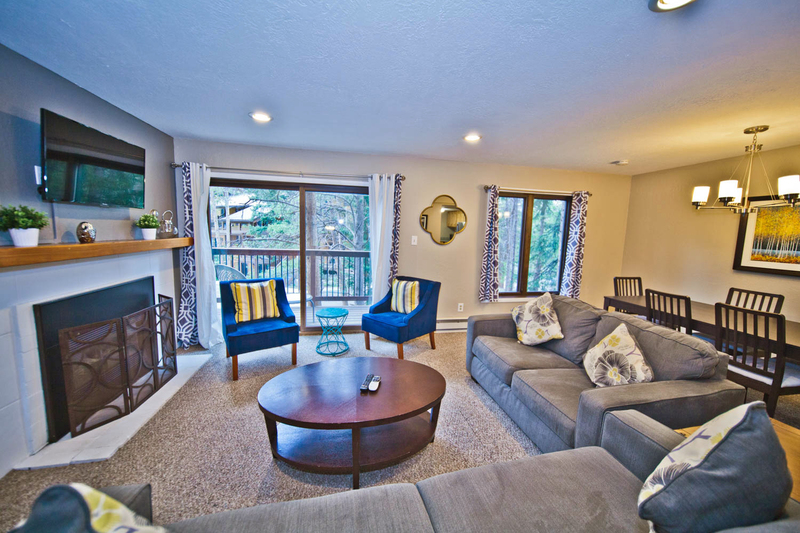 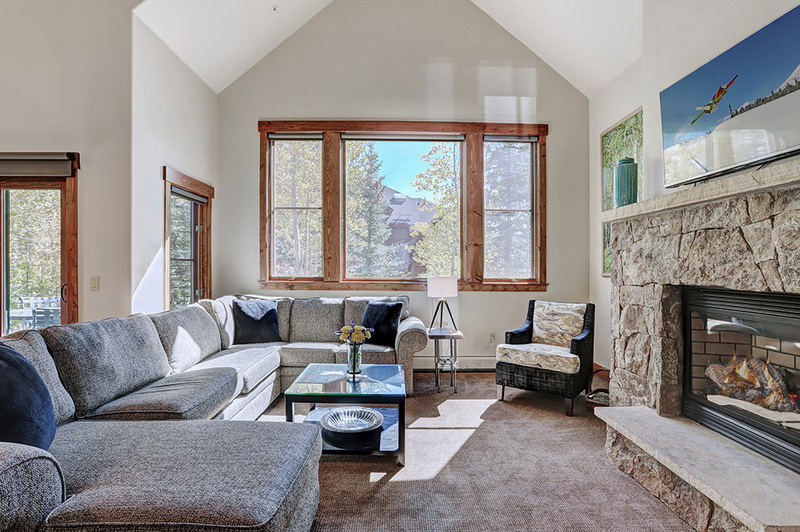 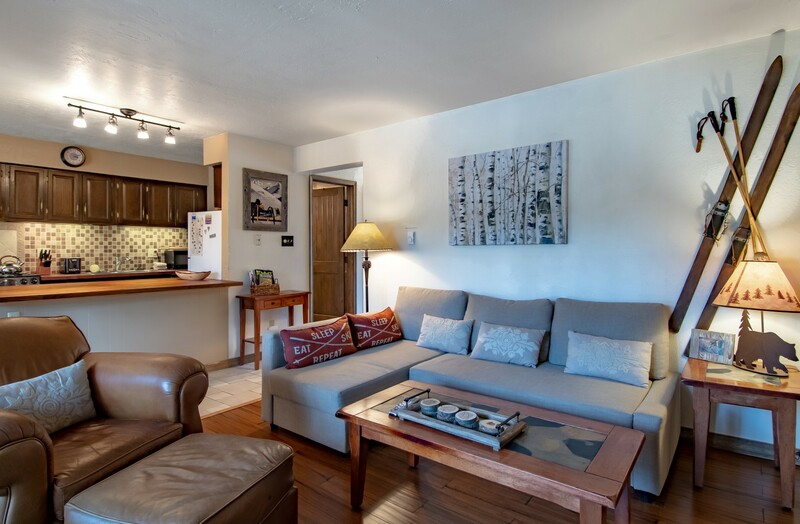 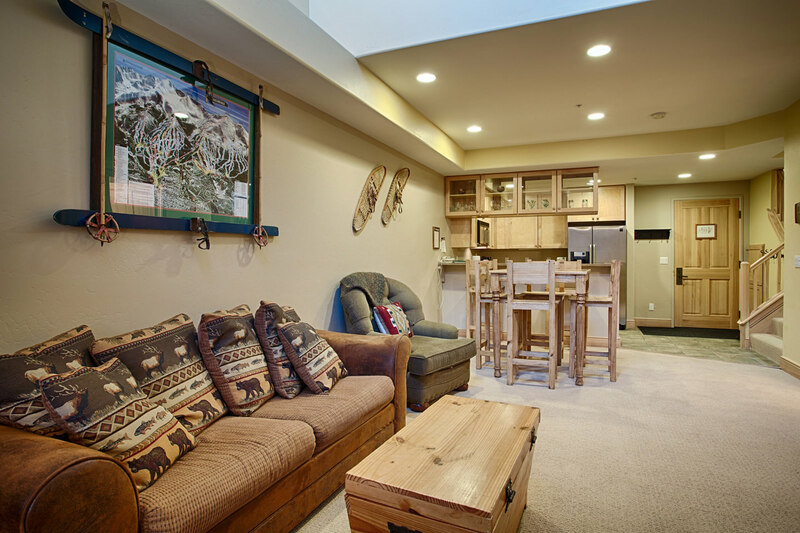 Nestled in a wooded area, these units are beneath towering Blue Spruce trees that will truly enhance the Colorado experience as you relax on your private balcony. 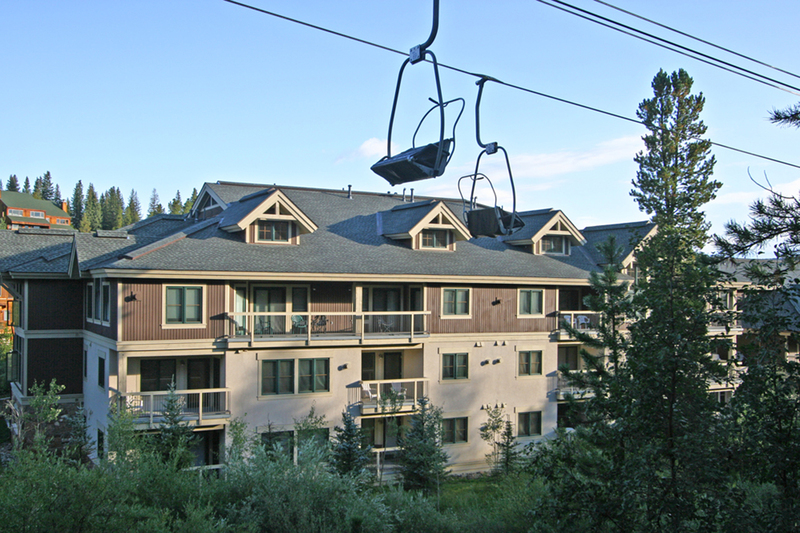 Less than a five minute walk to the Quicksilver Super Chair at the Peak 9 Base Area, take a quick stroll over a bridge and start your ski day. 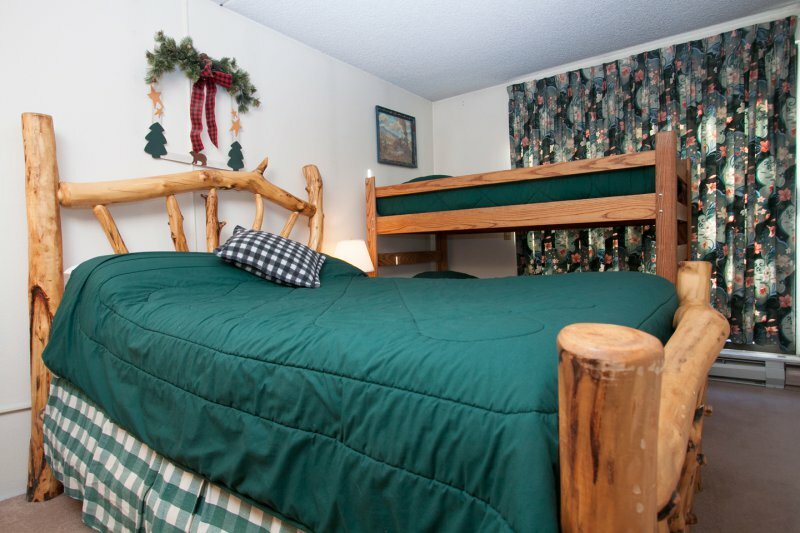 When you’re done ski down to the base and walk back across the bridge to the complex and take retreat in your unit. 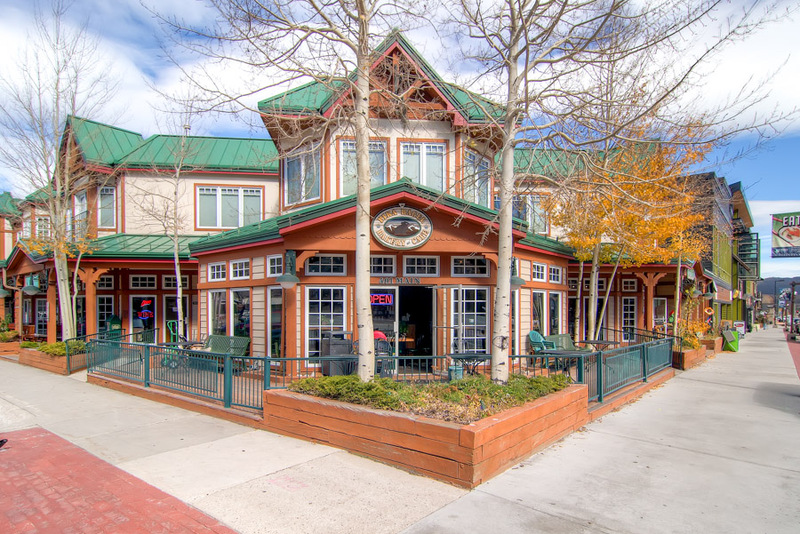 If nightlife is what you are looking for, it is a short walk to the Peak 9 Village and all of the restaurants and shops on Park Avenue and Main Street in the heart of downtown. 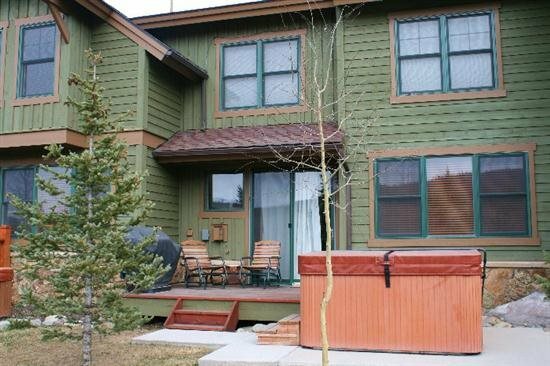 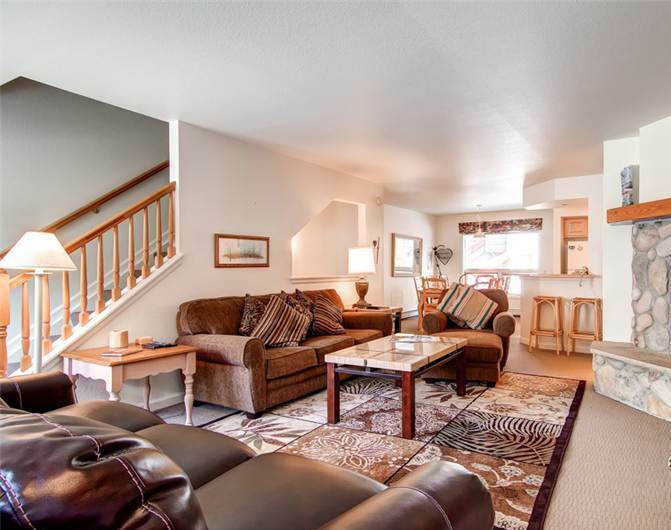 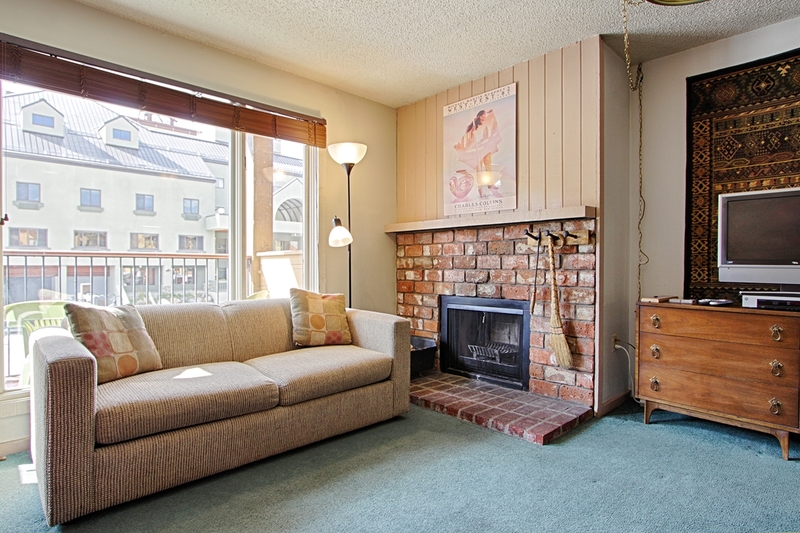 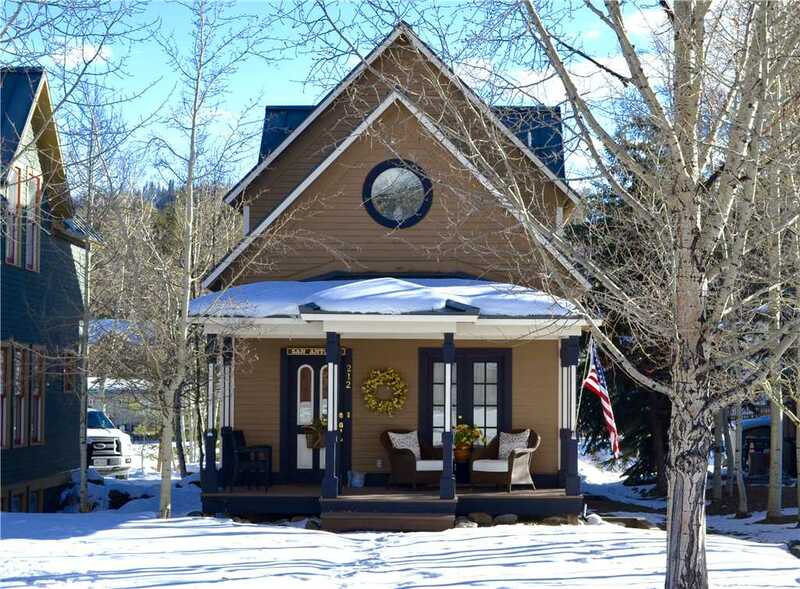 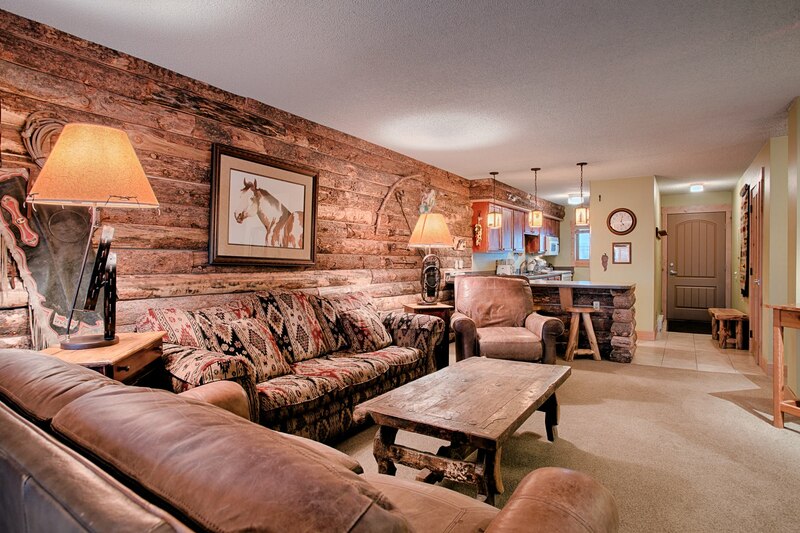 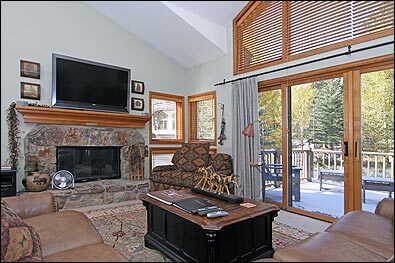 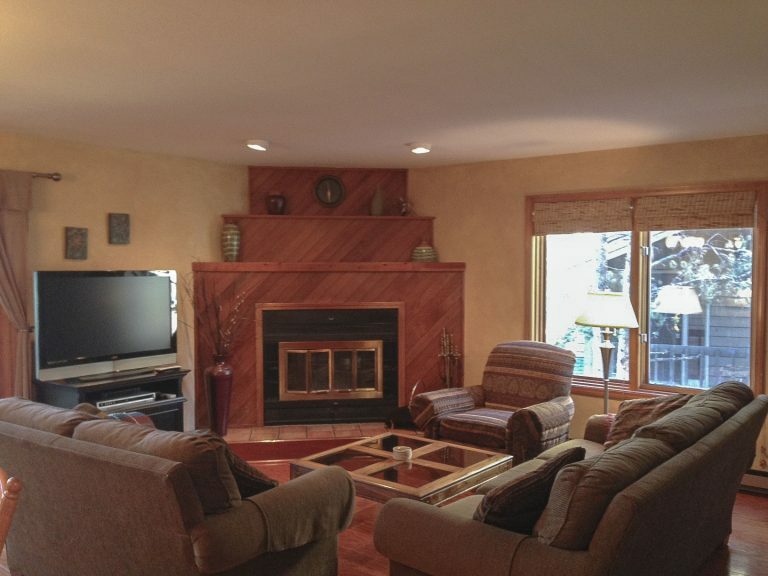 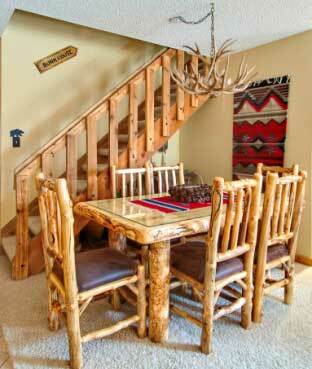 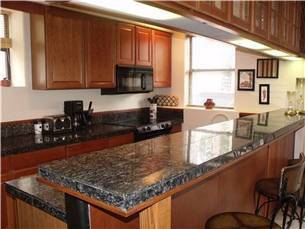 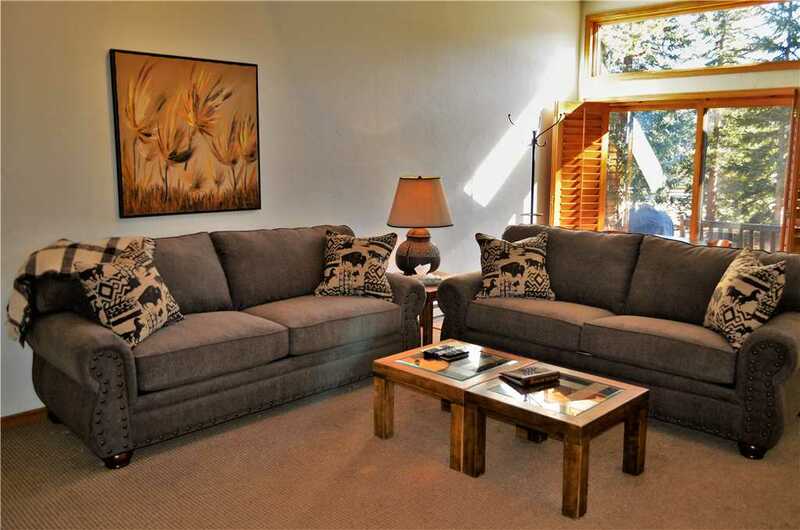 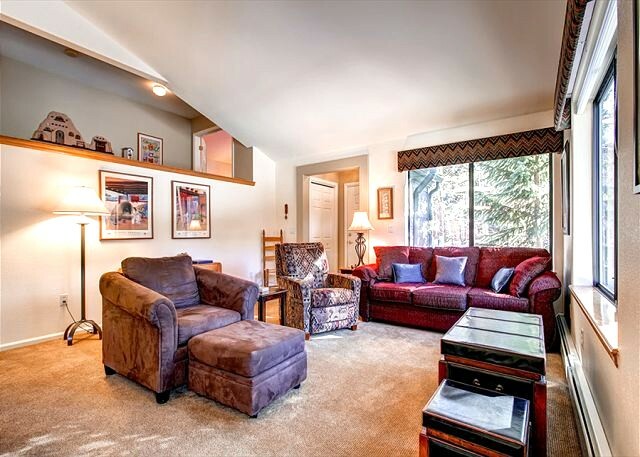 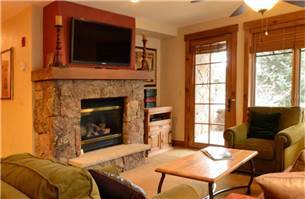 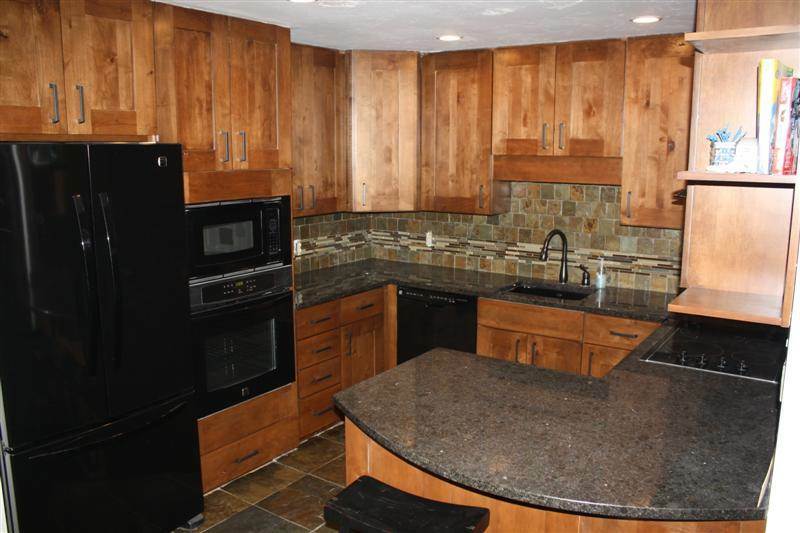 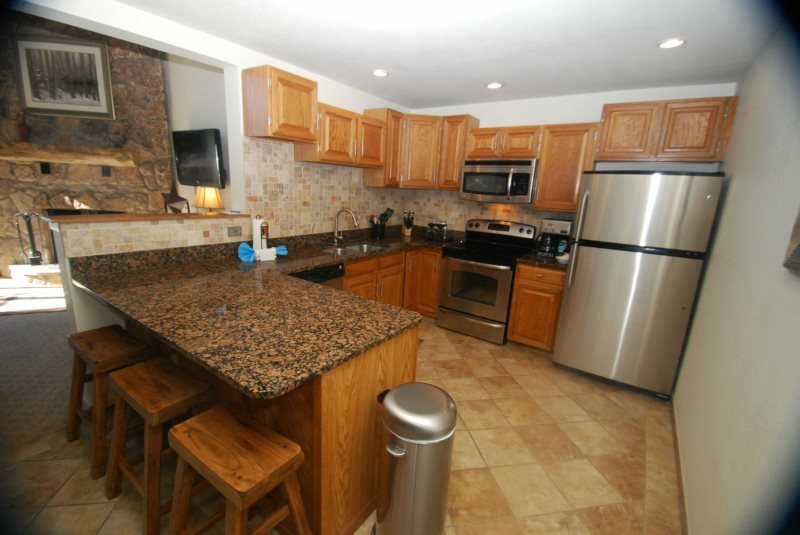 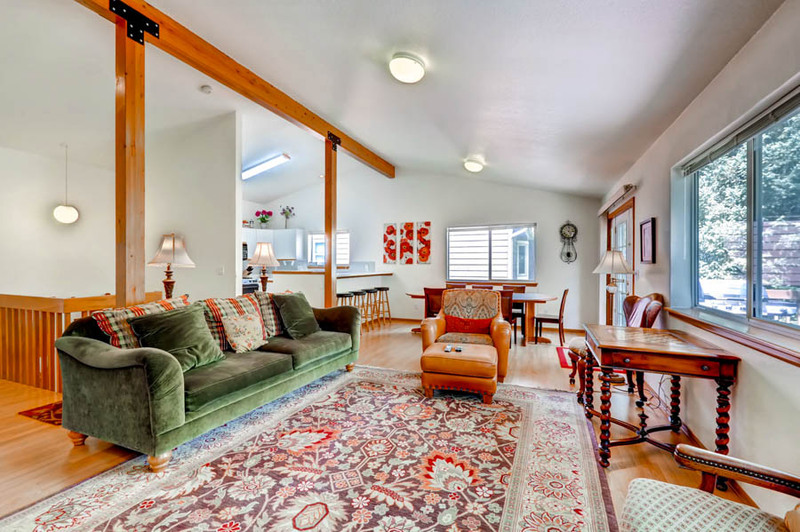 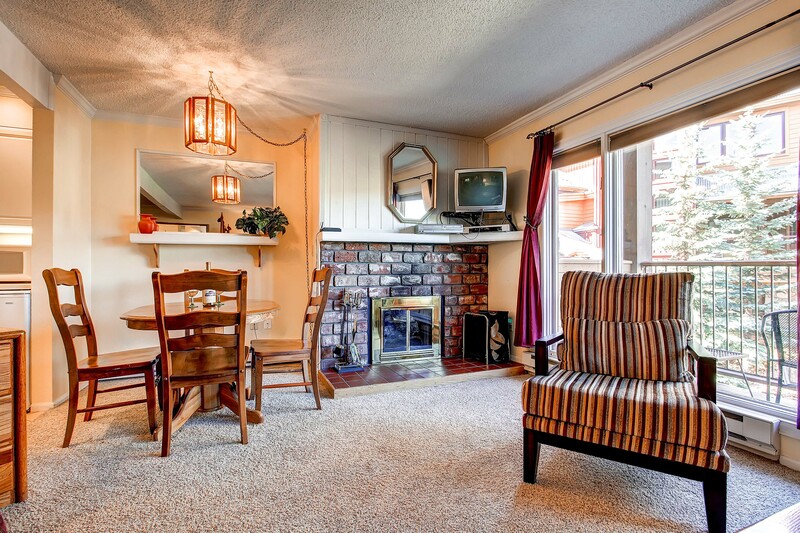 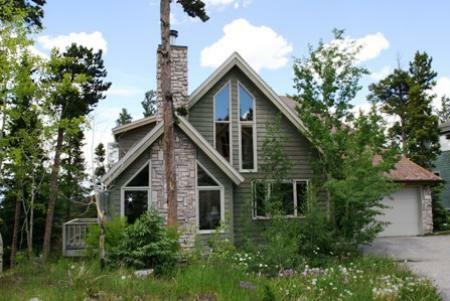 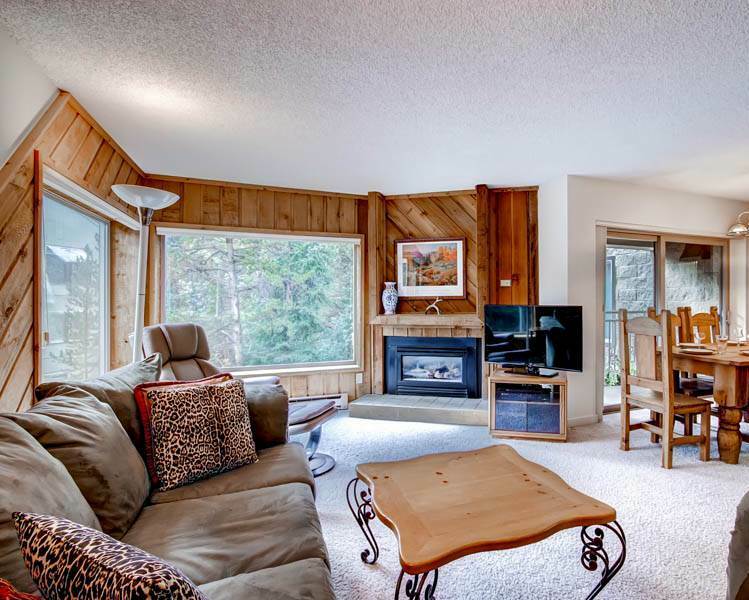 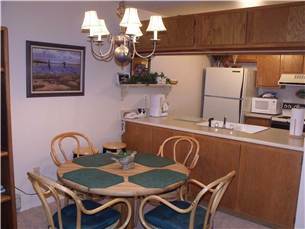 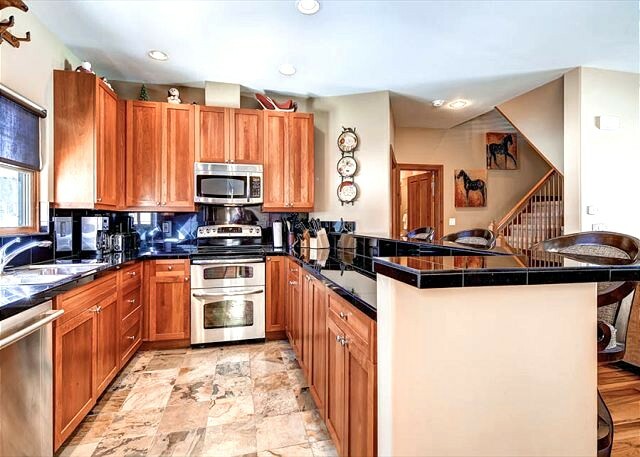 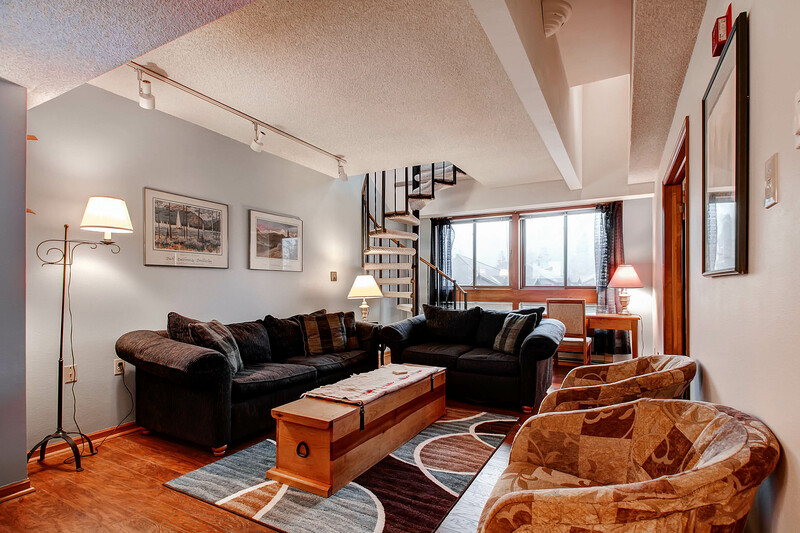 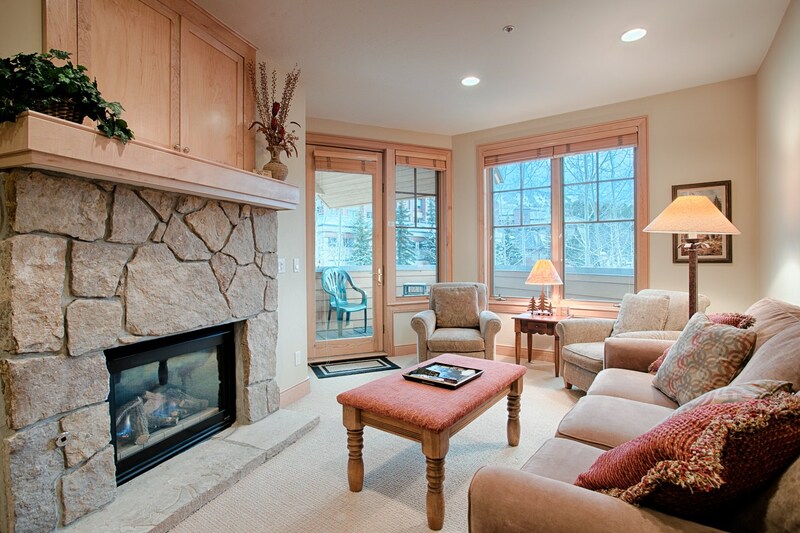 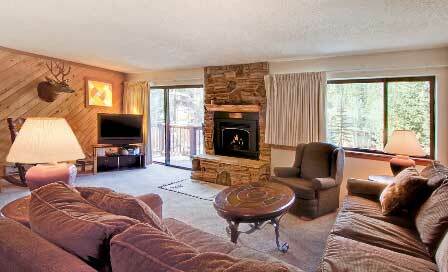 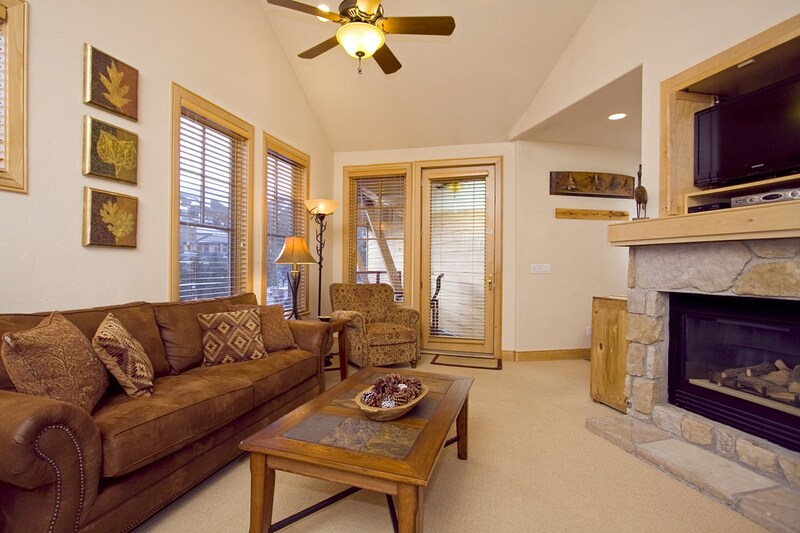 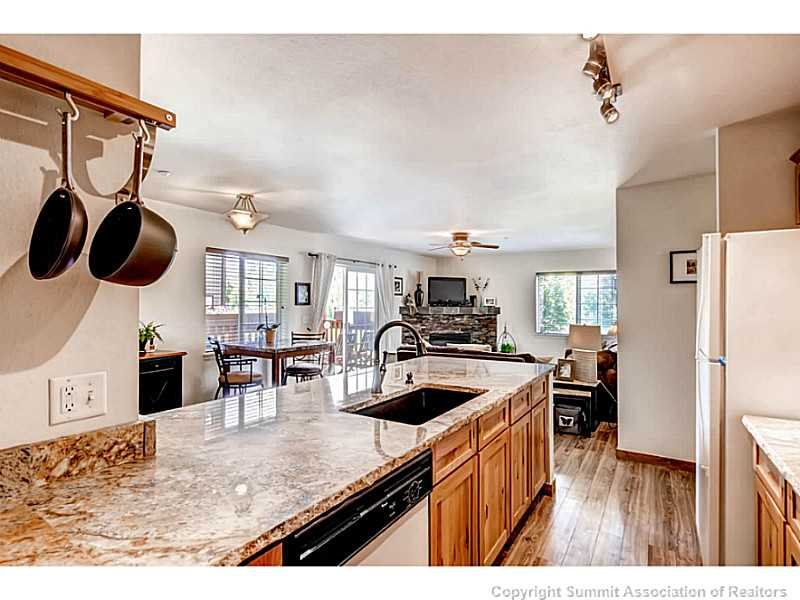 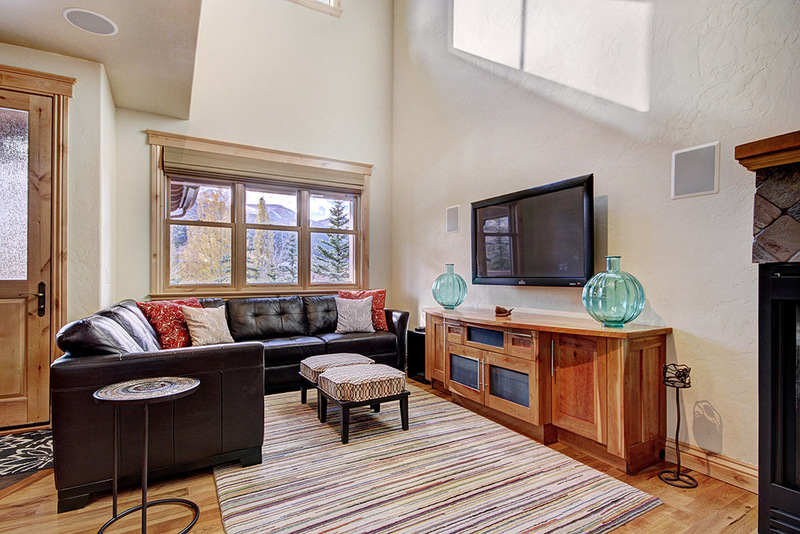 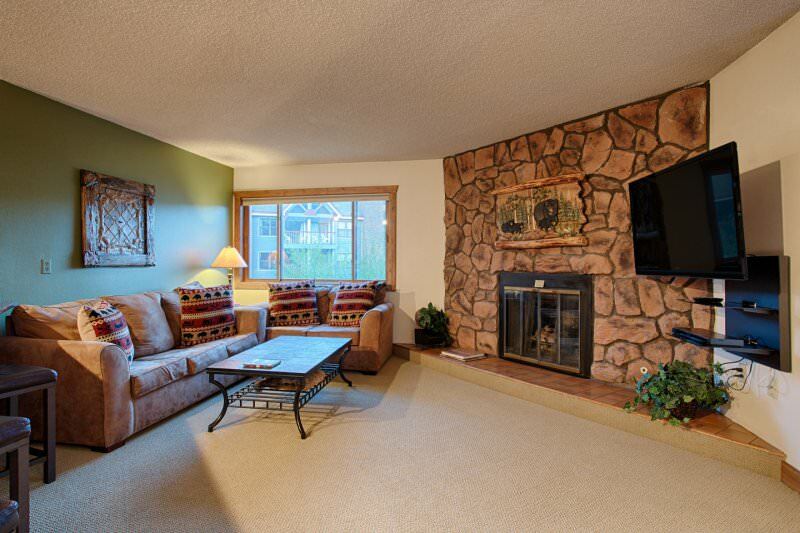 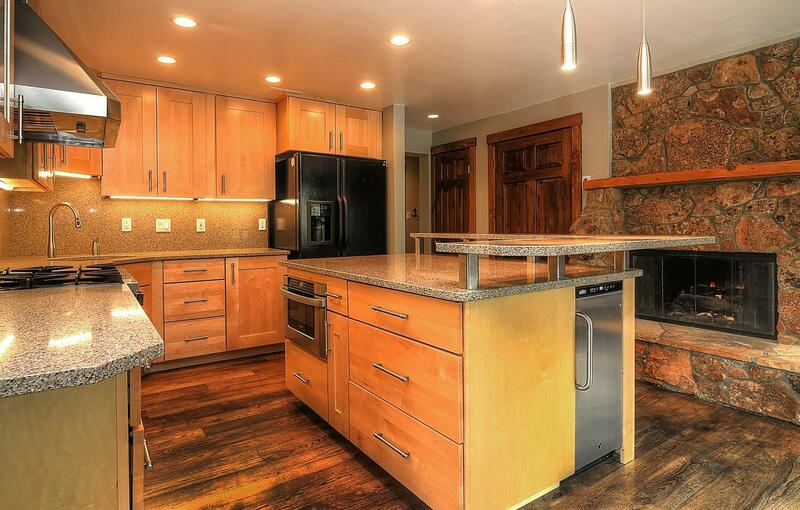 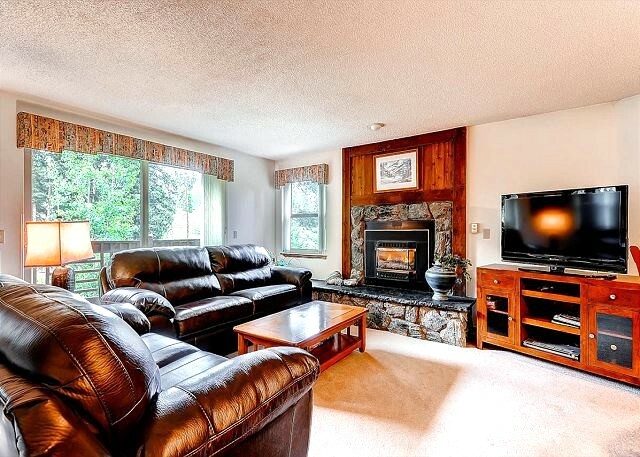 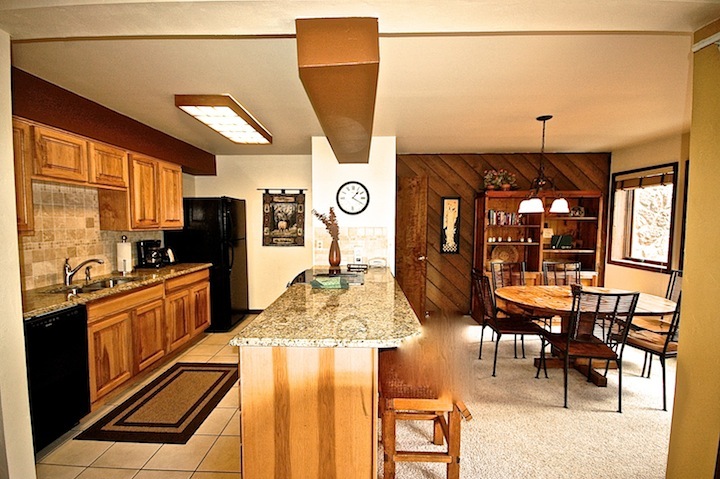 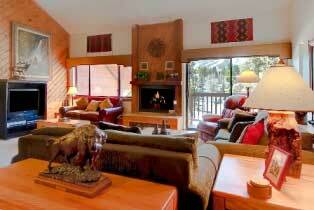 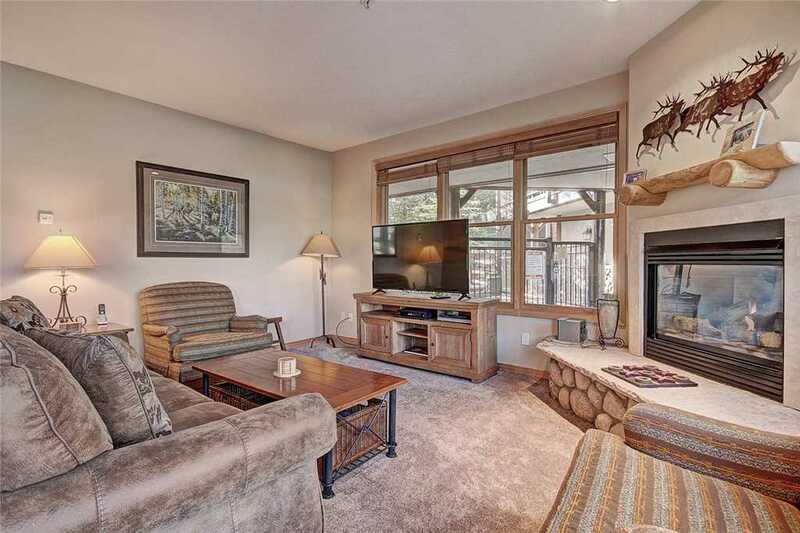 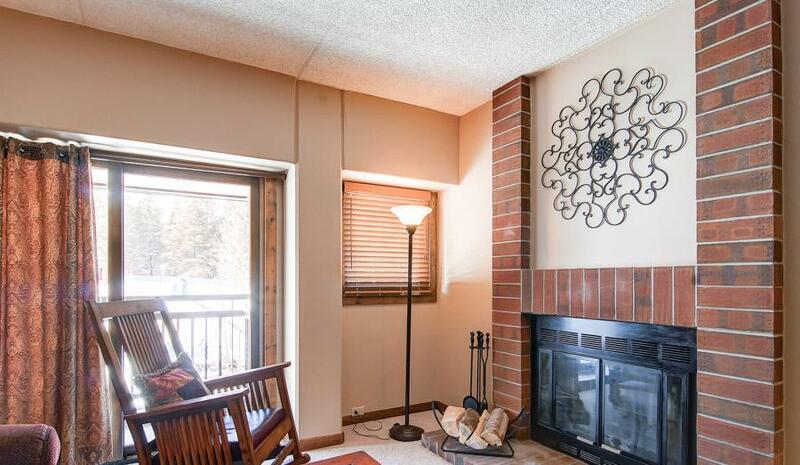 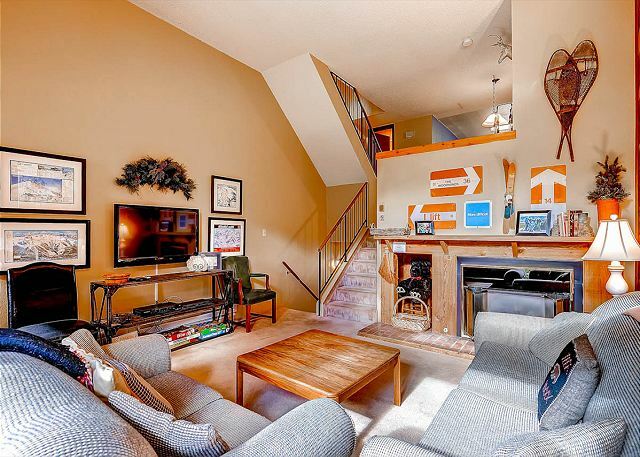 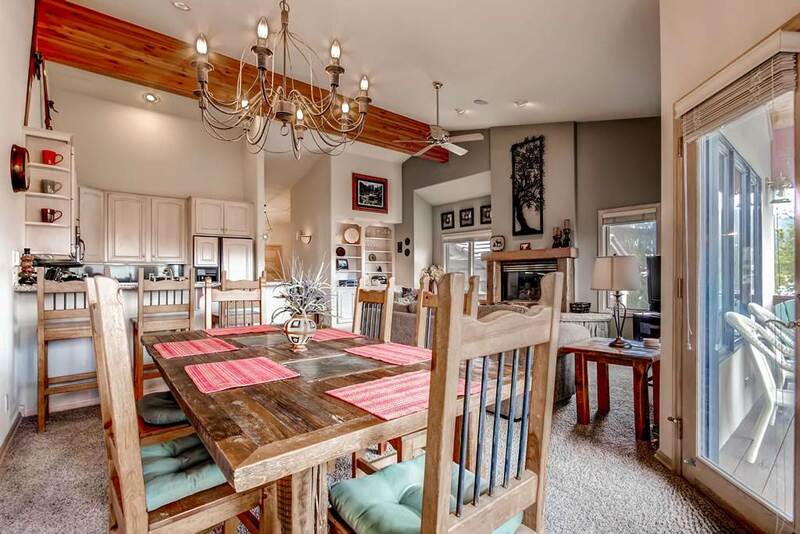 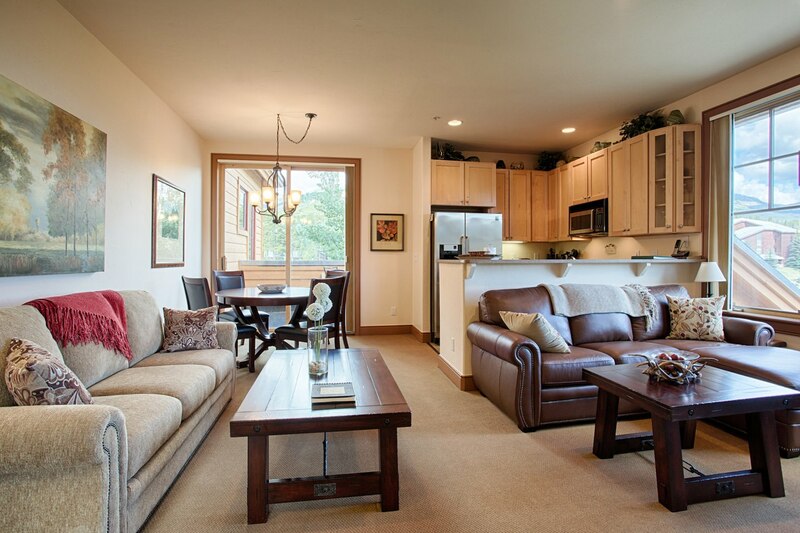 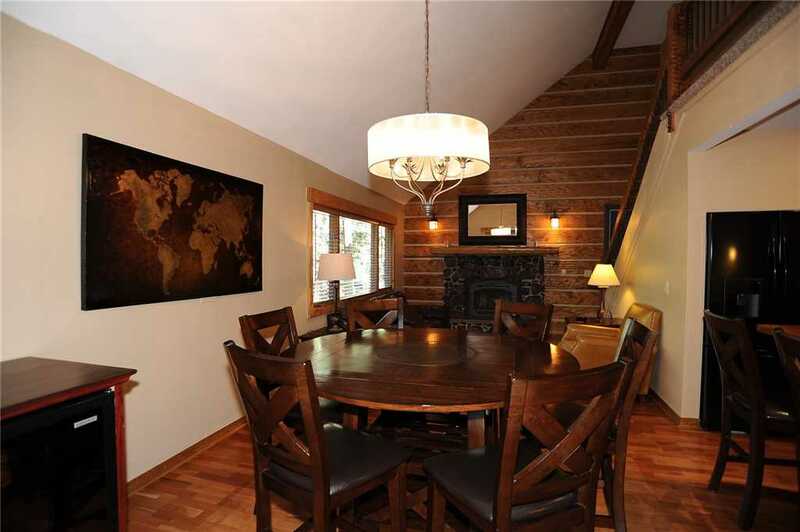 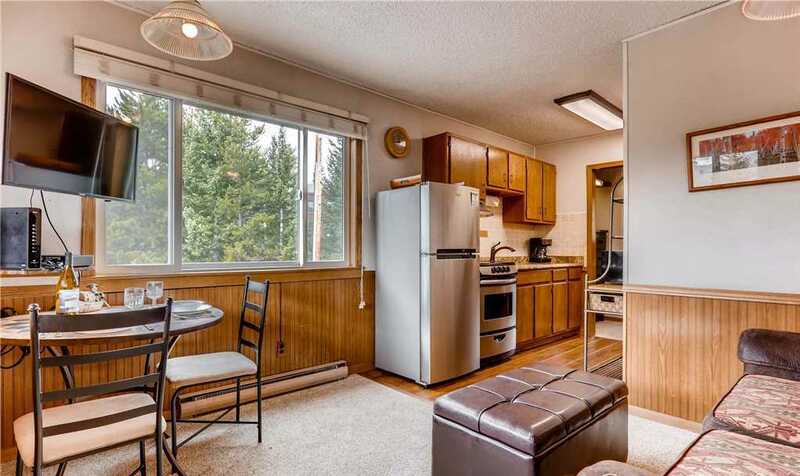 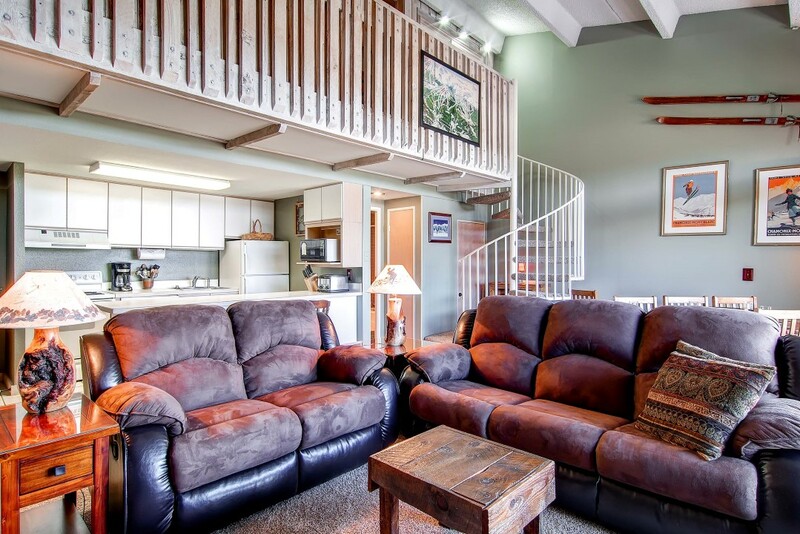 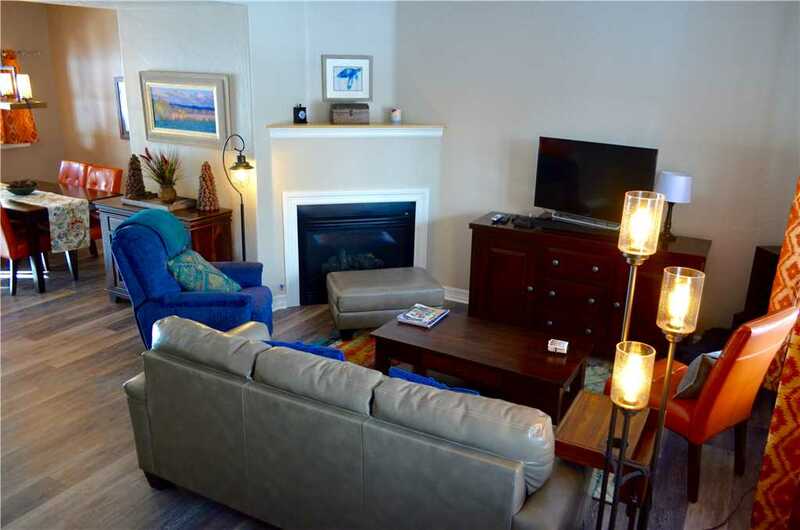 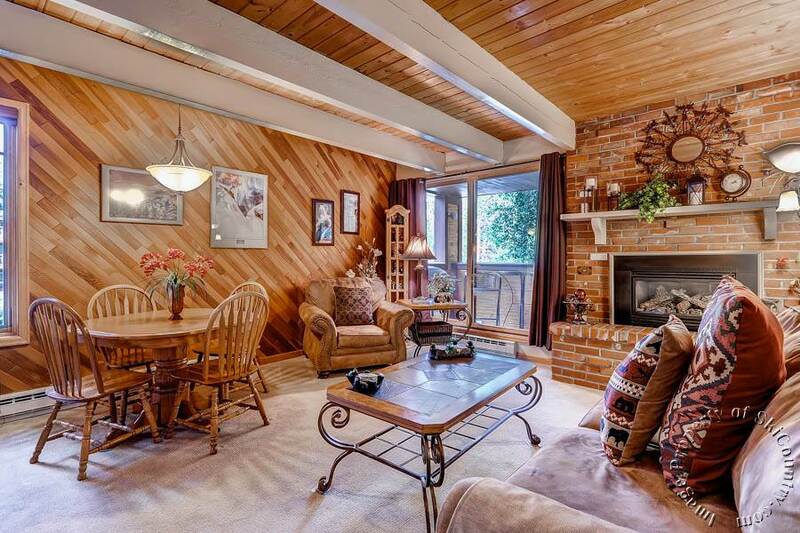 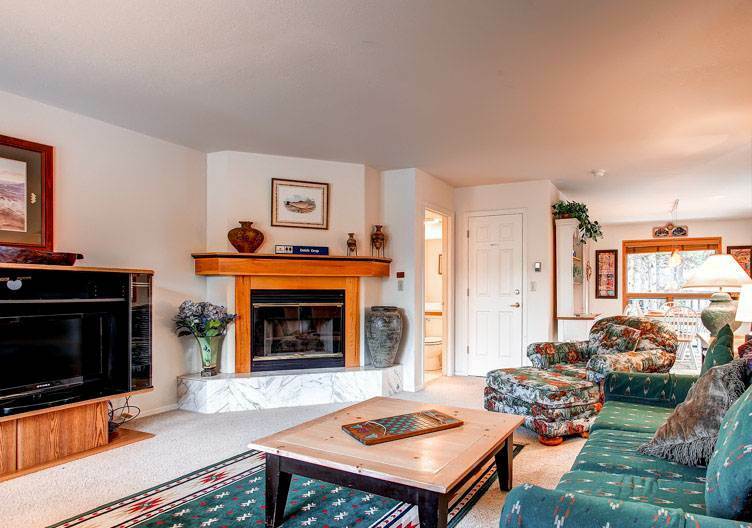 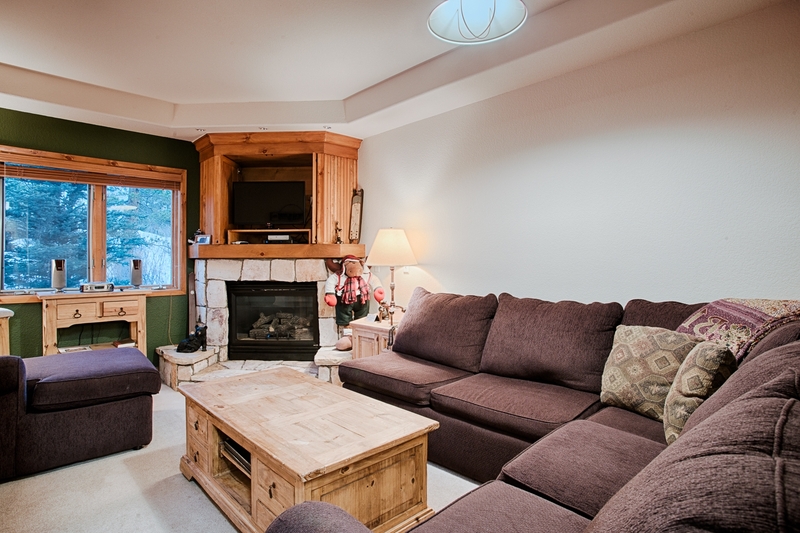 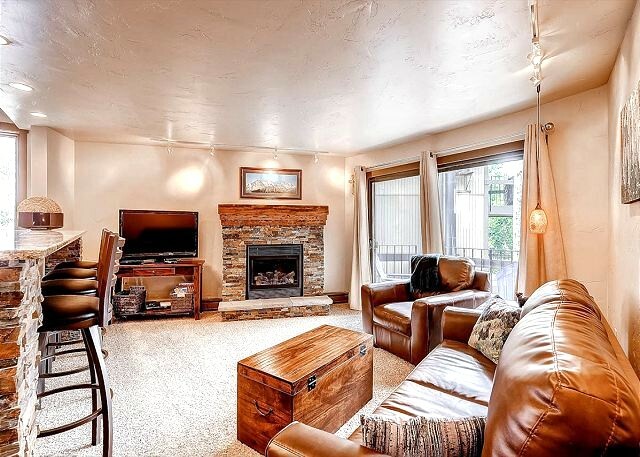 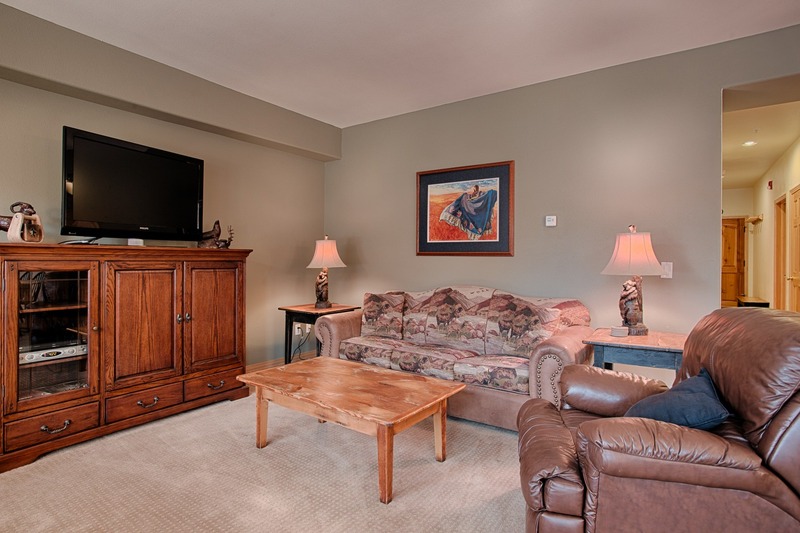 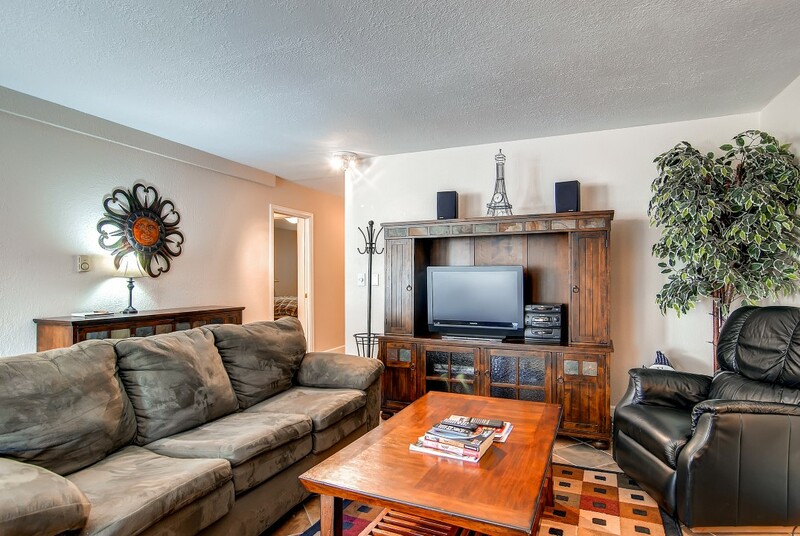 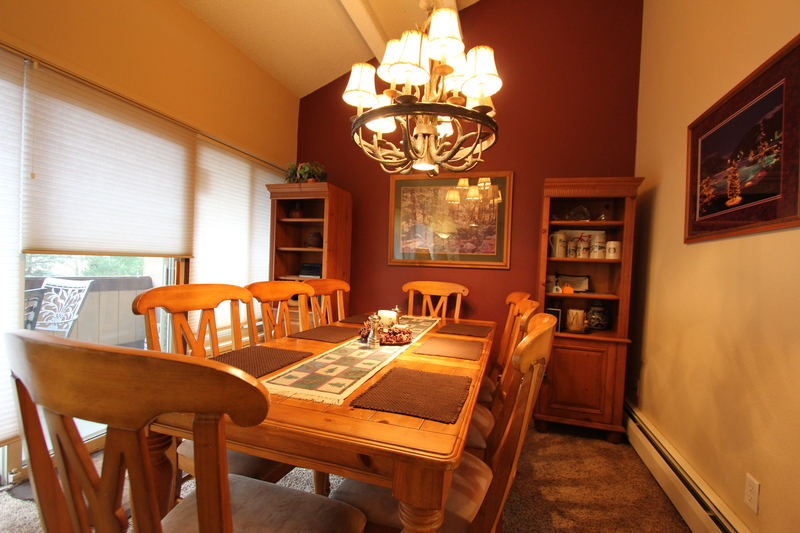 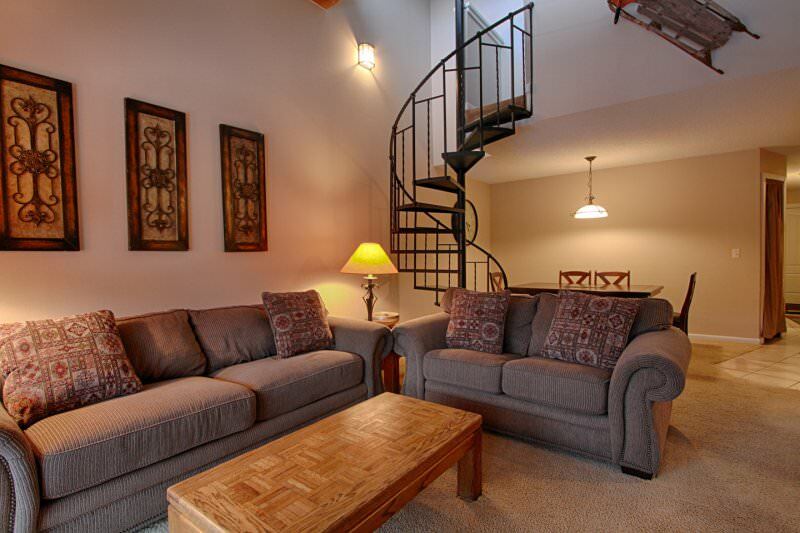 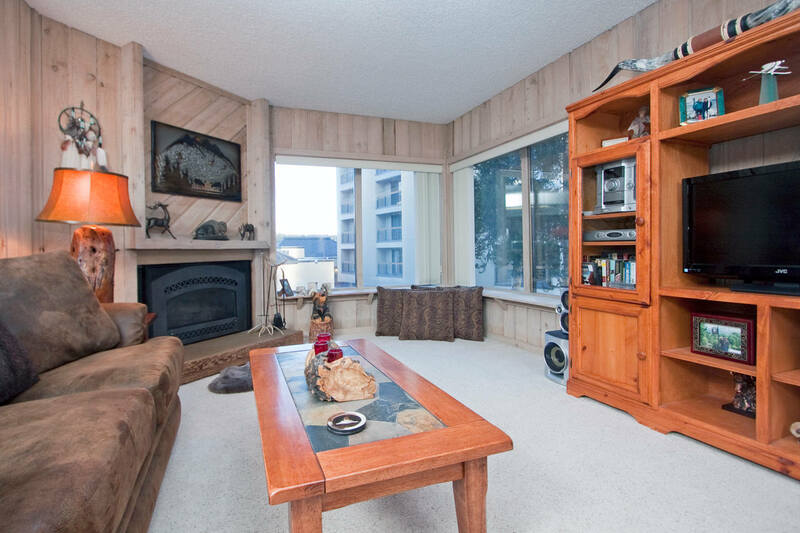 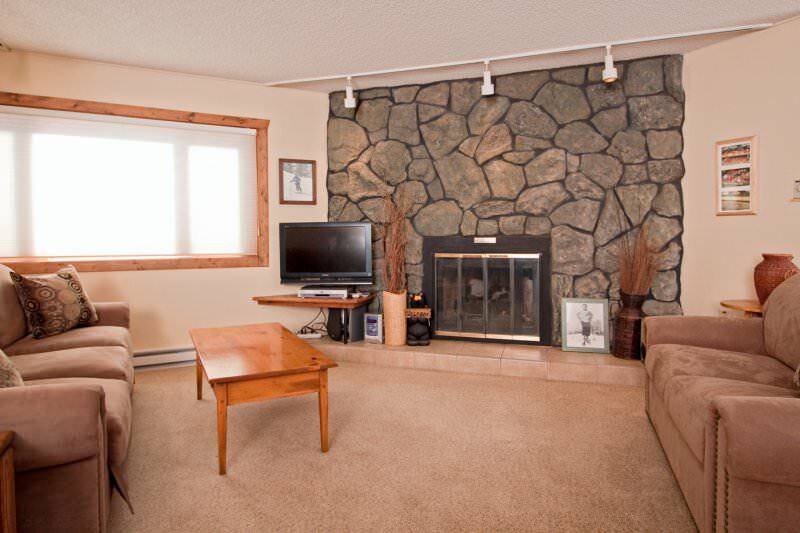 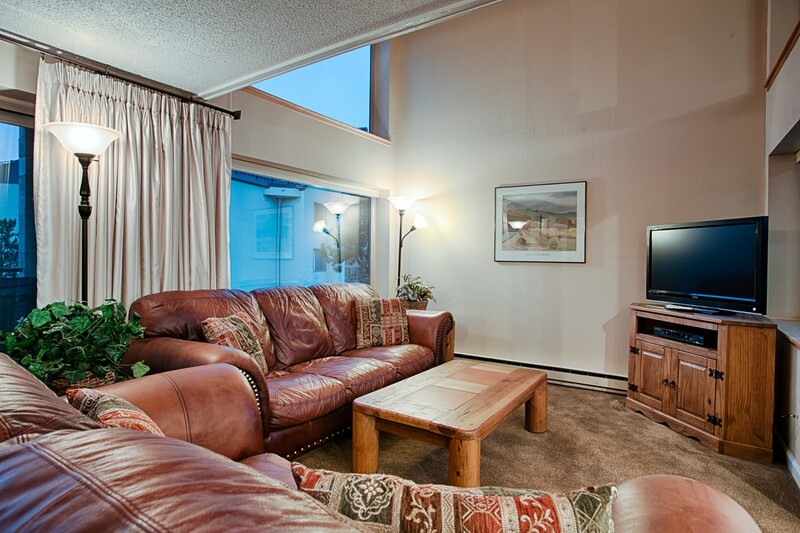 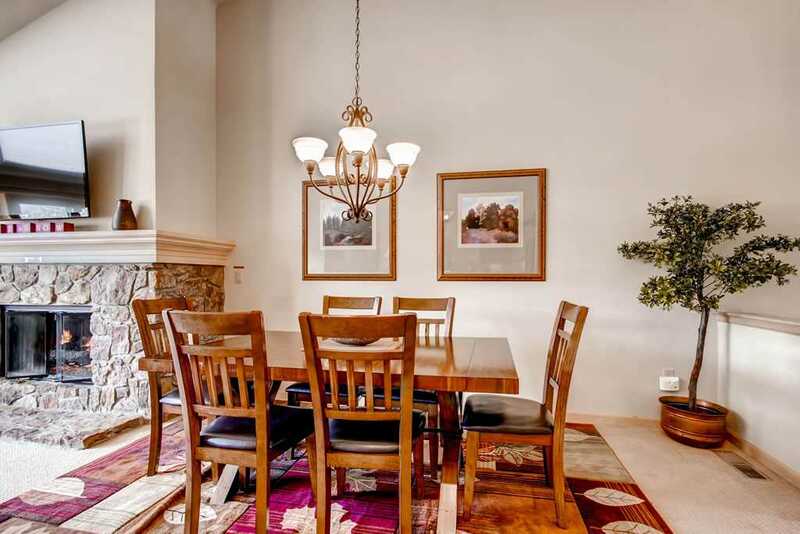 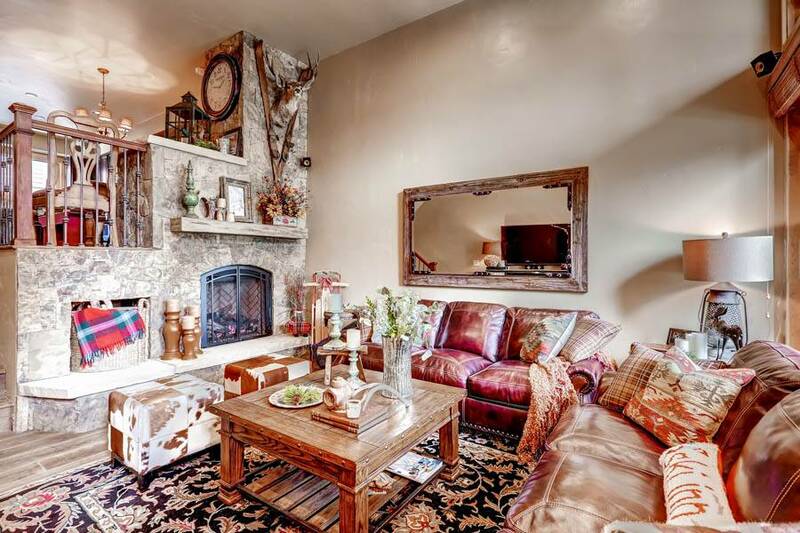 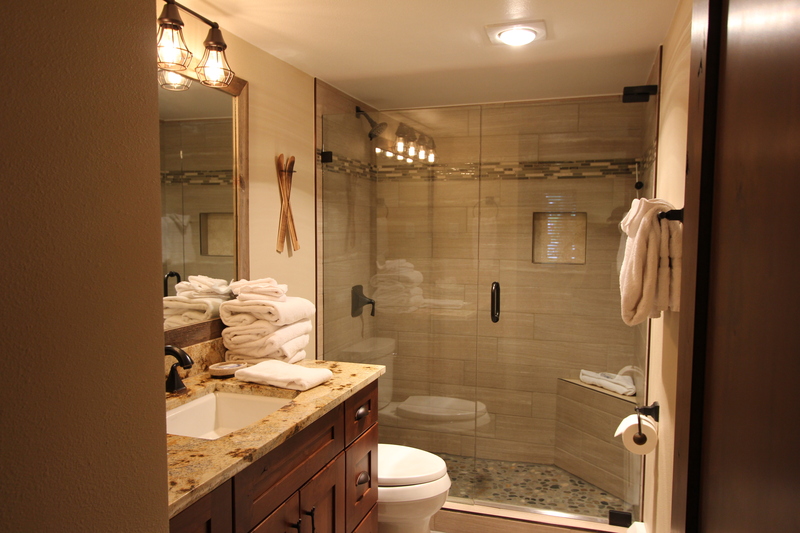 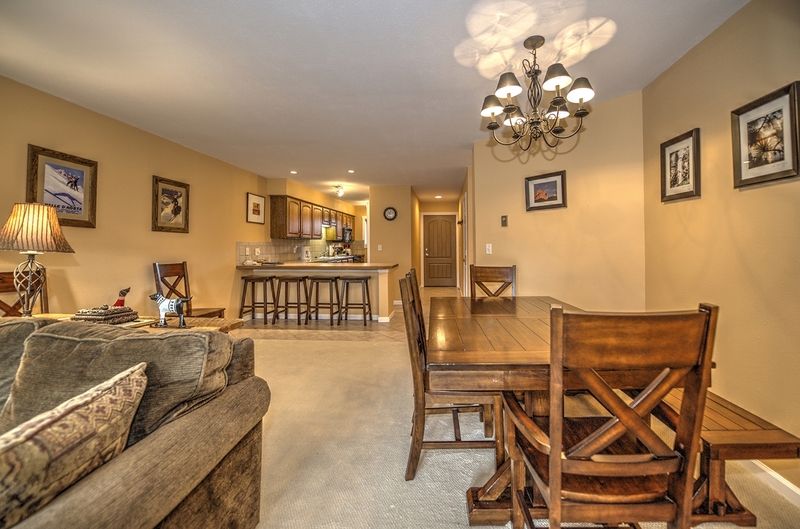 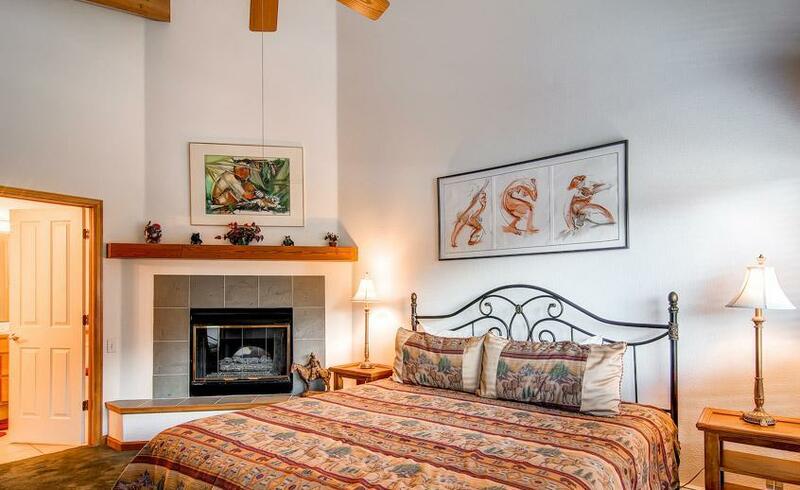 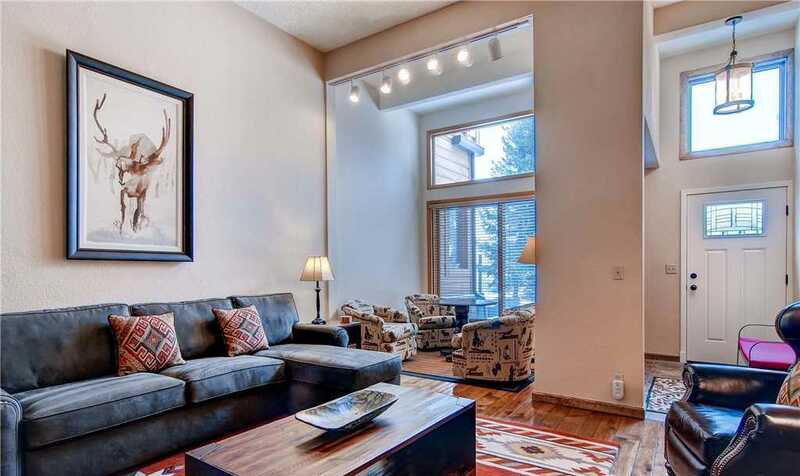 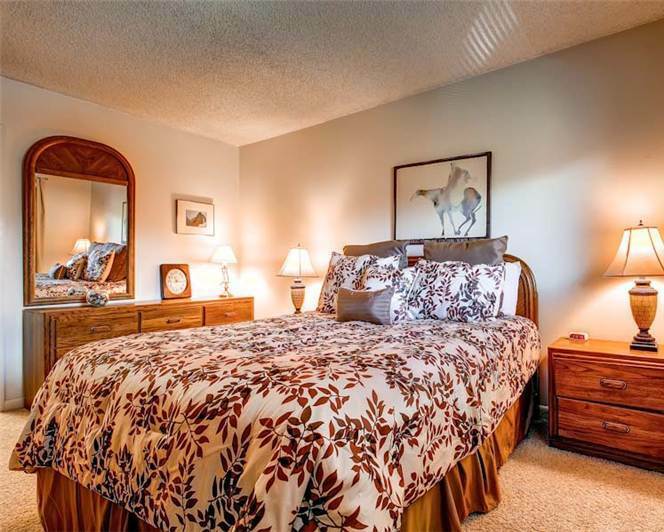 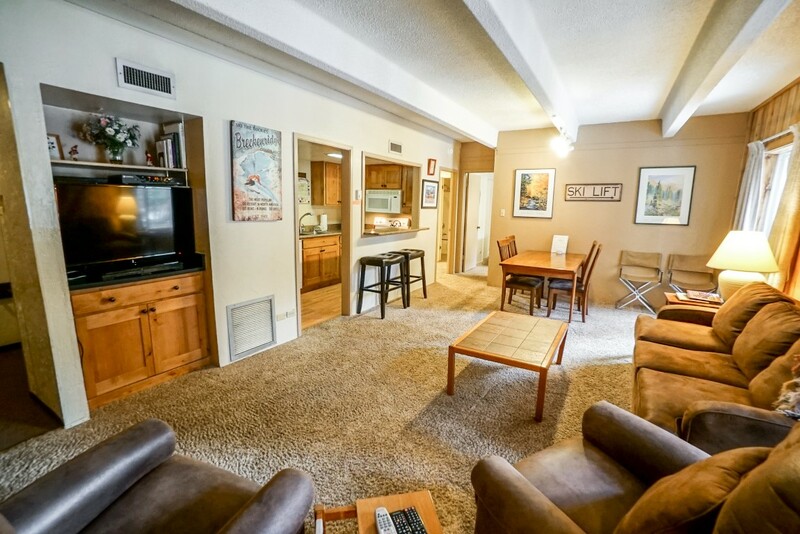 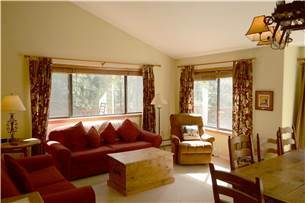 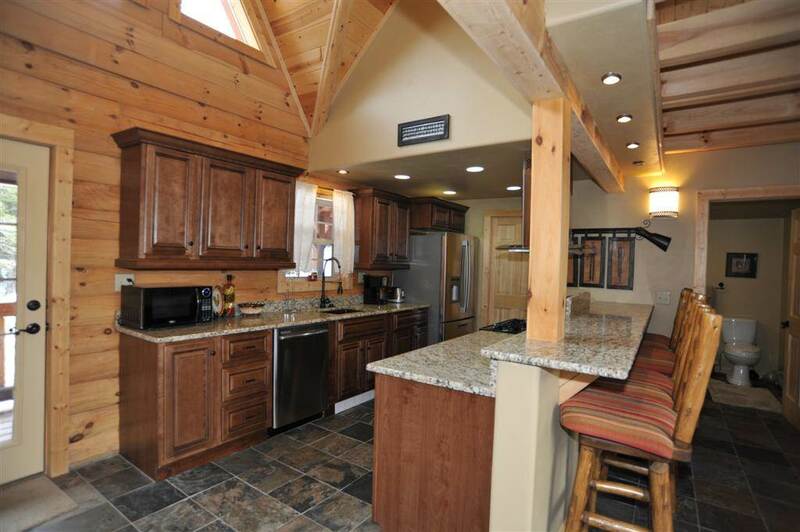 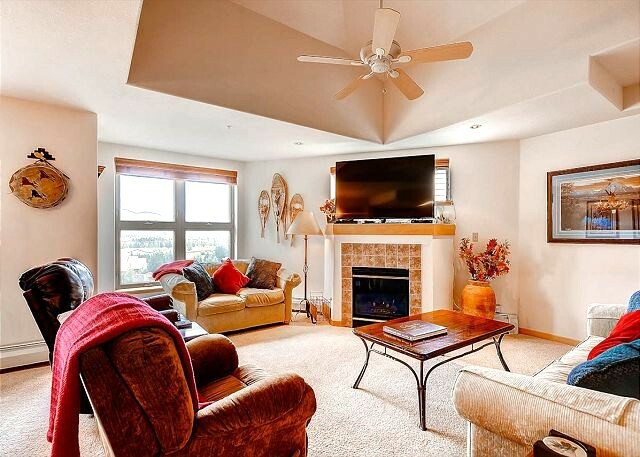 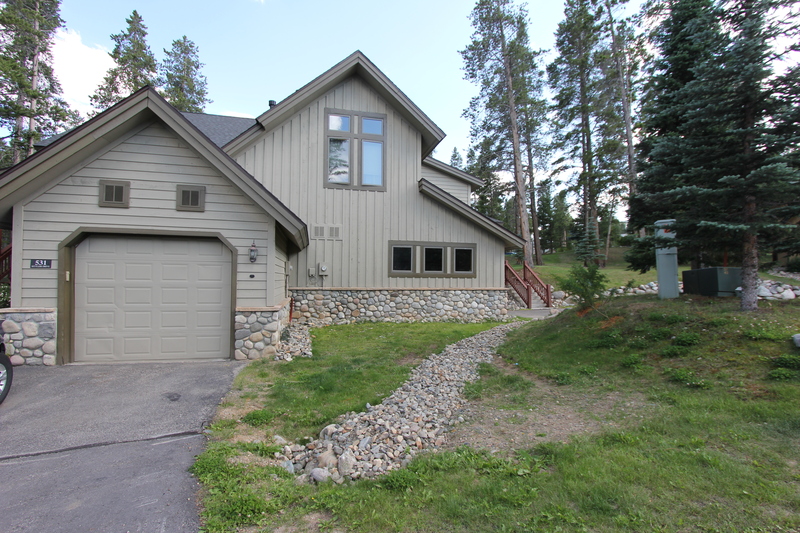 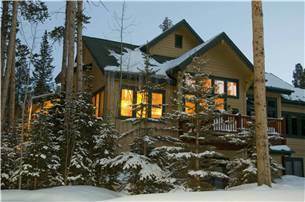 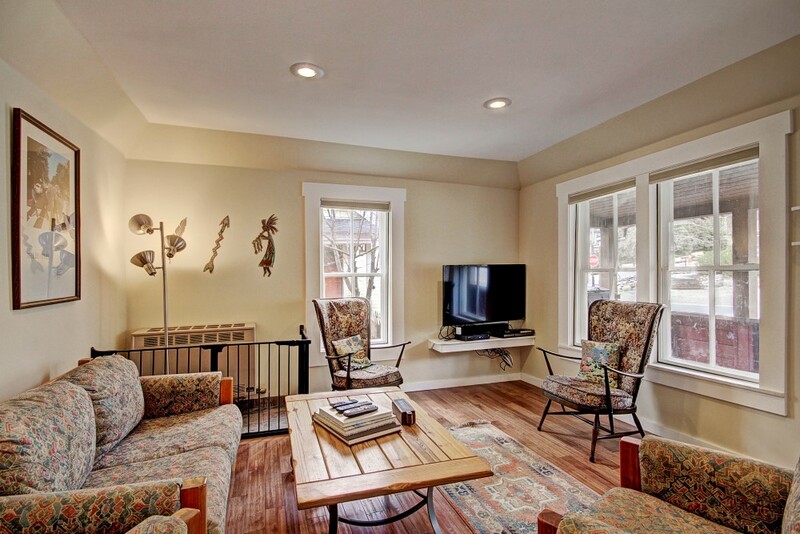 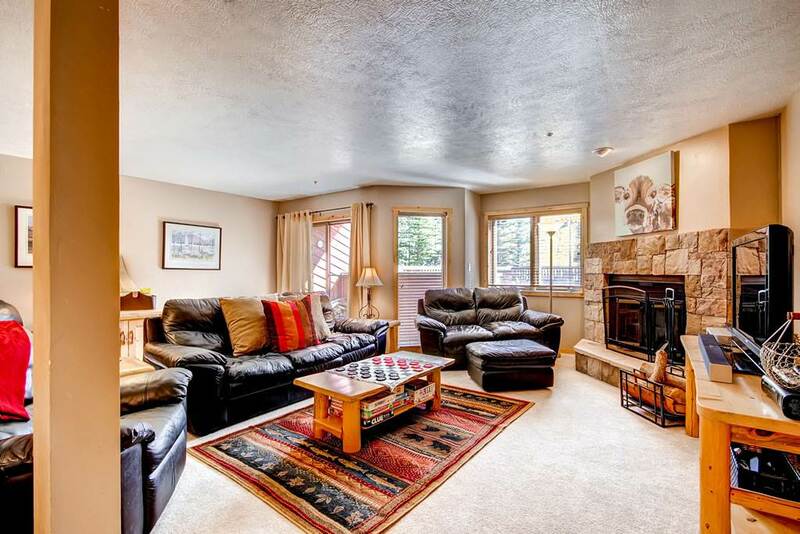 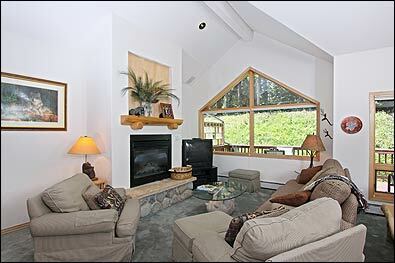 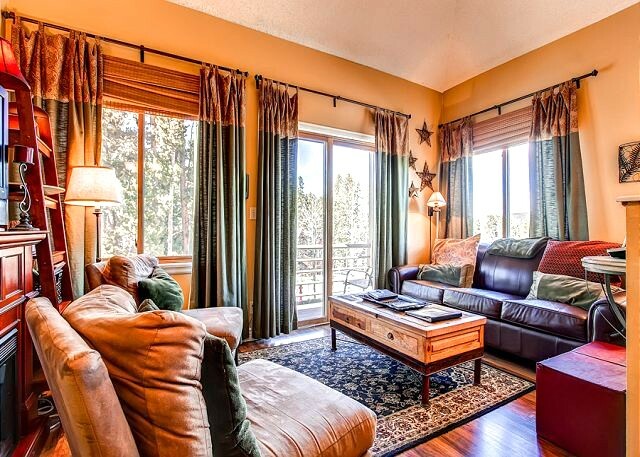 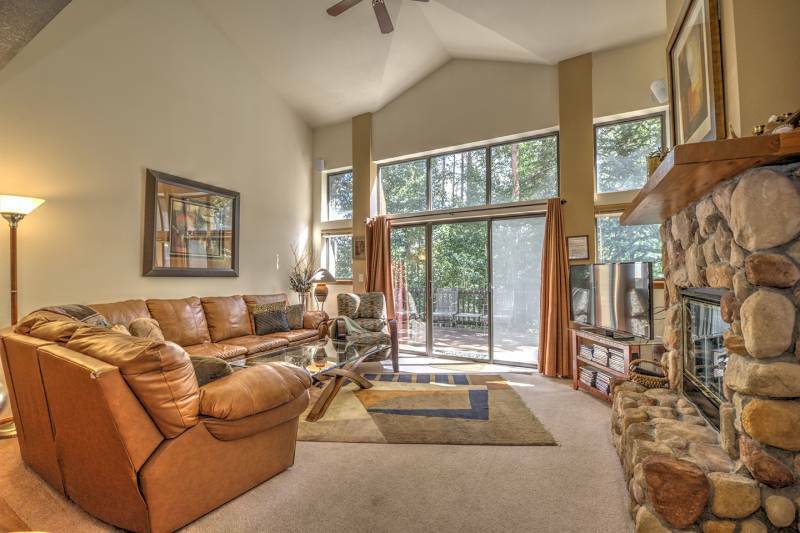 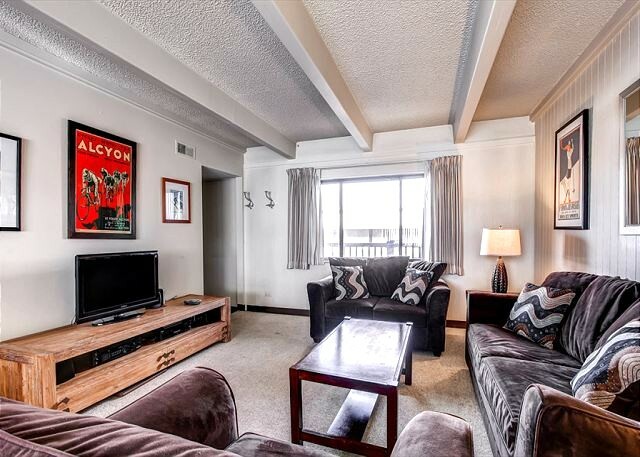 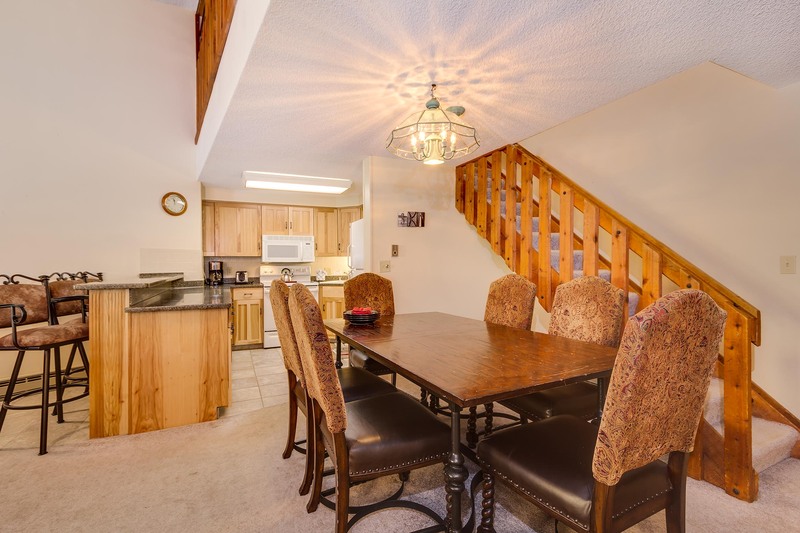 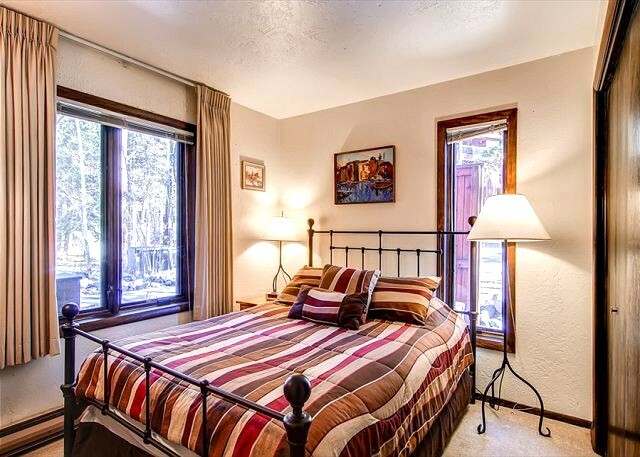 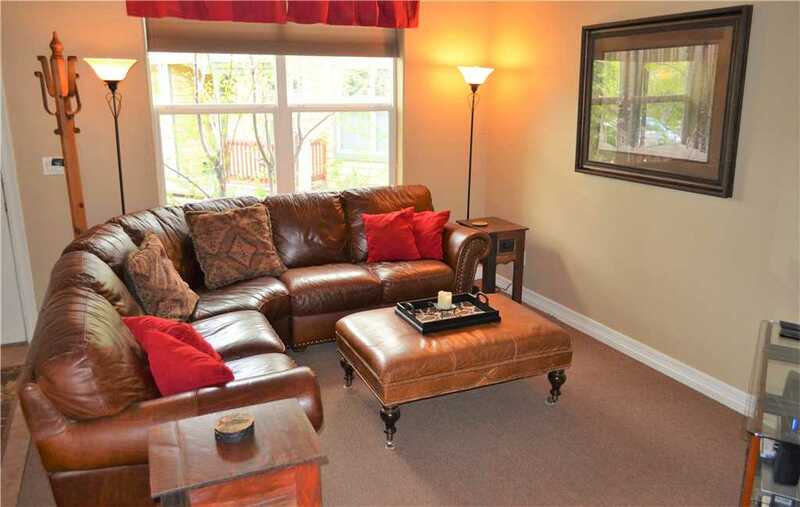 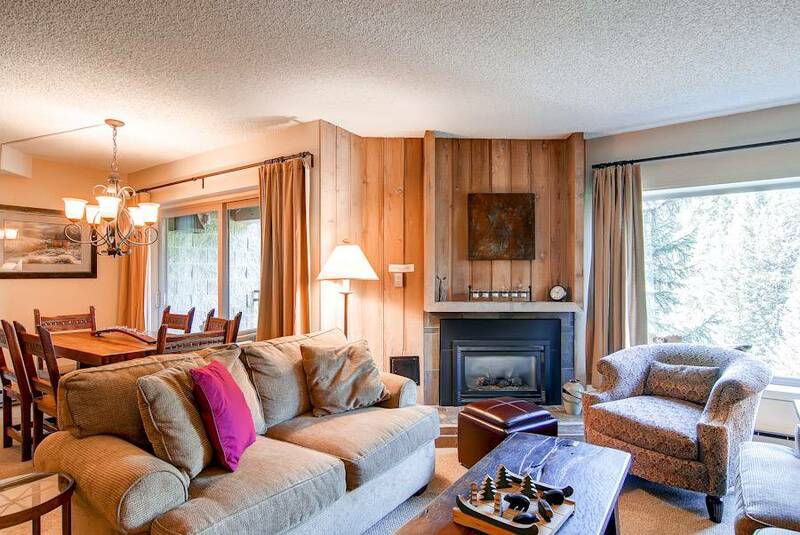 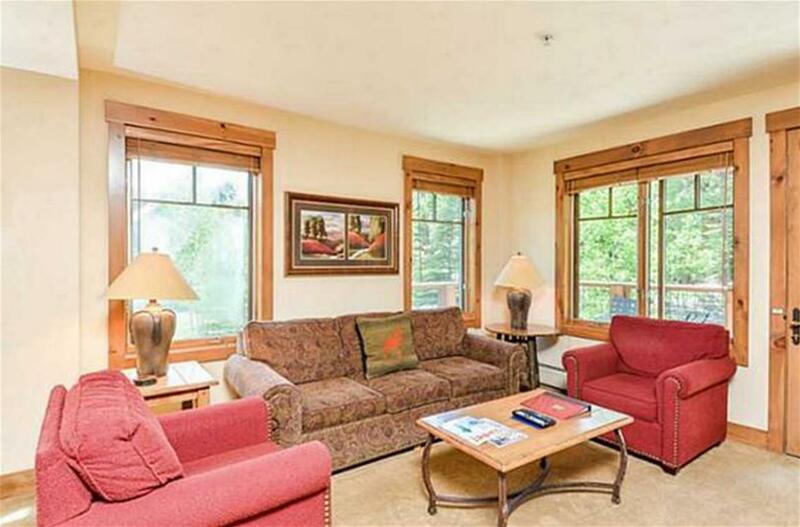 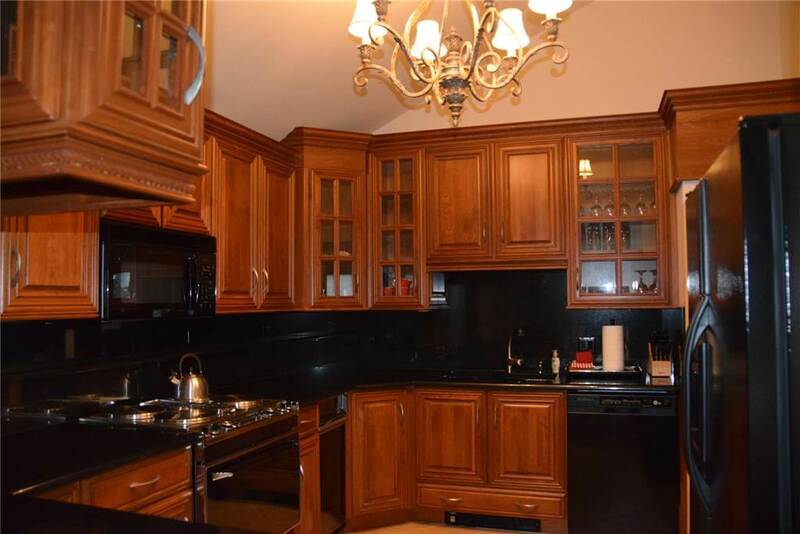 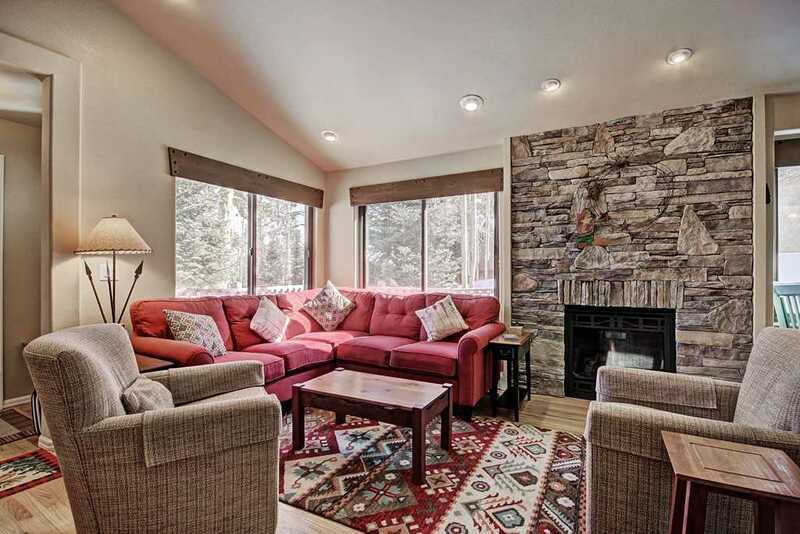 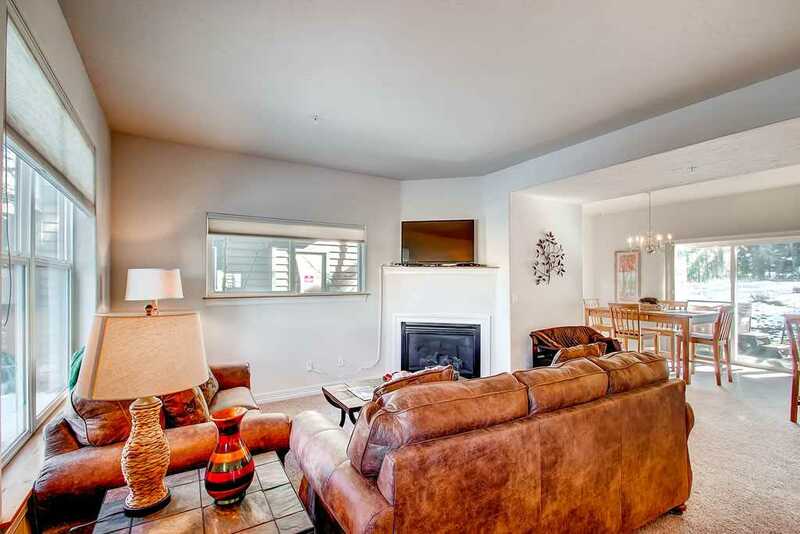 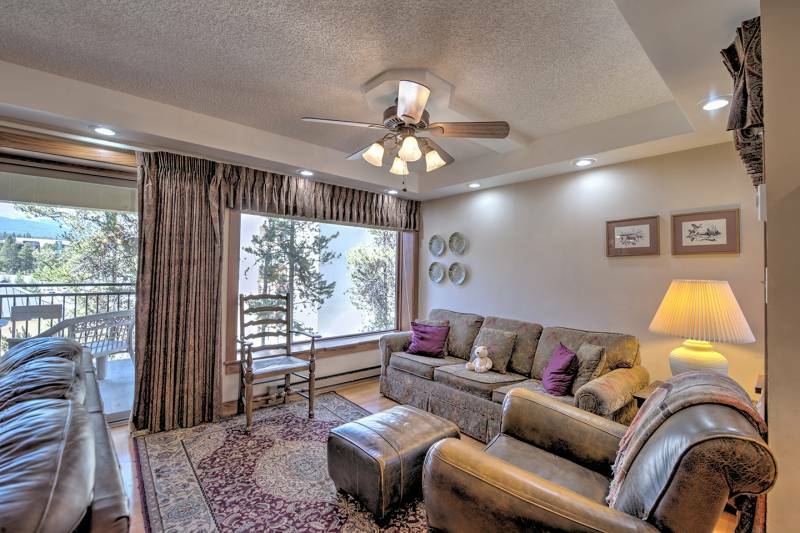 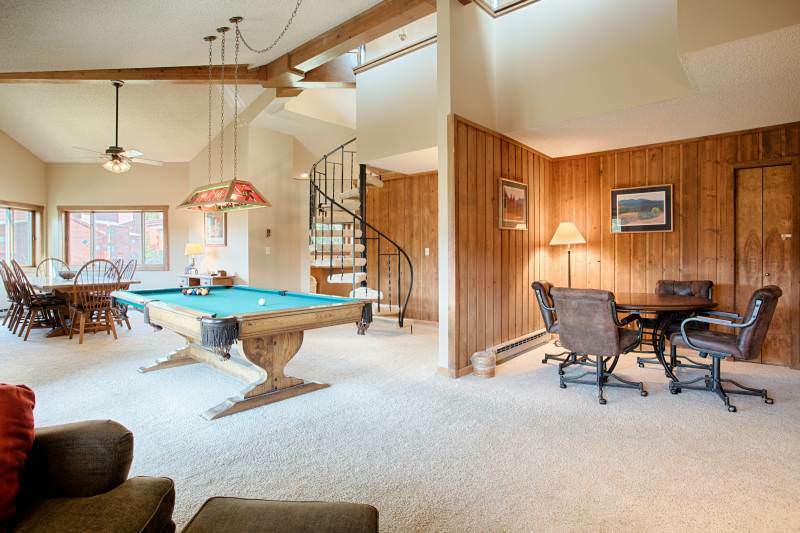 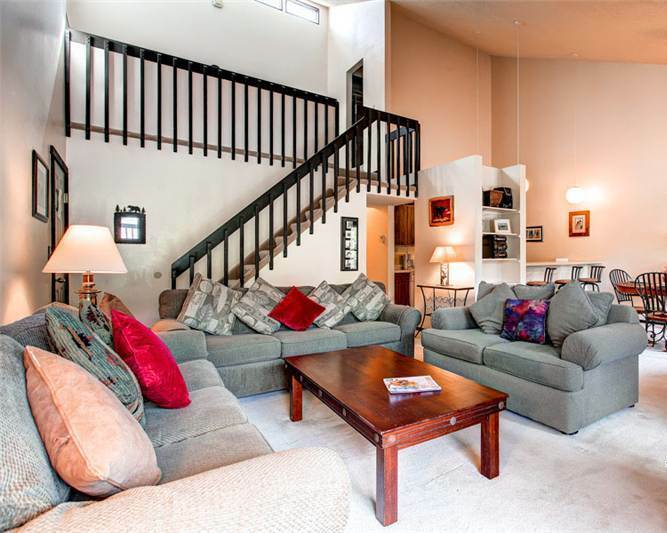 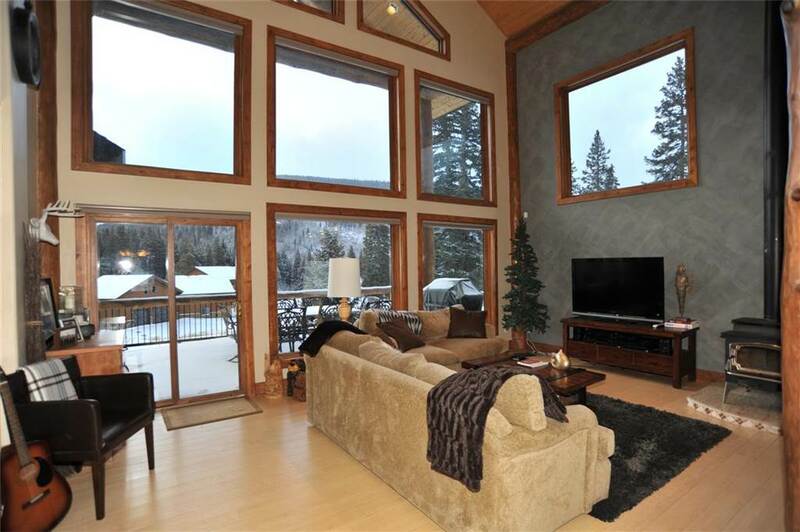 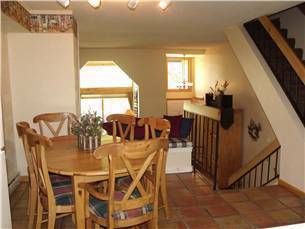 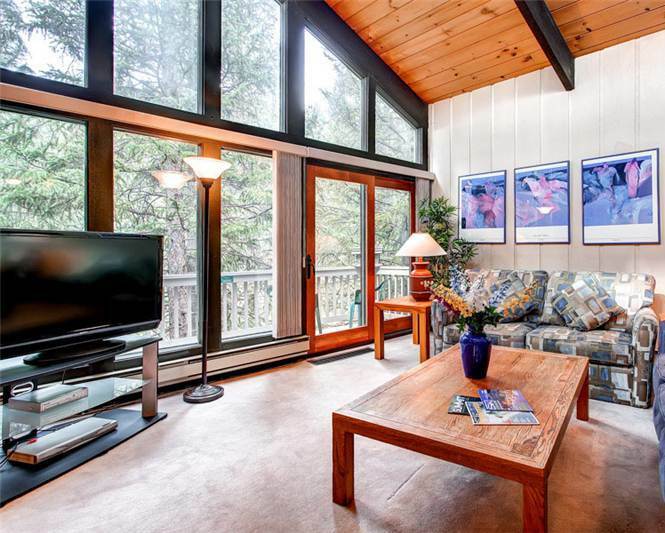 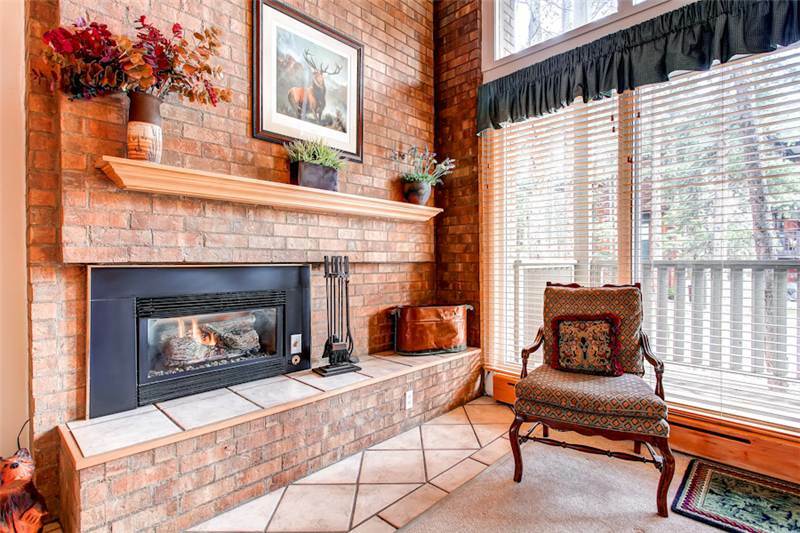 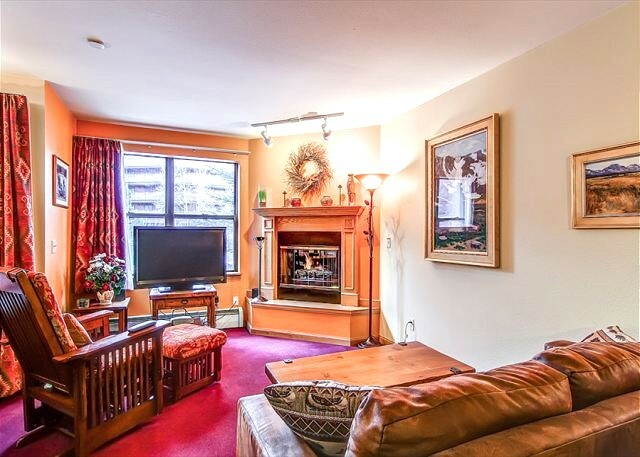 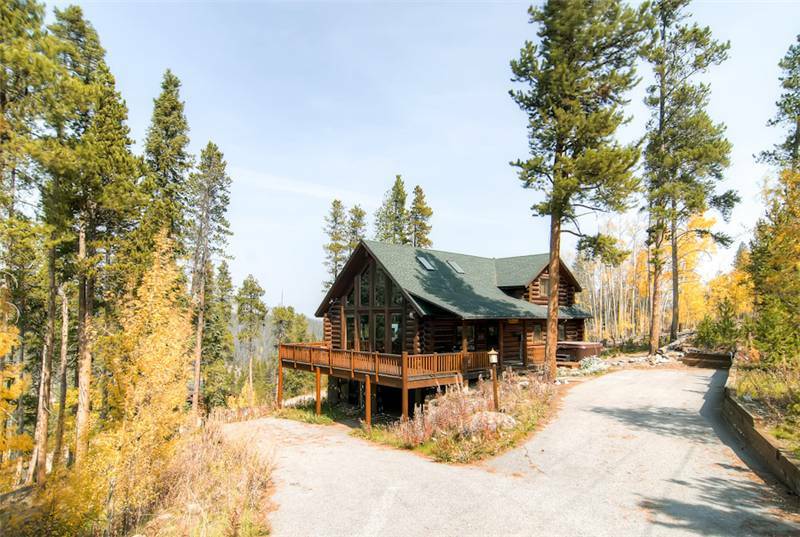 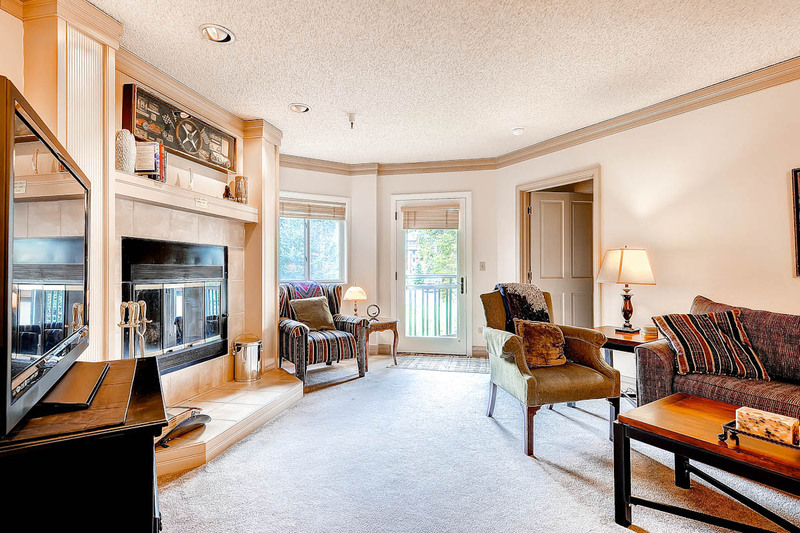 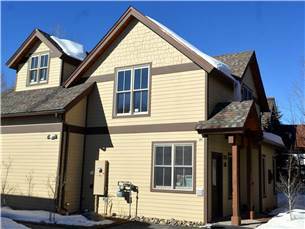 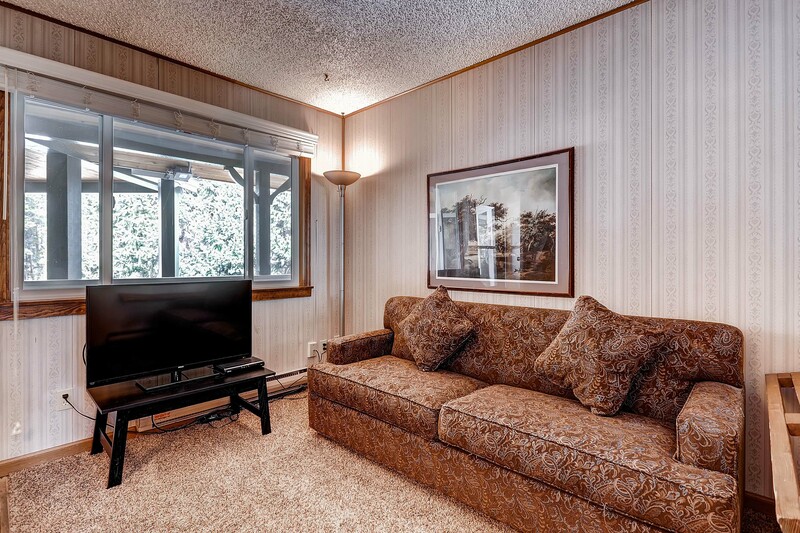 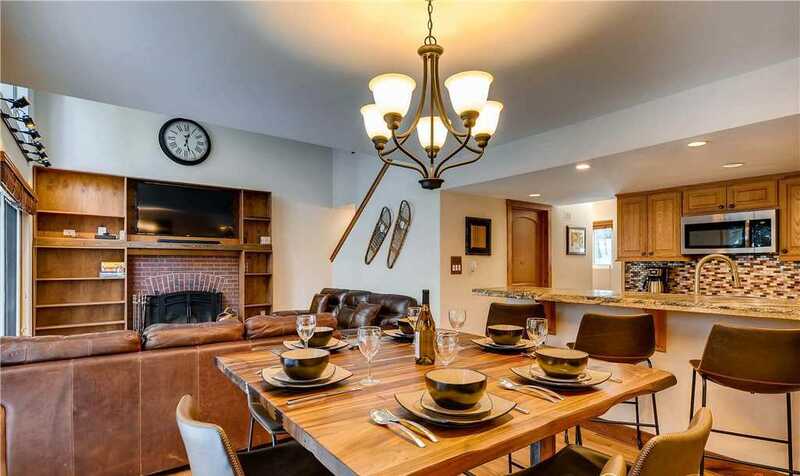 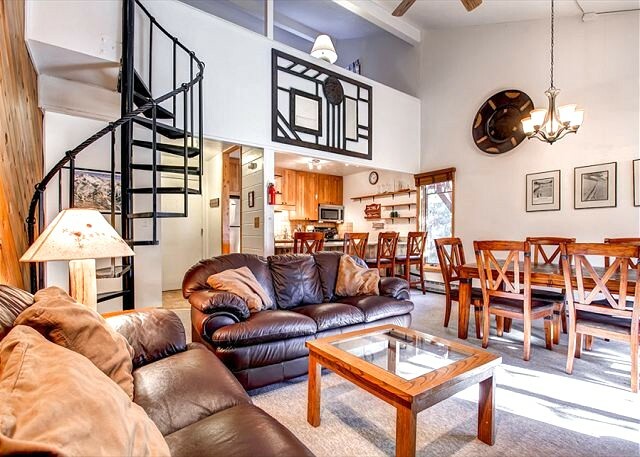 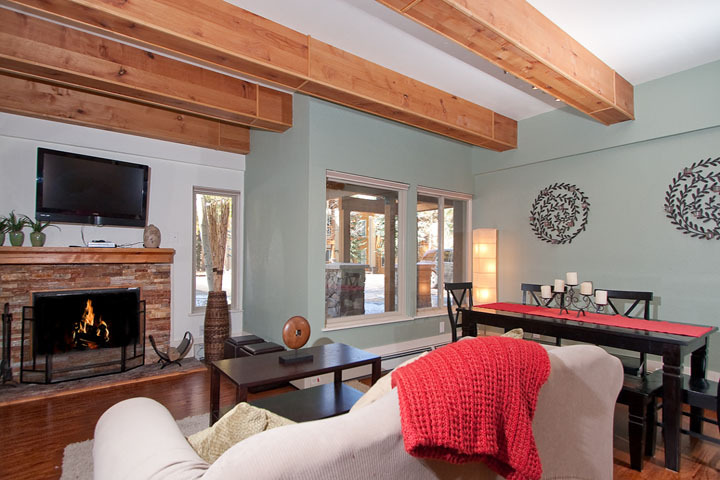 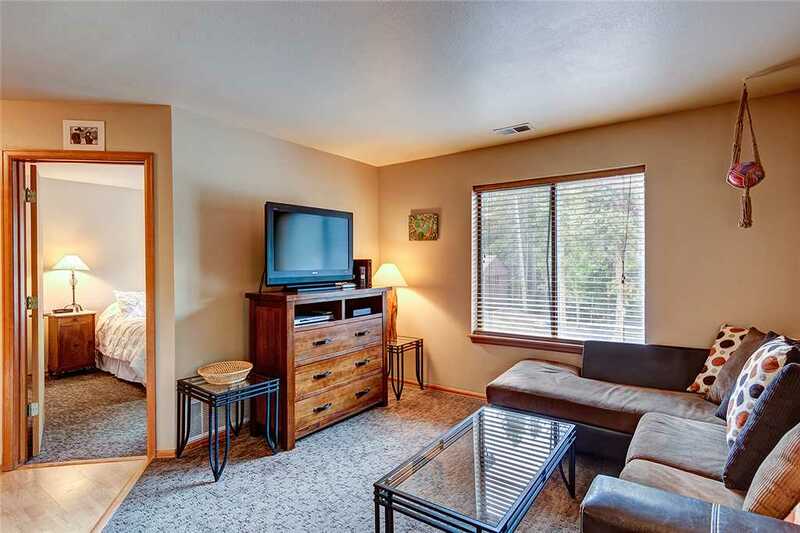 You will enjoy this 1,300 square foot, second floor, two bedroom and three bathroom unit. 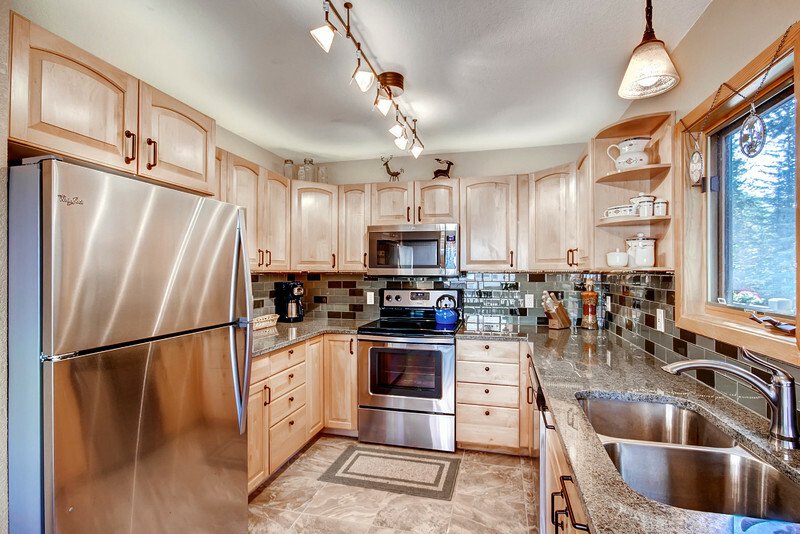 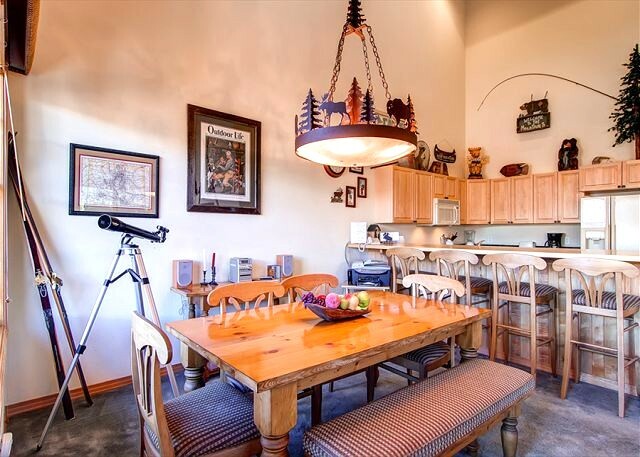 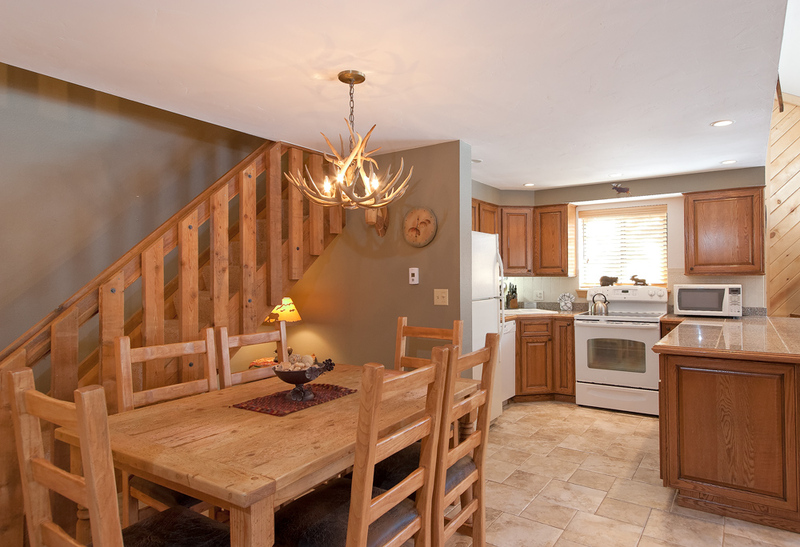 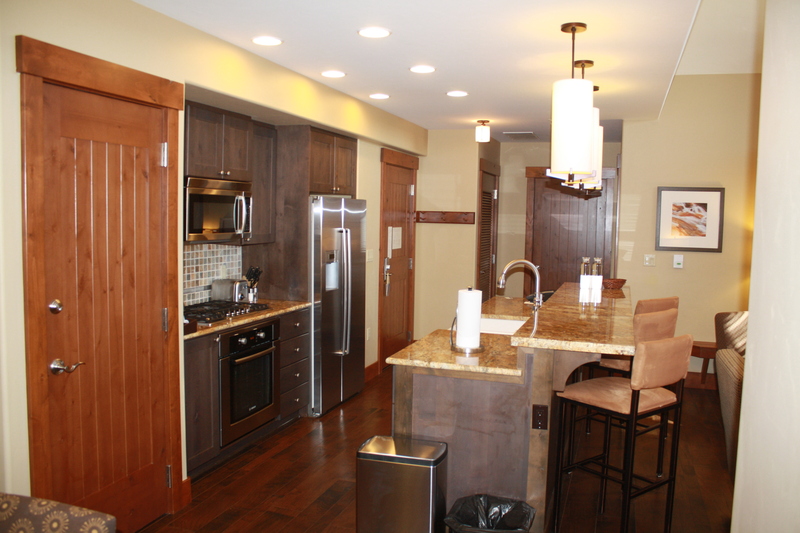 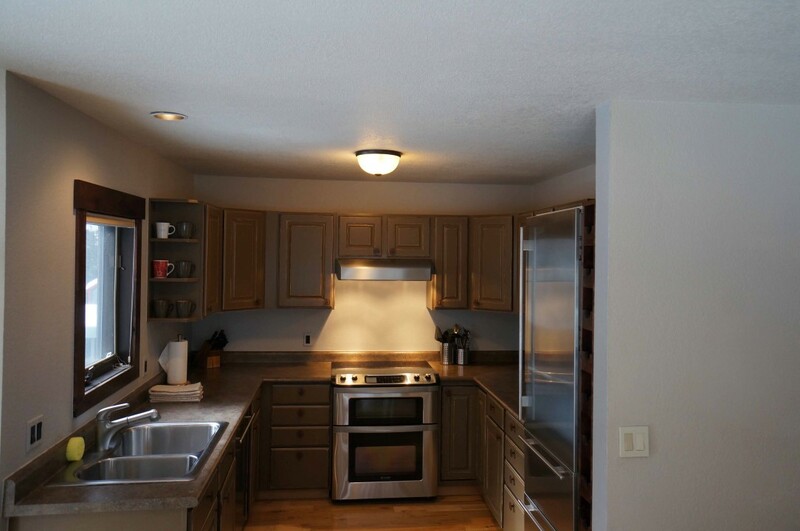 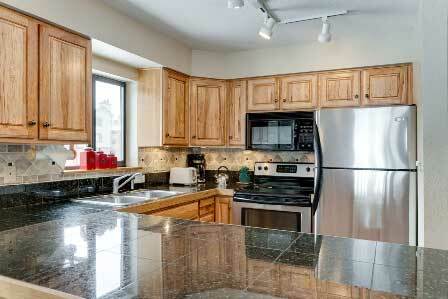 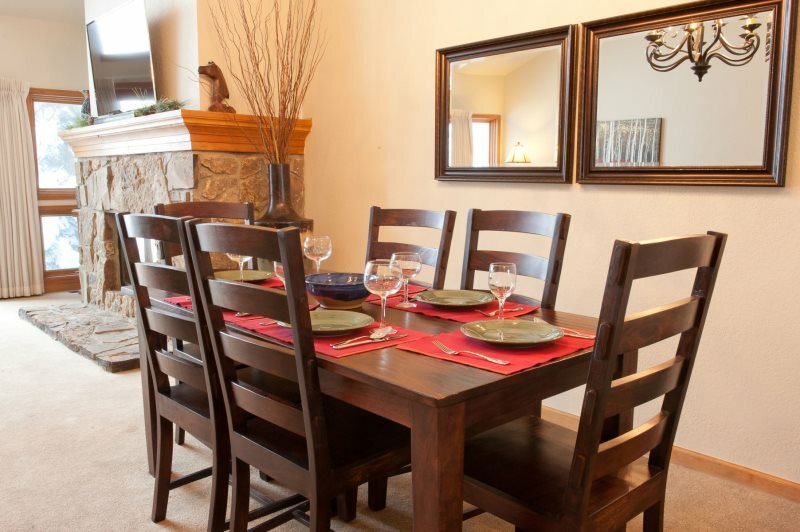 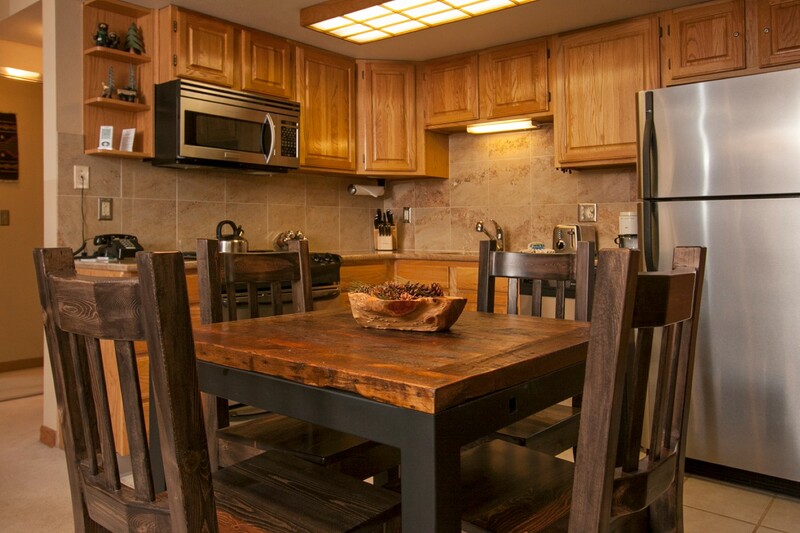 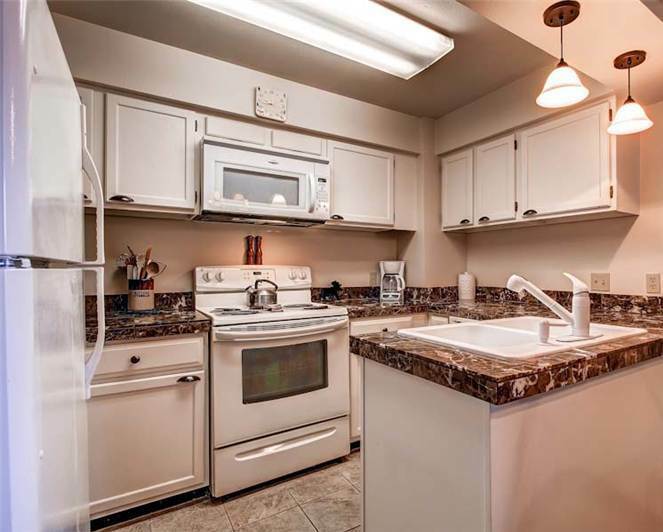 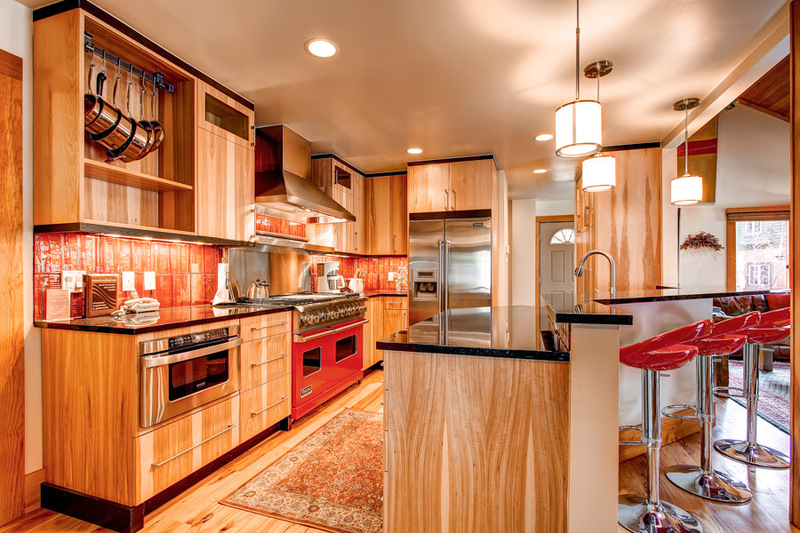 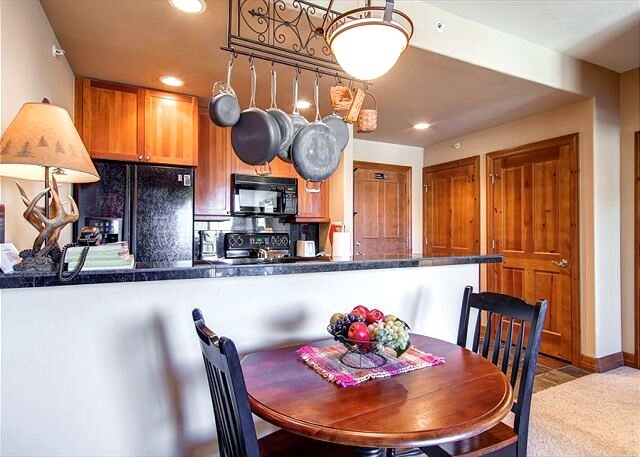 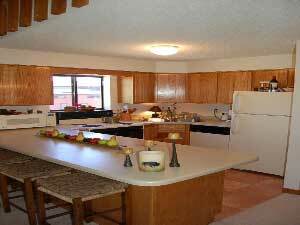 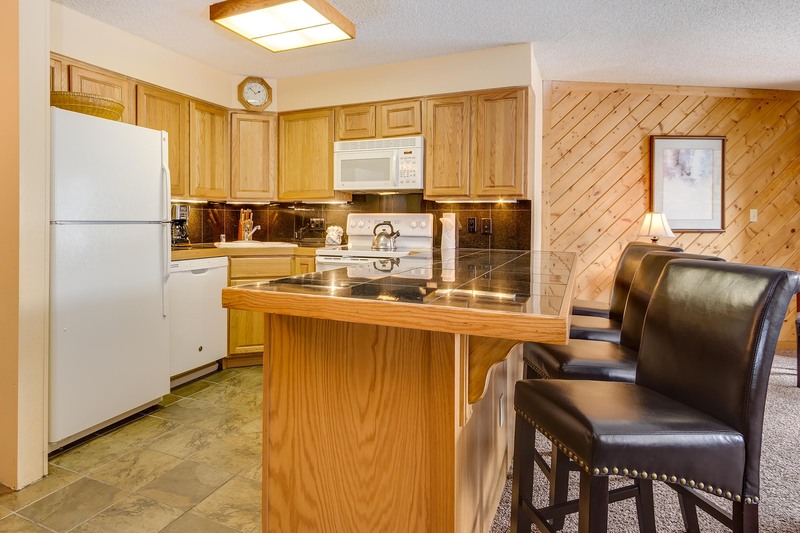 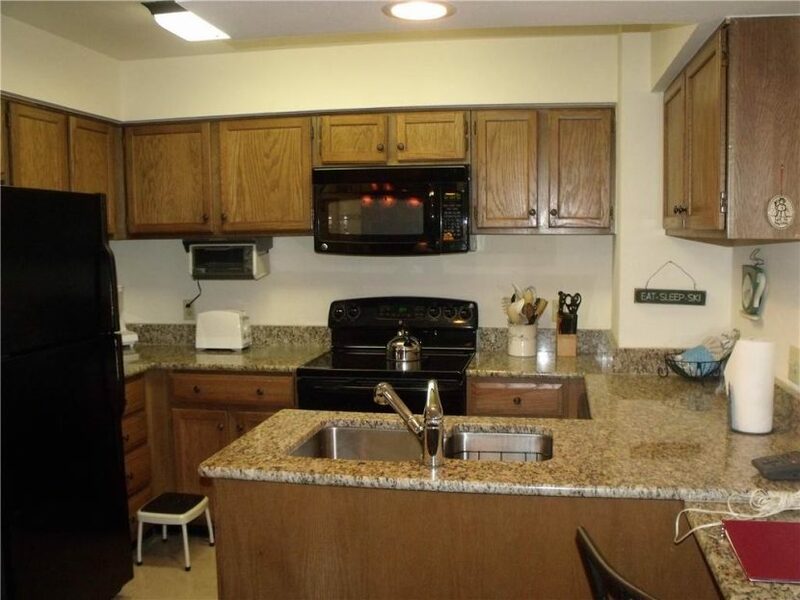 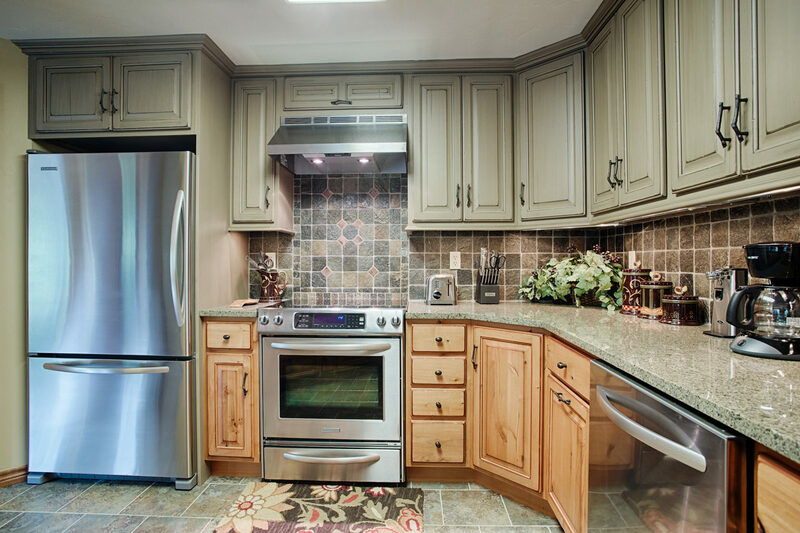 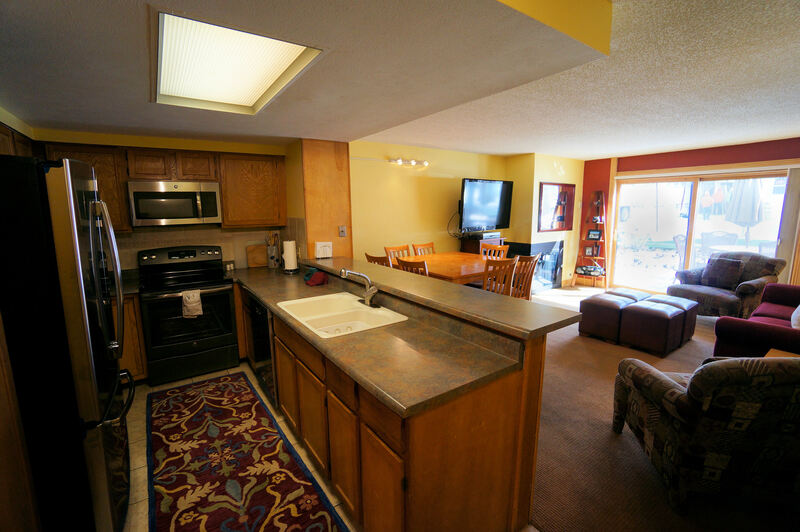 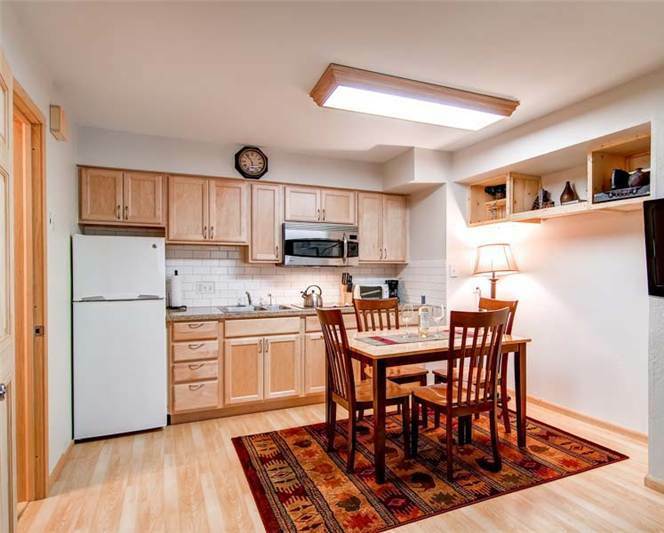 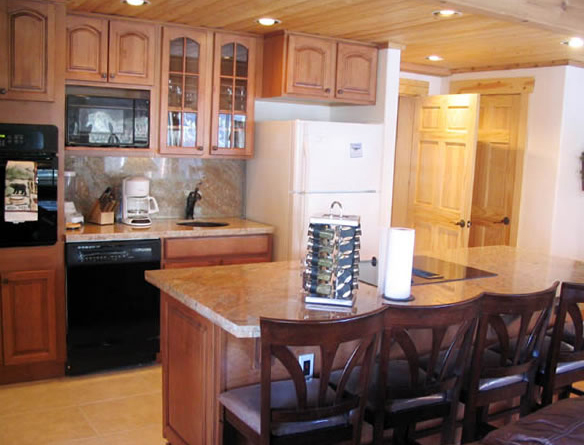 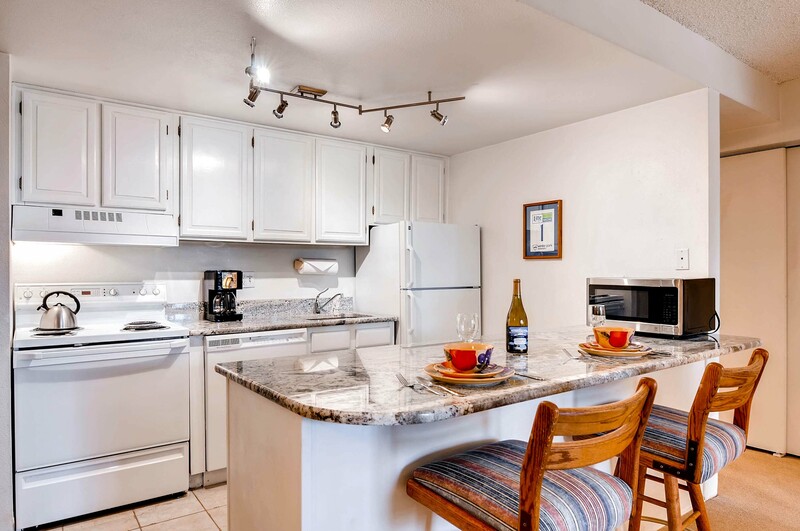 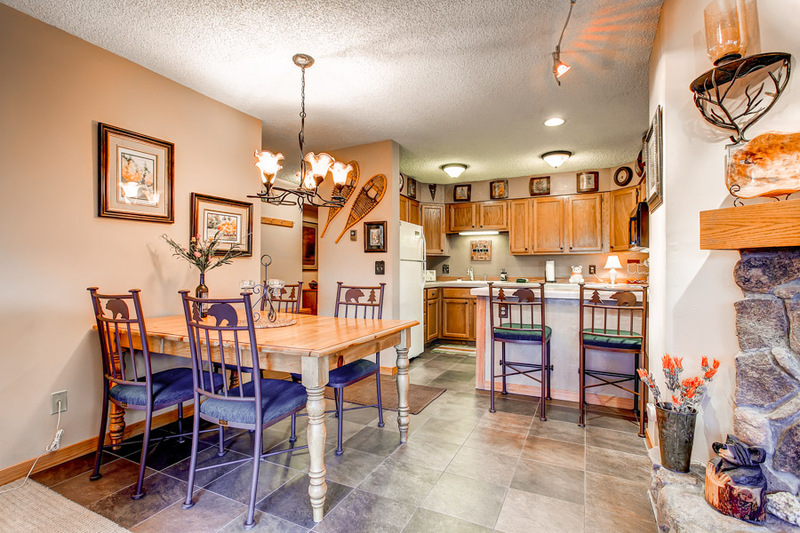 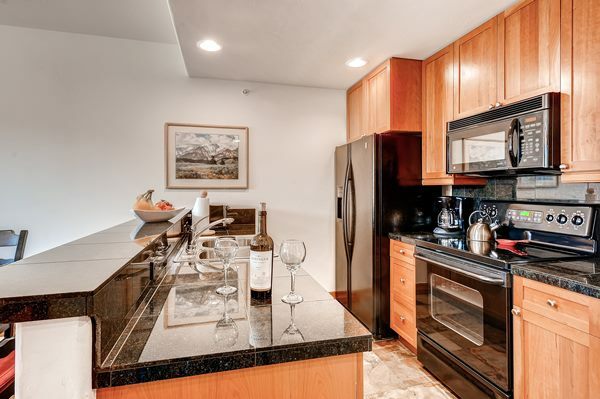 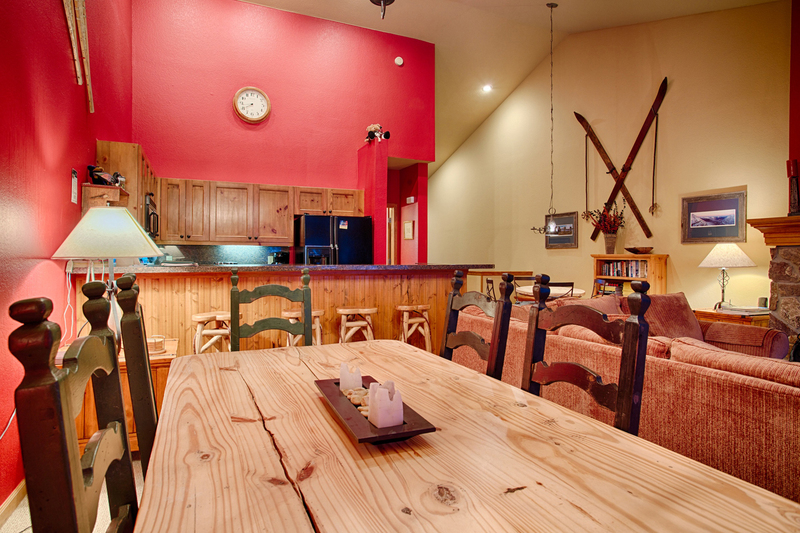 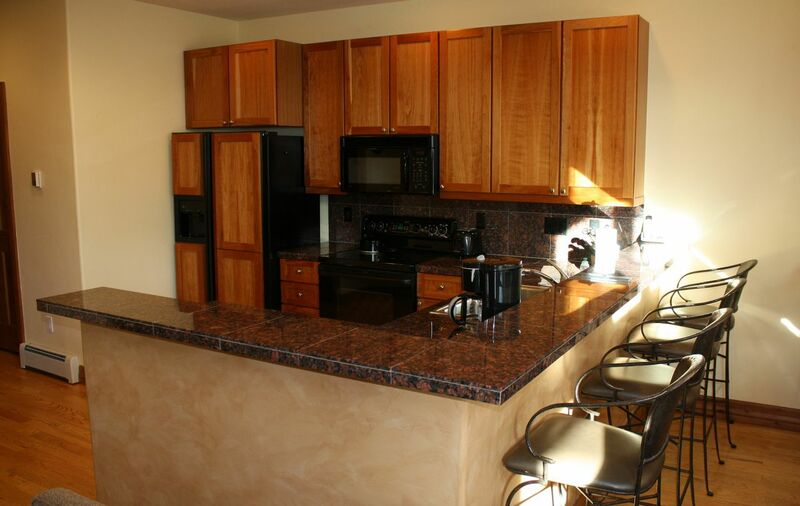 The unit features a fully equipped kitchen with all cooking and dining utensils, as well as a six person dining table. 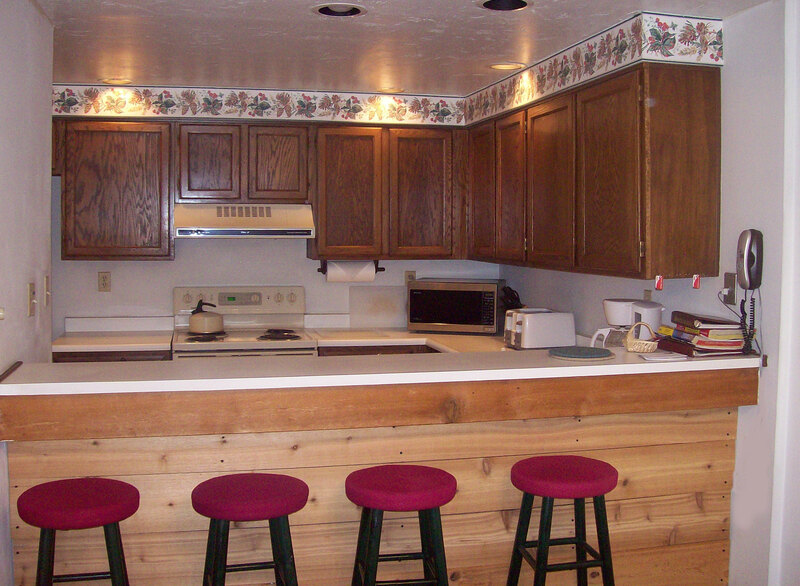 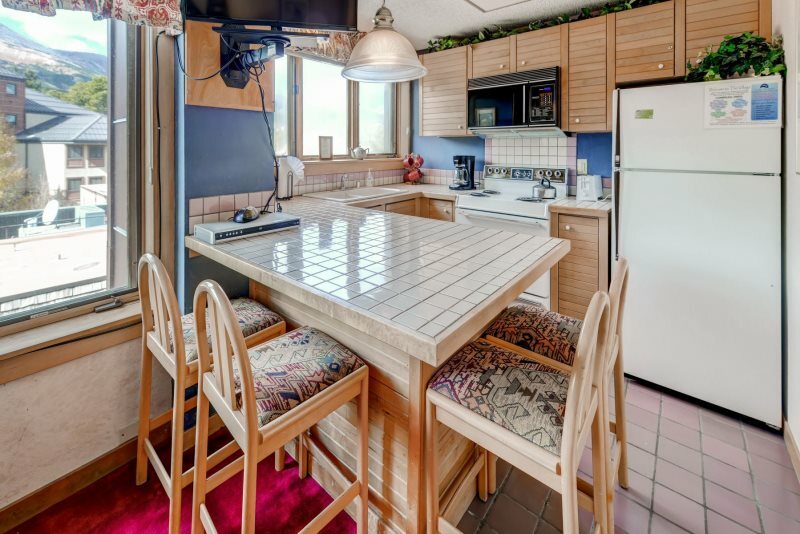 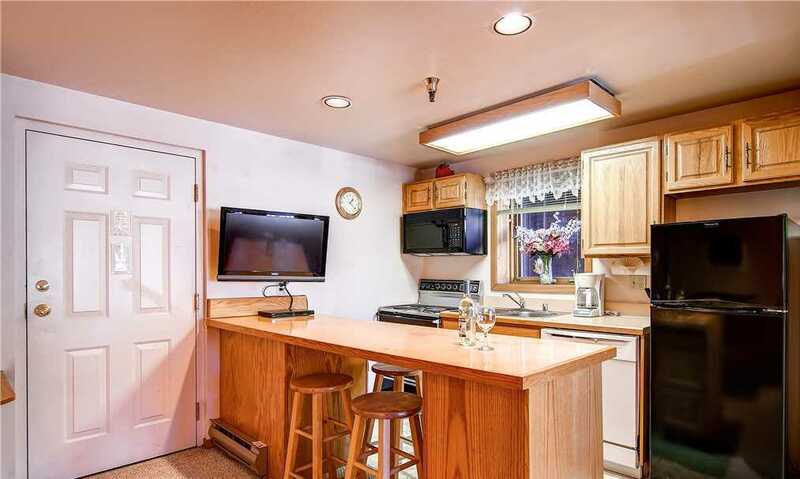 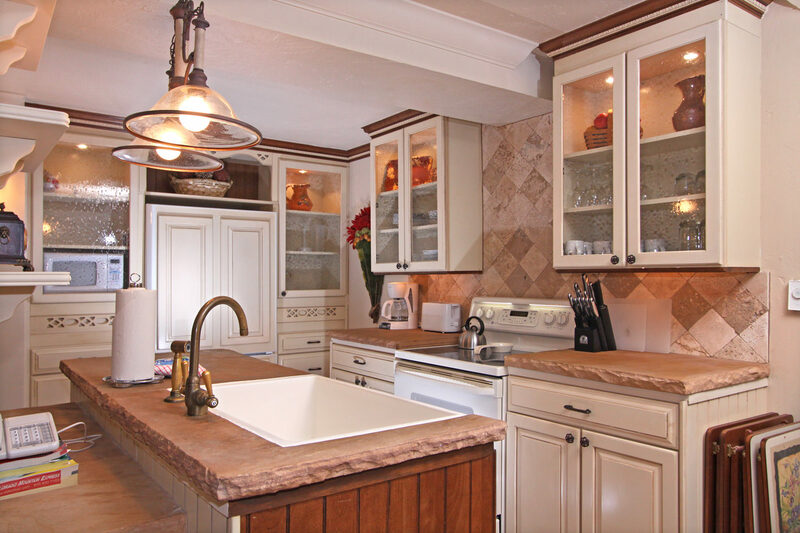 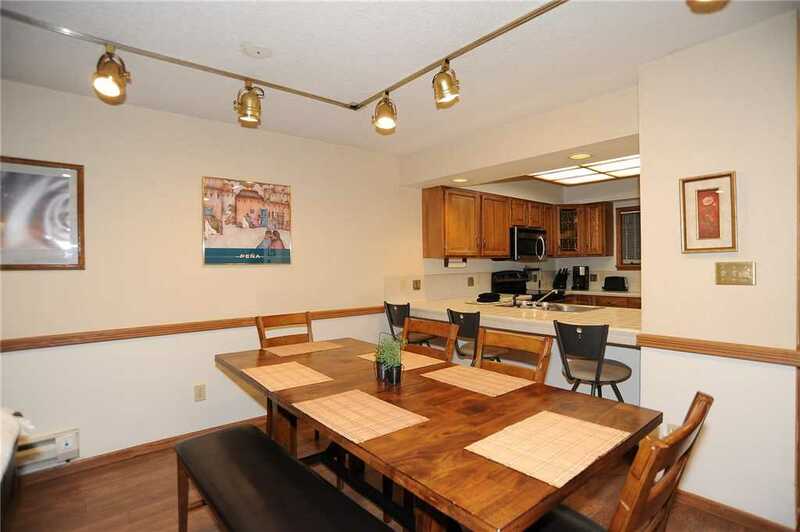 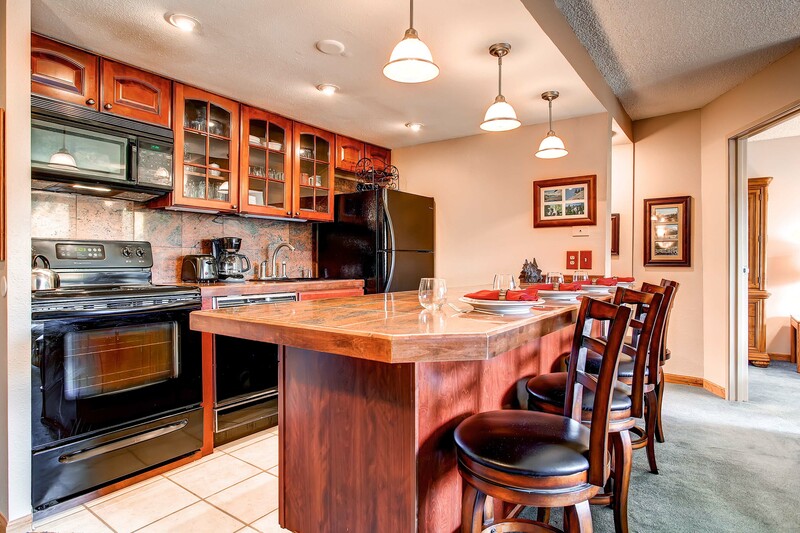 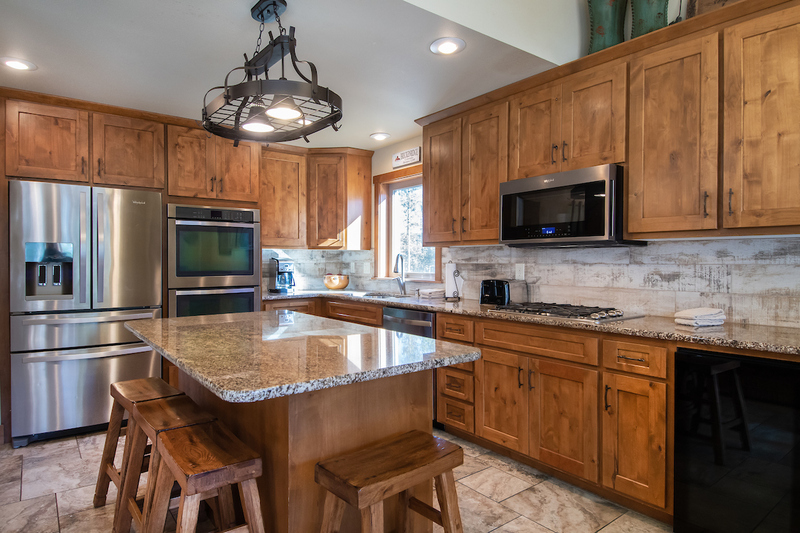 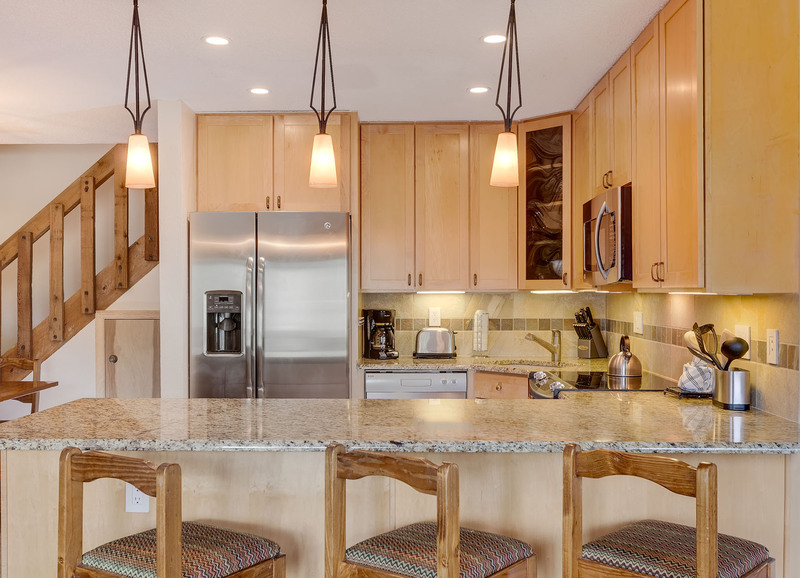 If your group requires more space, utilize the kitchen countertop bar with seating for three. 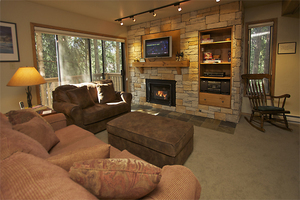 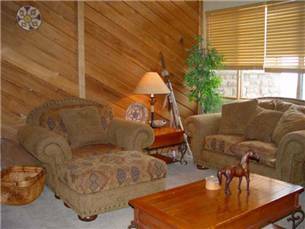 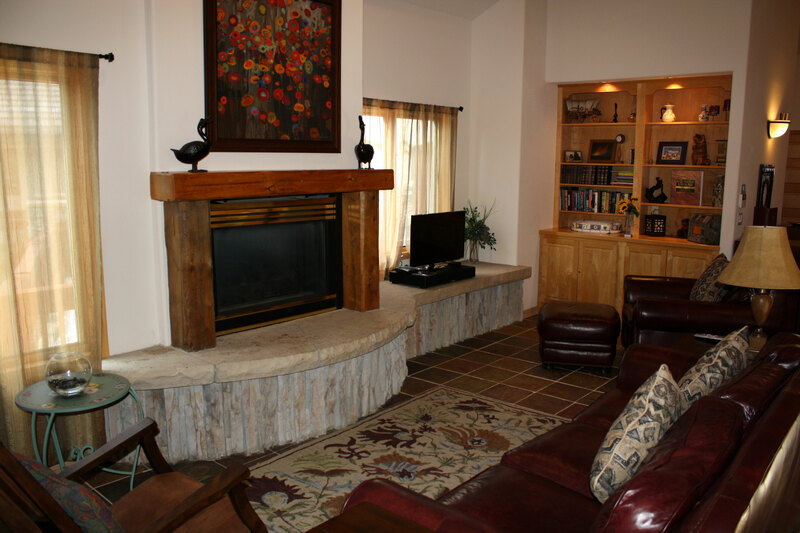 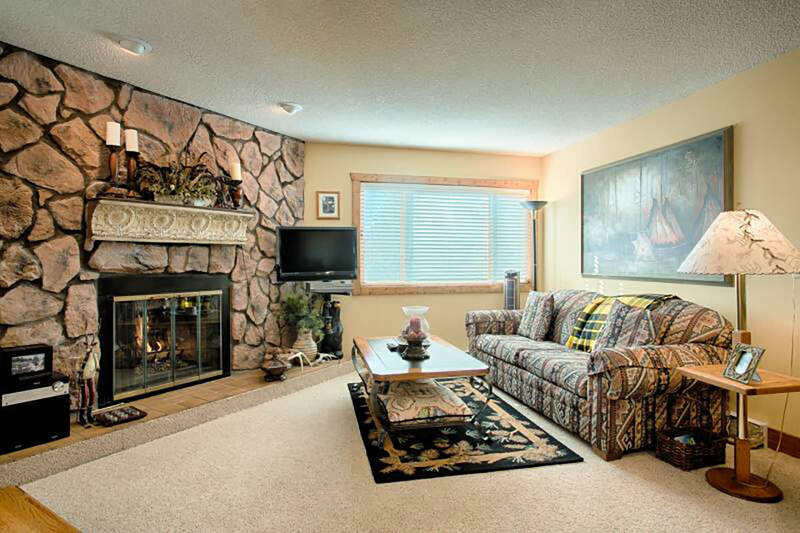 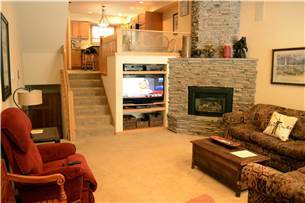 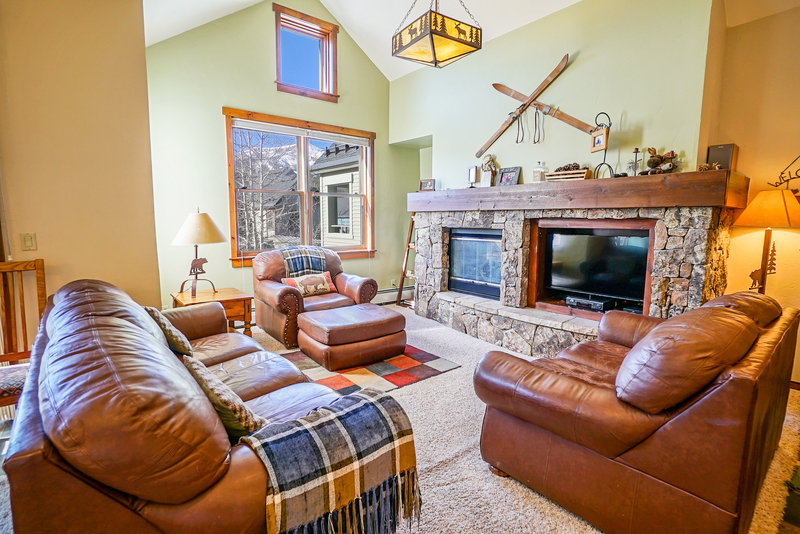 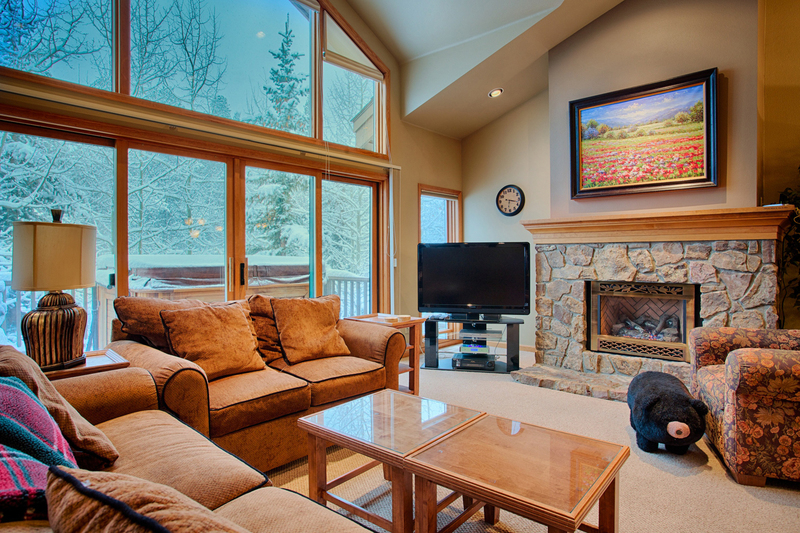 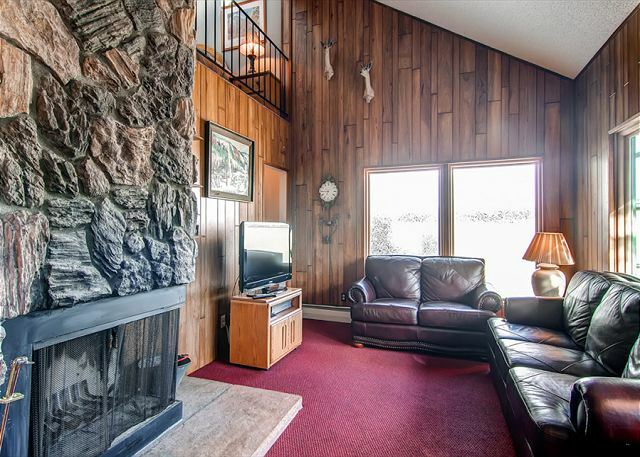 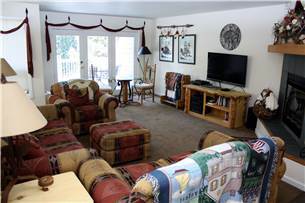 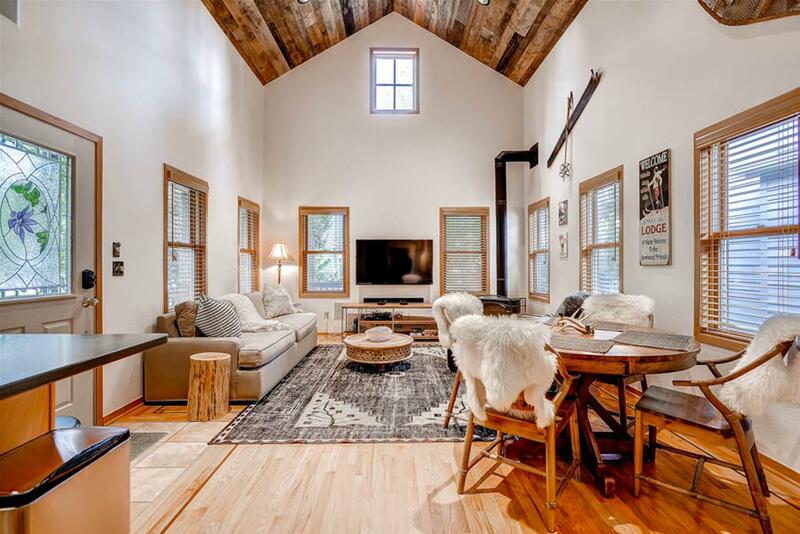 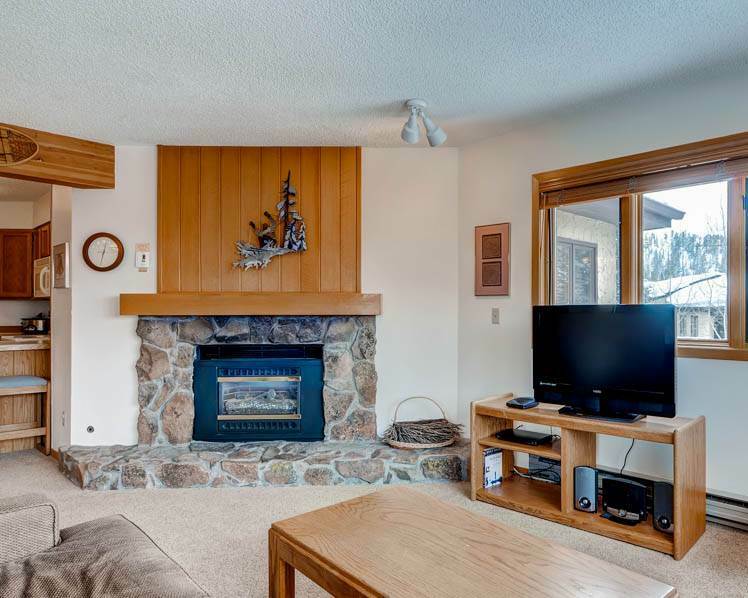 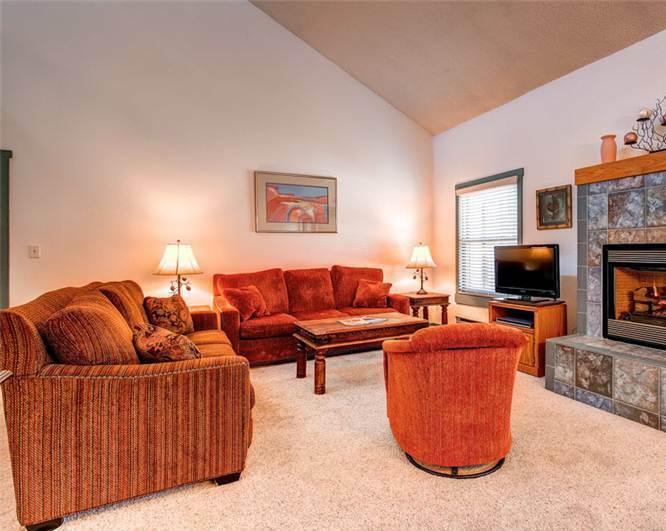 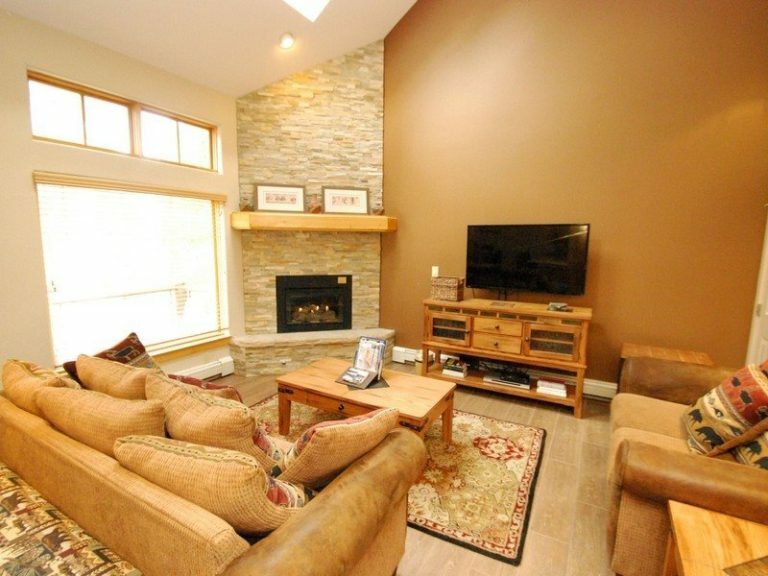 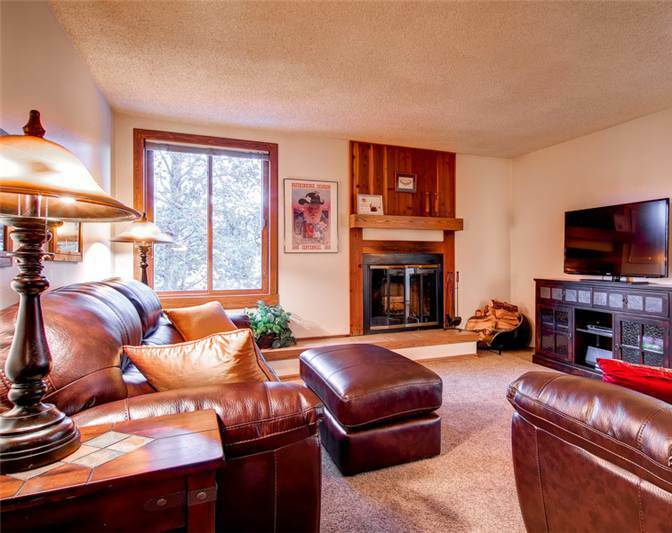 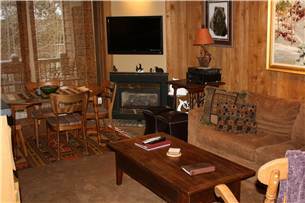 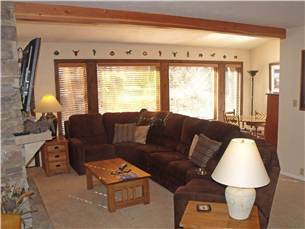 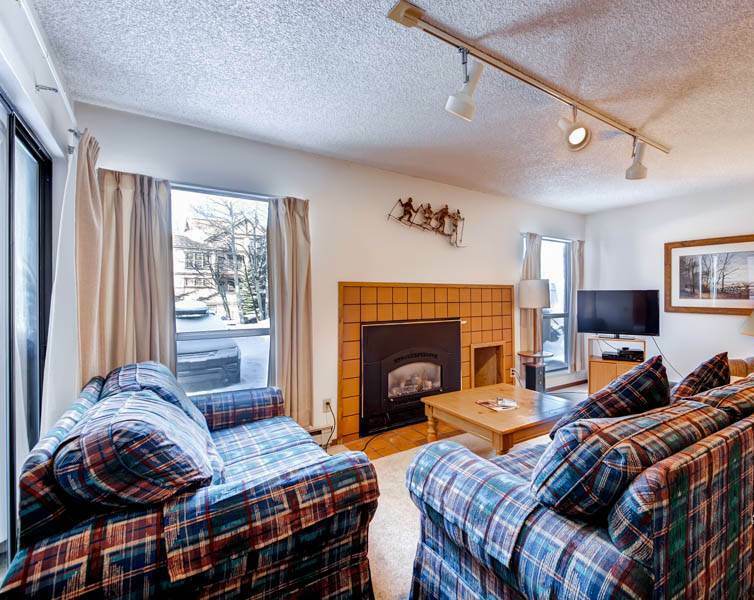 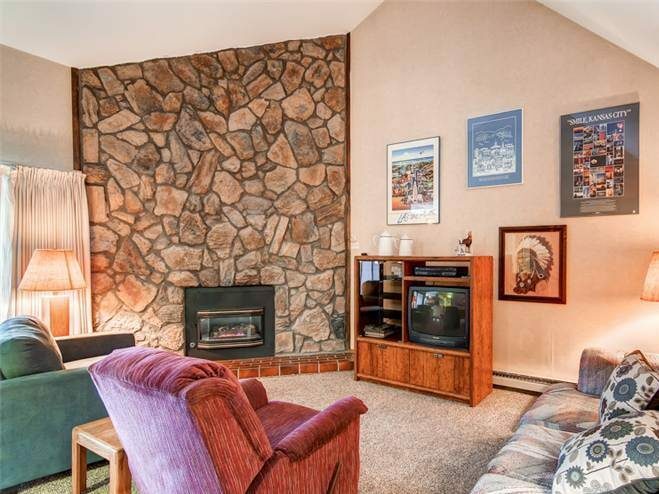 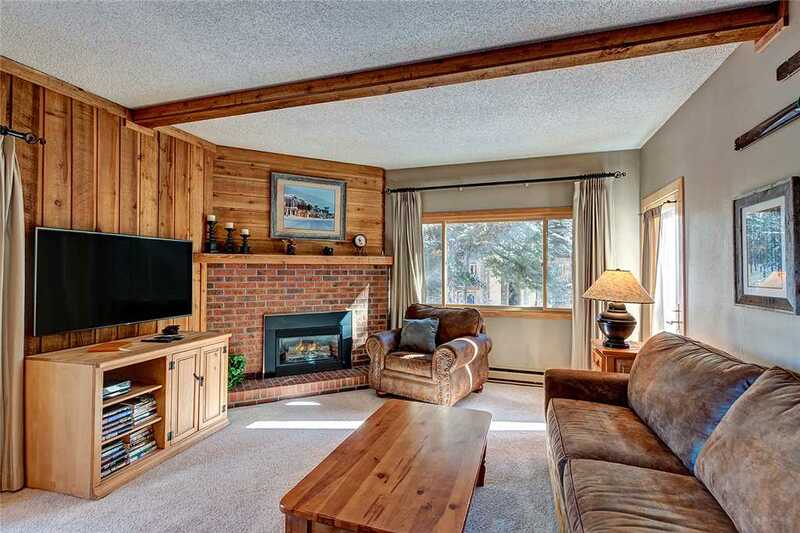 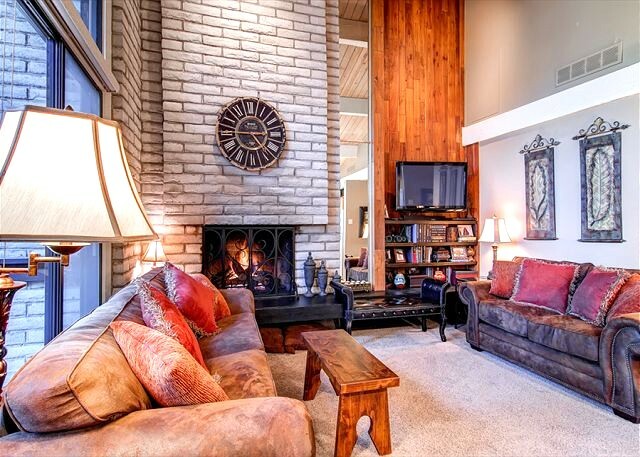 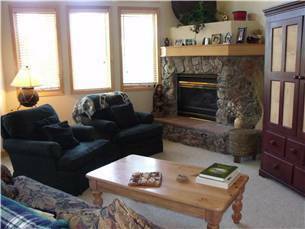 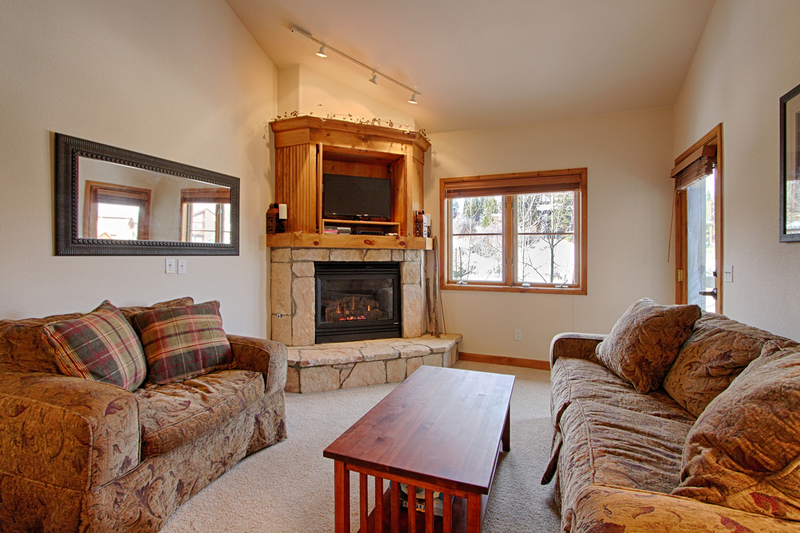 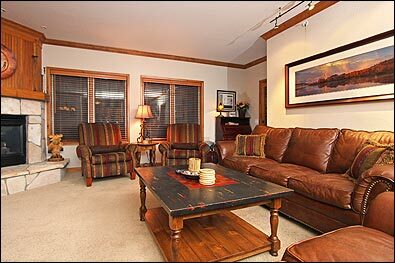 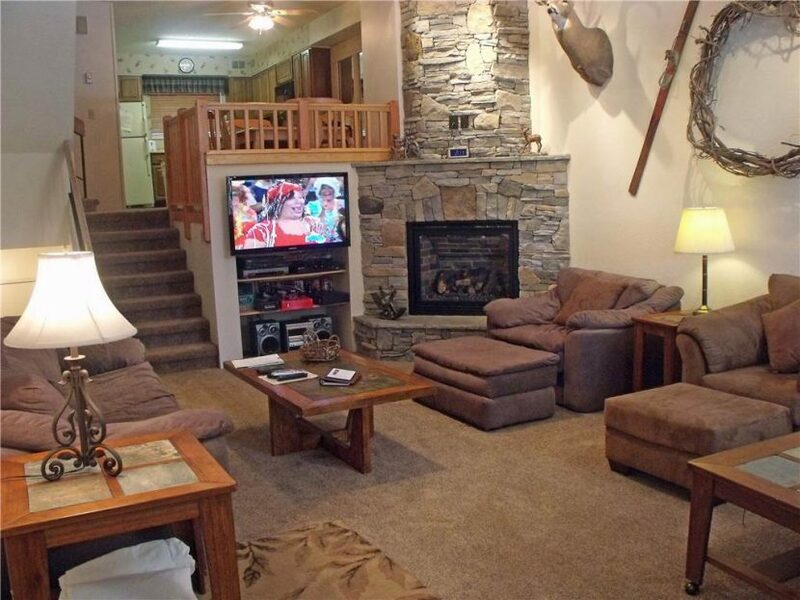 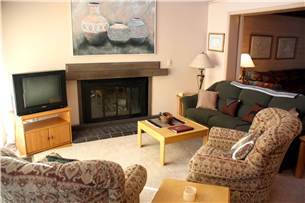 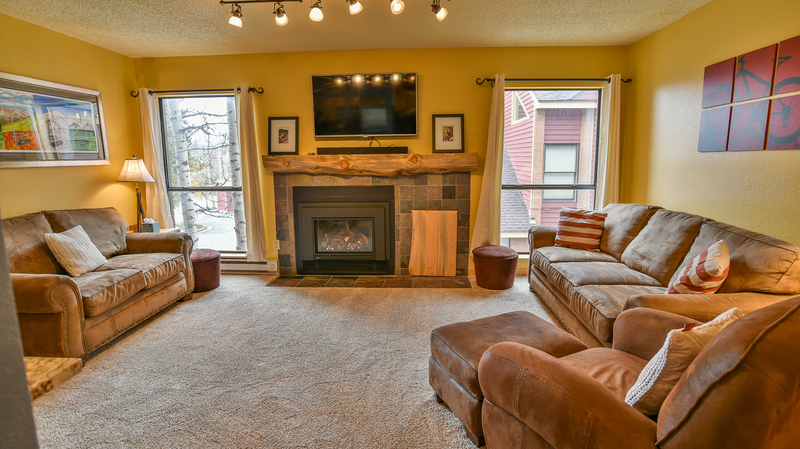 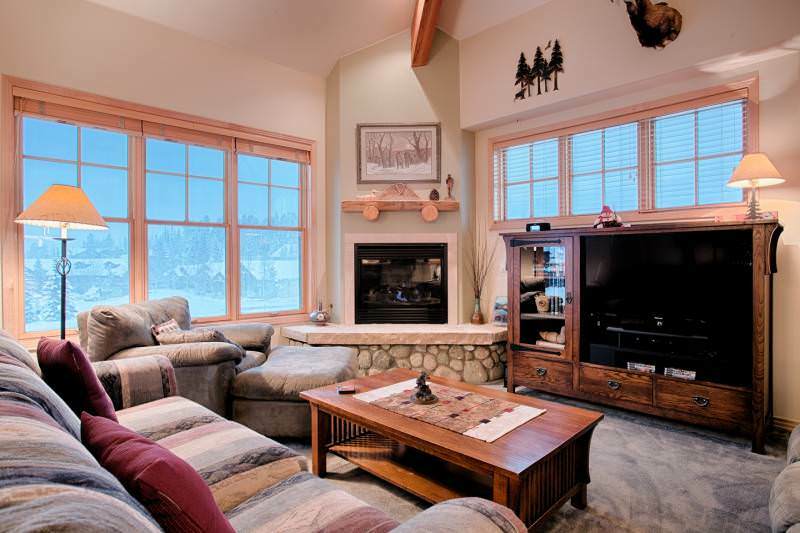 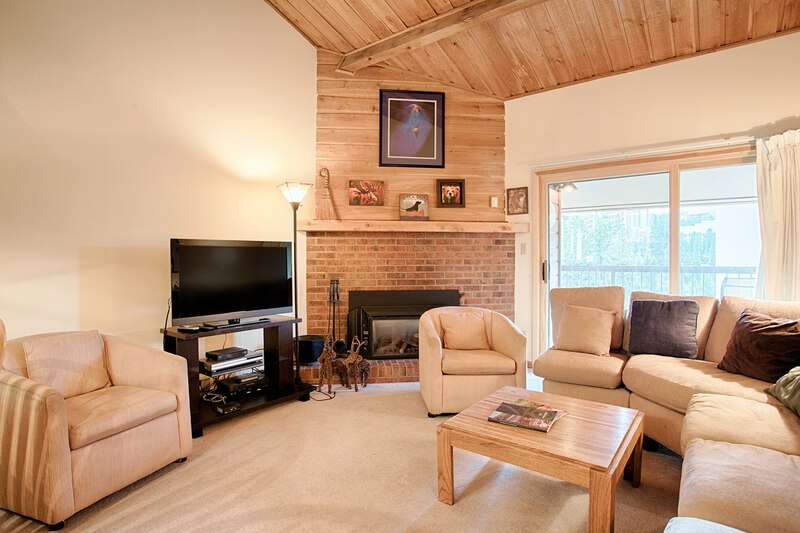 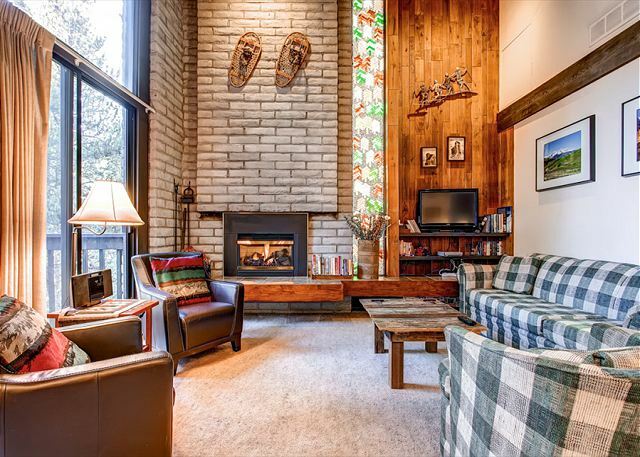 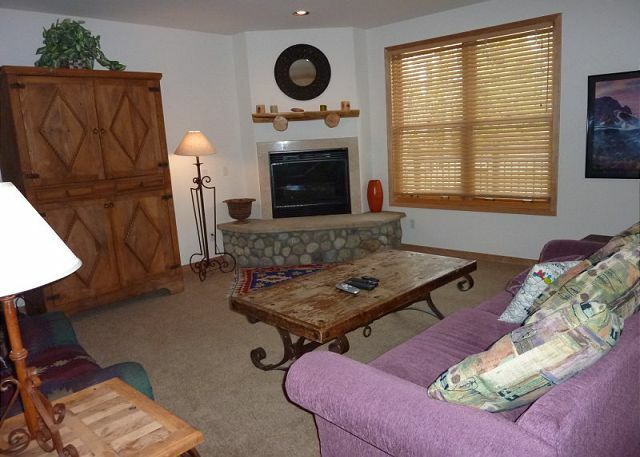 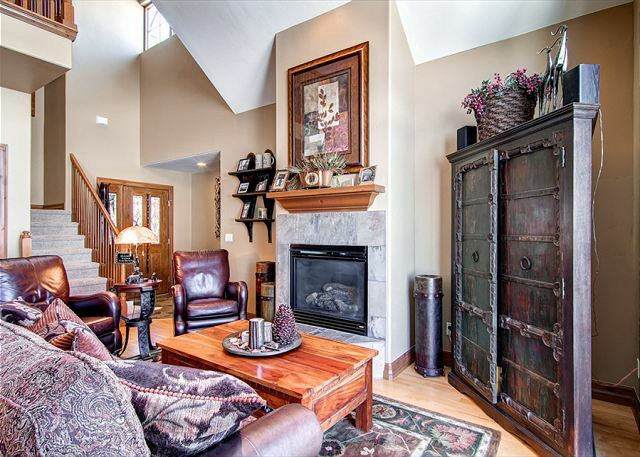 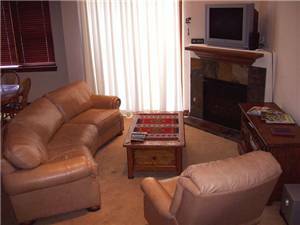 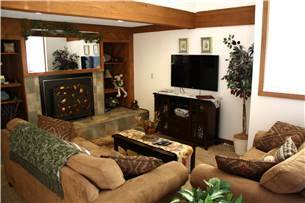 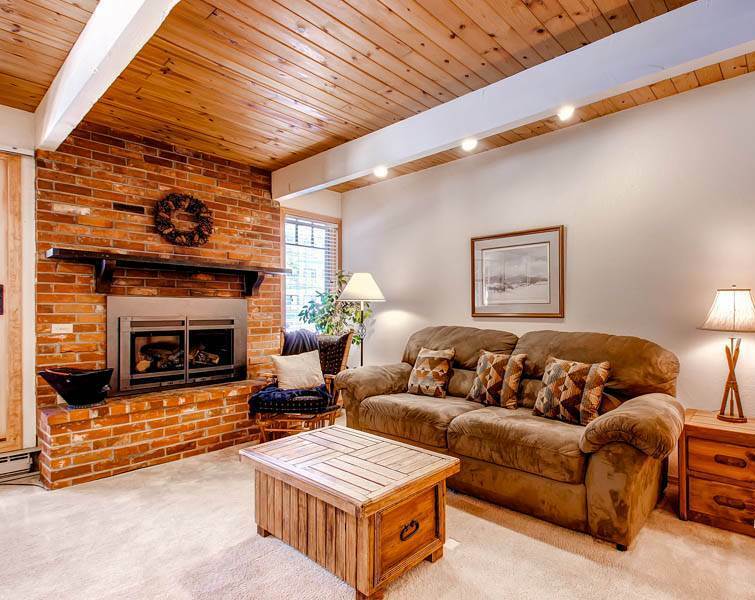 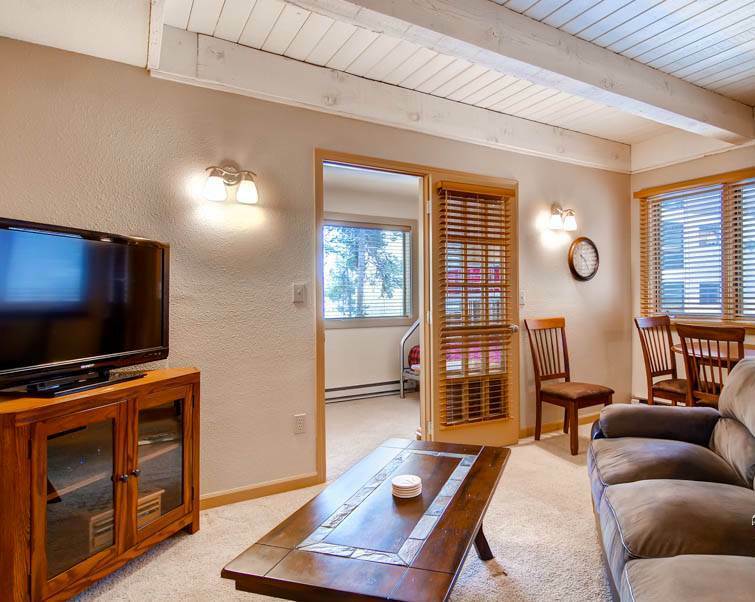 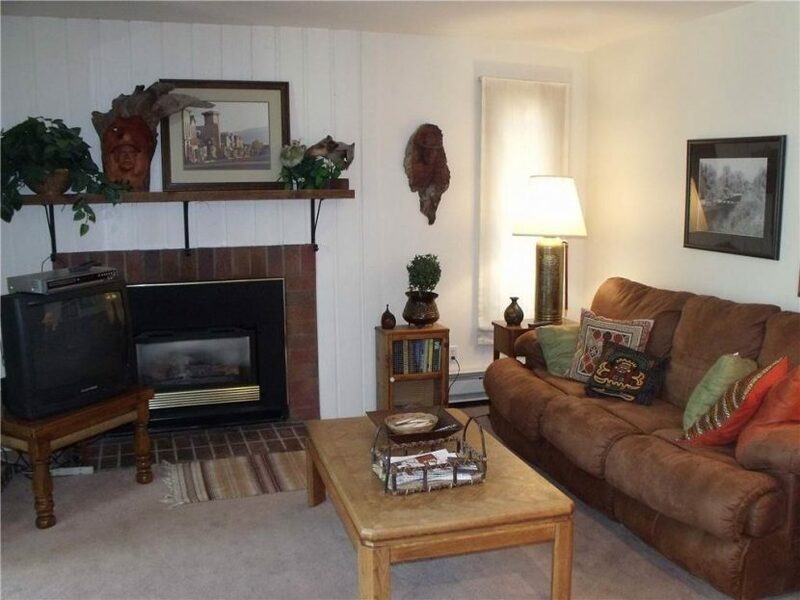 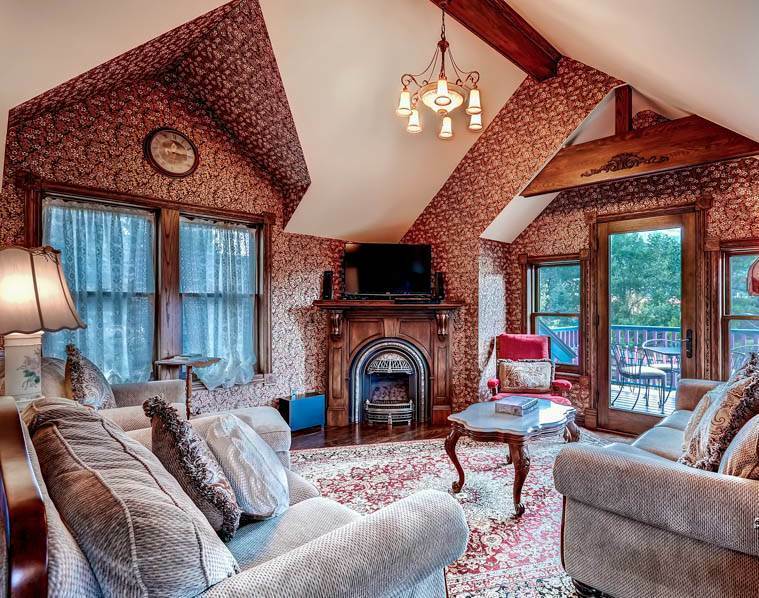 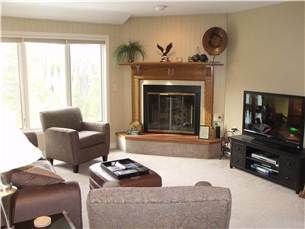 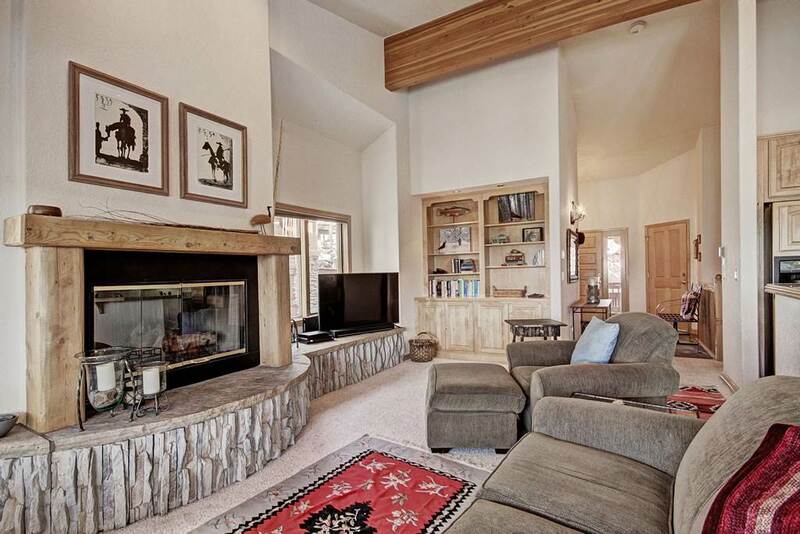 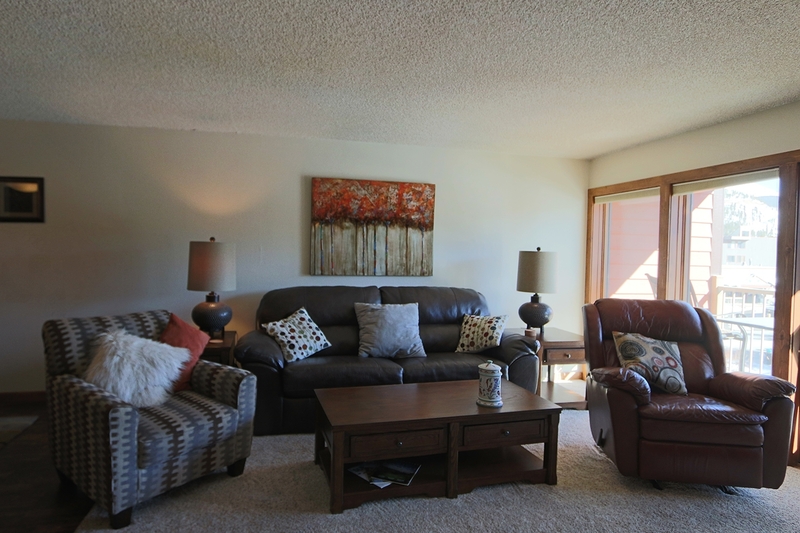 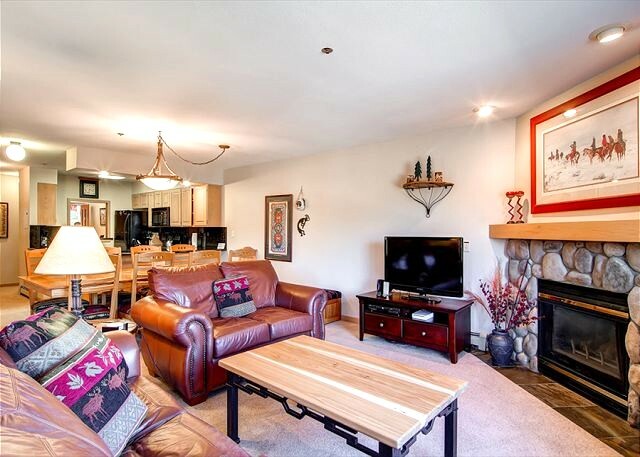 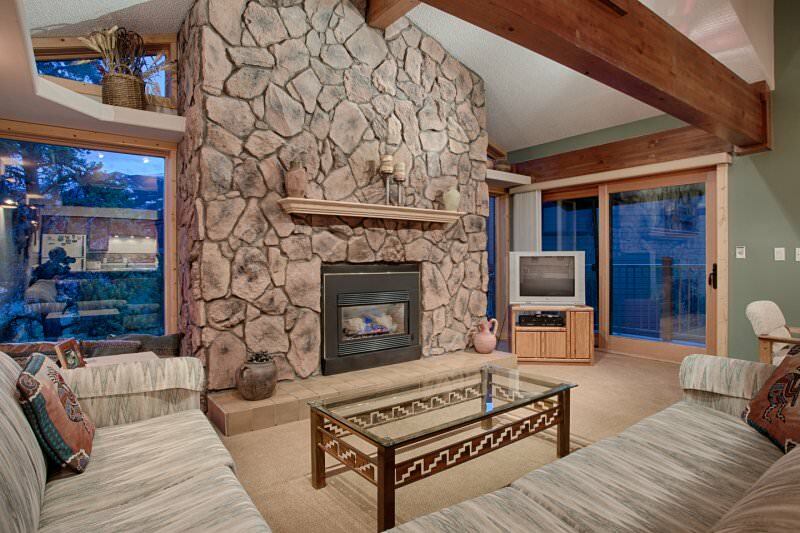 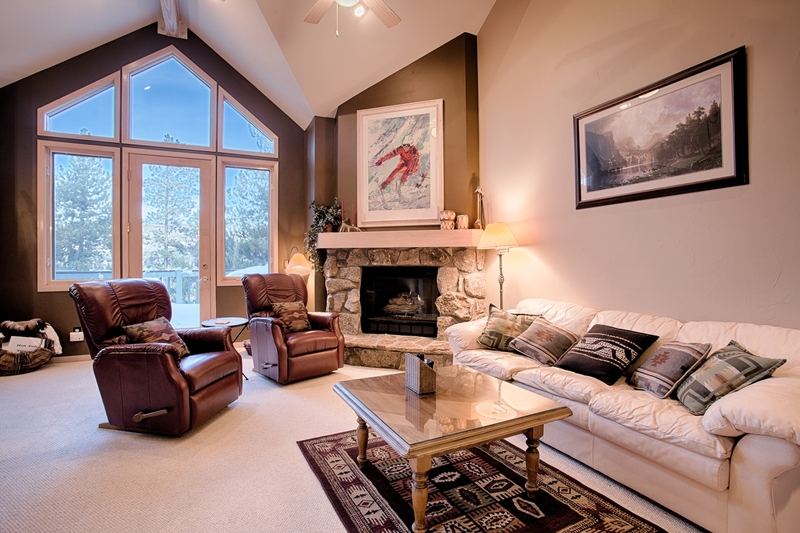 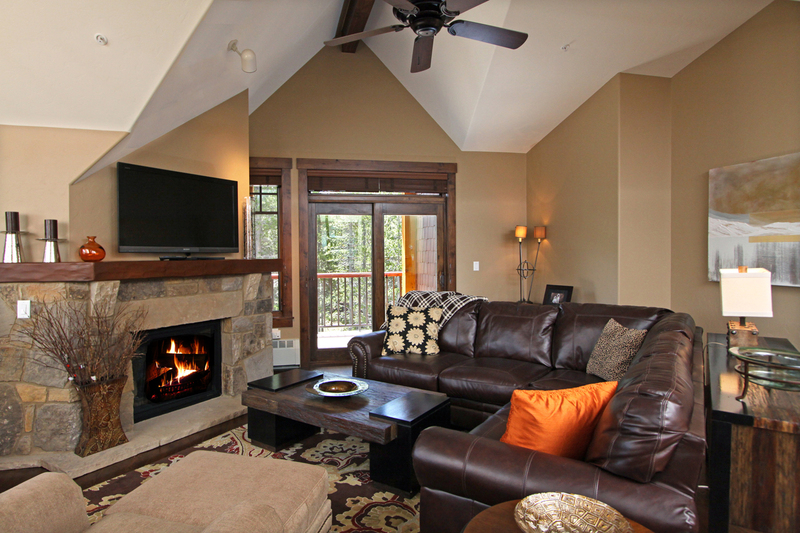 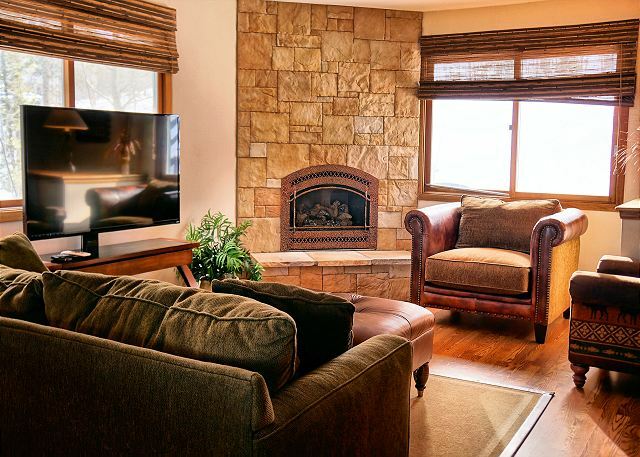 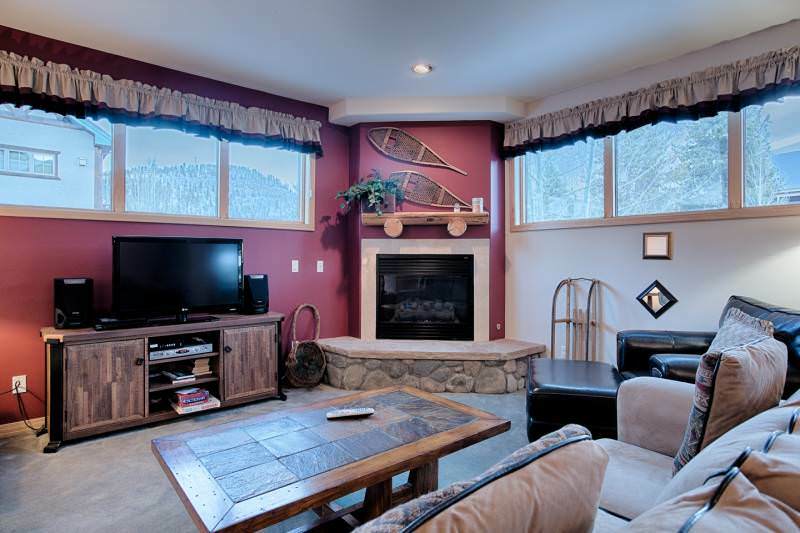 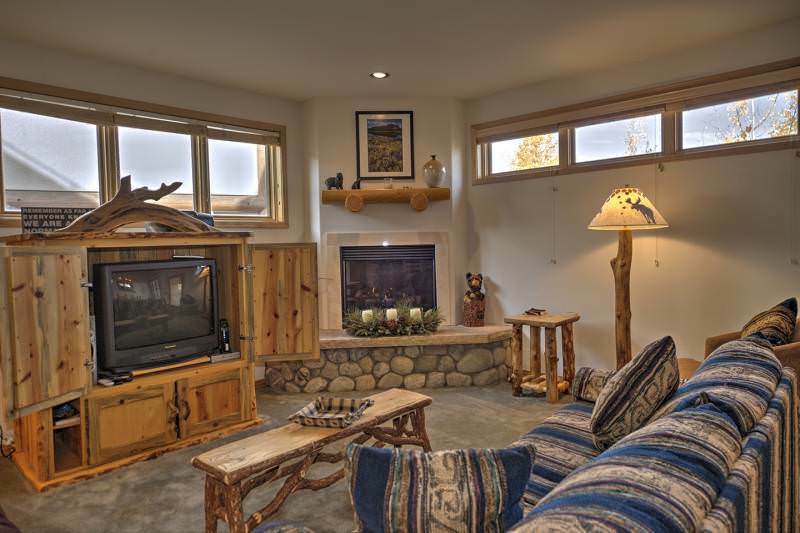 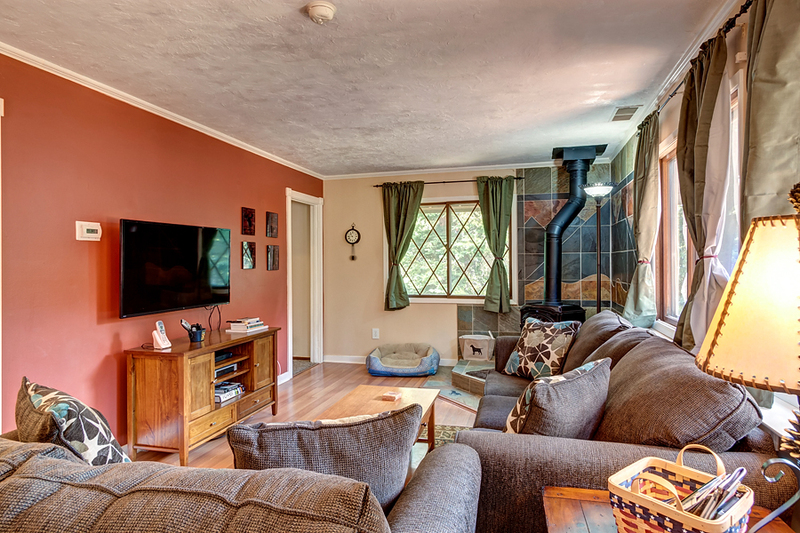 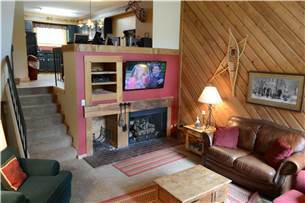 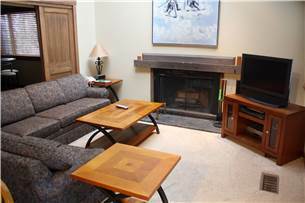 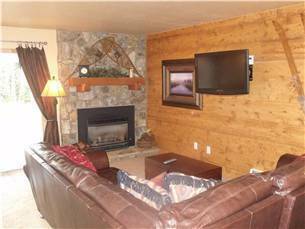 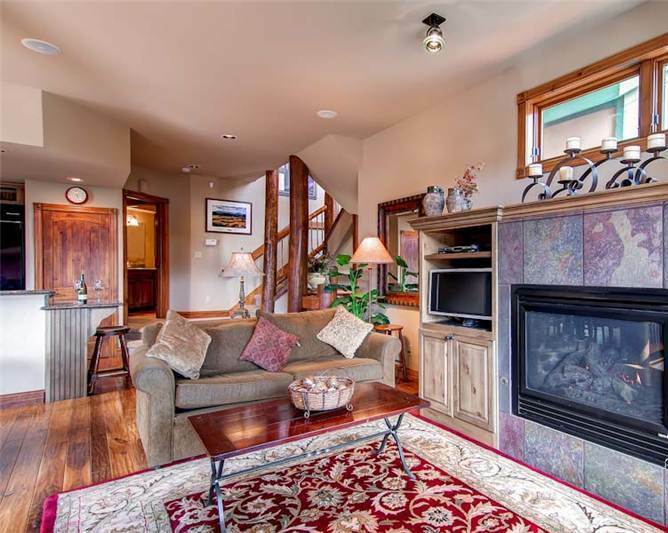 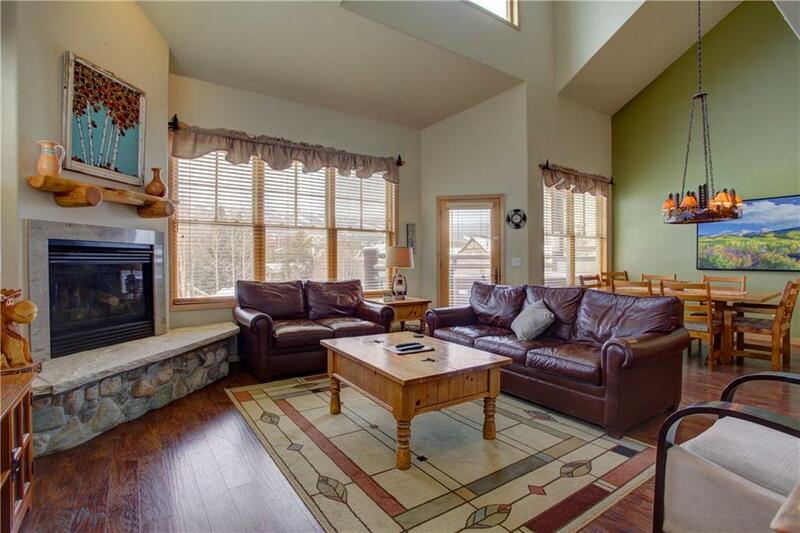 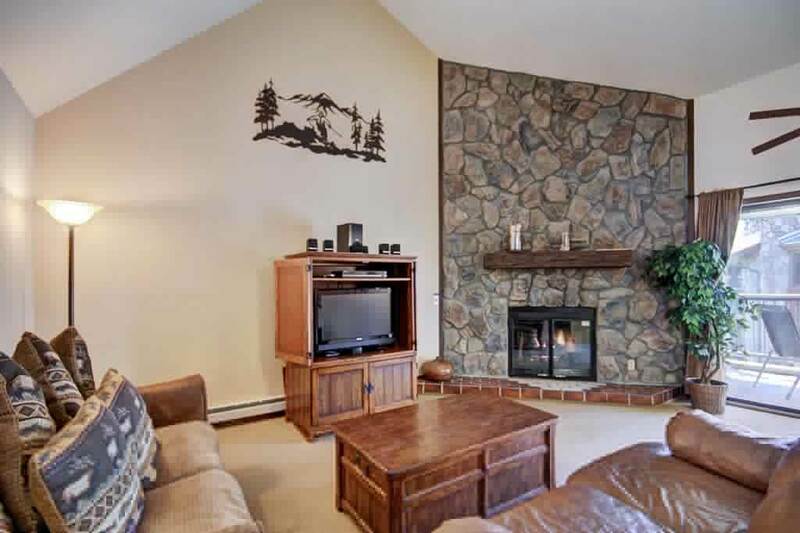 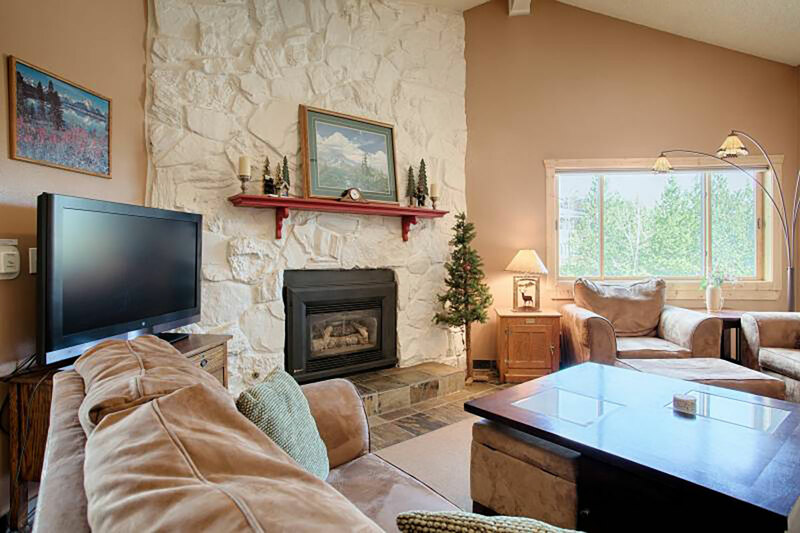 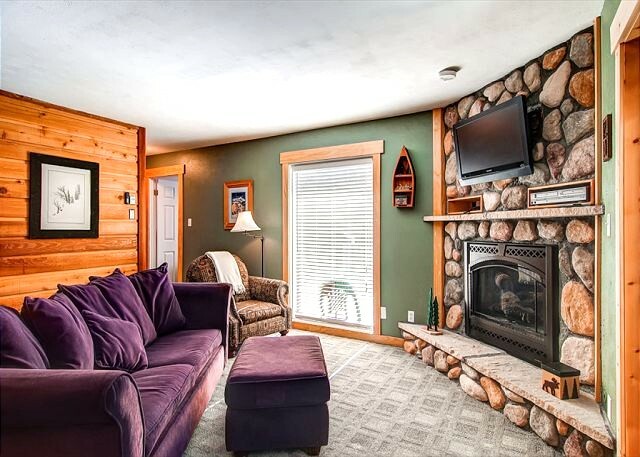 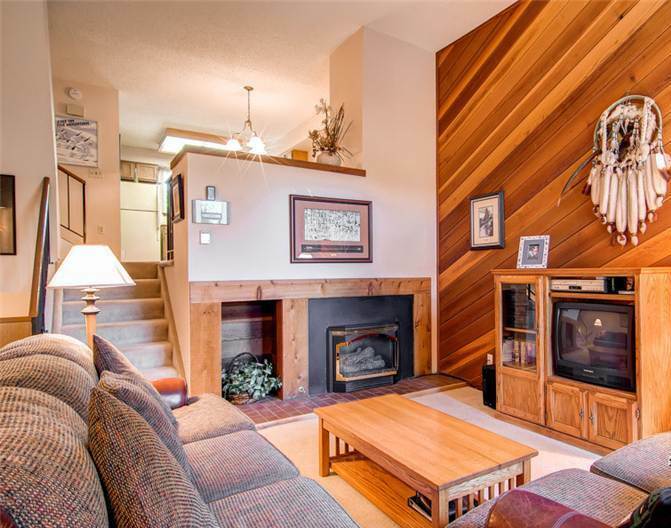 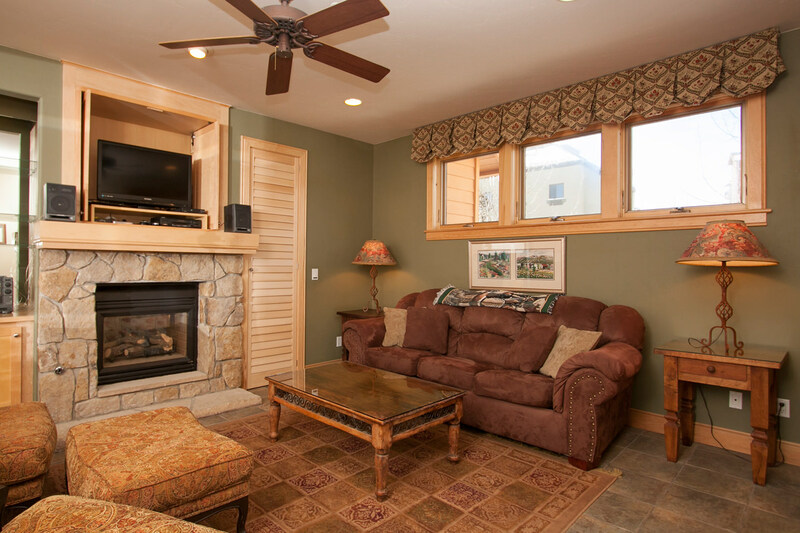 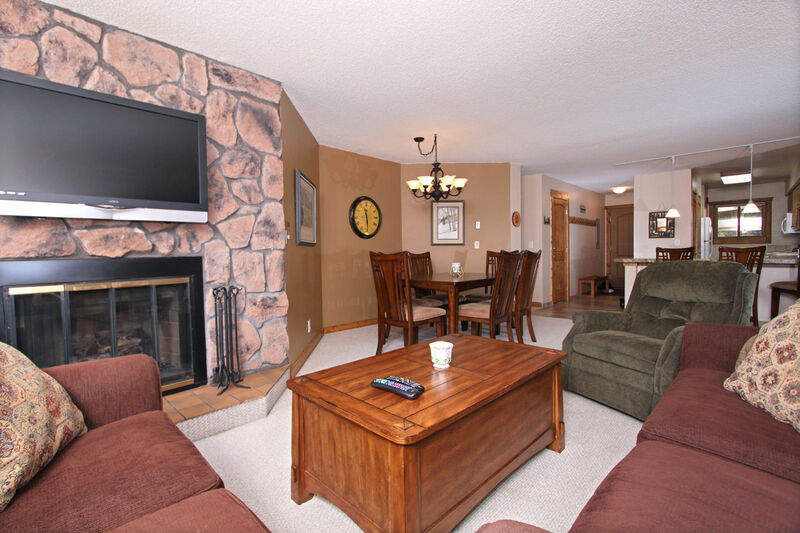 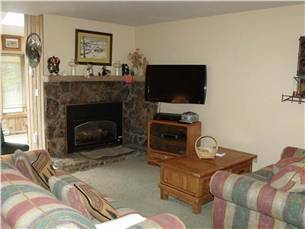 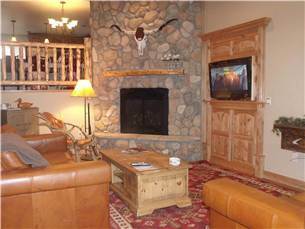 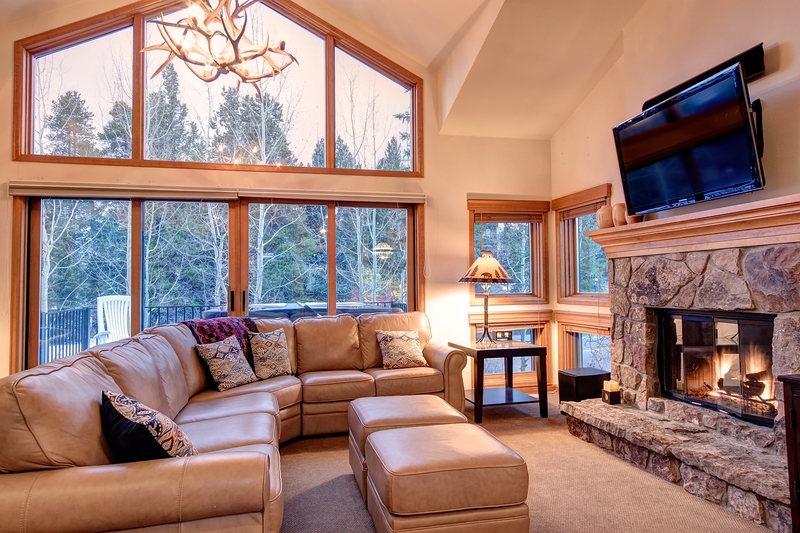 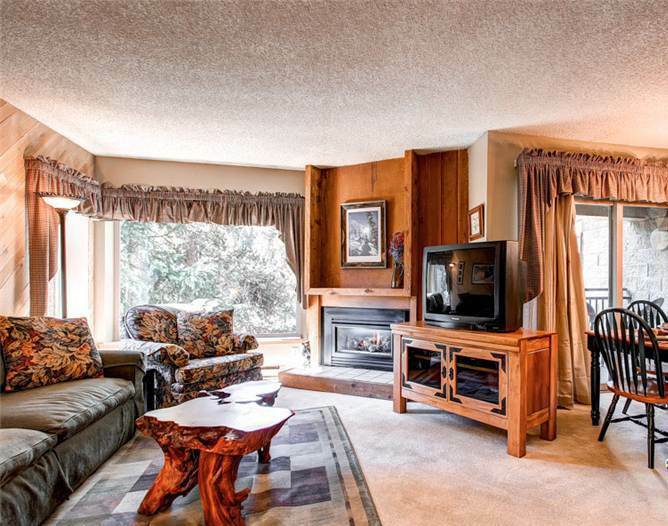 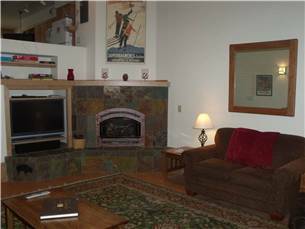 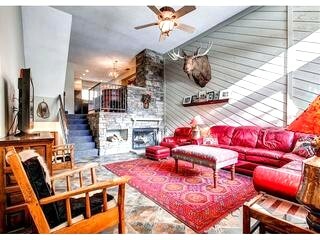 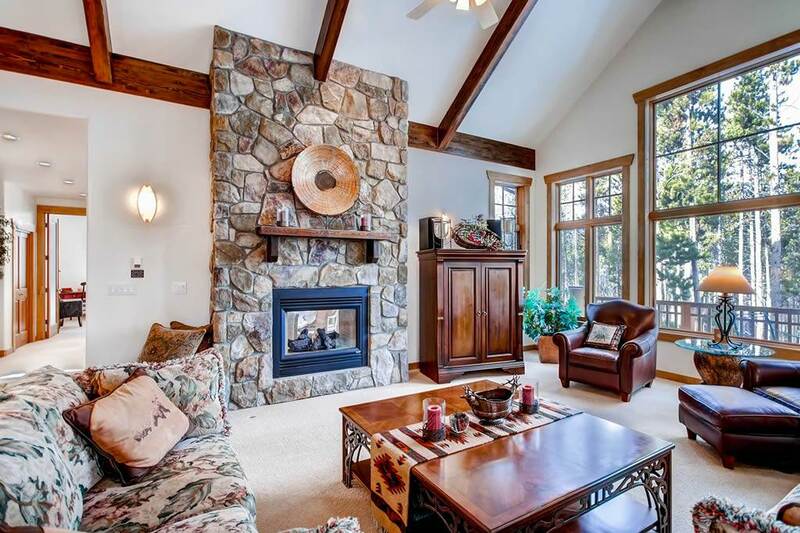 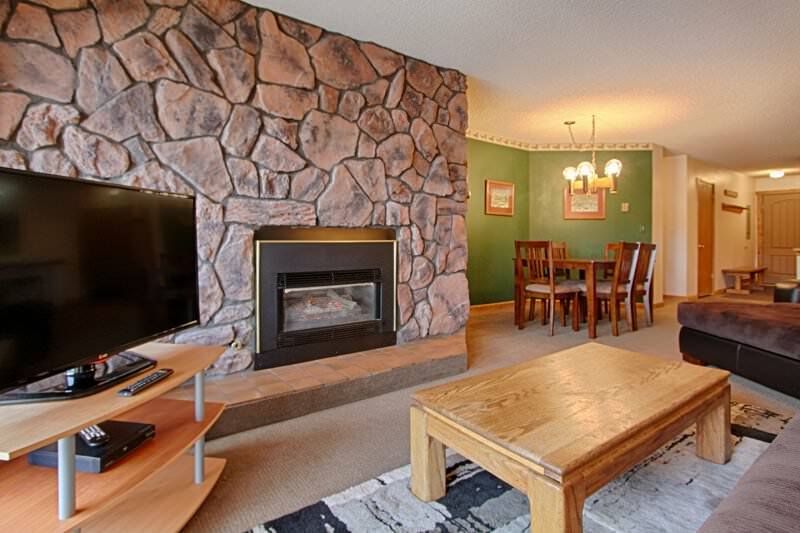 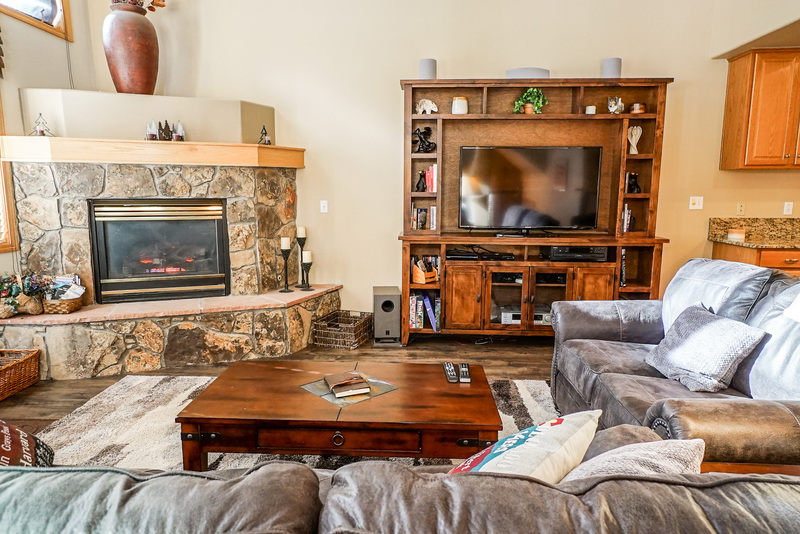 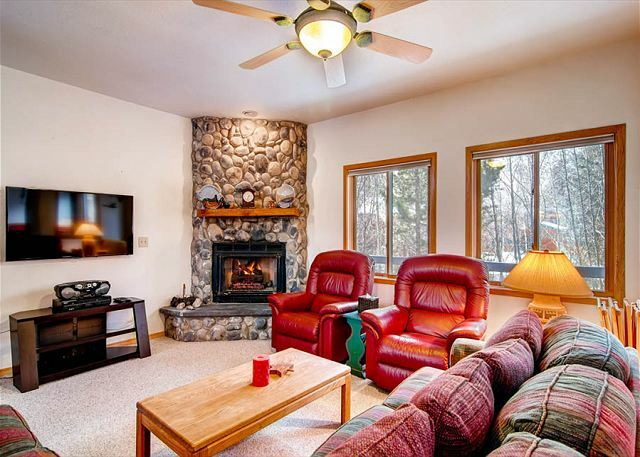 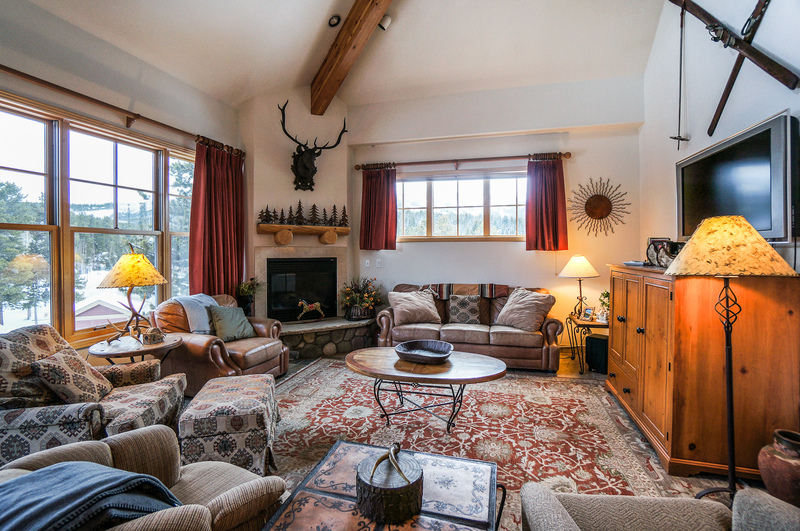 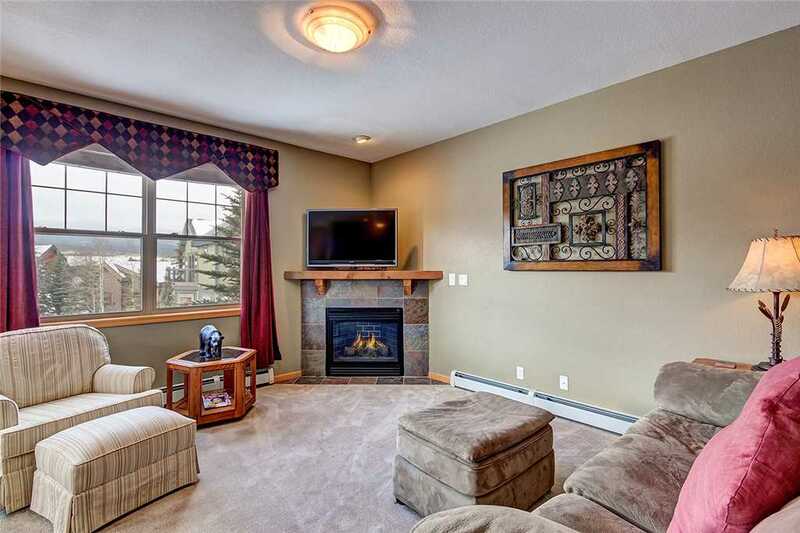 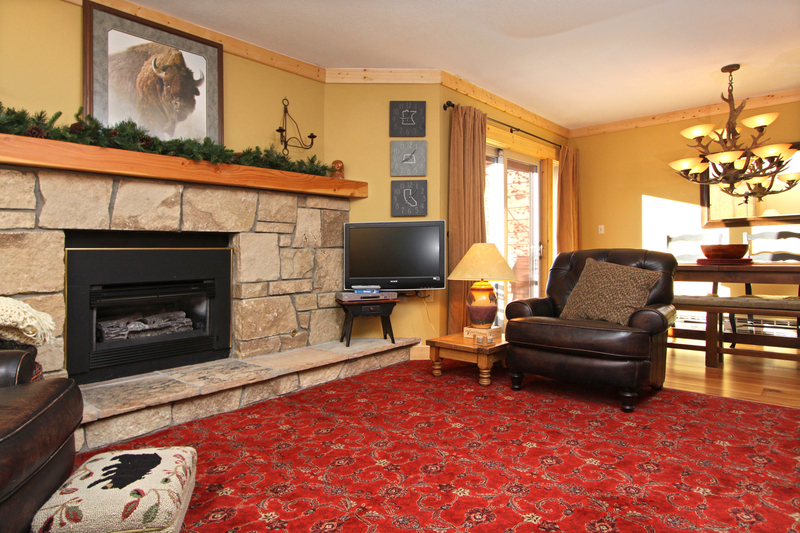 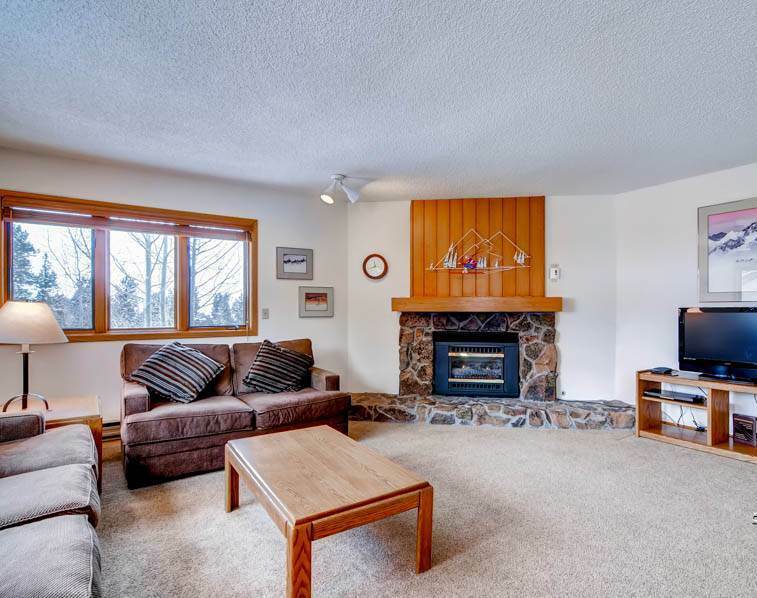 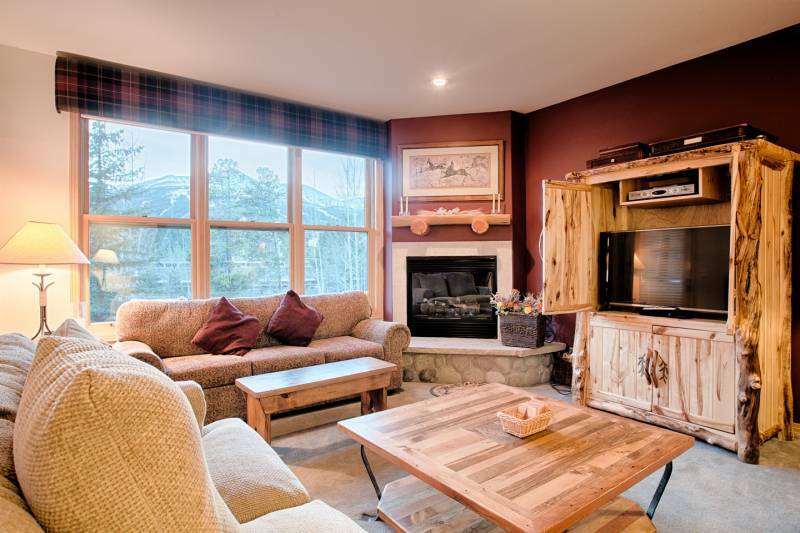 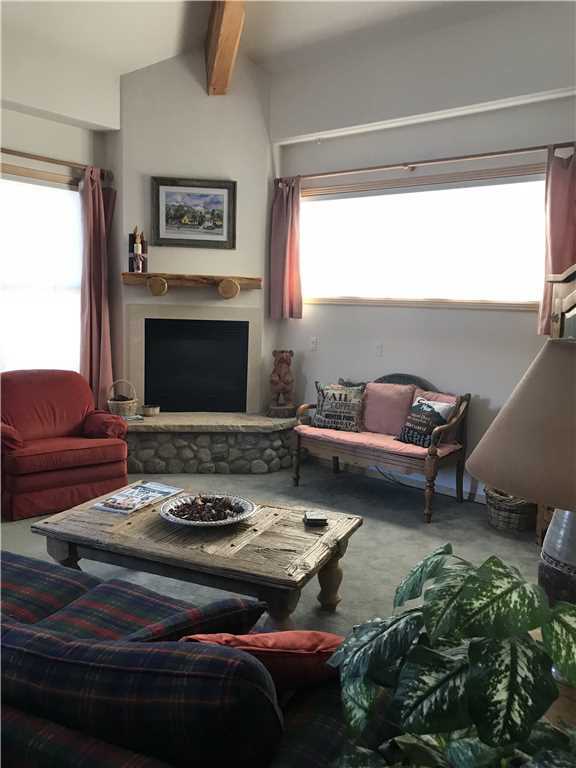 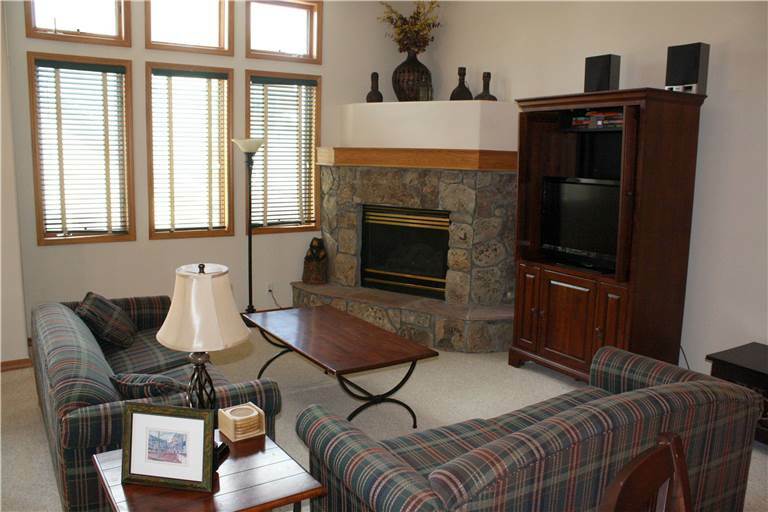 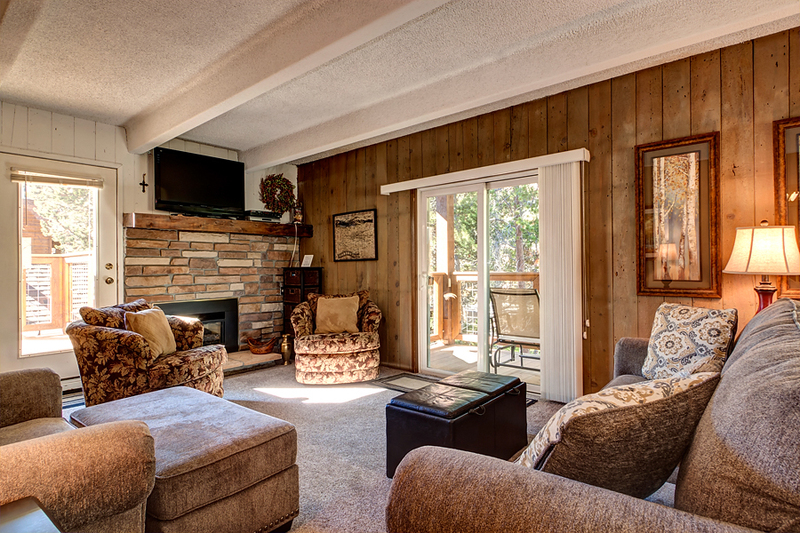 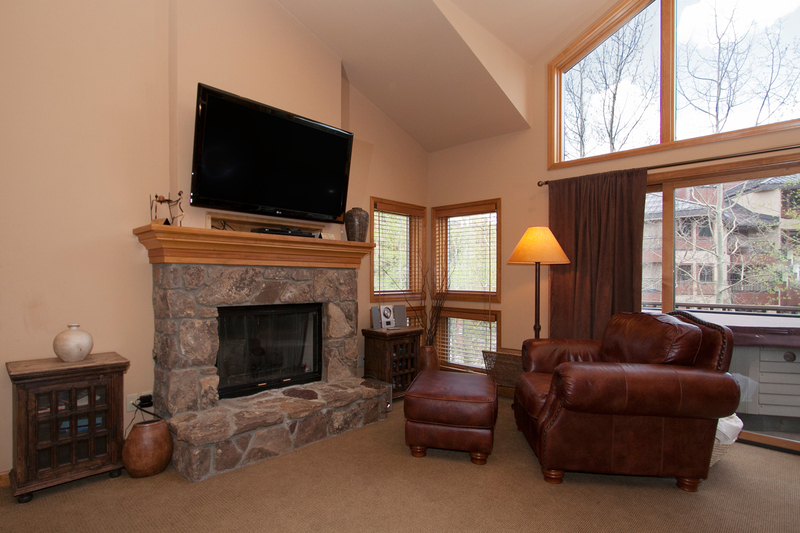 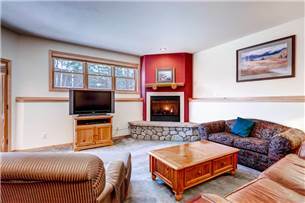 The living room area has a warm gas fireplace, as well as a couch and loveseat that allow you to relax while watching TV. 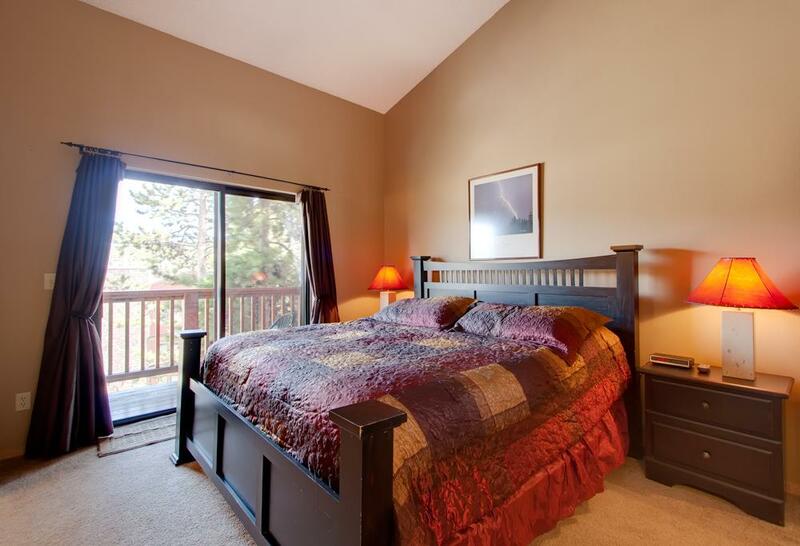 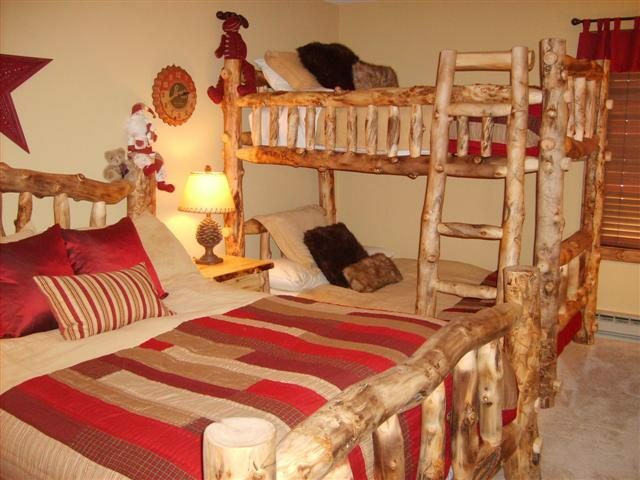 This unit can sleep up to ten people between the two bedrooms, each with two Queen beds and the Queen sofa sleeper. 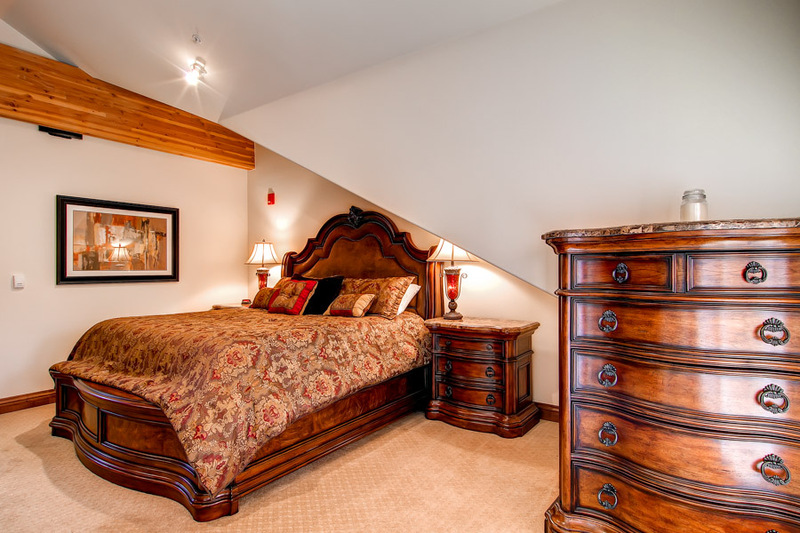 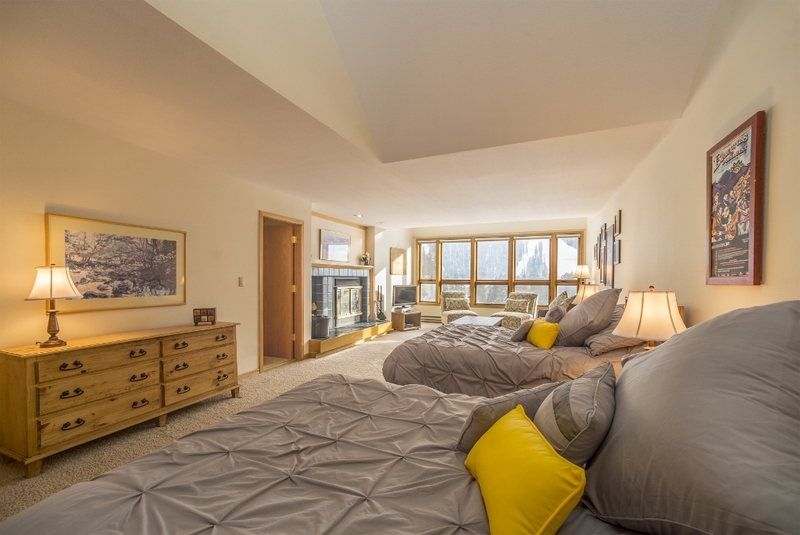 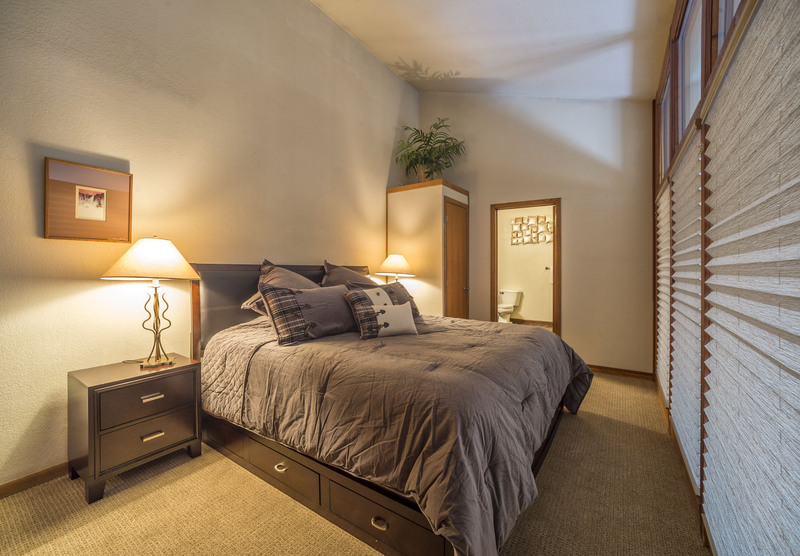 The bedrooms also feature a TV, mini fridge, coffee maker, closets and dressers for storage. 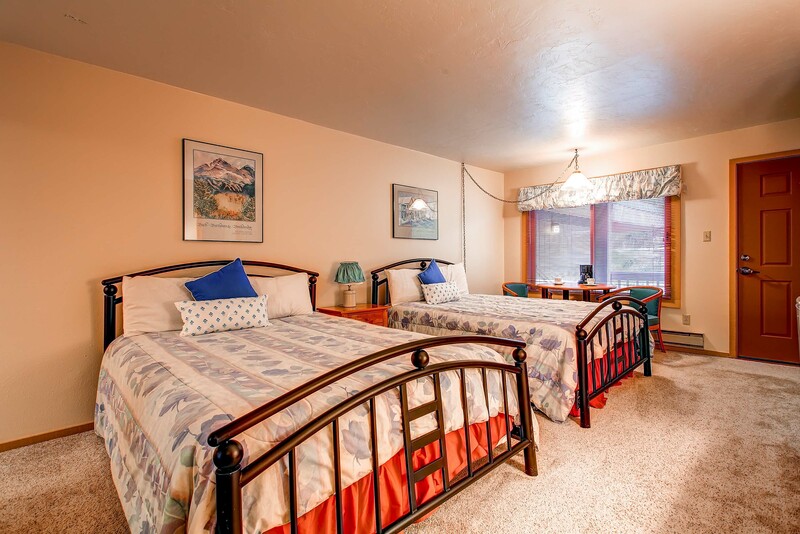 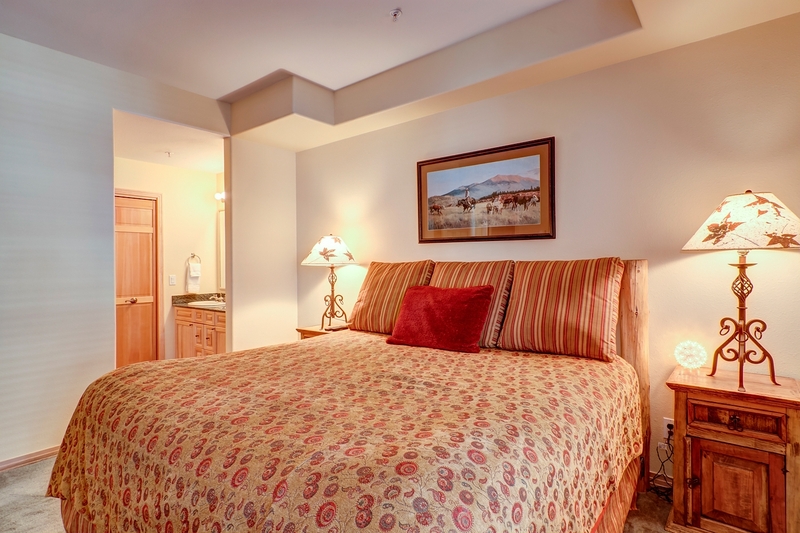 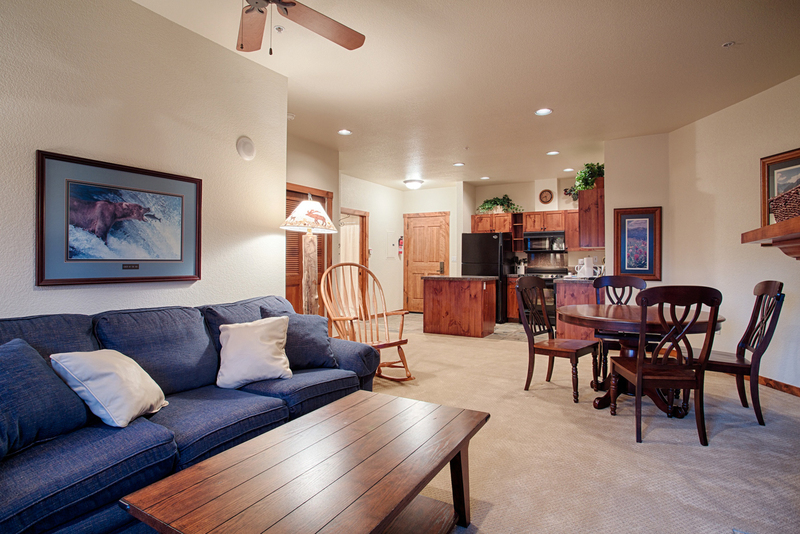 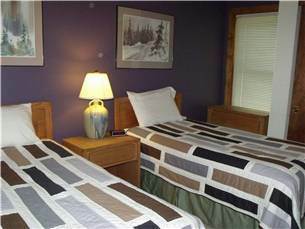 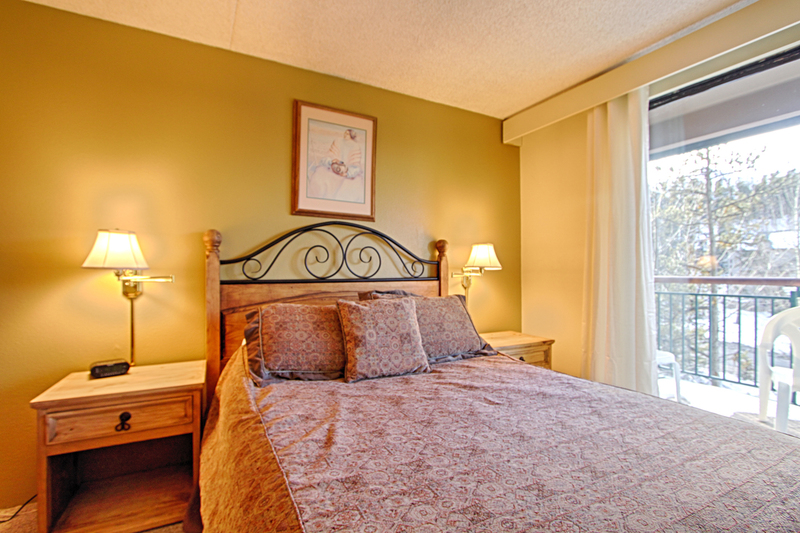 All units feature high speed internet and access to the on-site coin operated laundry facility. 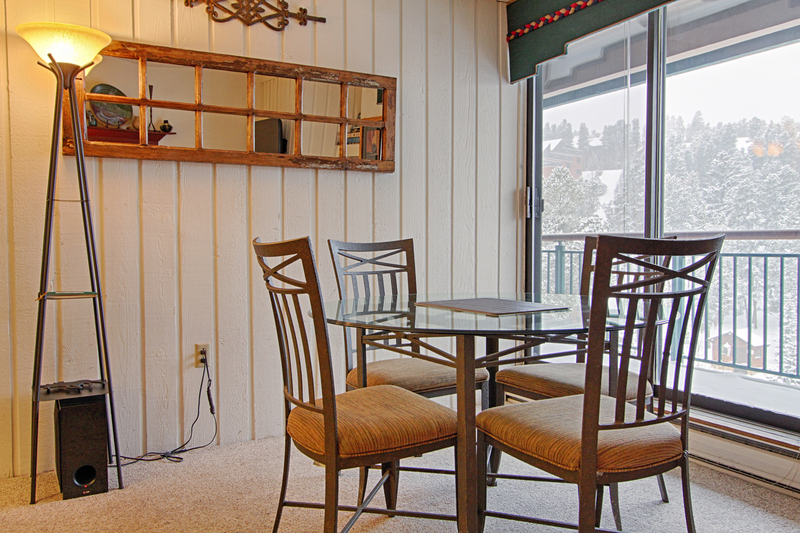 The common area deck is equipped with two grills and picnic area to accommodate any size group. 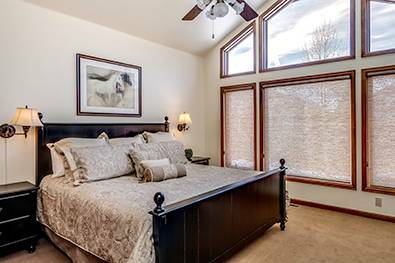 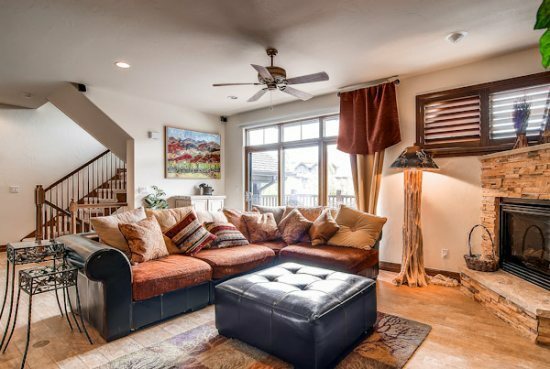 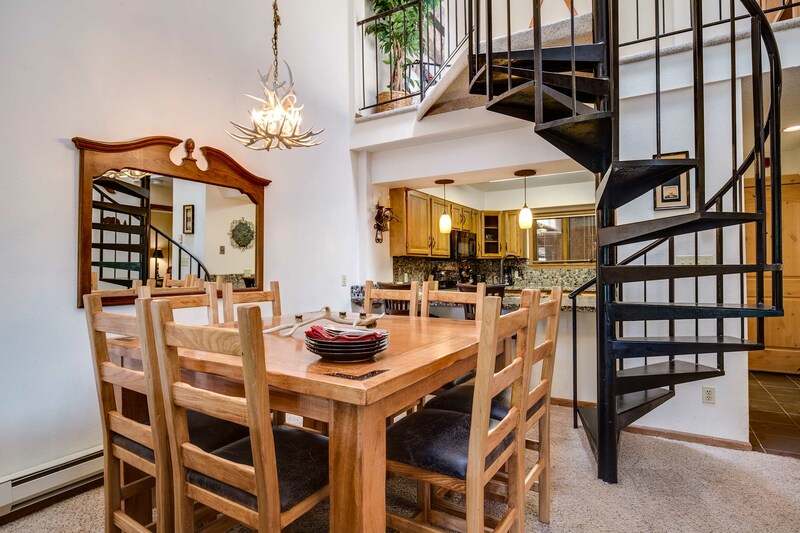 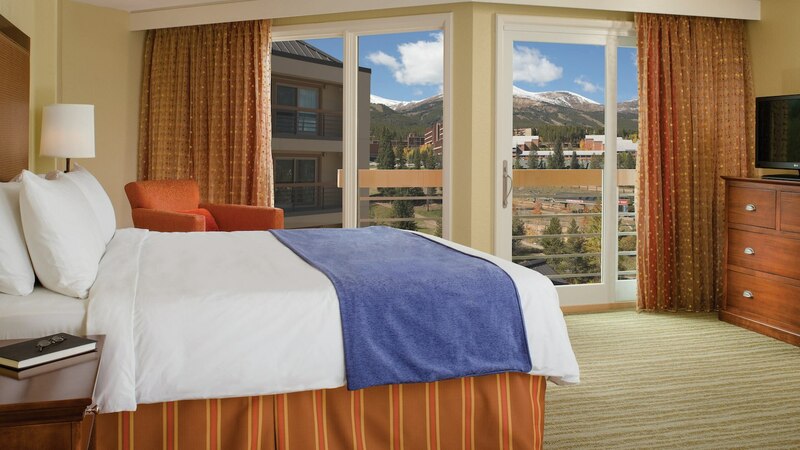 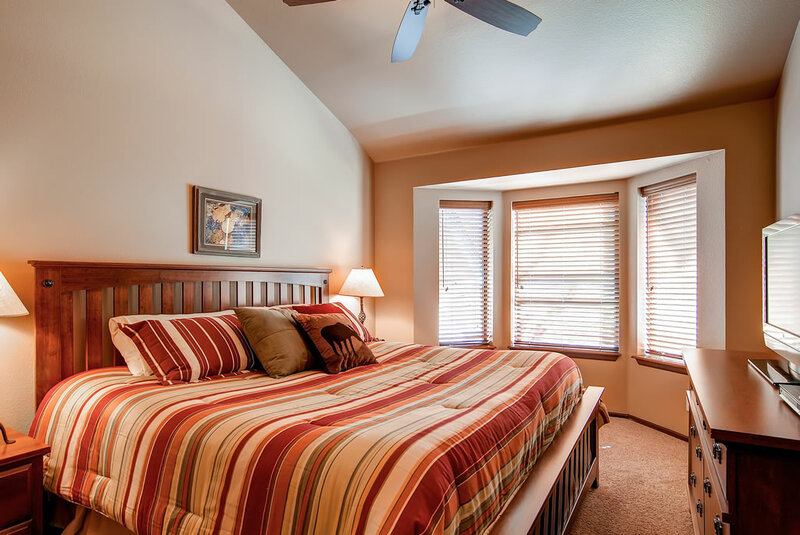 Relish with seasonal access to the Columbine Recreation Center with an outdoor heated pool, indoor and outdoor oversize hot tubs, shower rooms and summer patio with outdoor furniture to savor the warm days. 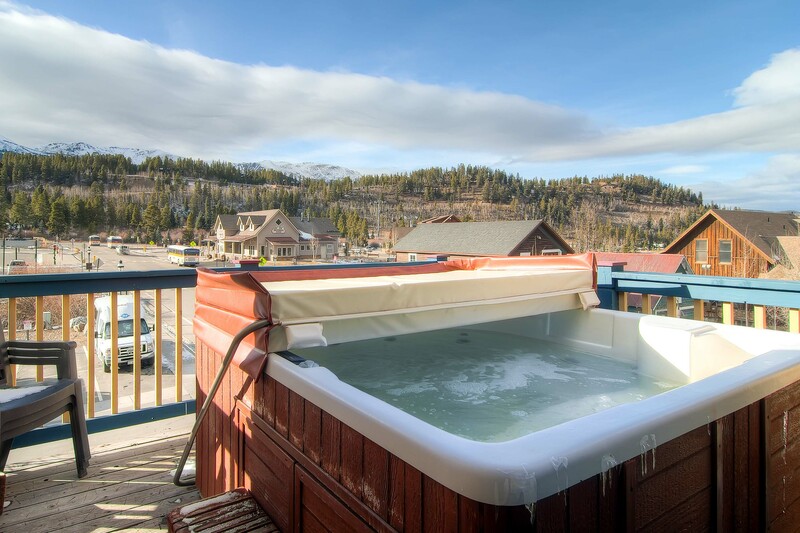 What a perfect way to end your long day of skiing or riding!